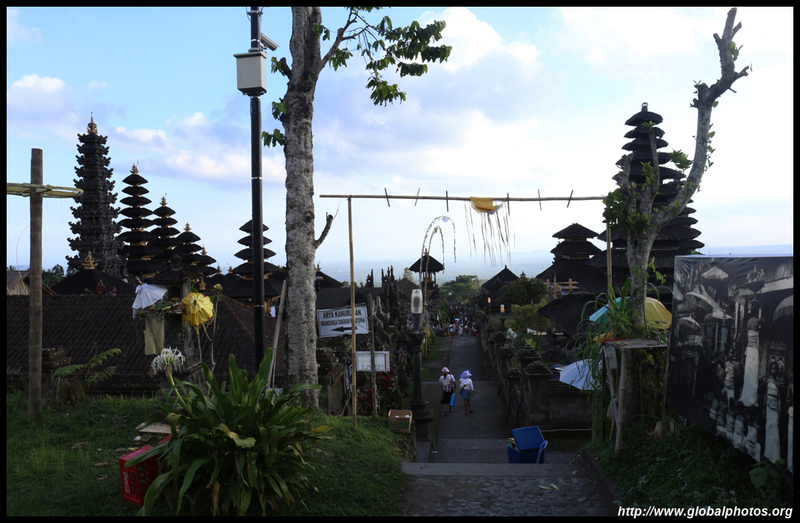 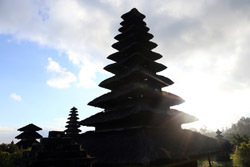 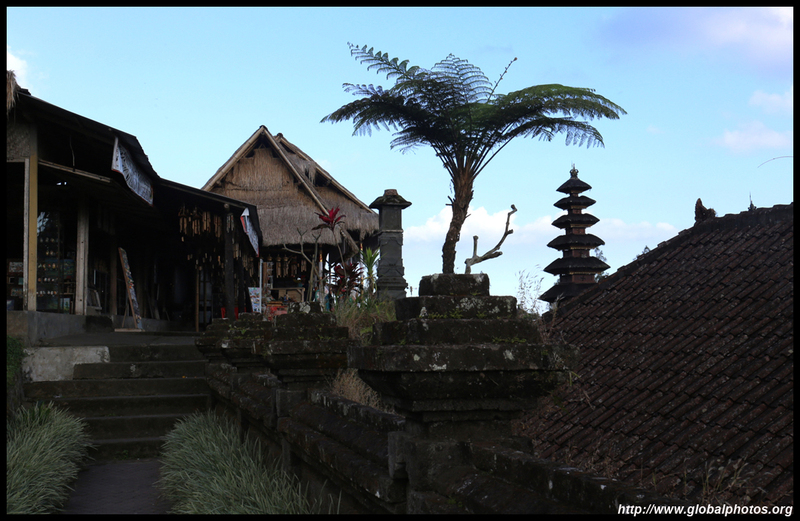 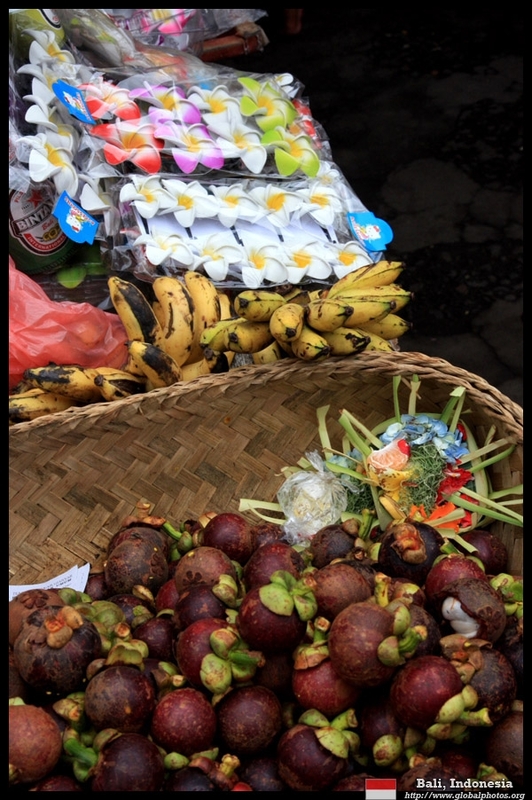 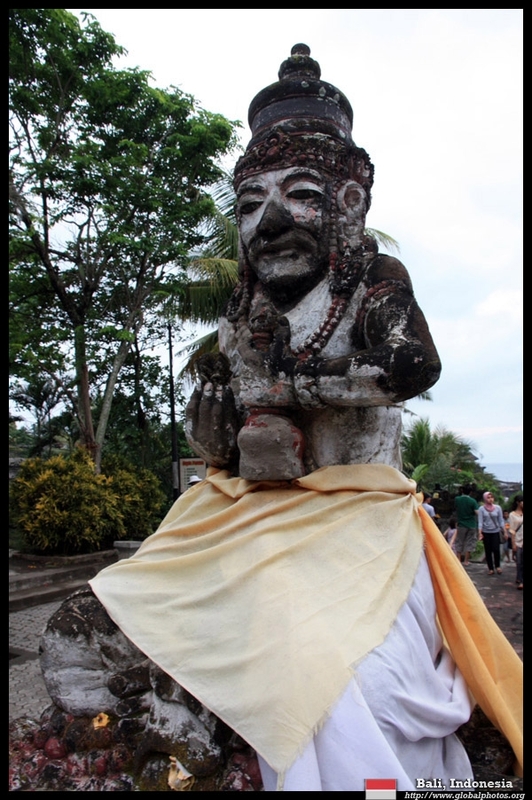 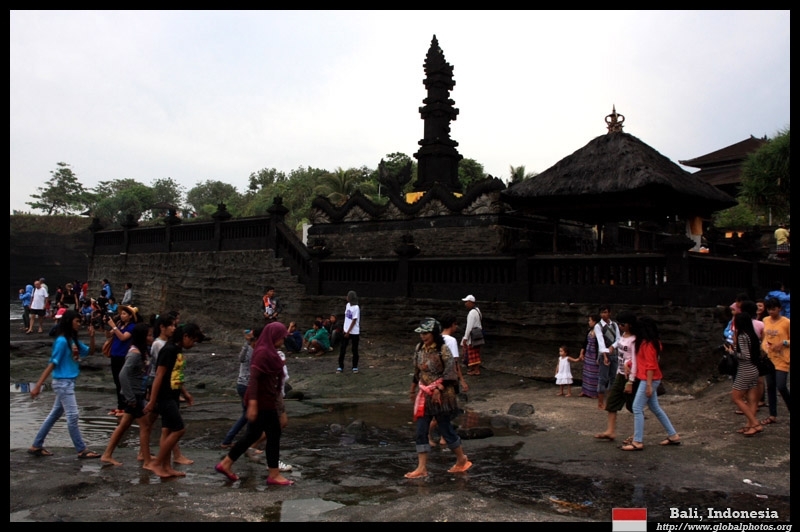 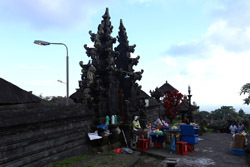 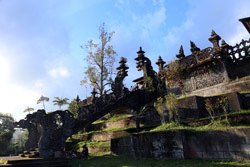 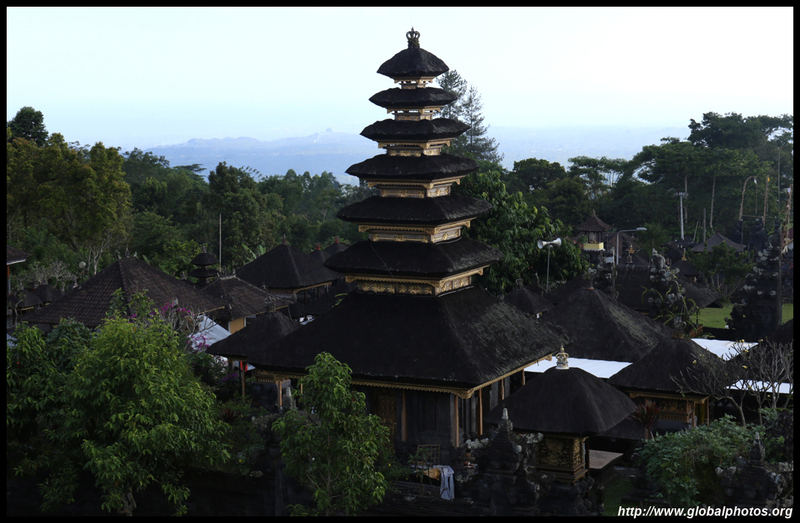 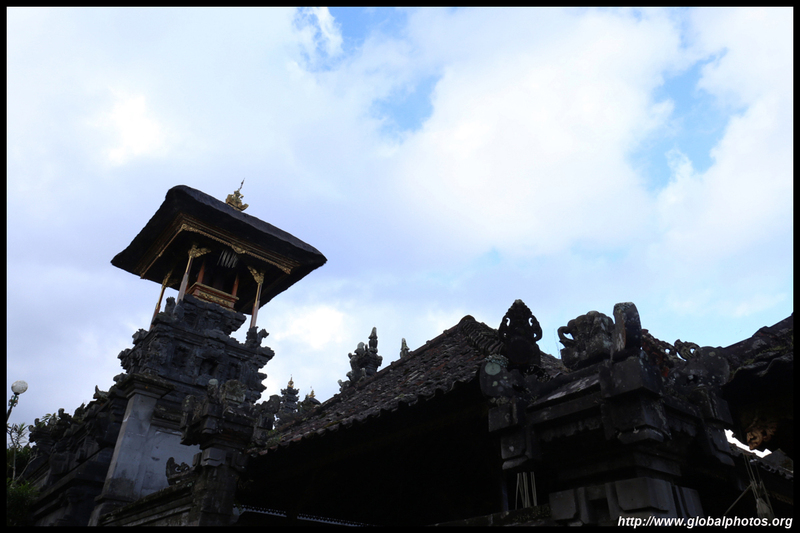 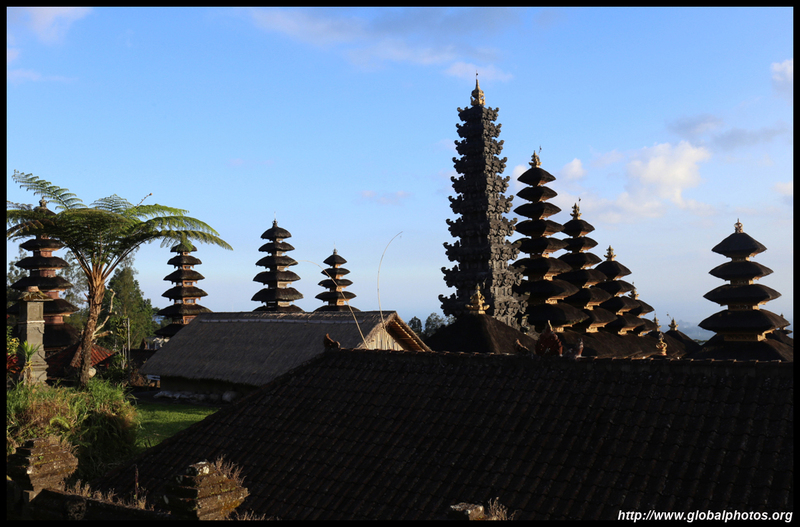 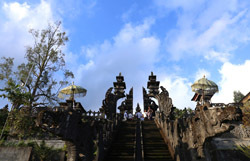 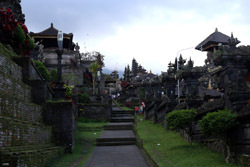 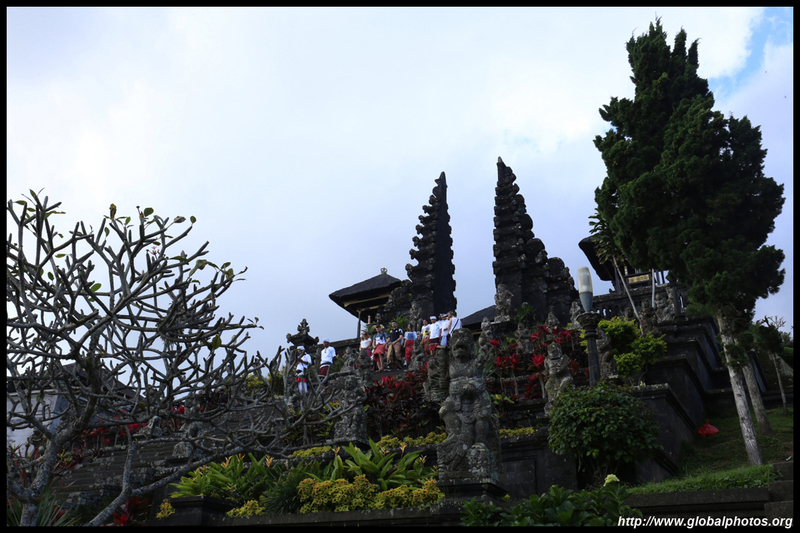 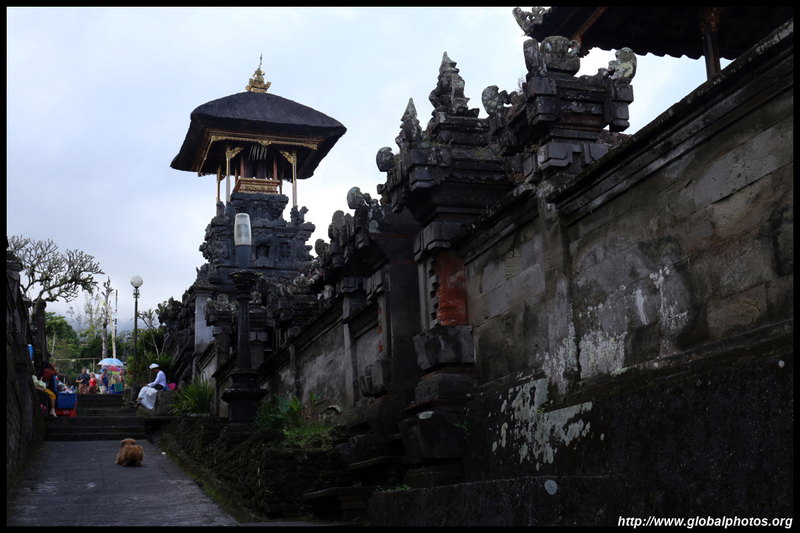 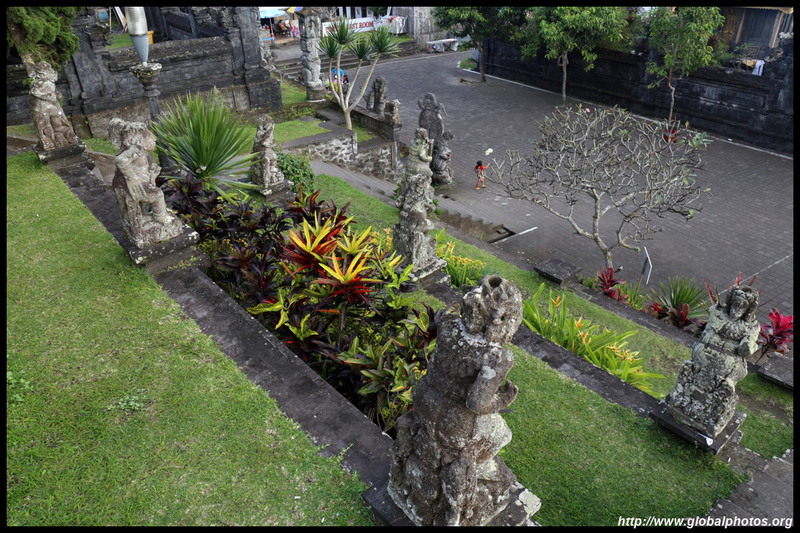 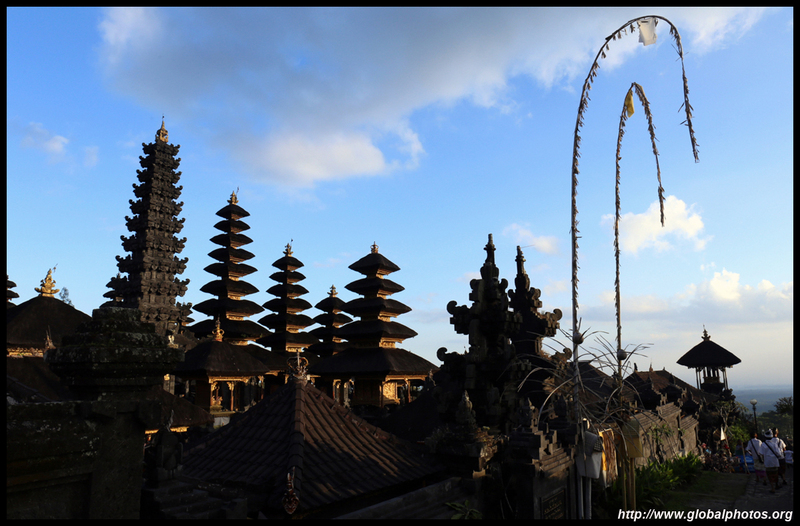 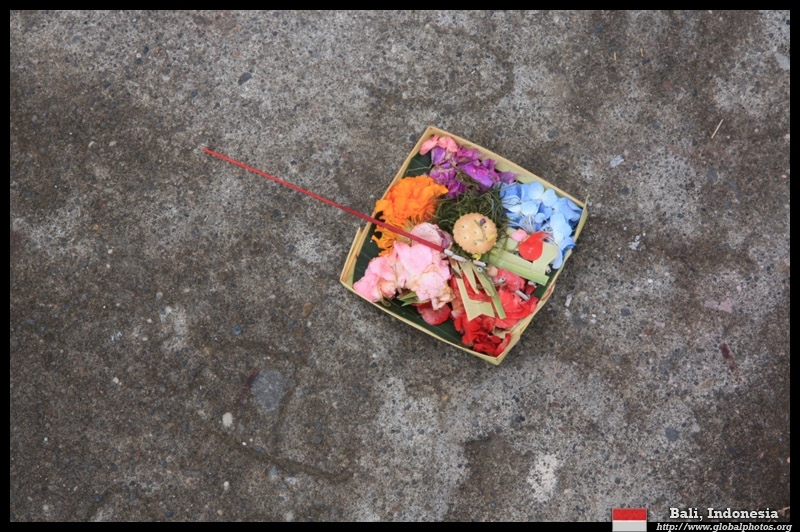 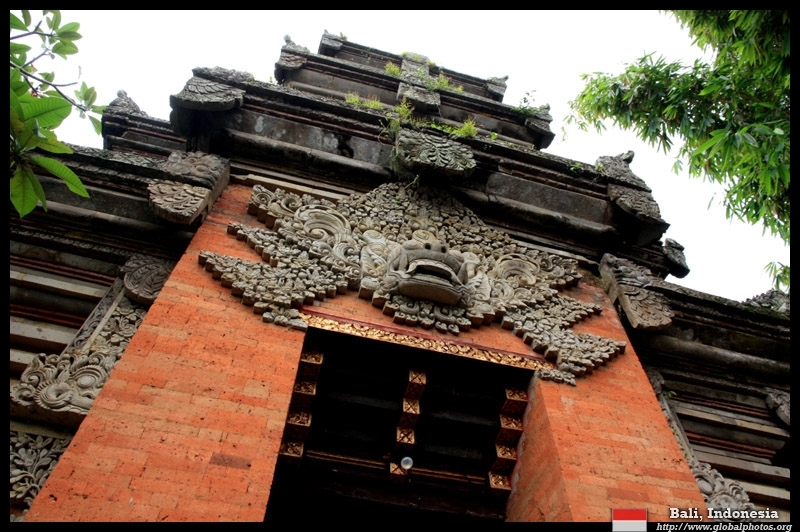 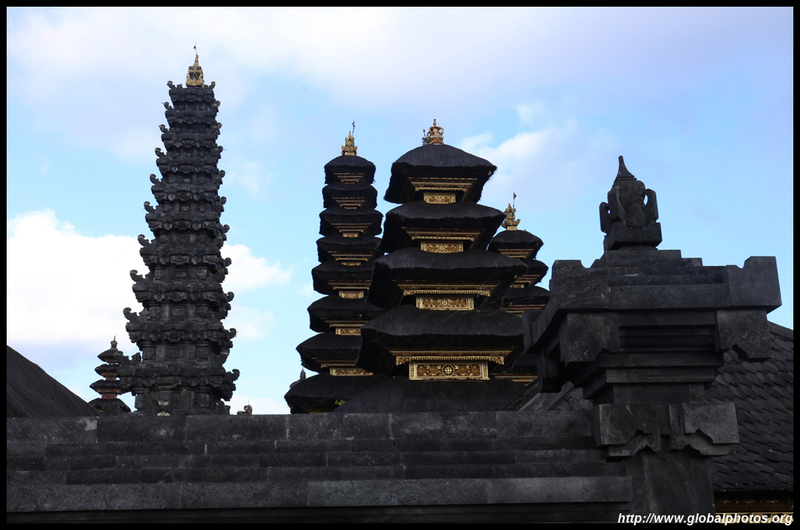 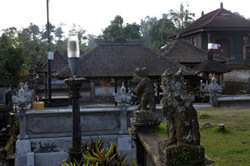 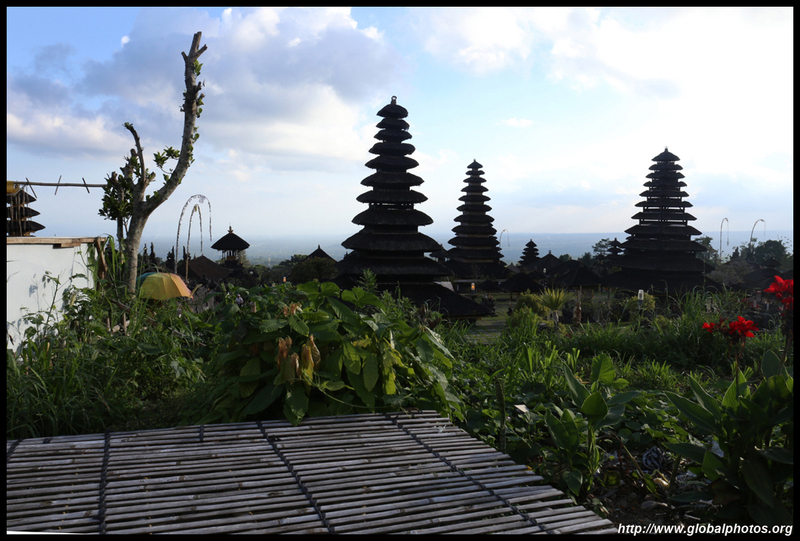 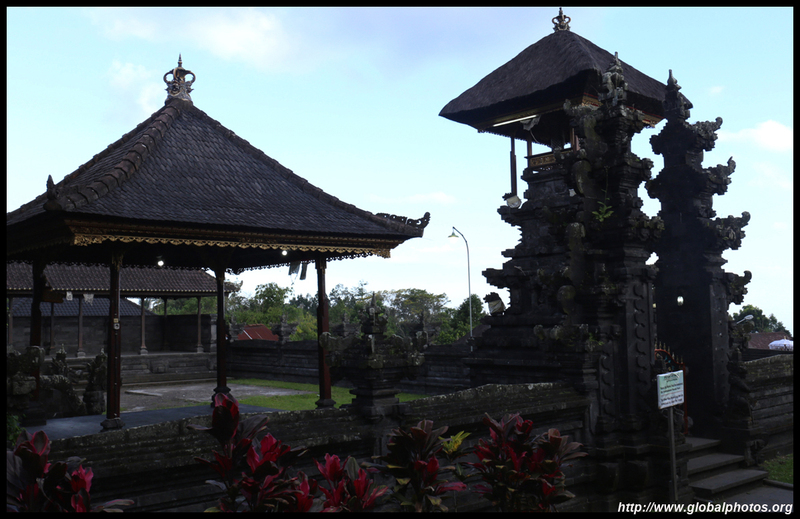 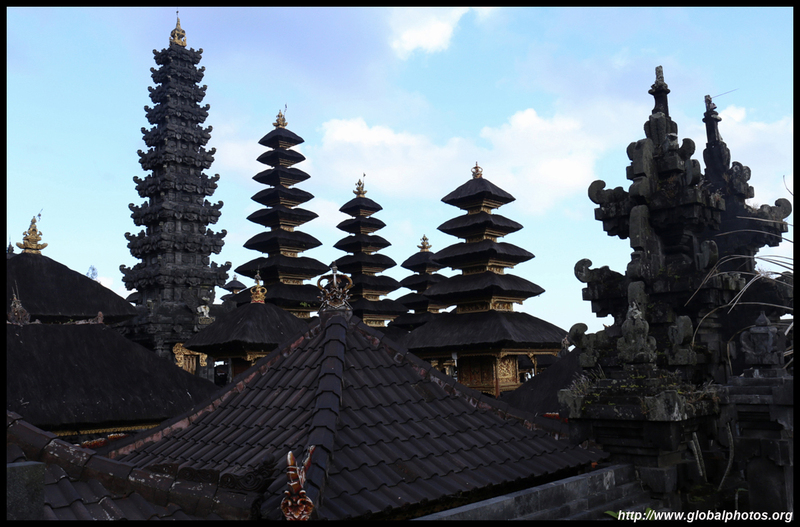 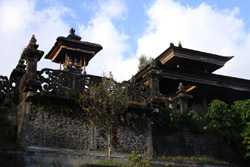 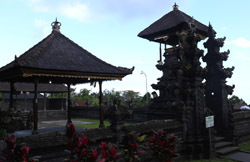 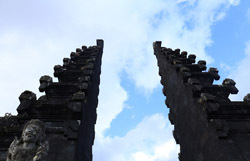 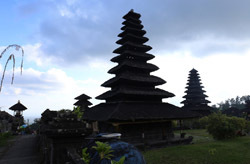 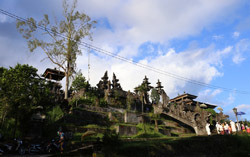 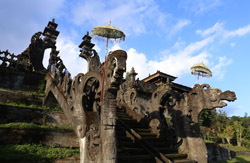 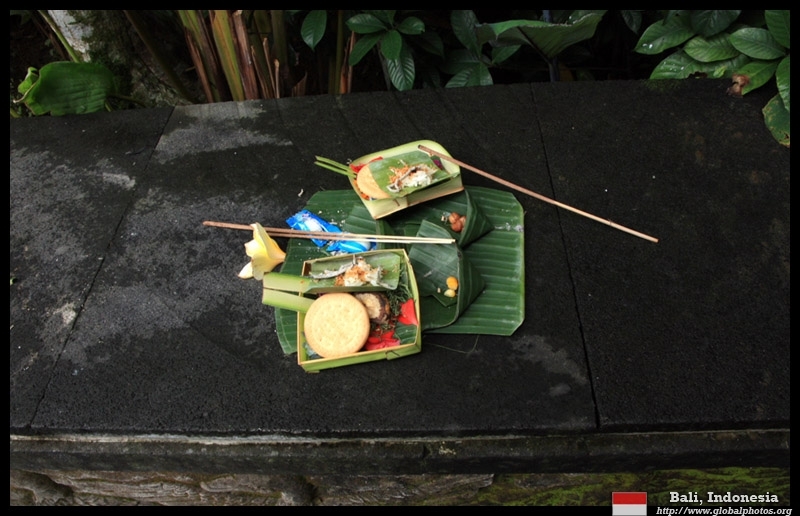 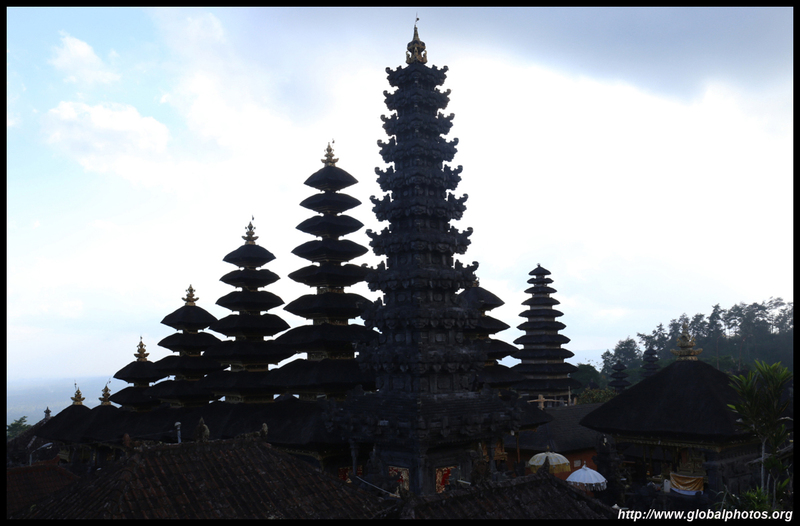 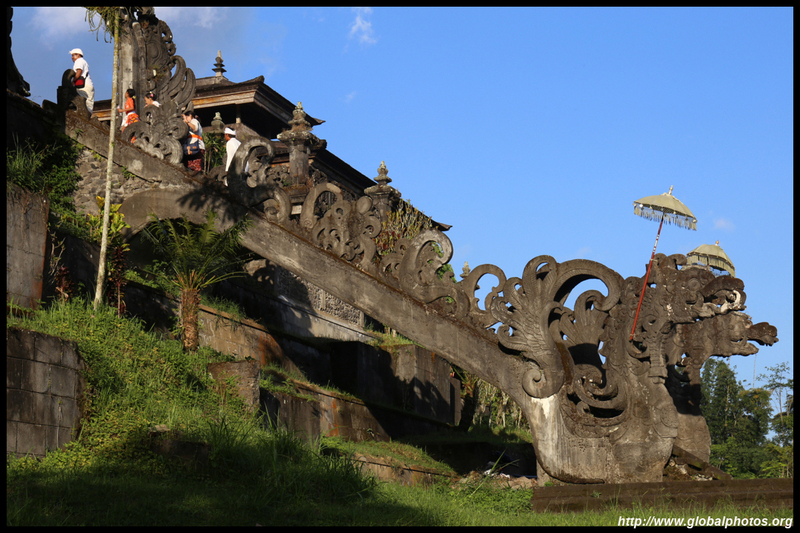 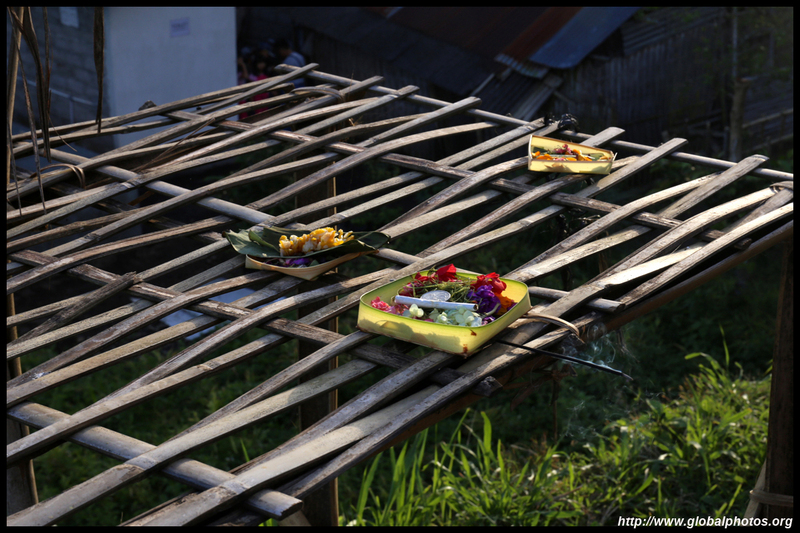 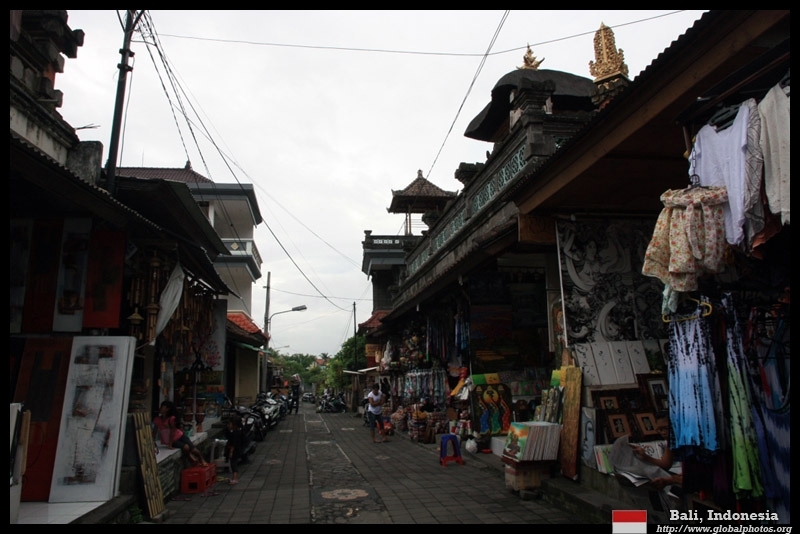 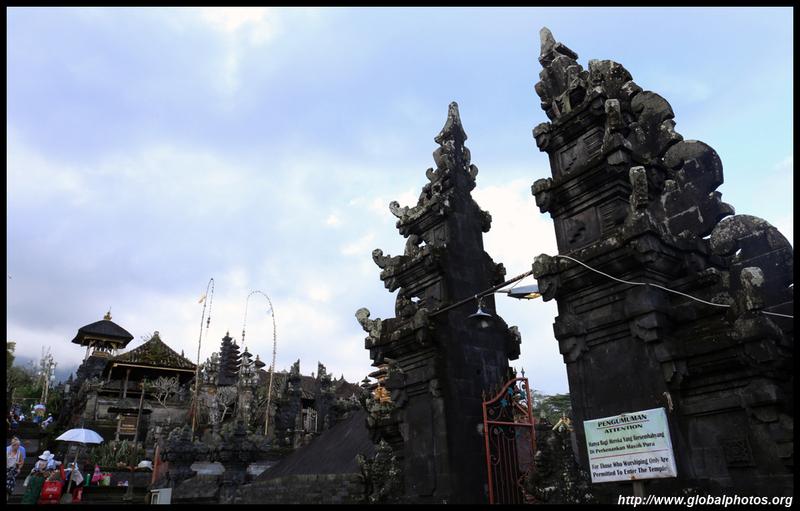 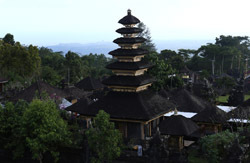 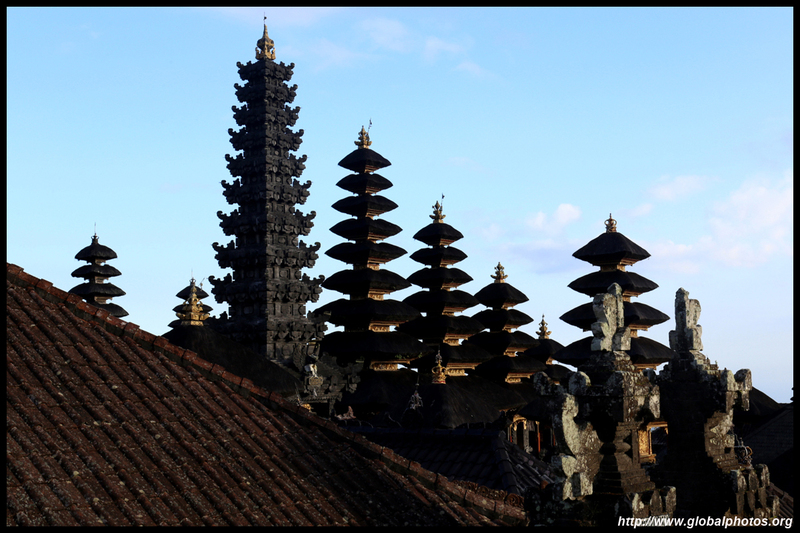 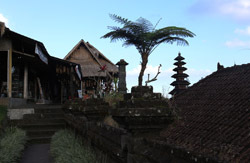 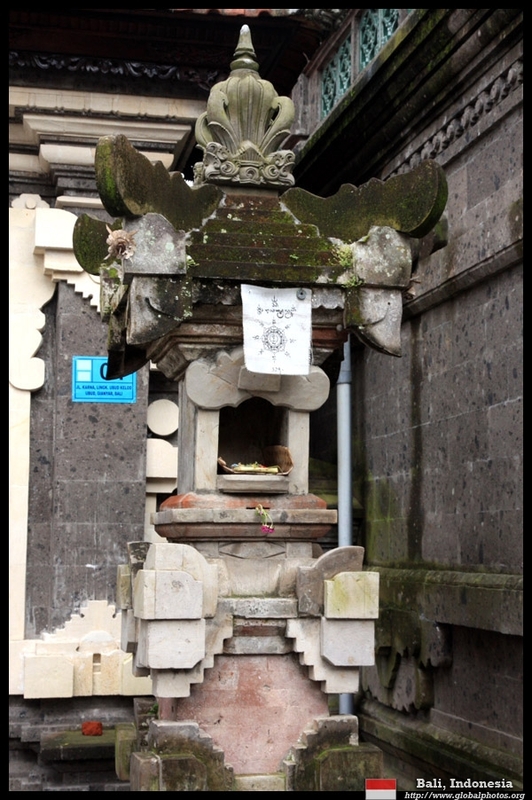 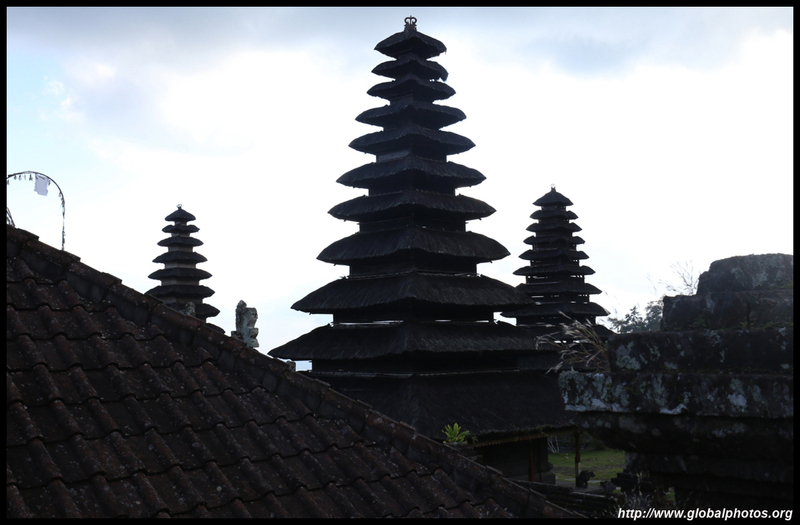 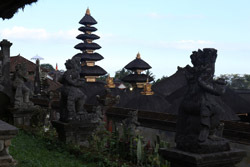 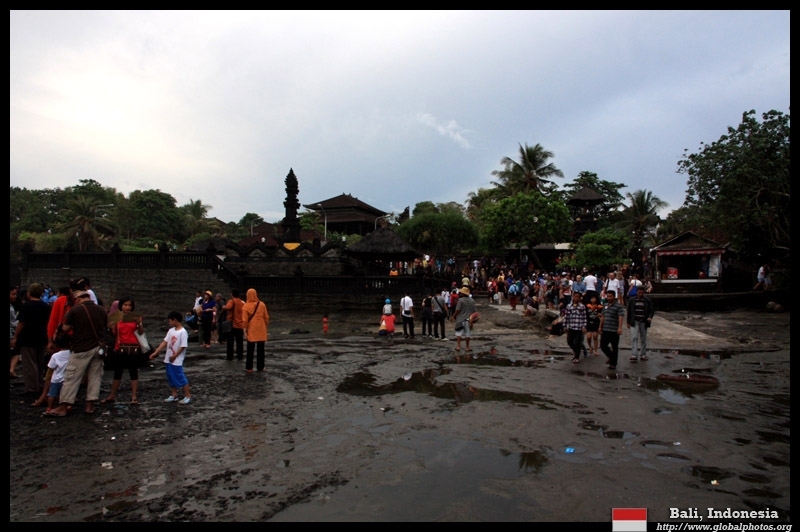 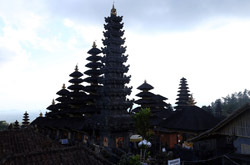 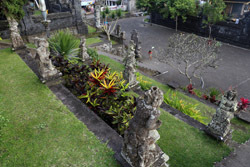 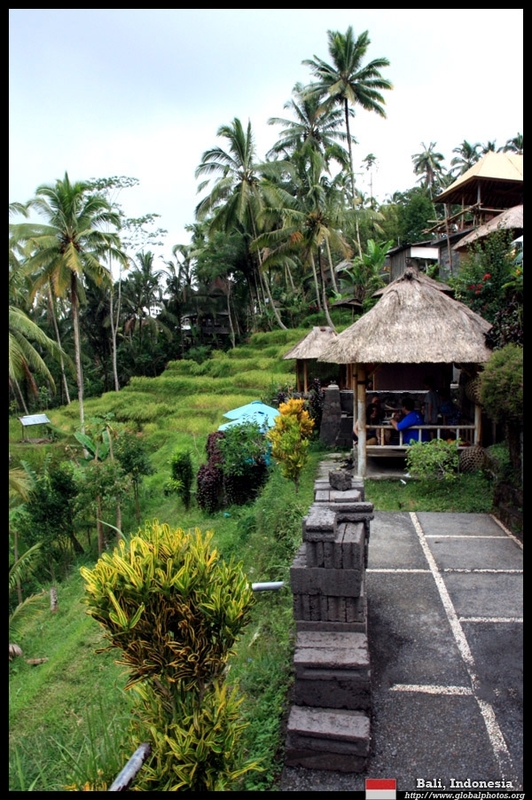 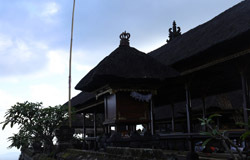 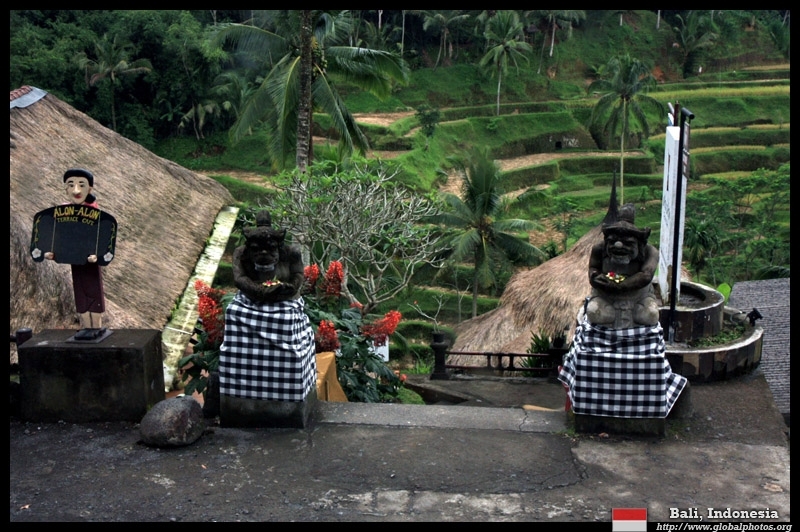 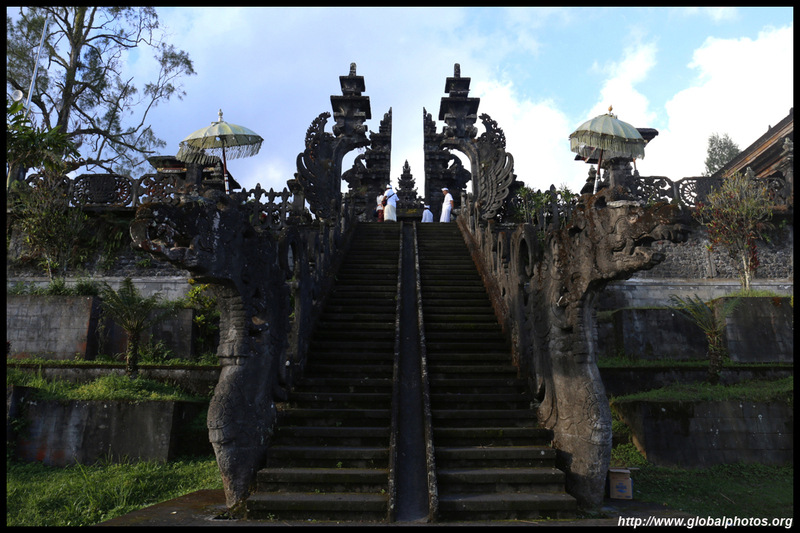 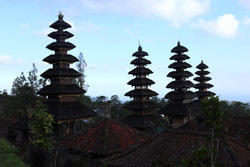 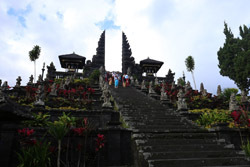 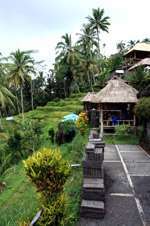 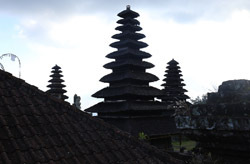 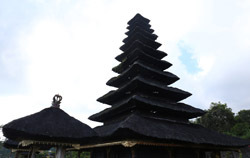 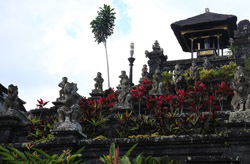 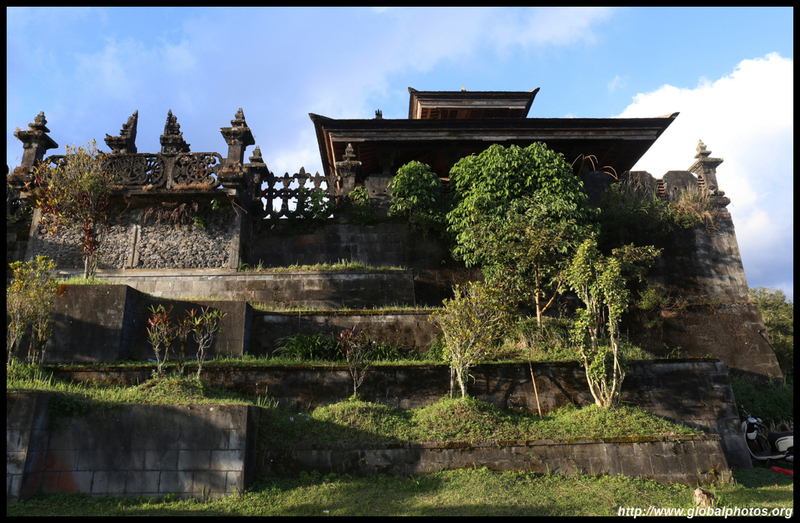 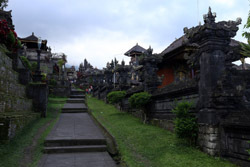 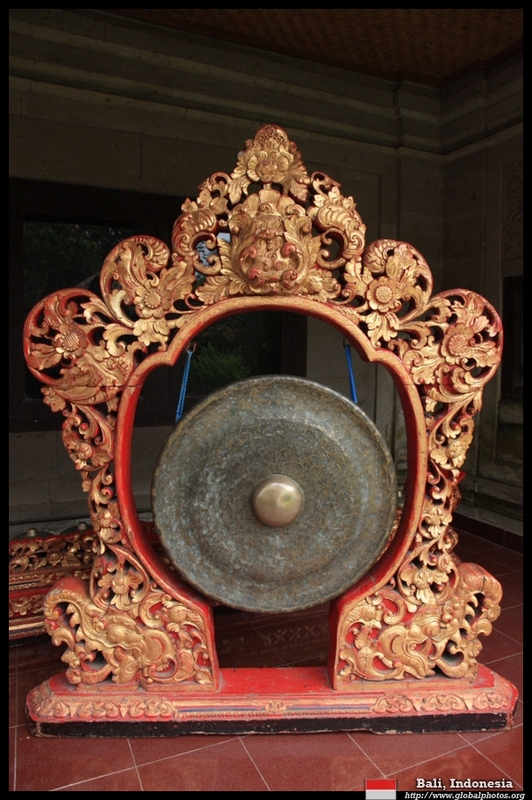 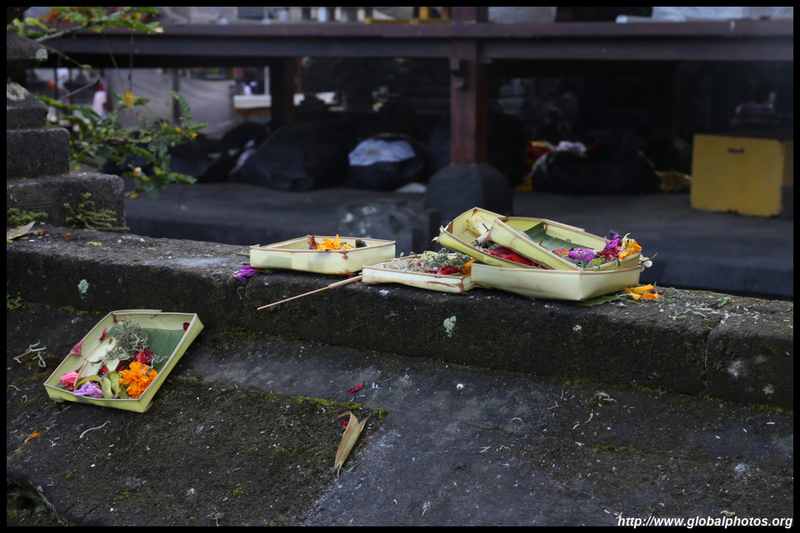 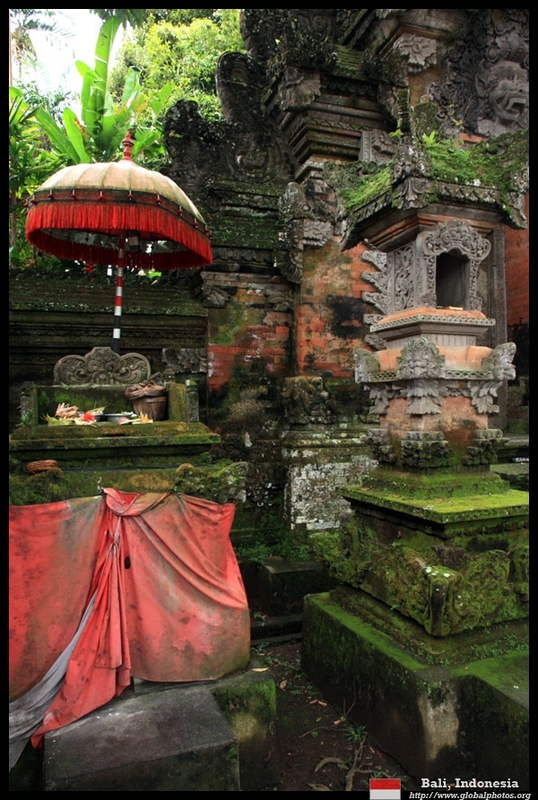 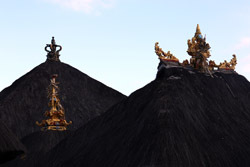 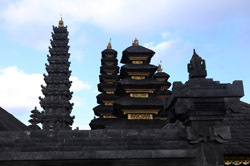 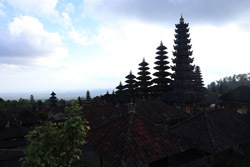 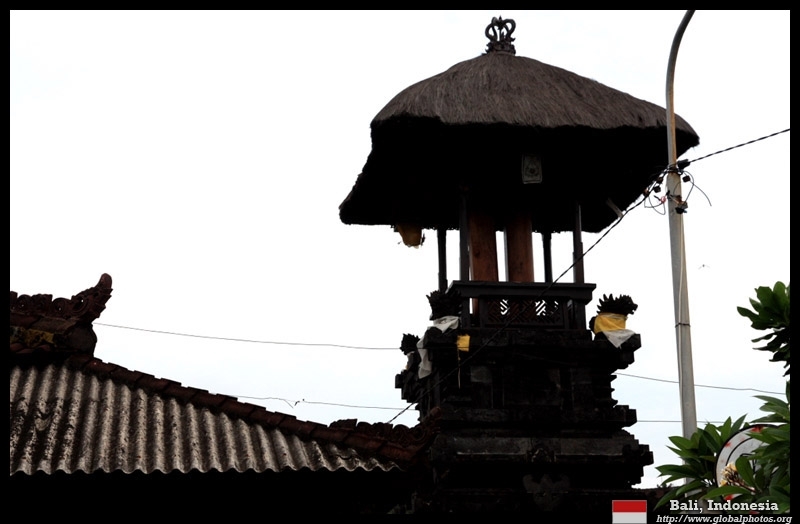 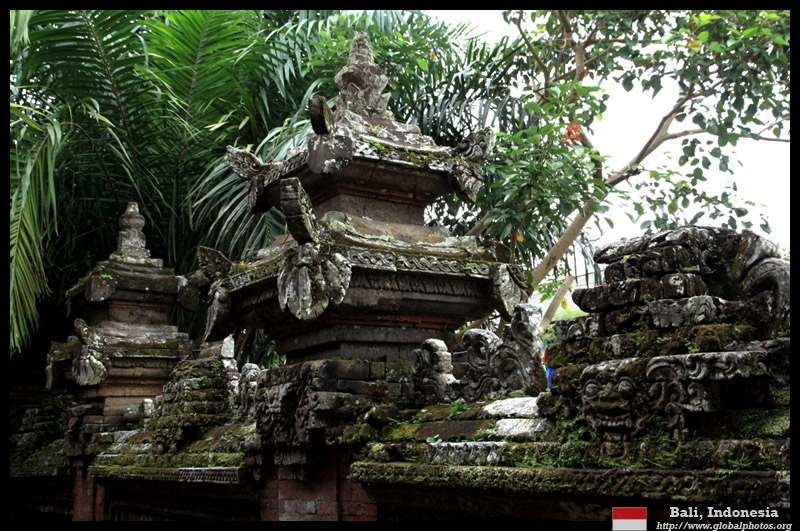 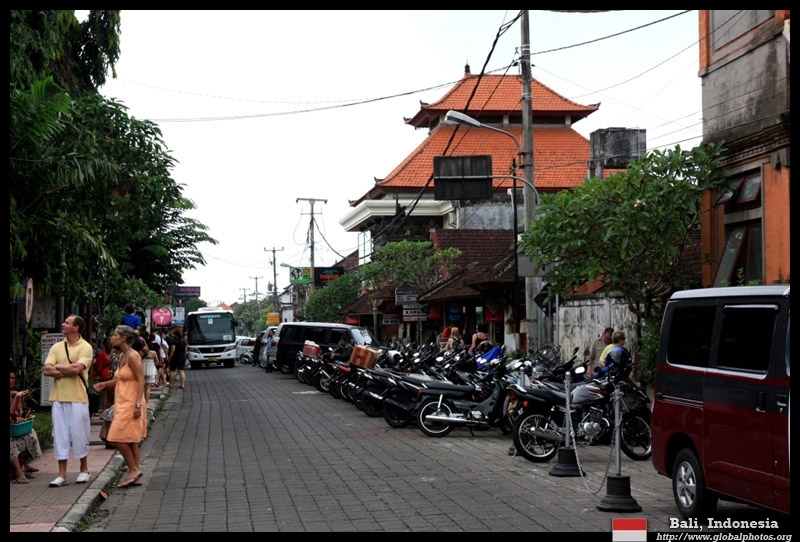 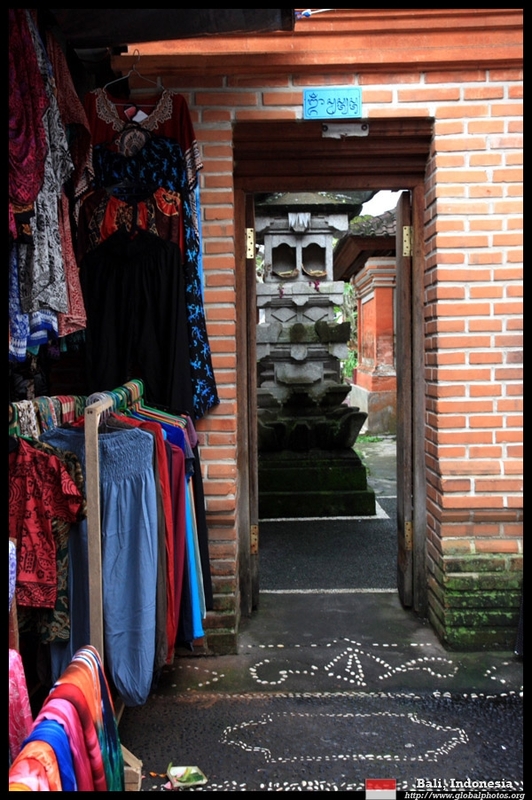 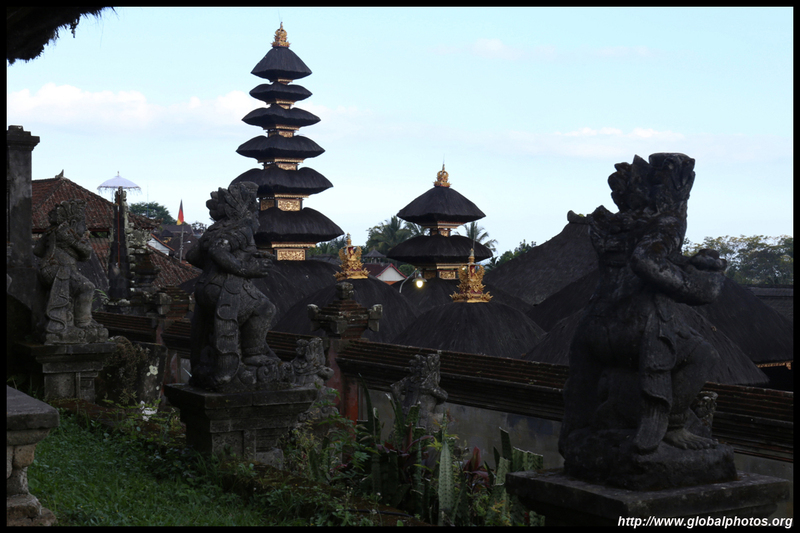 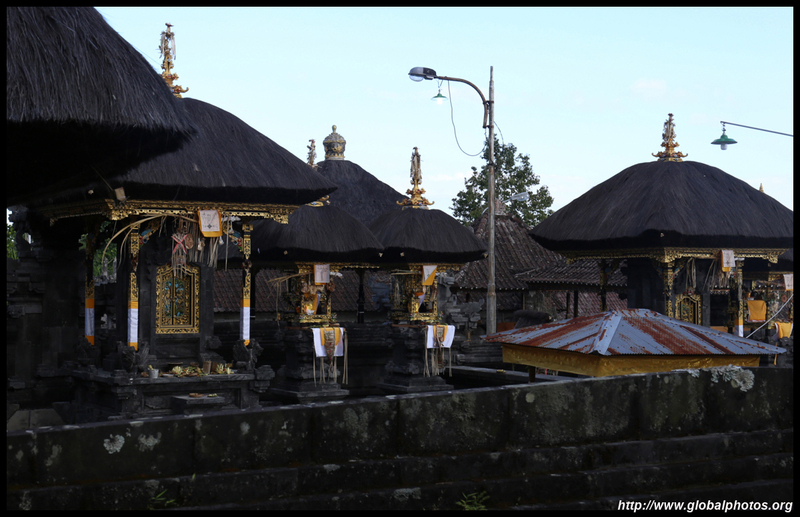 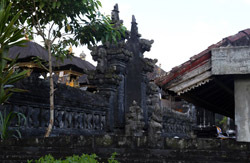 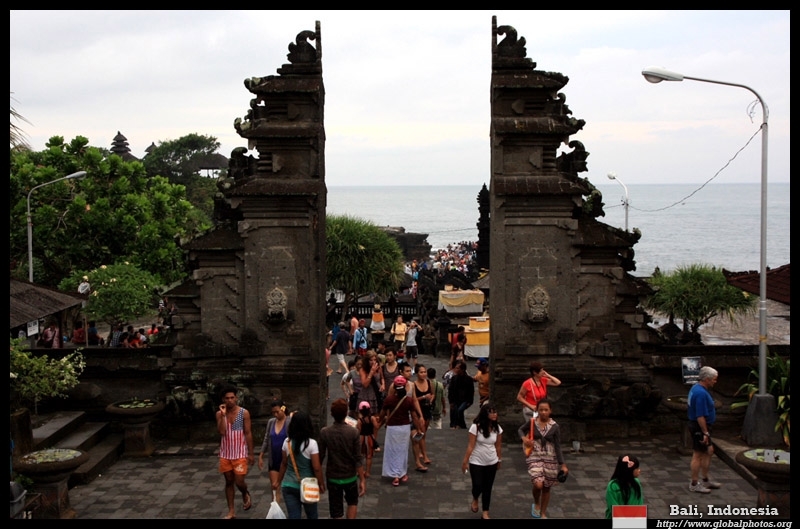 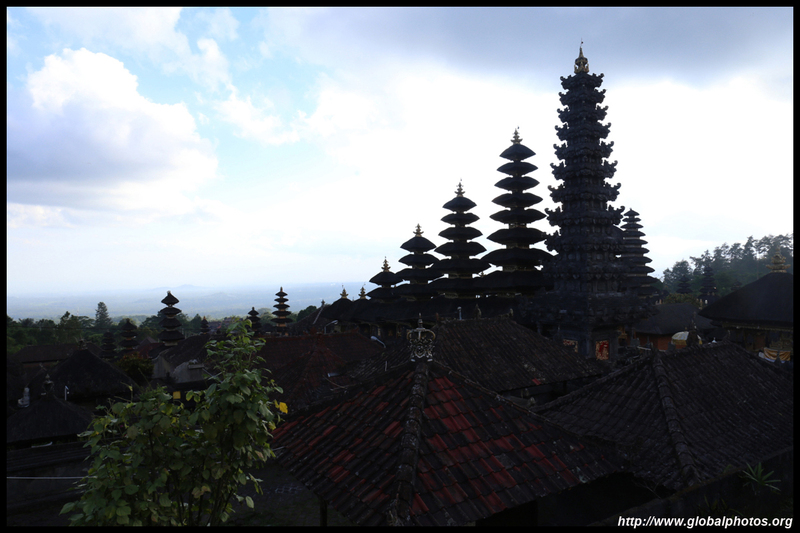 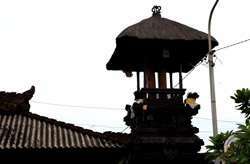 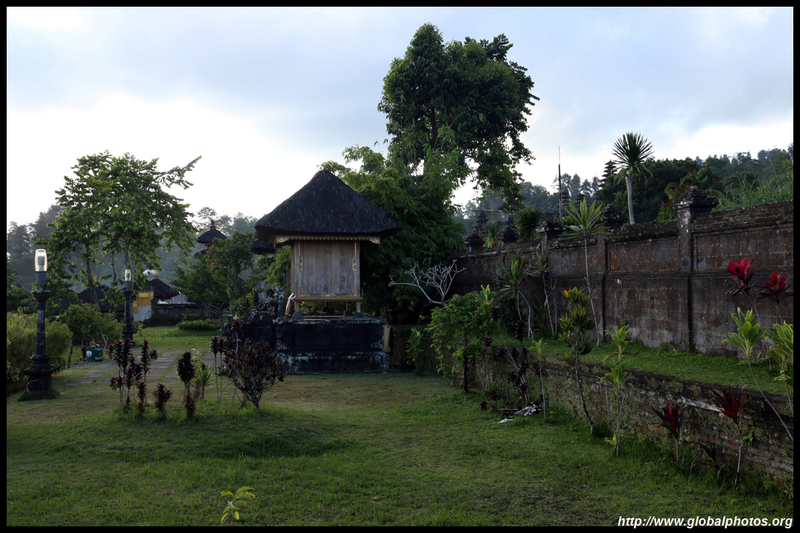 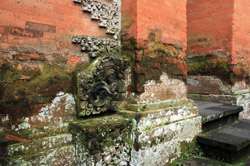 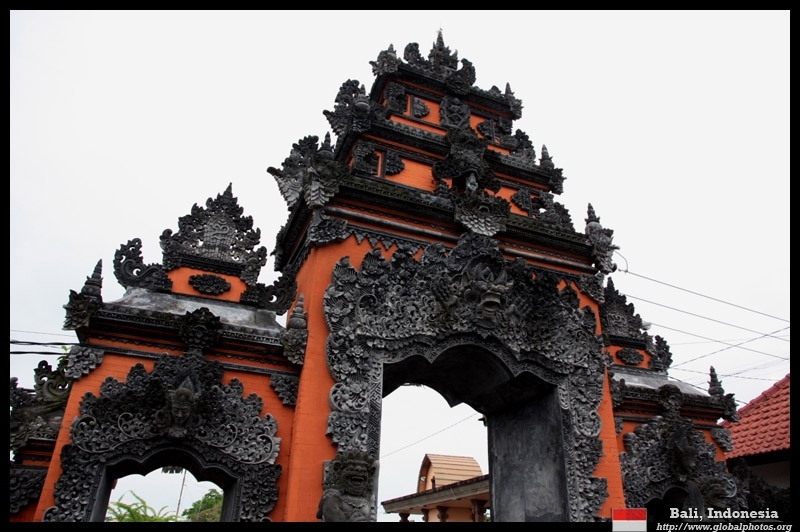 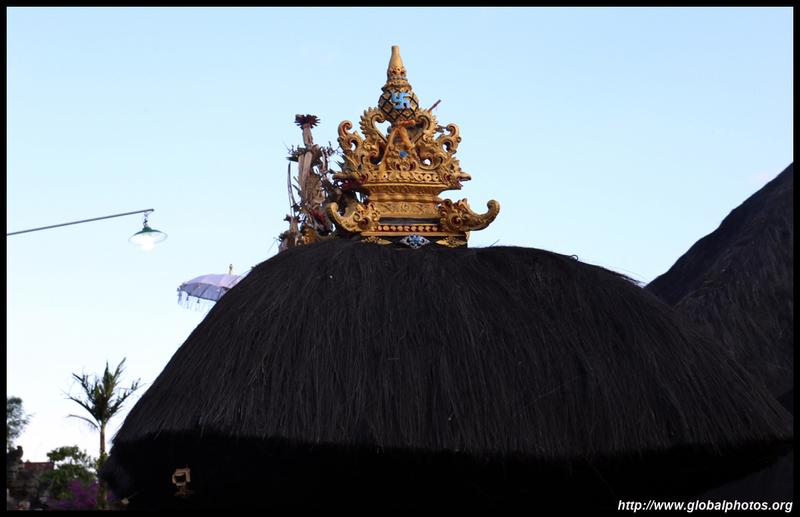 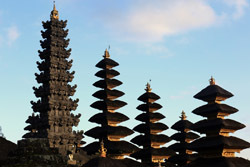 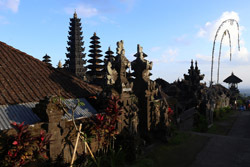 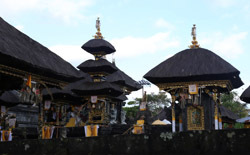 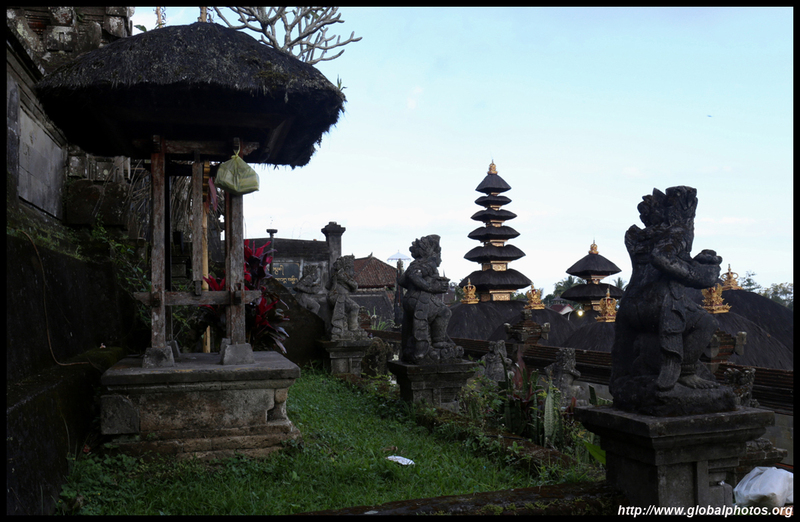 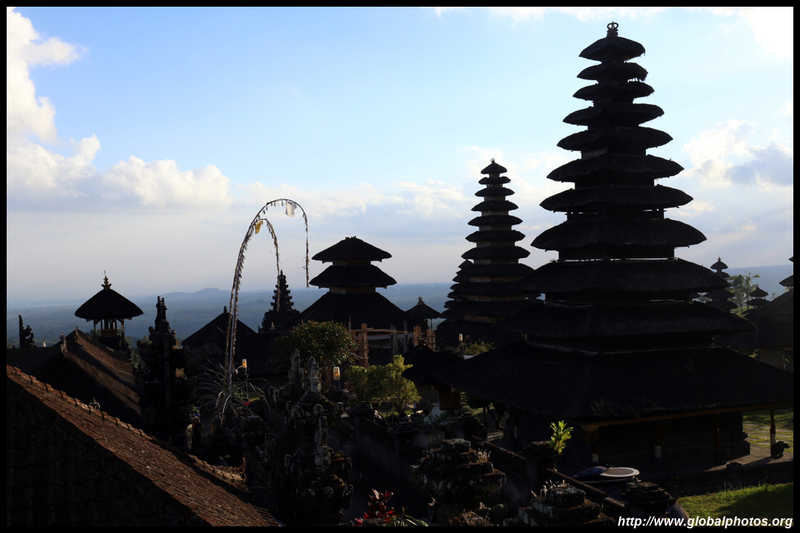 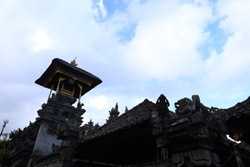 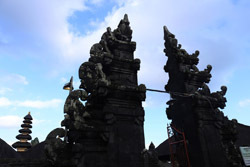 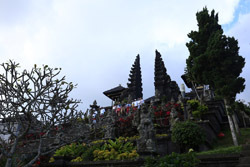 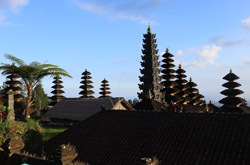 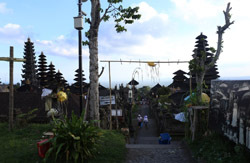 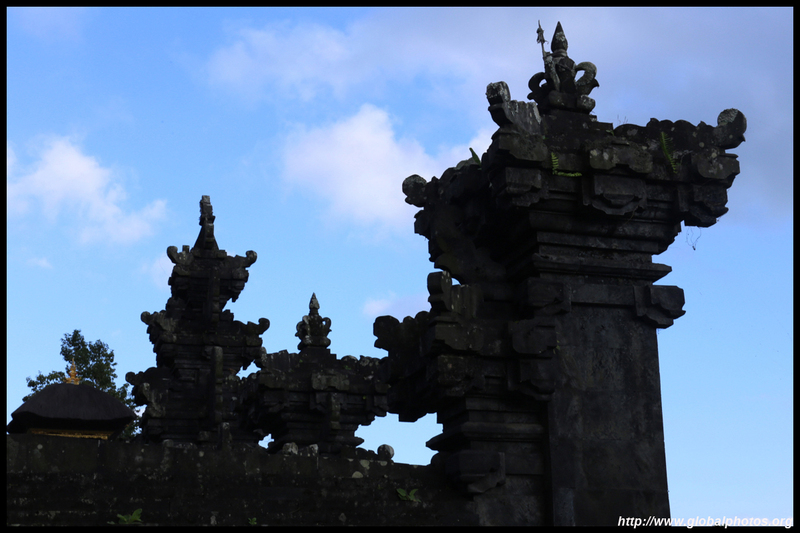 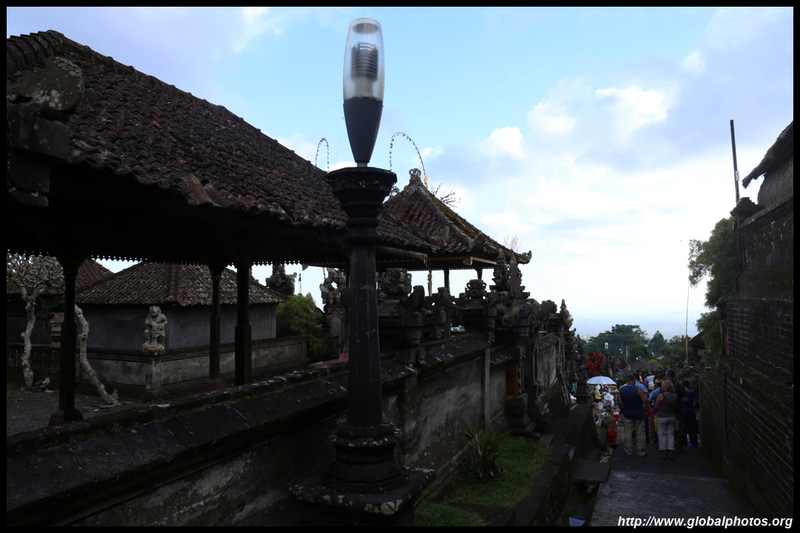 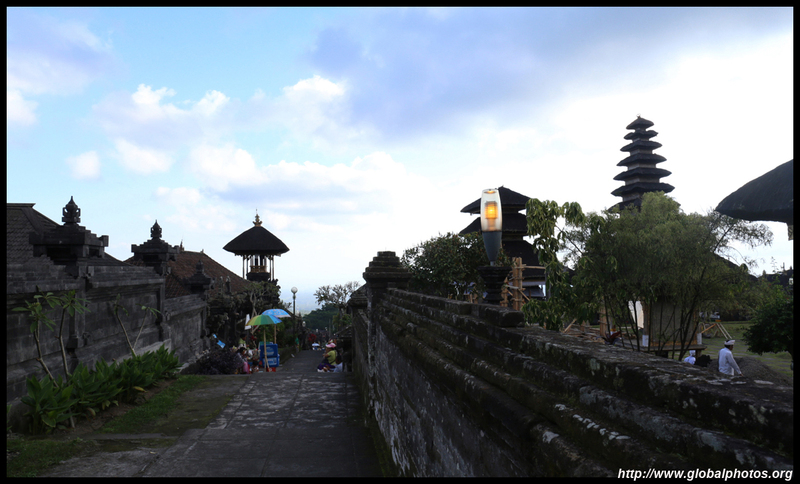 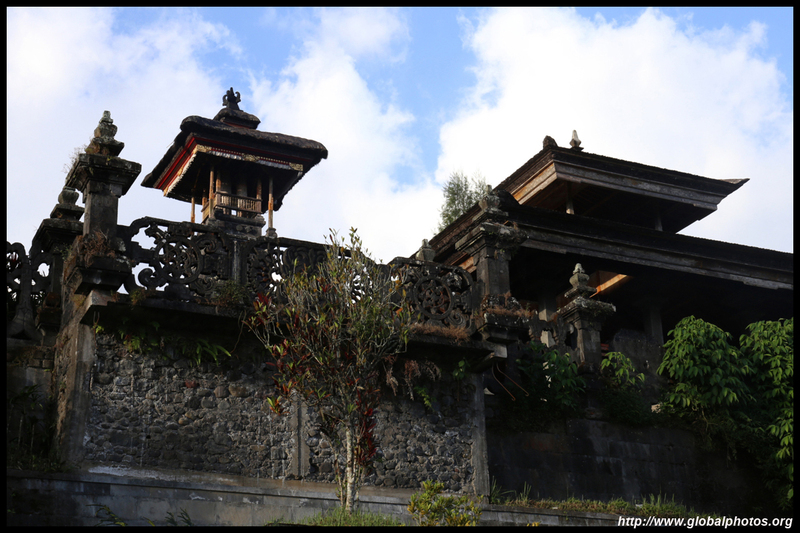 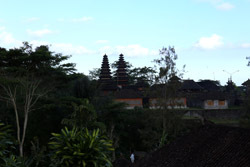 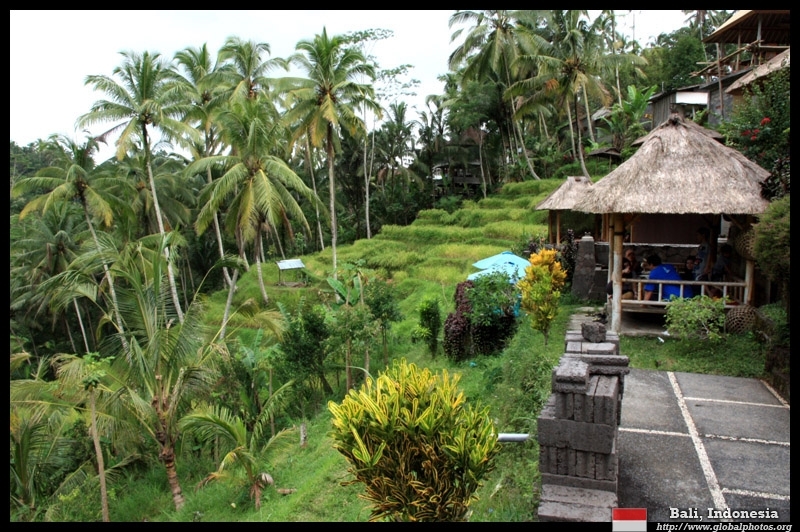 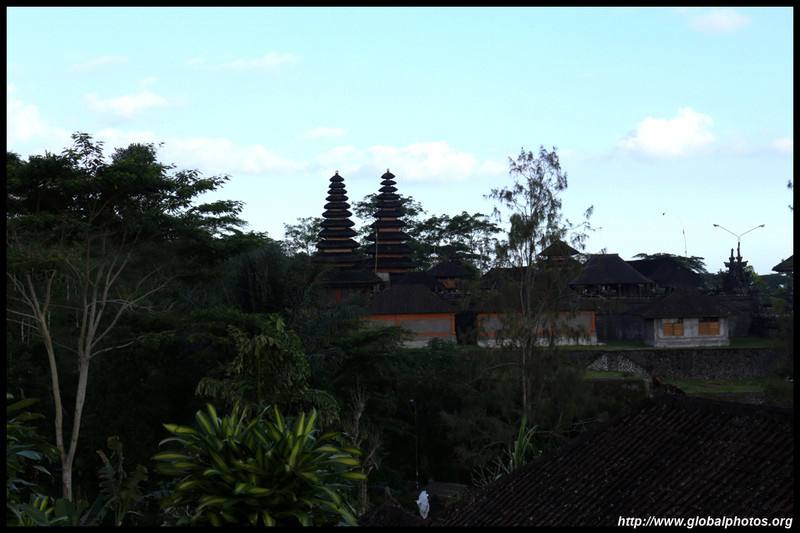 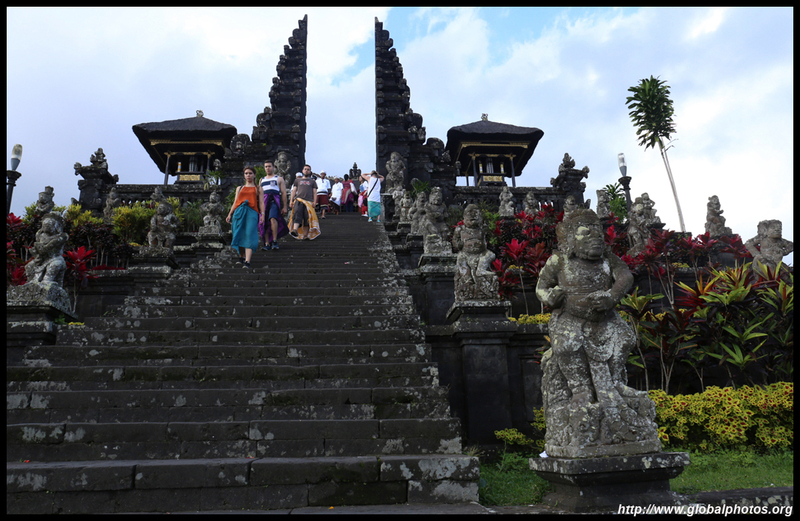 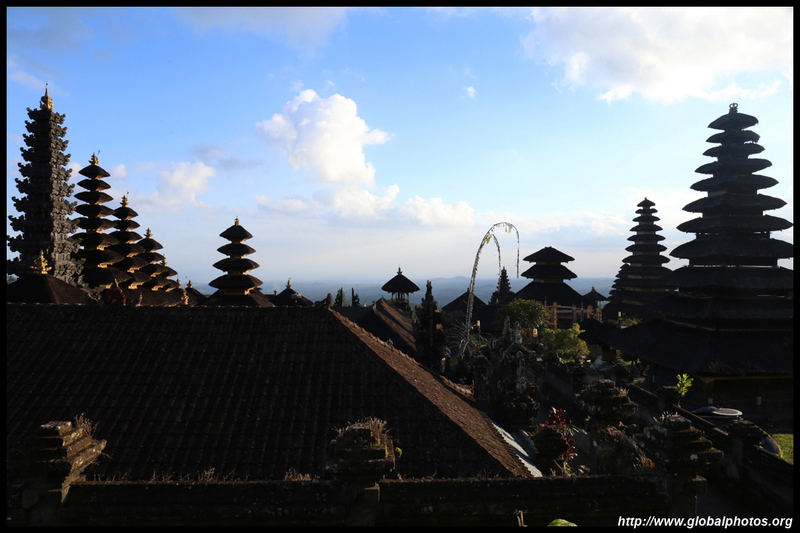 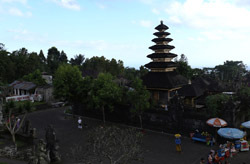 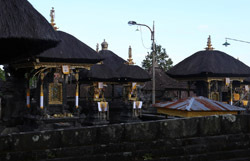 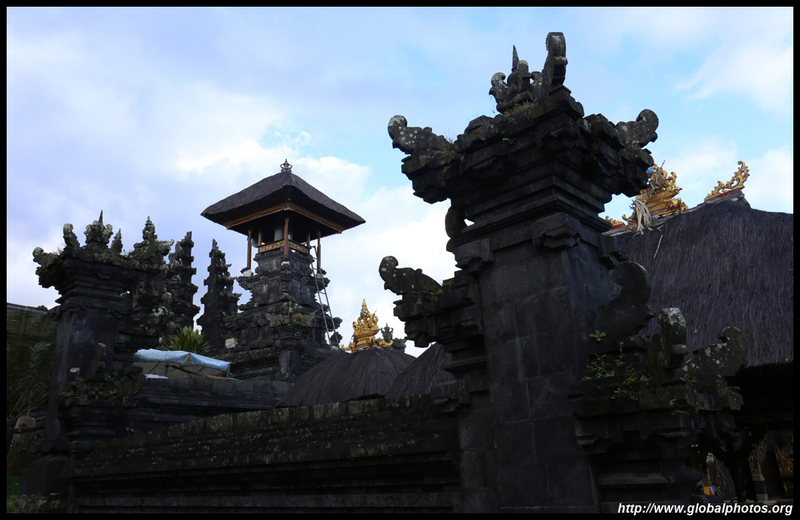 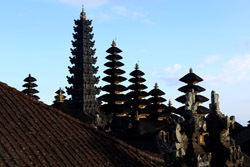 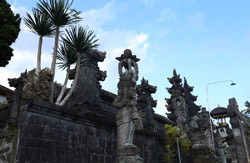 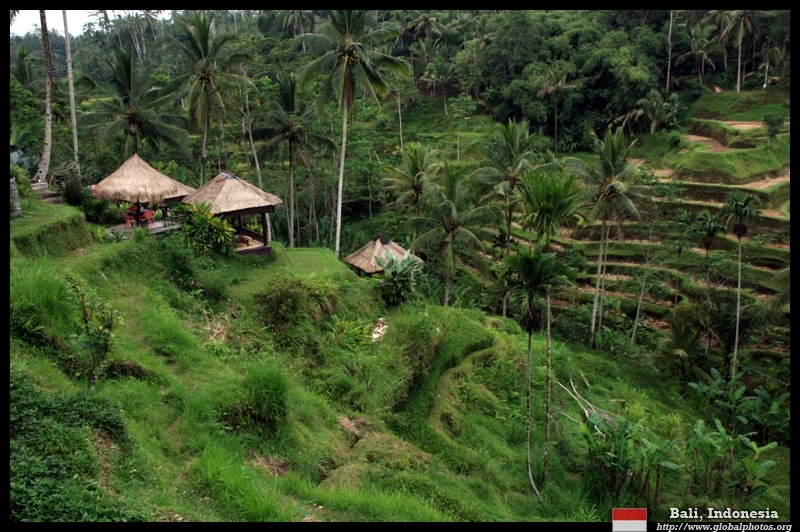 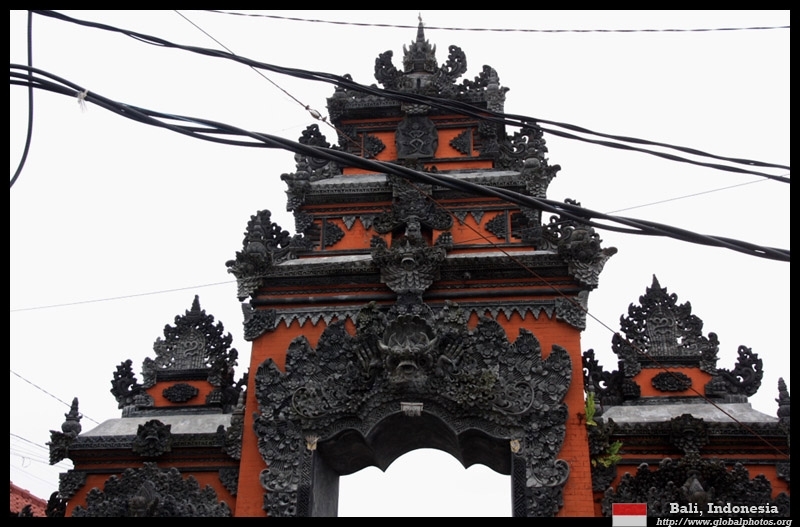 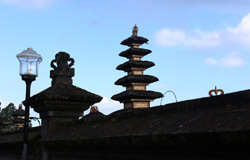 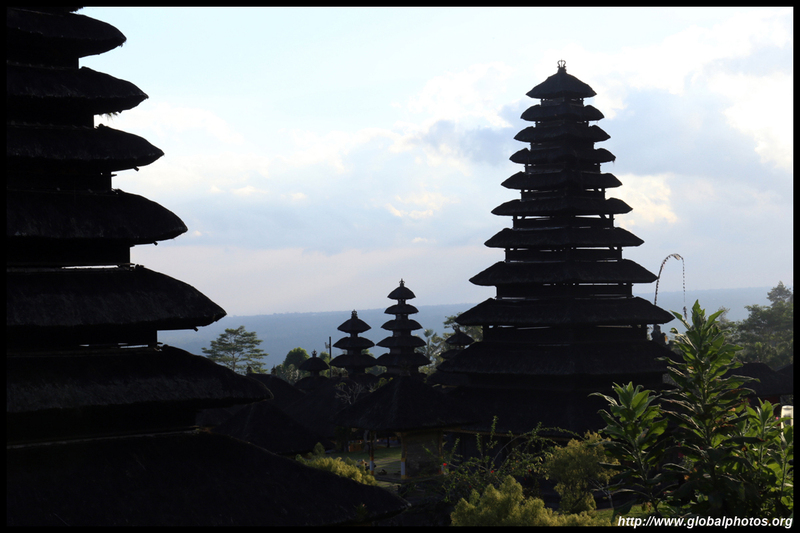 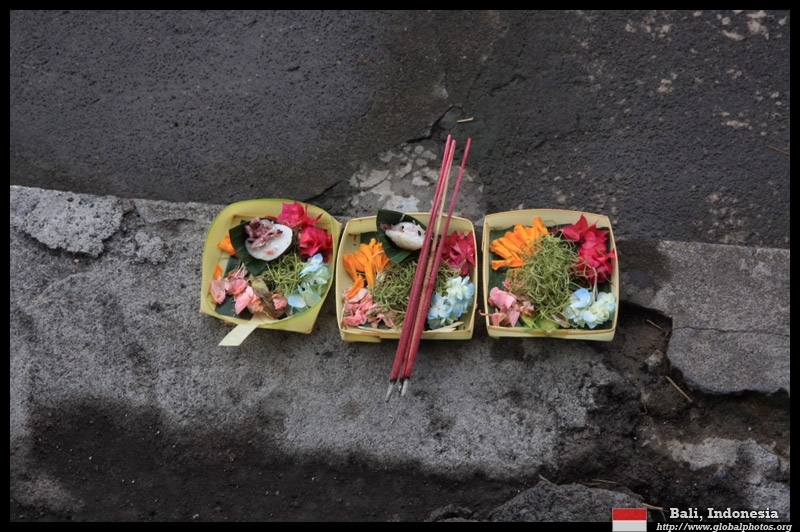 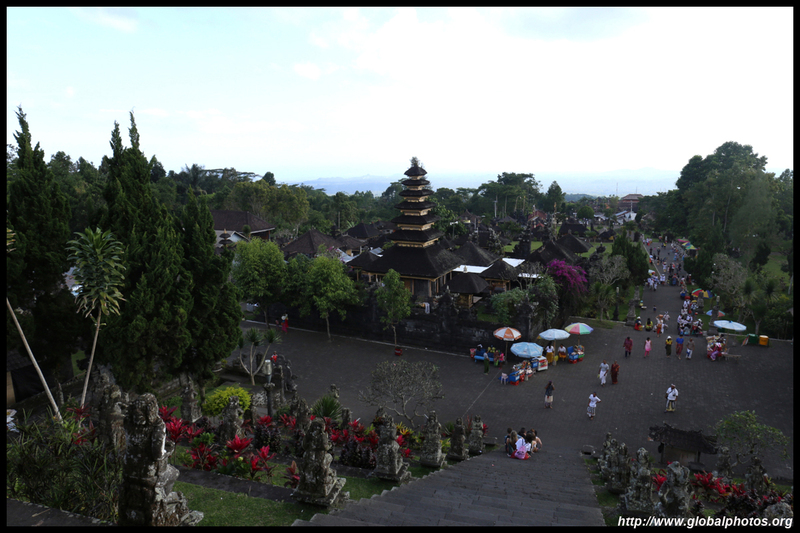 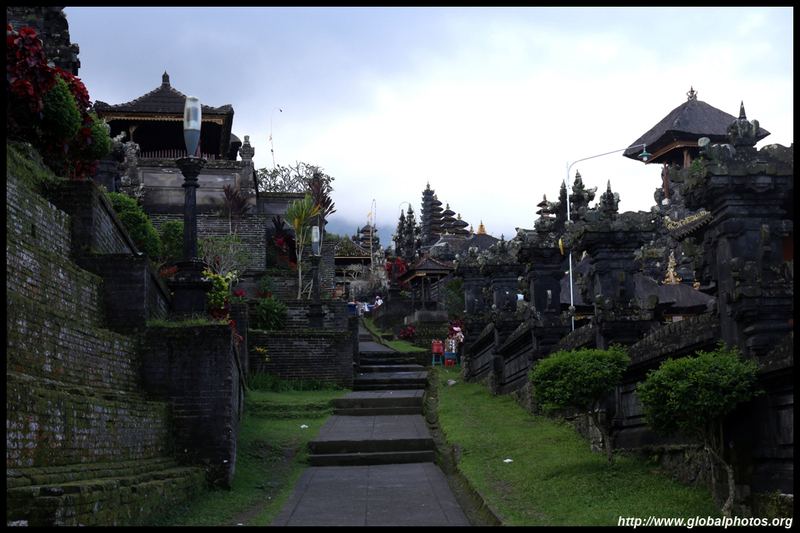 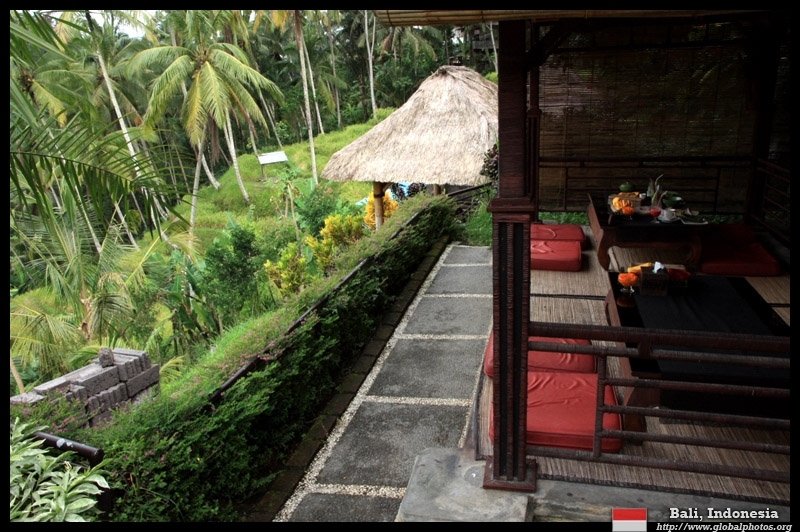 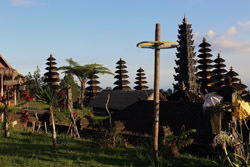 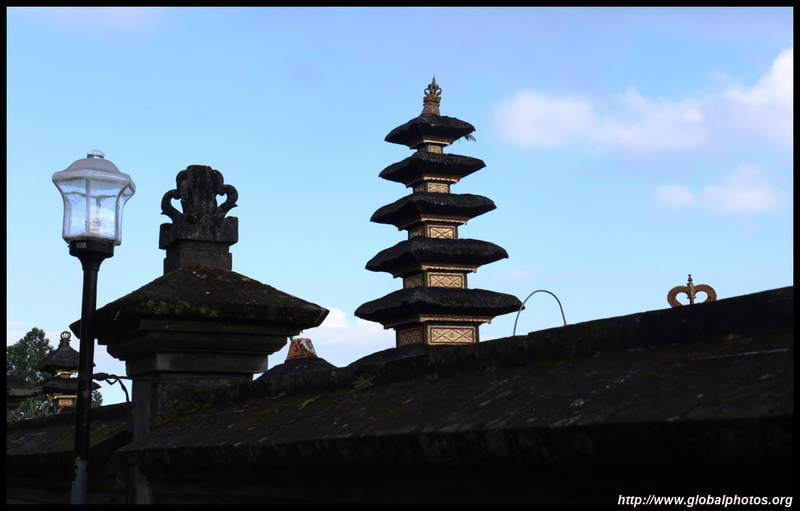 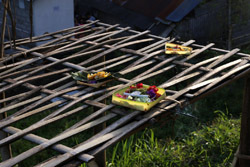 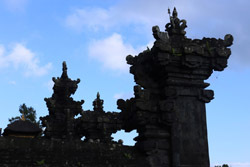 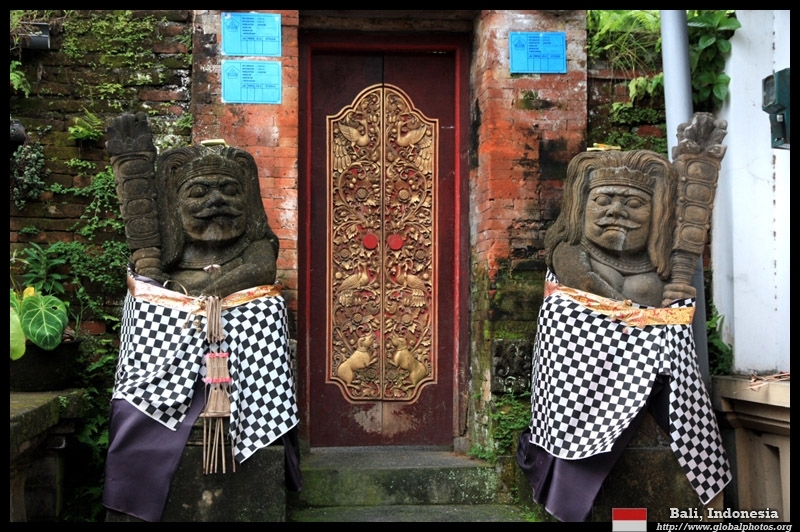 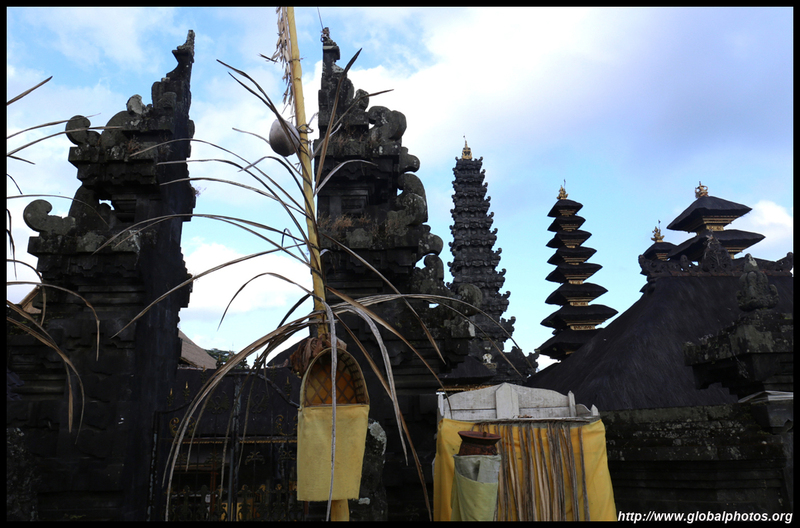 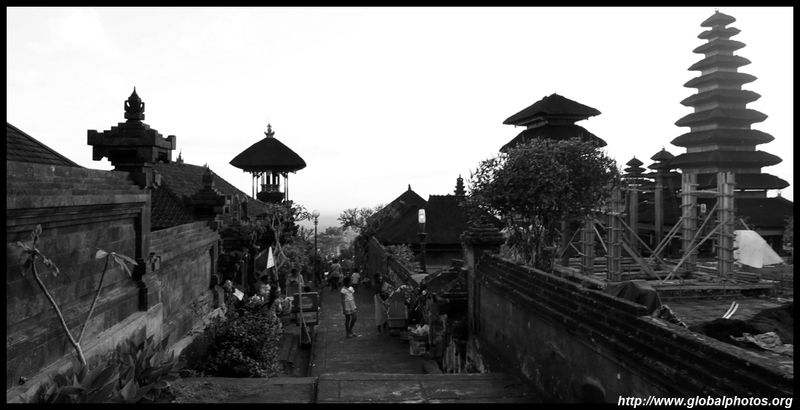 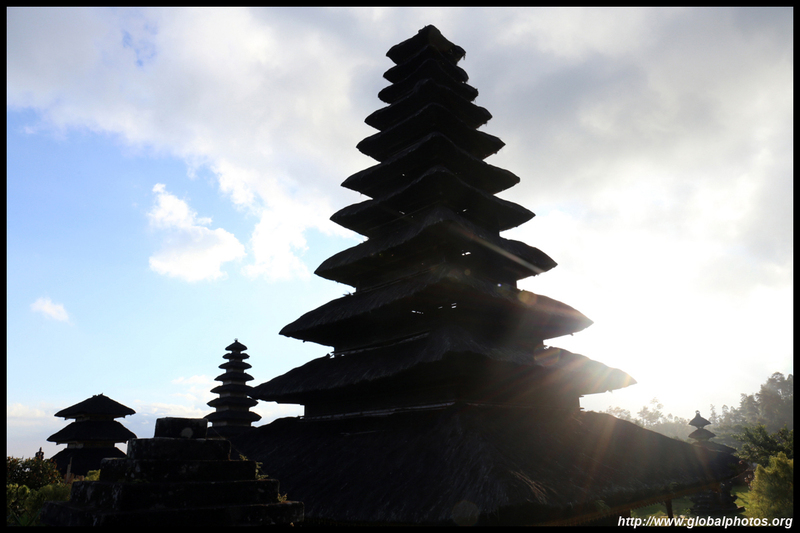 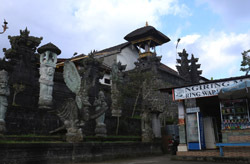 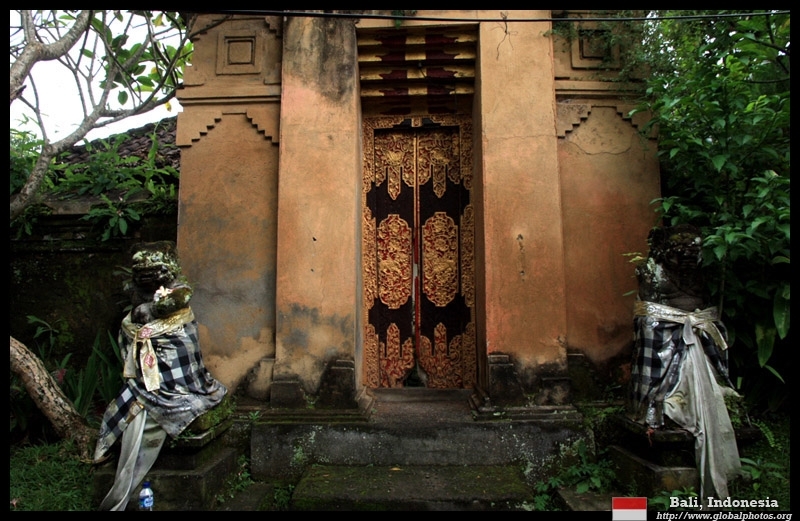 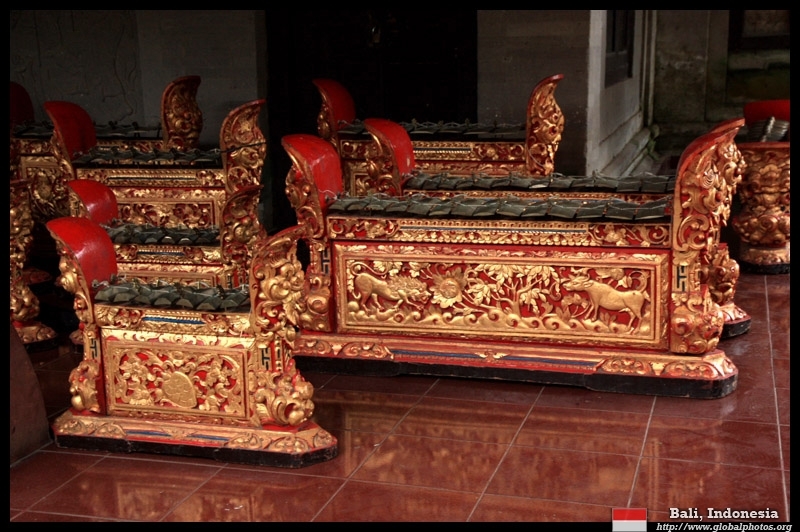 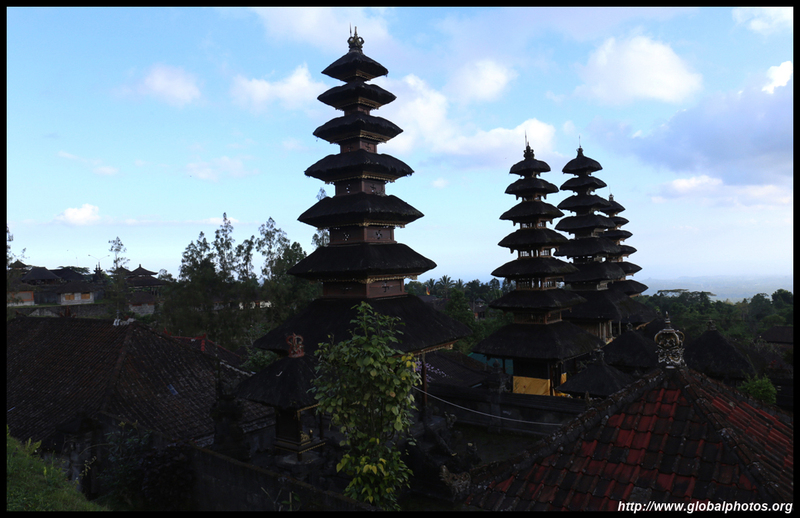 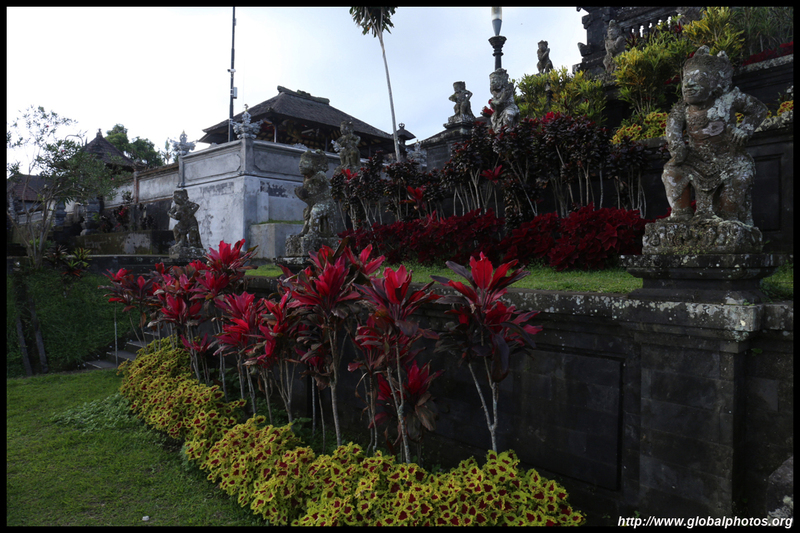 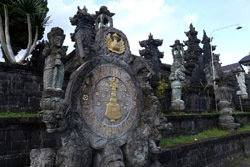 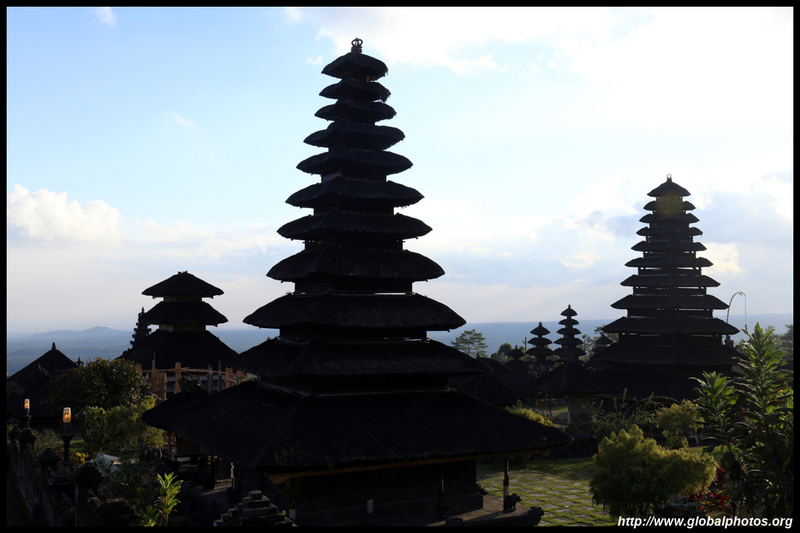 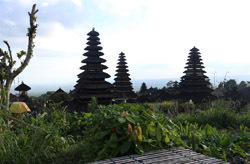 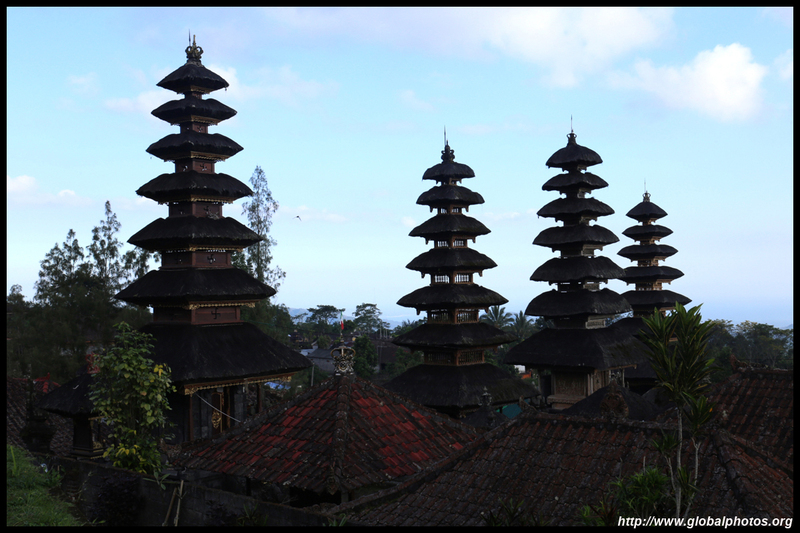 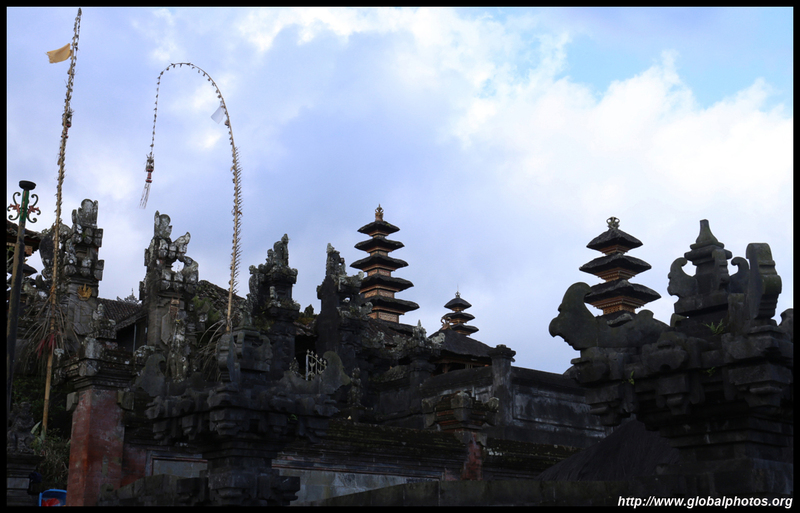 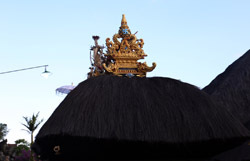 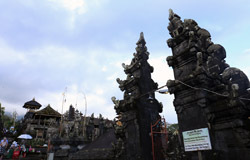 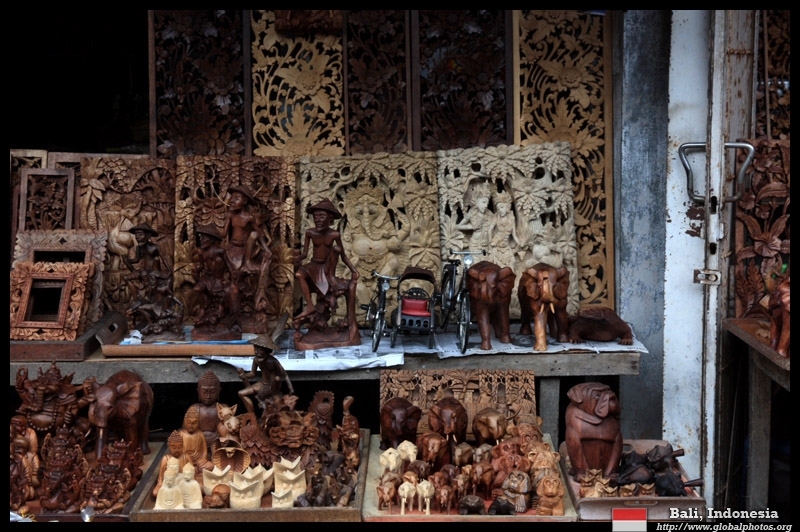 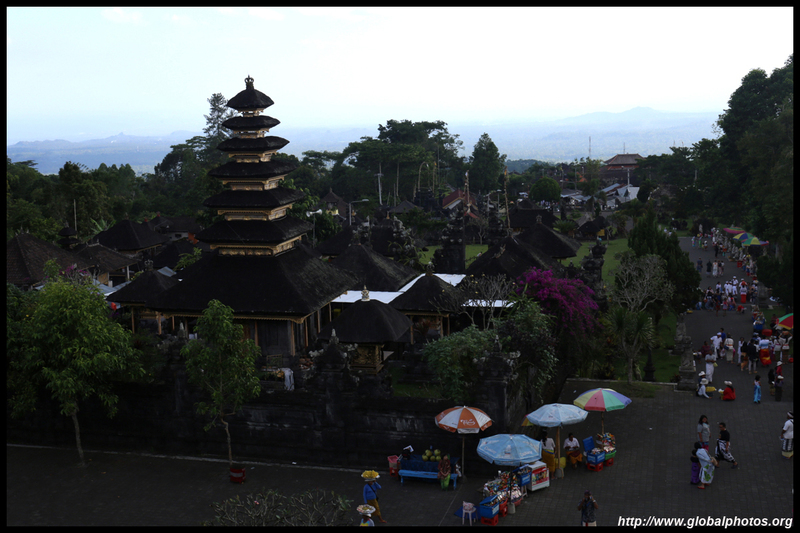 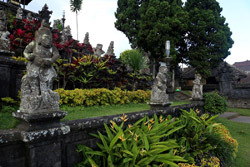 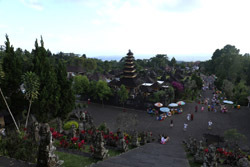 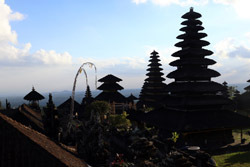 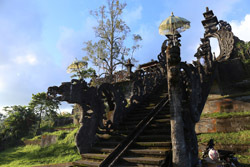 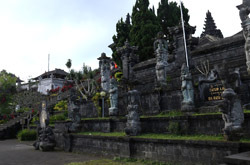 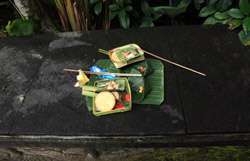 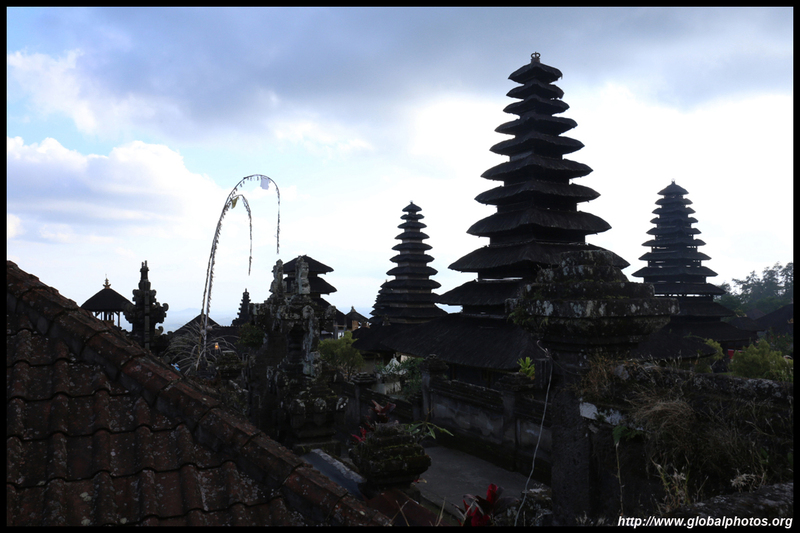 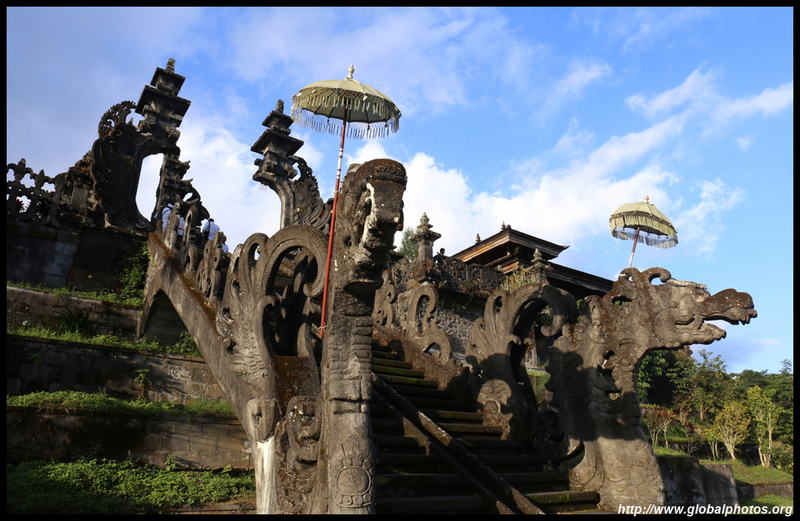 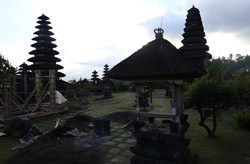 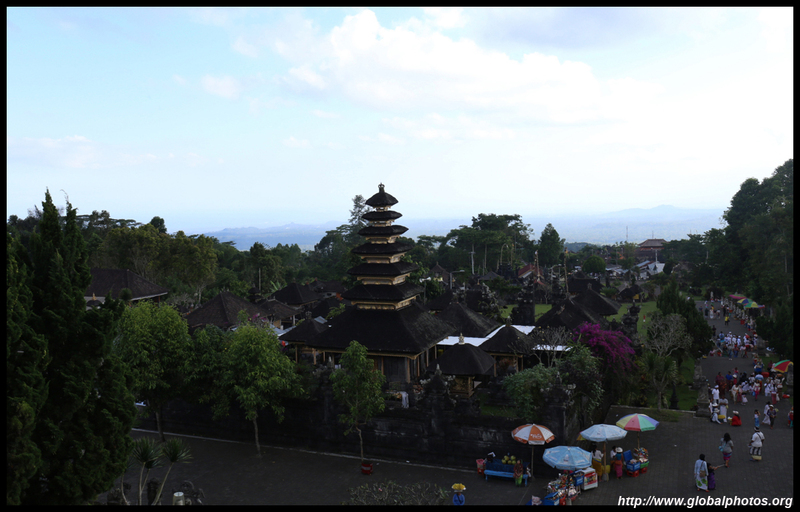 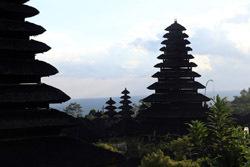 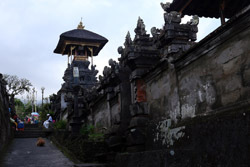 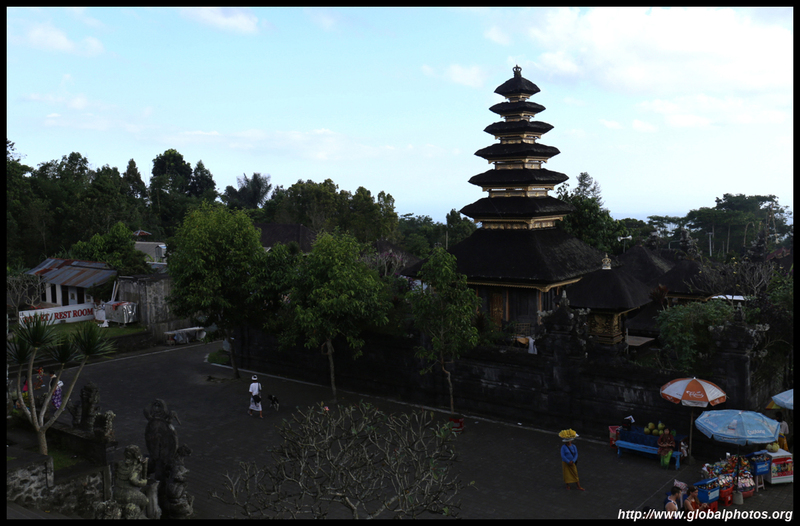 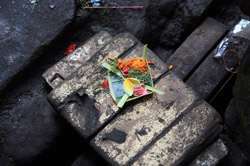 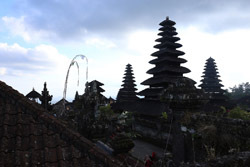 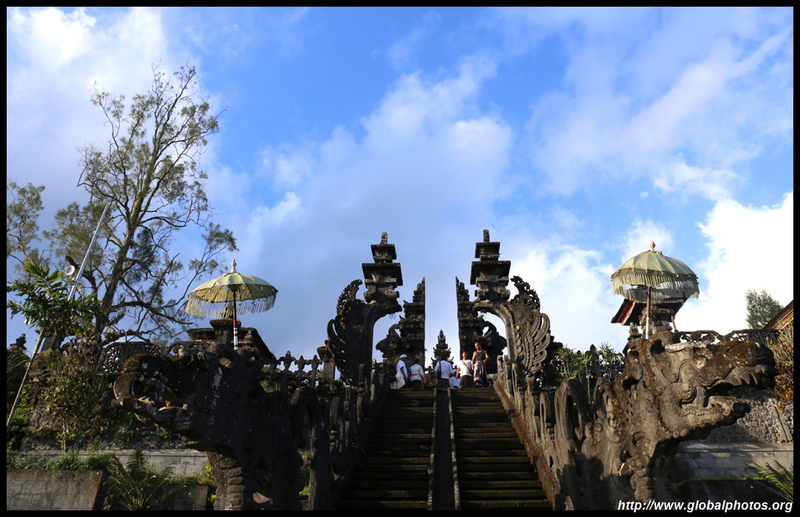 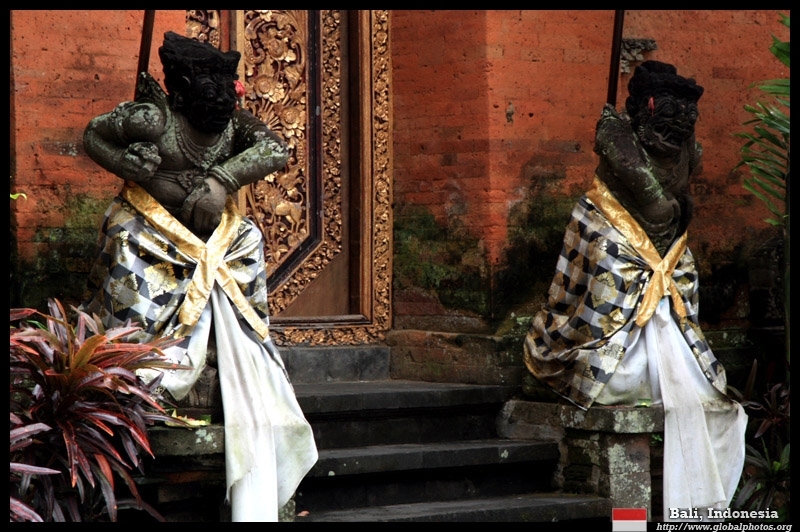 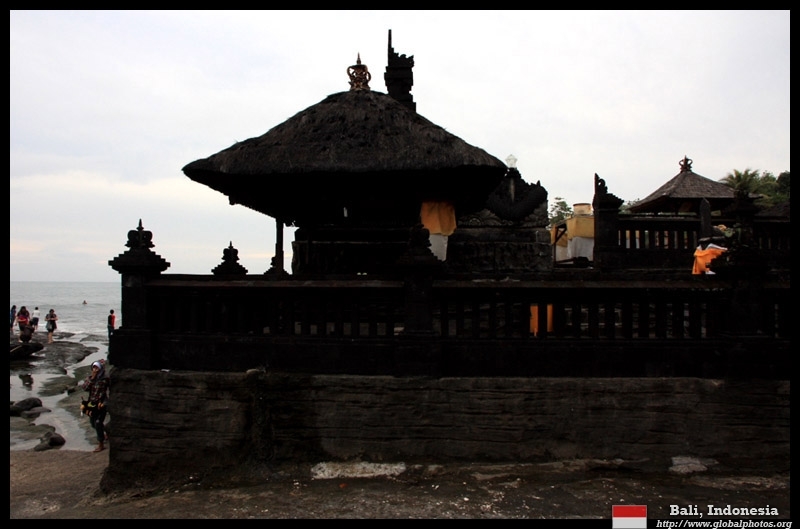 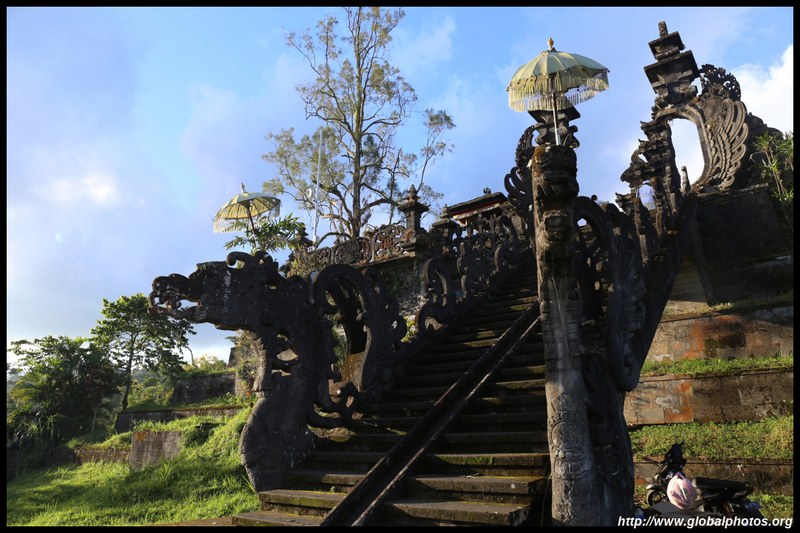 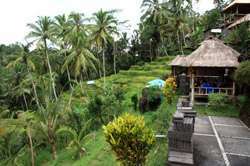 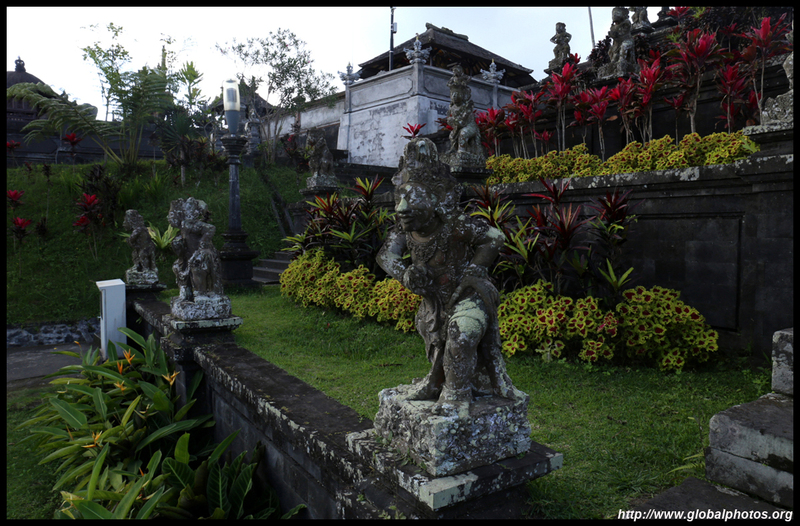 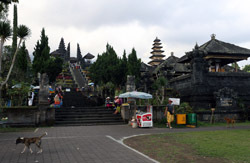 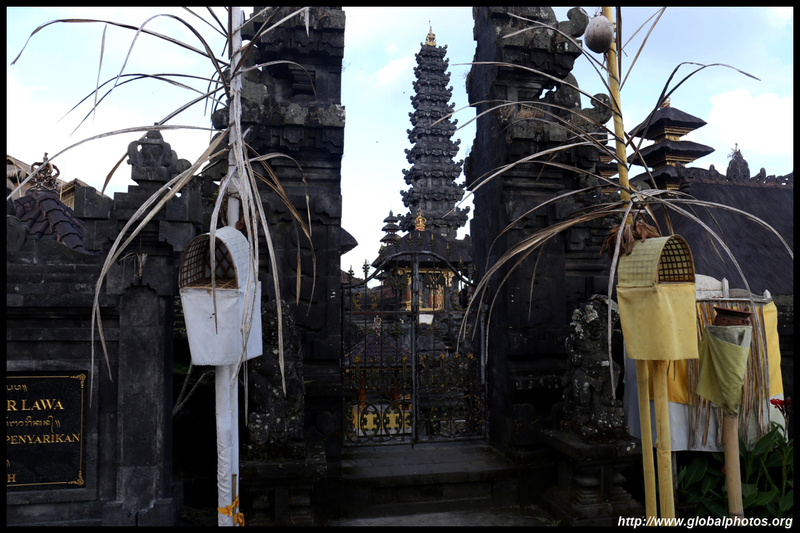 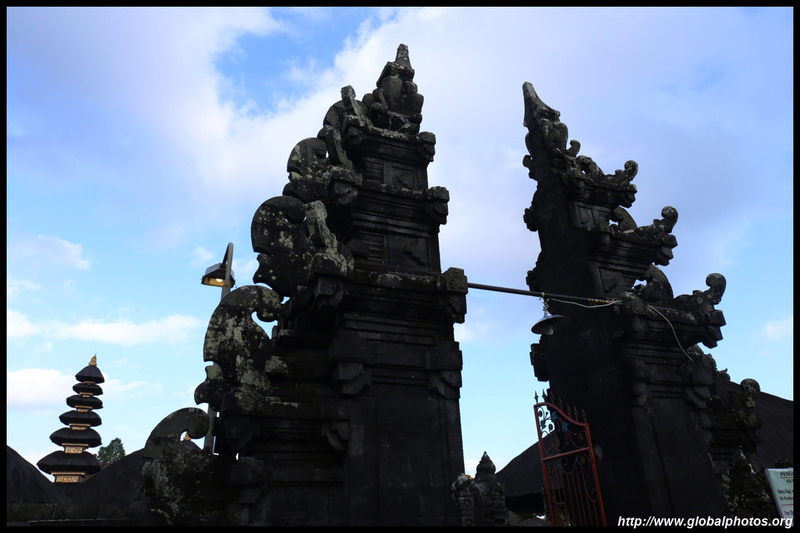 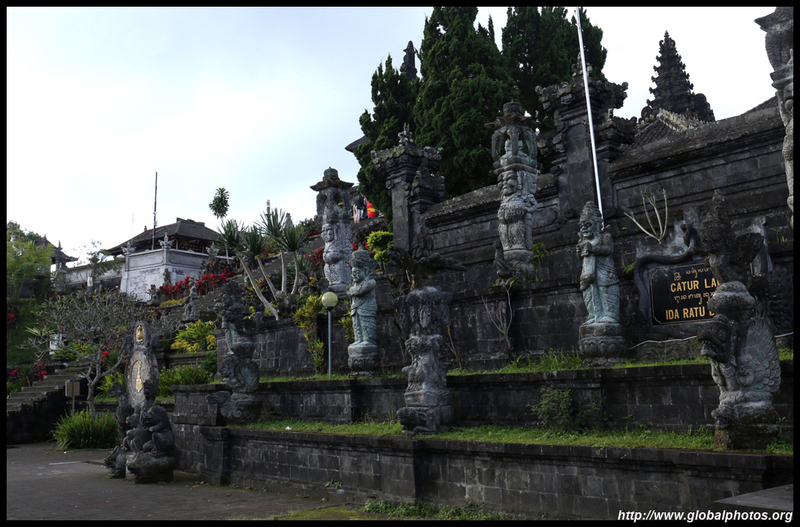 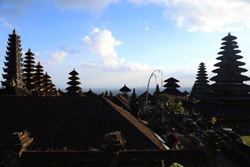 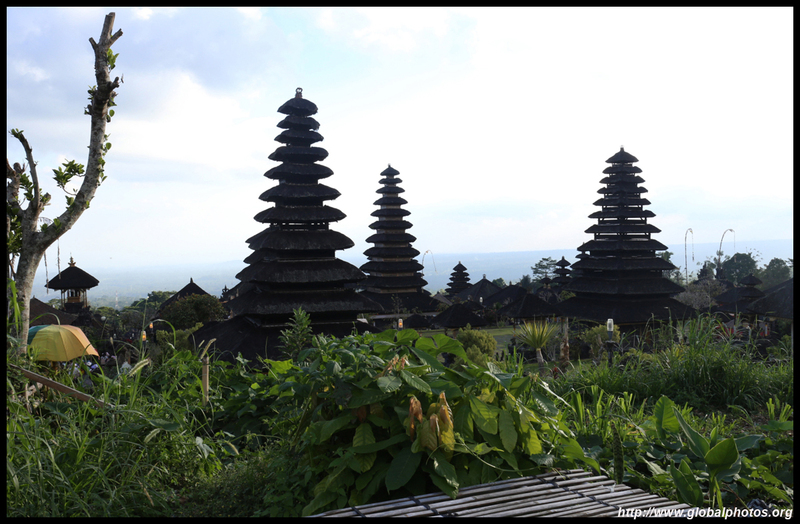 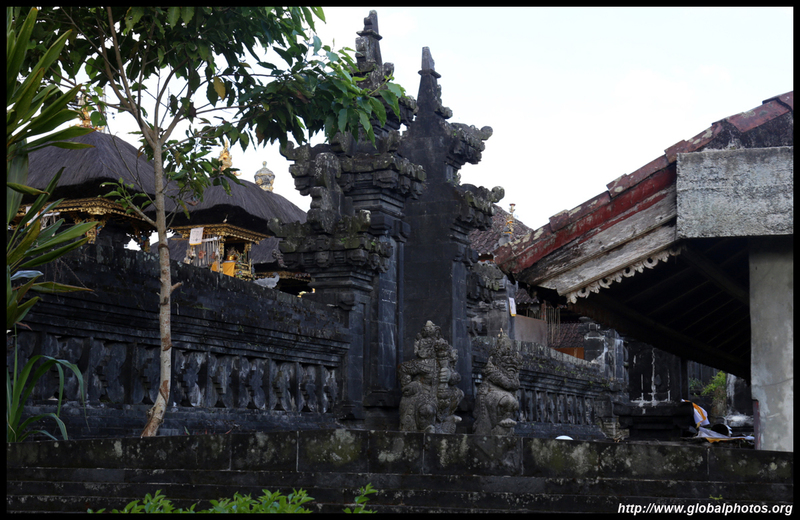 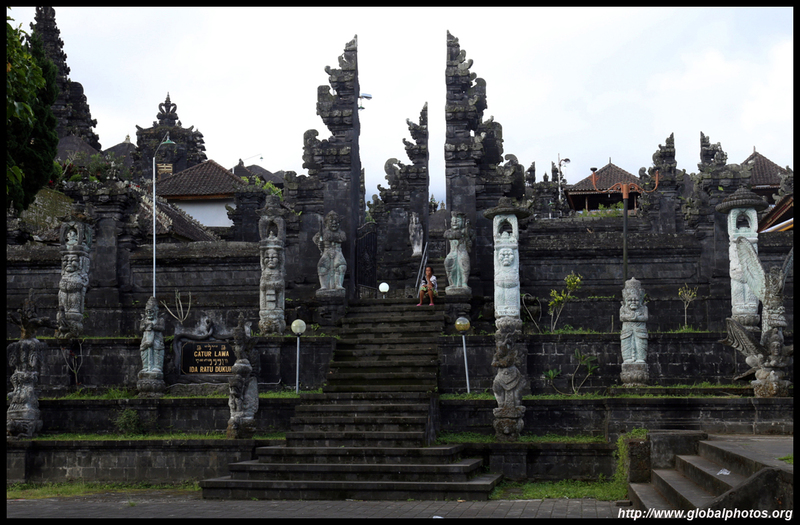 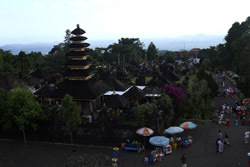 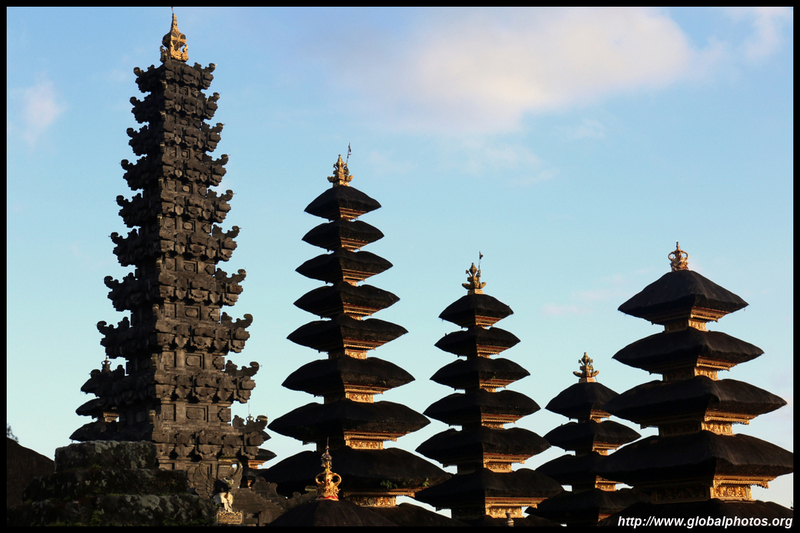 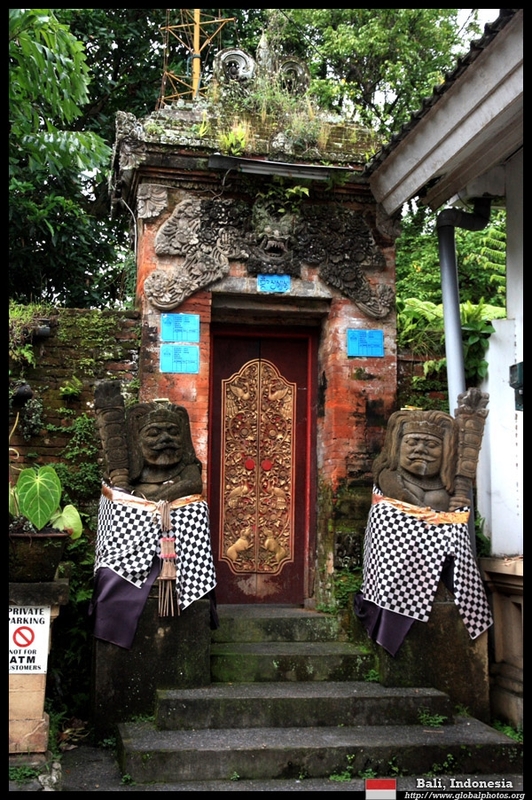 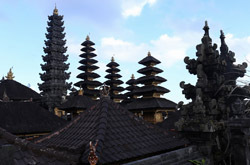 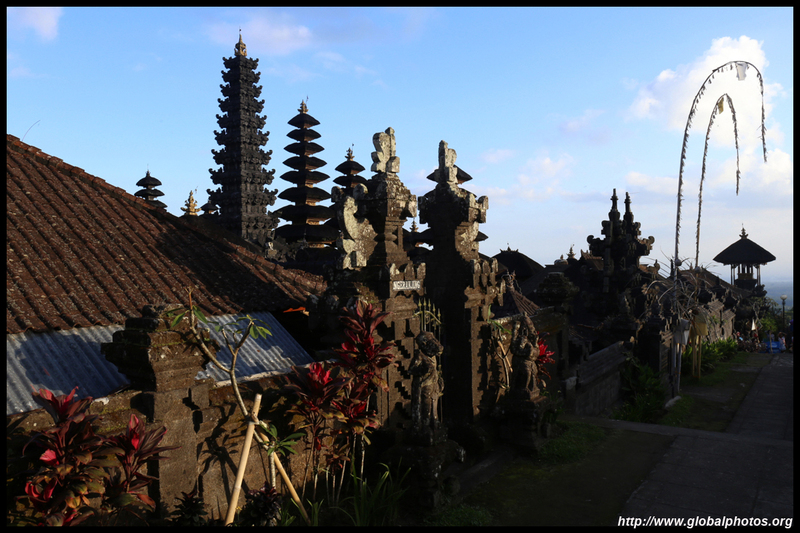 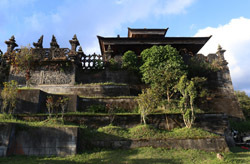 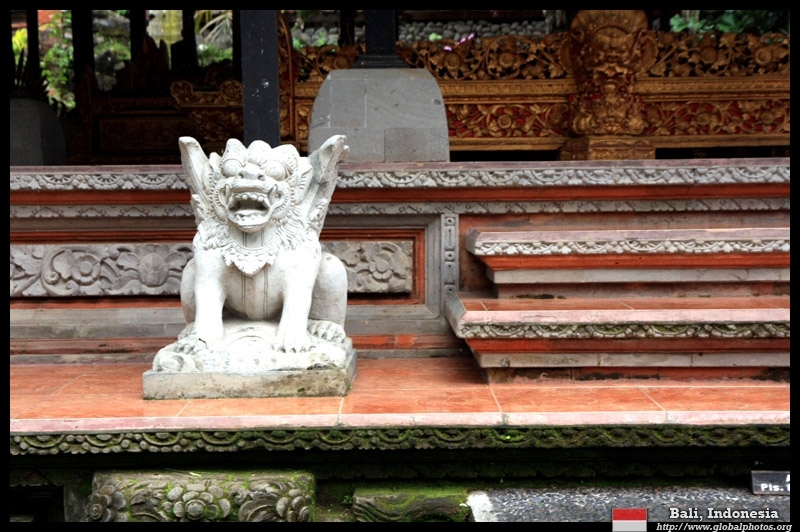 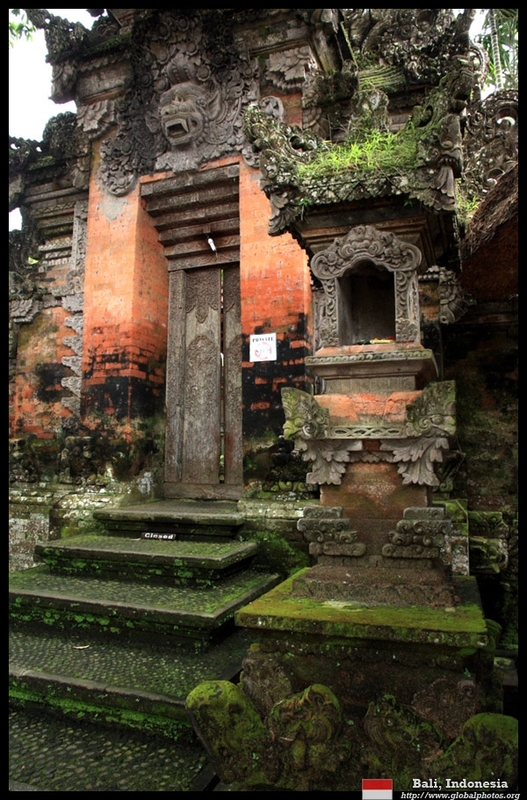 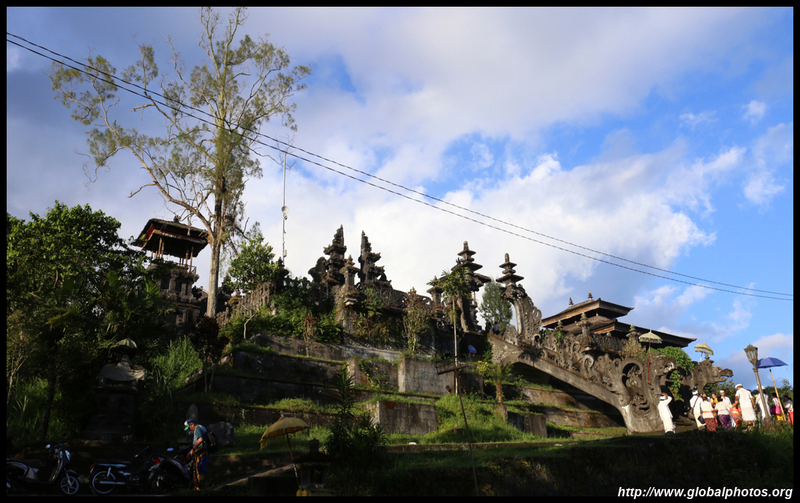 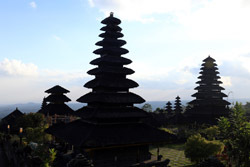 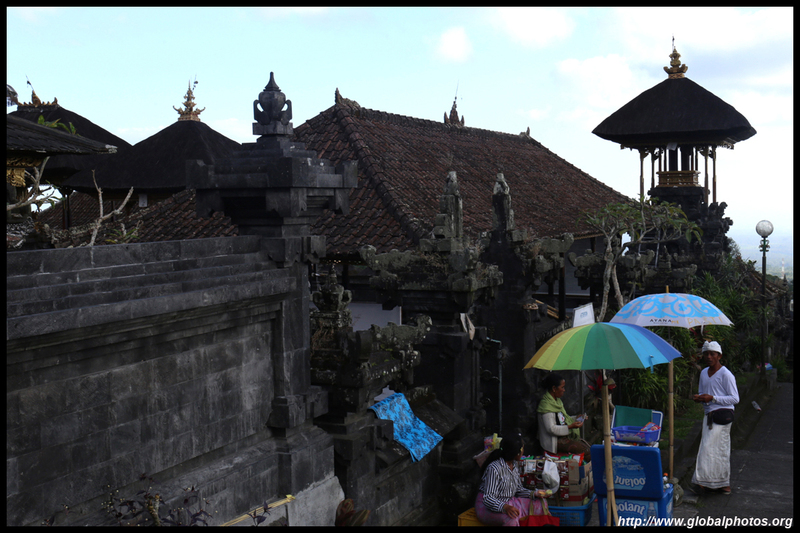 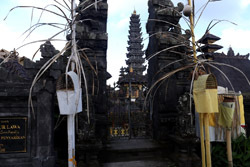 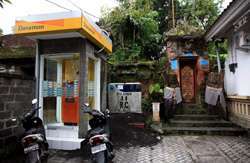 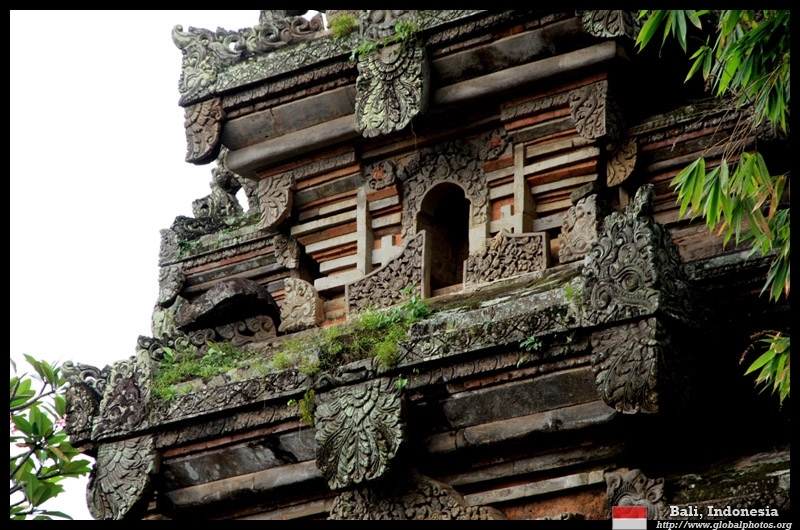 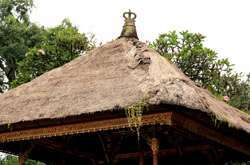 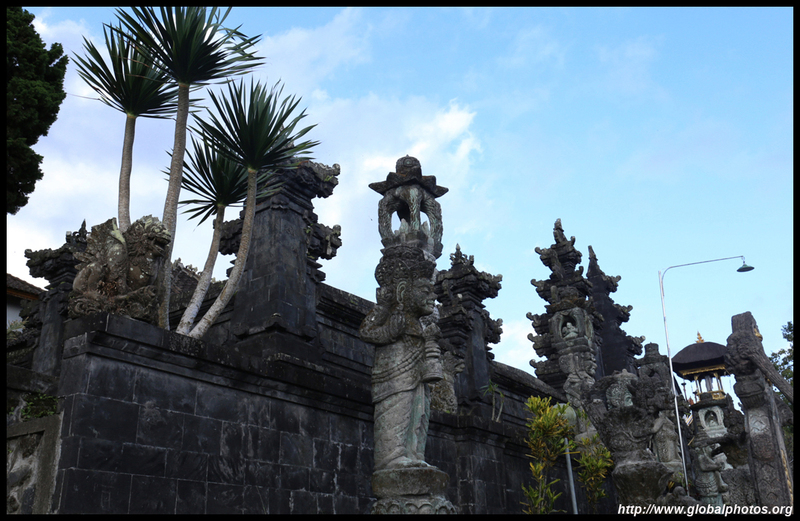 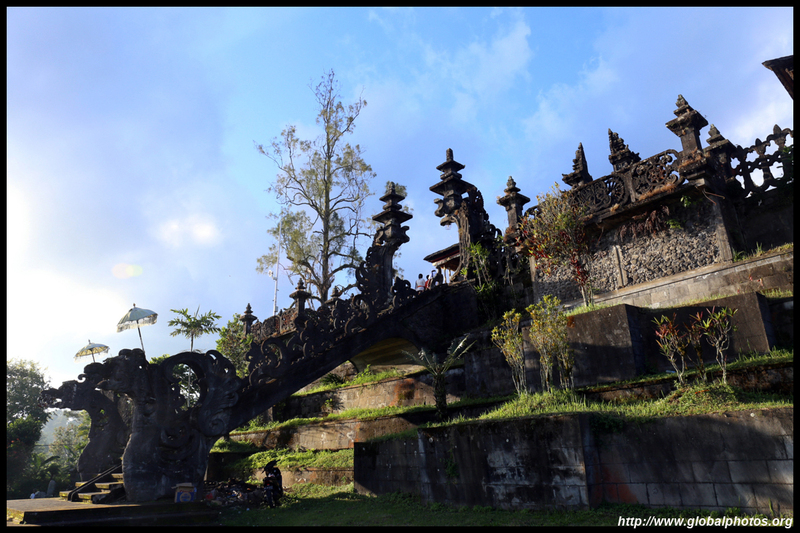 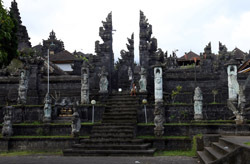 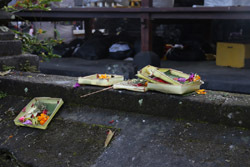 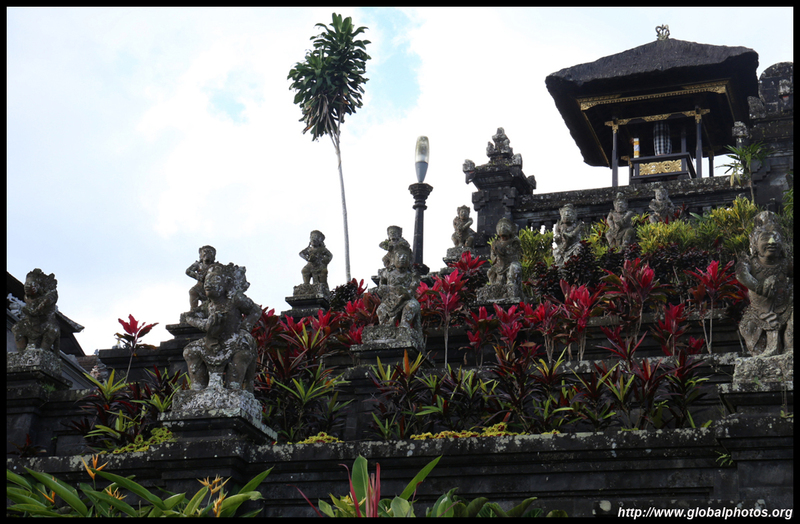 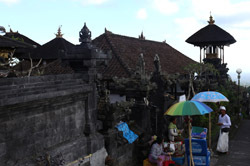 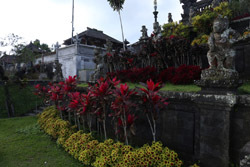 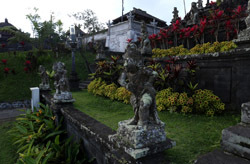 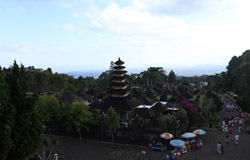 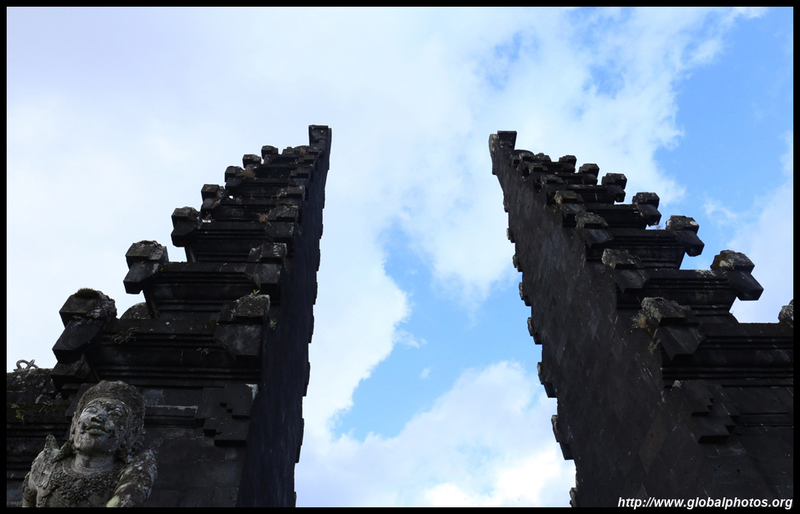 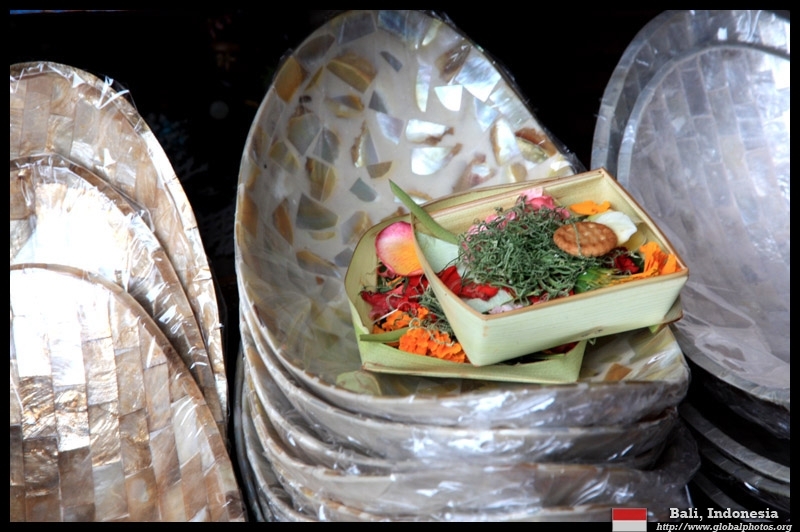 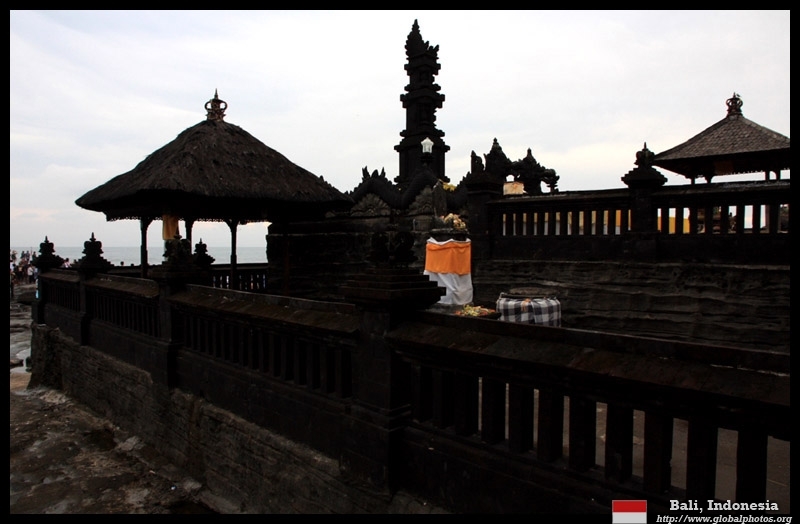 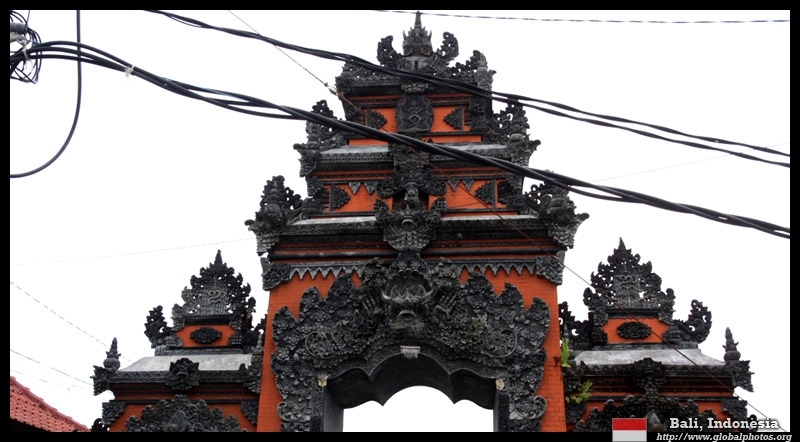 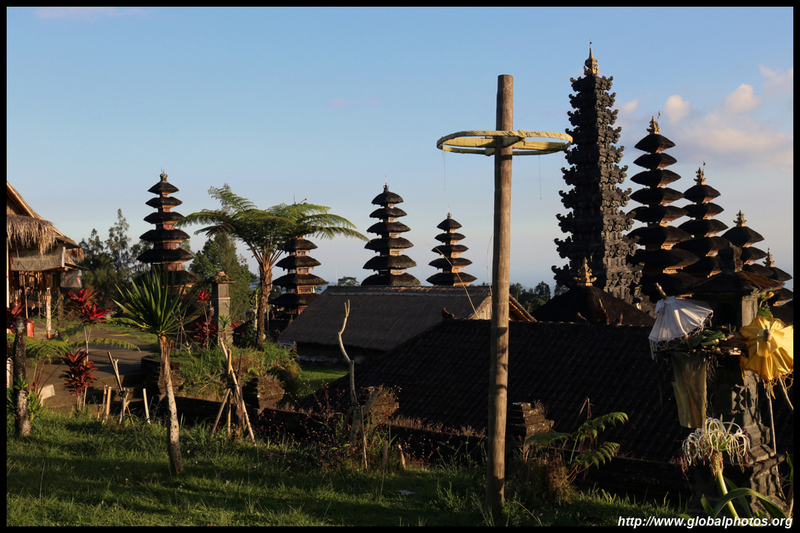 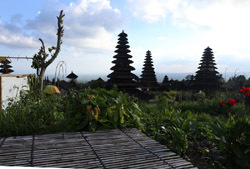 High up in the mountains is Bali's most important temple complex. 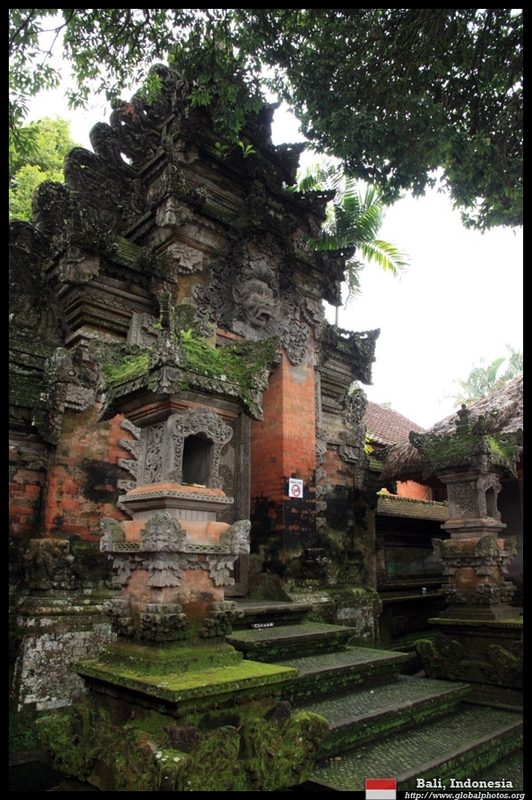 Now ruined by touts that try to extort money from tourists, it is still worth a visit to admire the architecture. 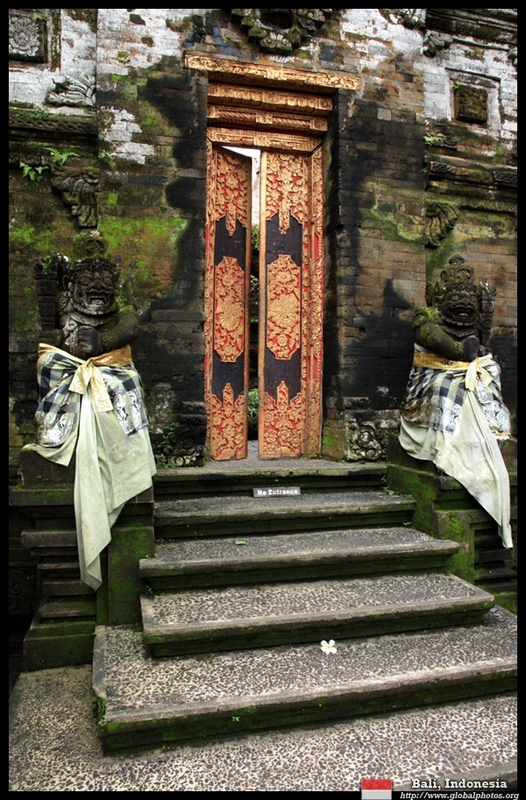 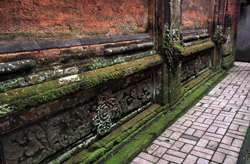 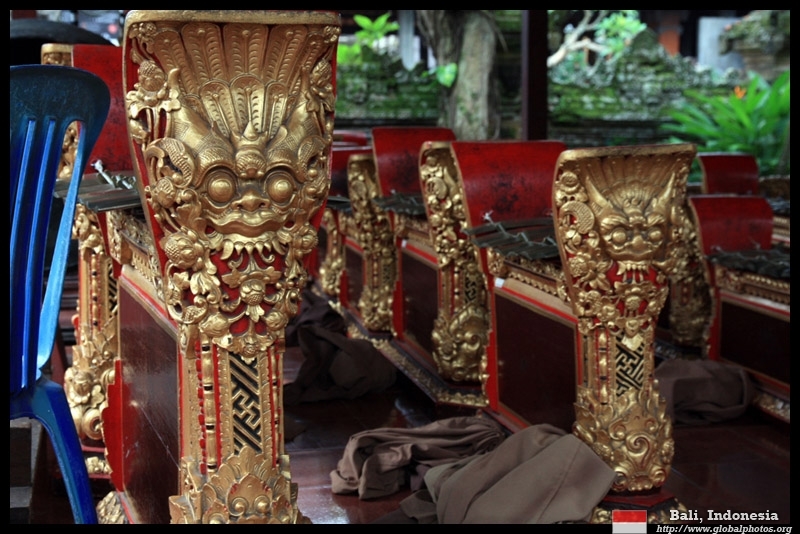 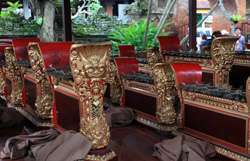 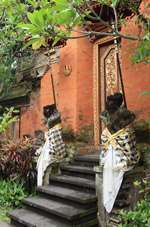 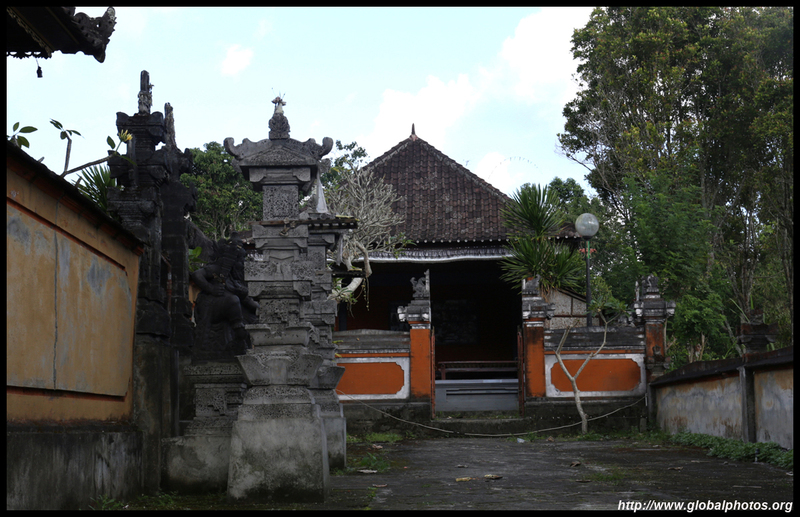 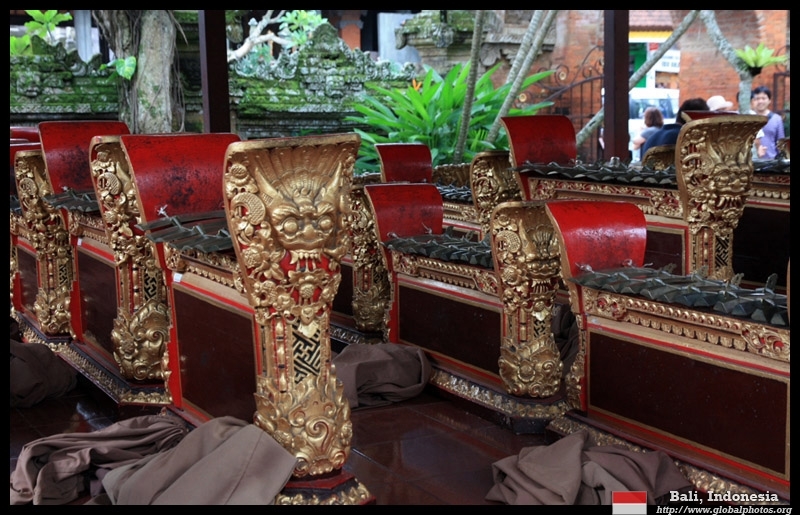 While you need a handler to take you inside each temple, it was sufficient to admire the serene setting from the outside. 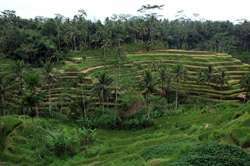 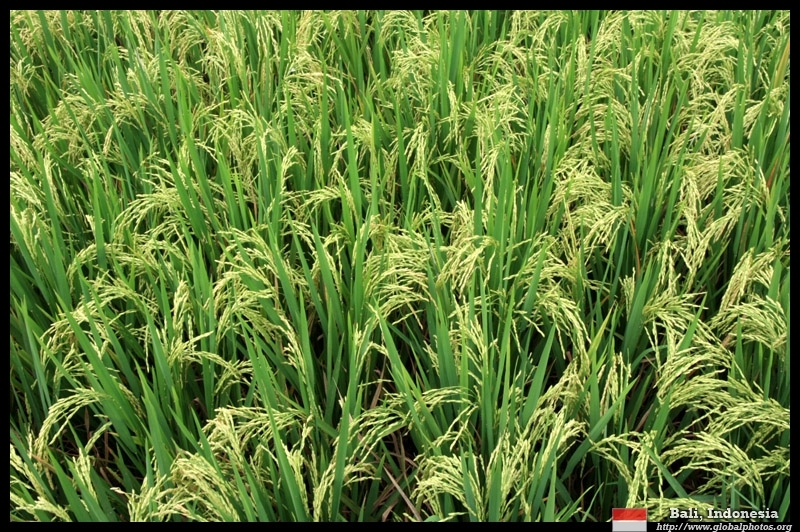 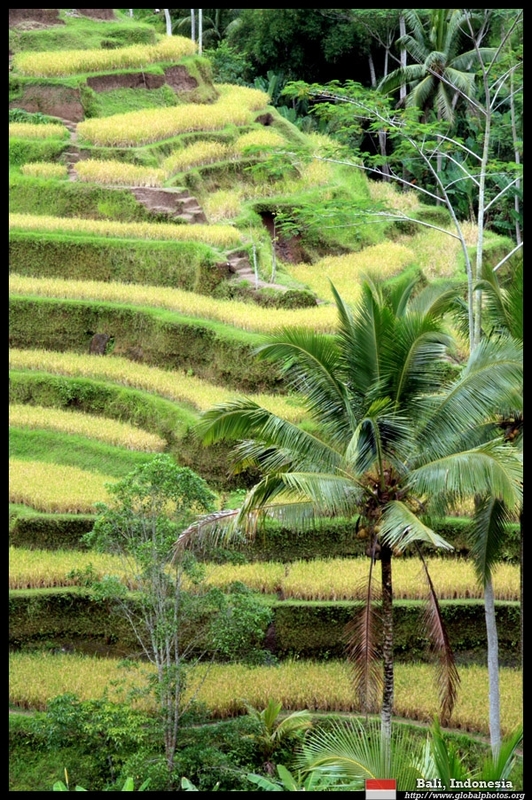 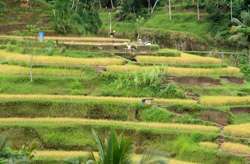 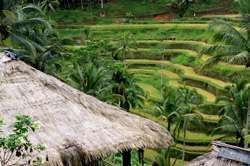 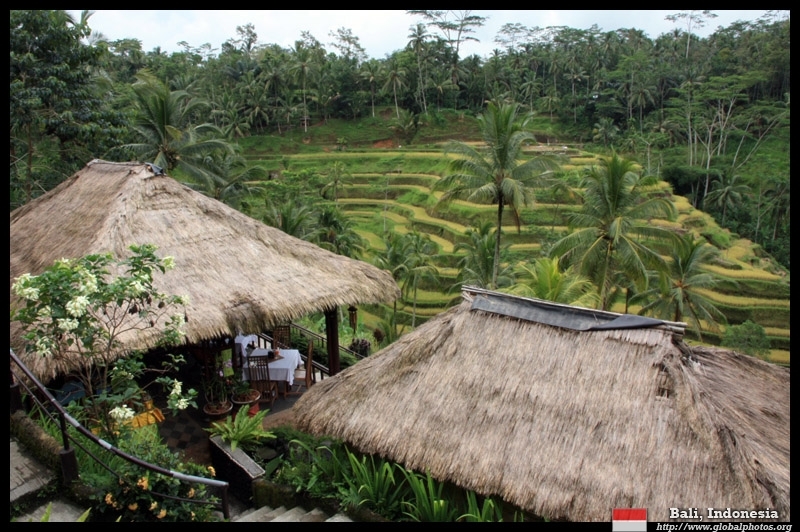 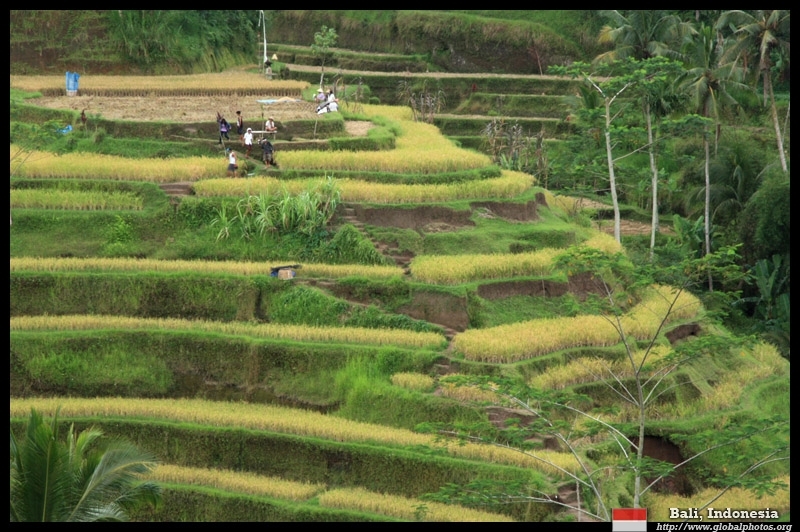 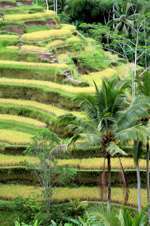 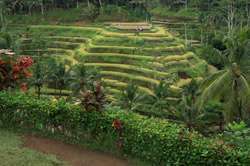 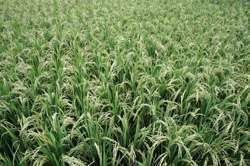 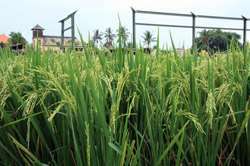 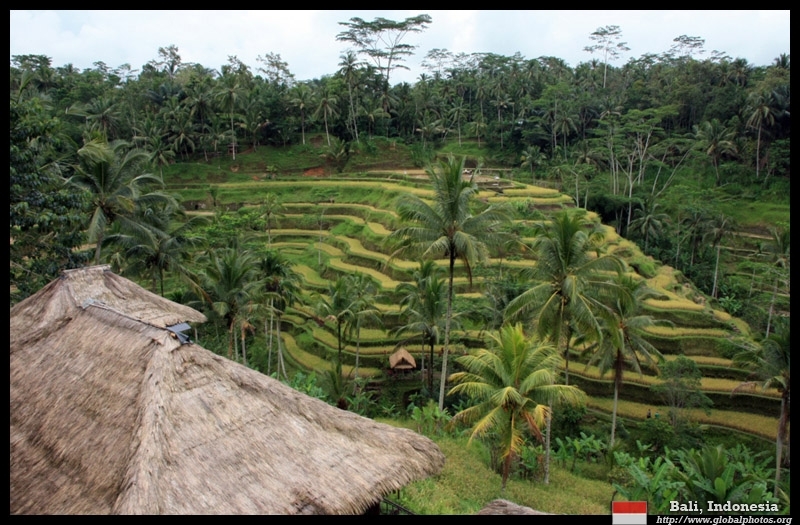 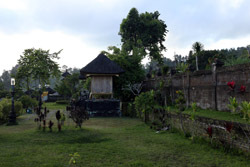 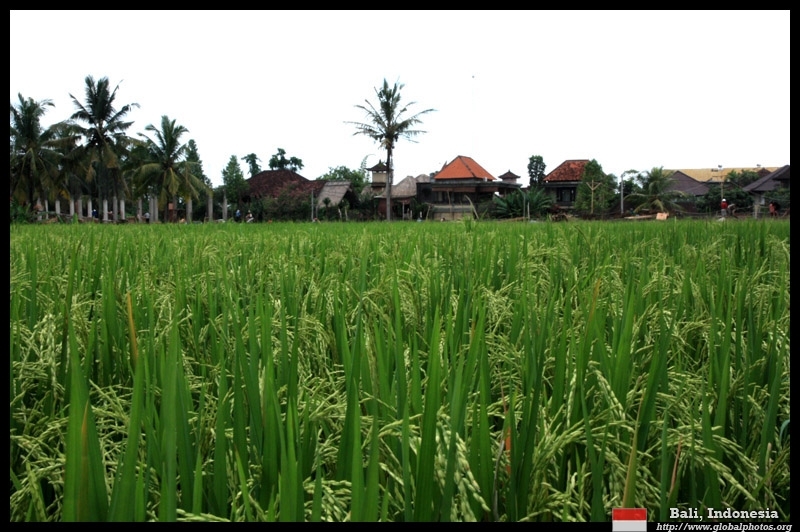 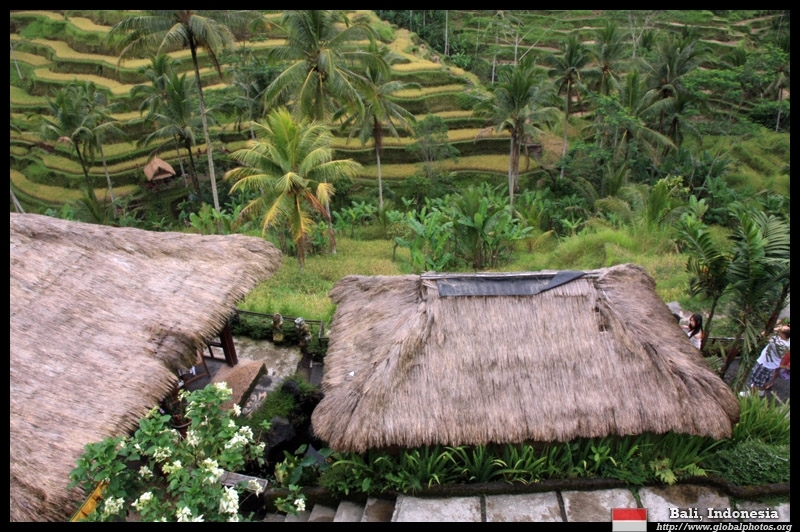 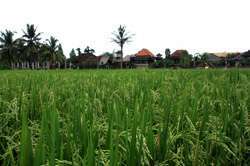 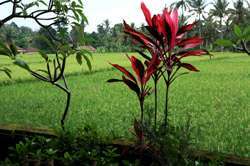 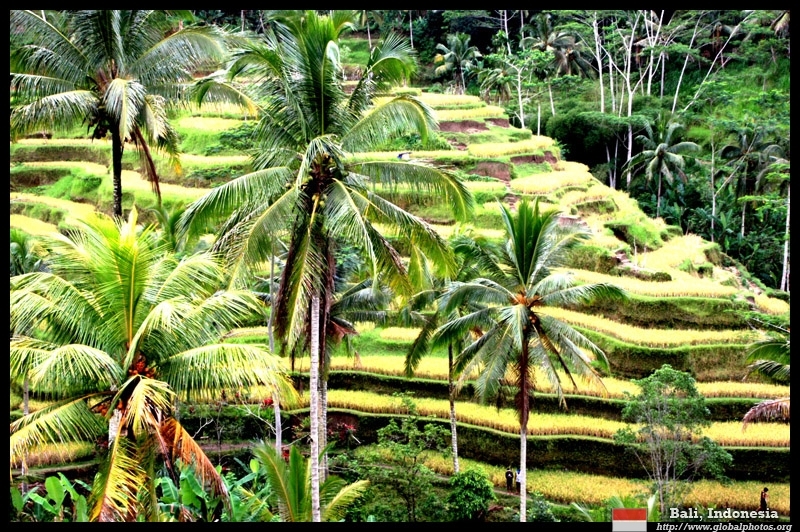 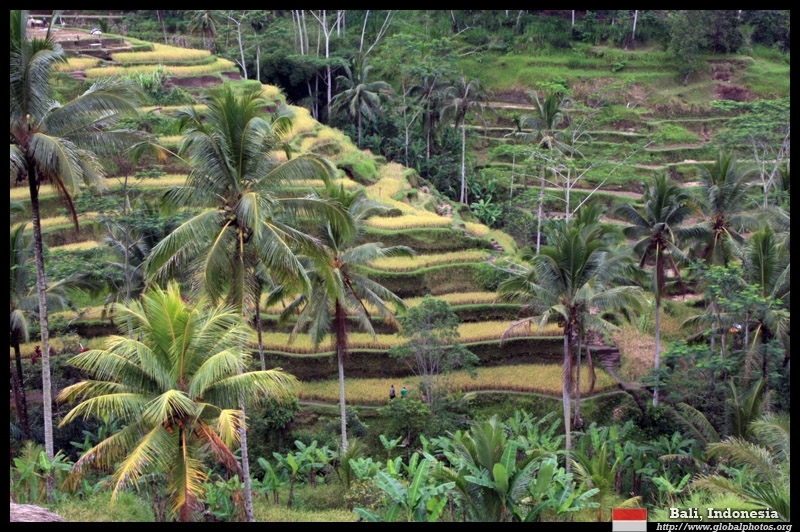 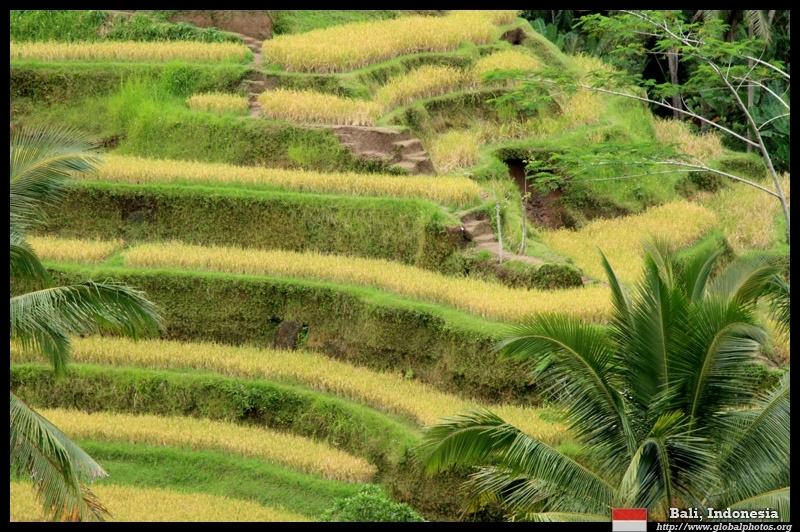 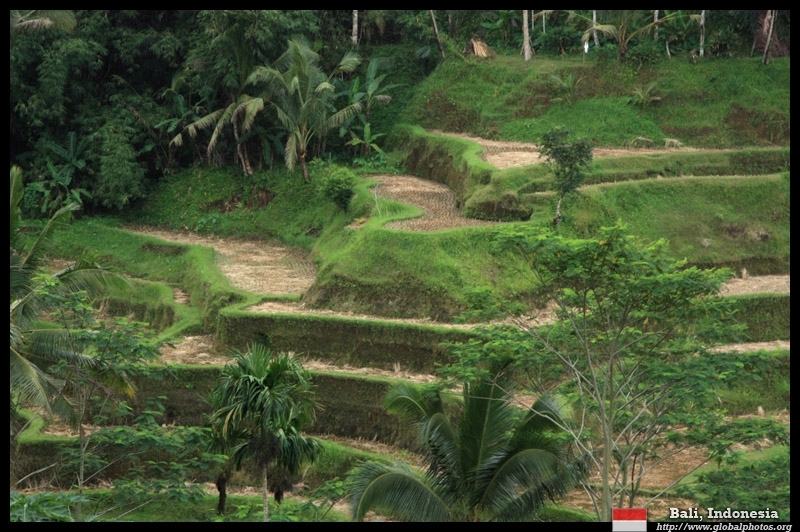 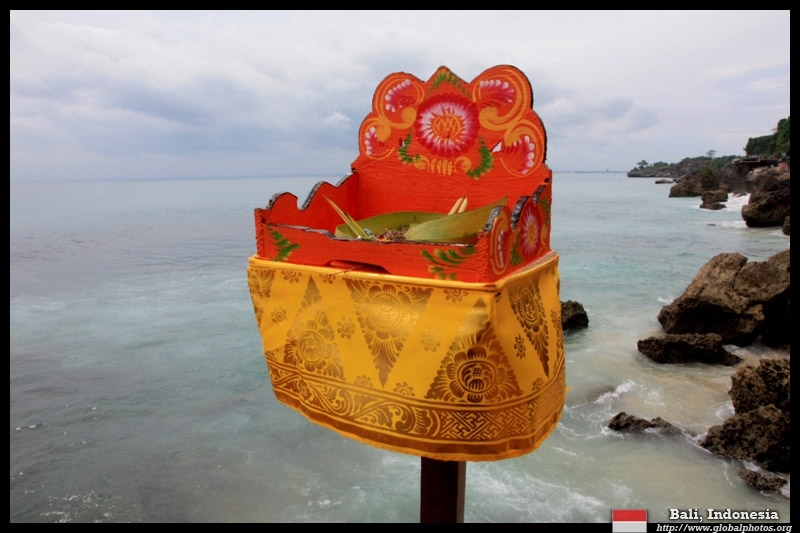 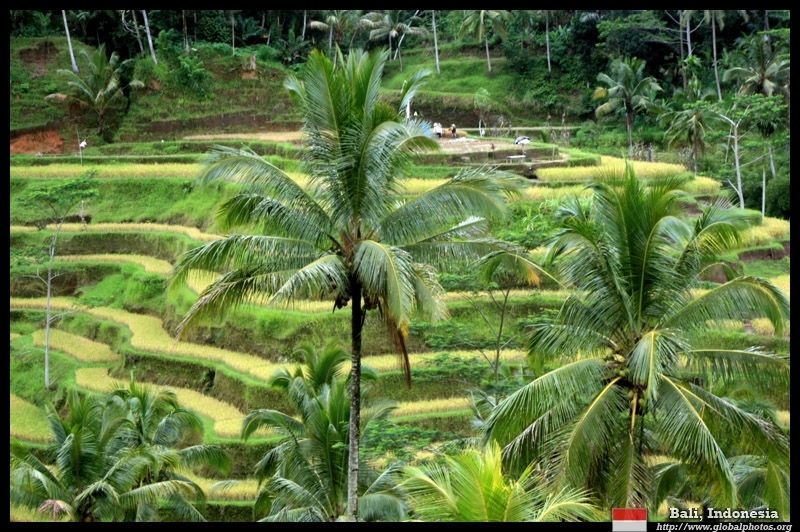 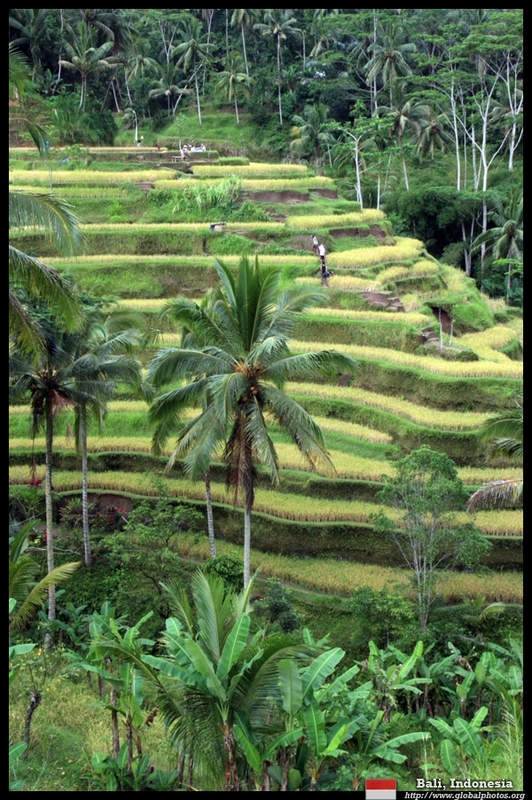 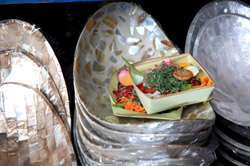 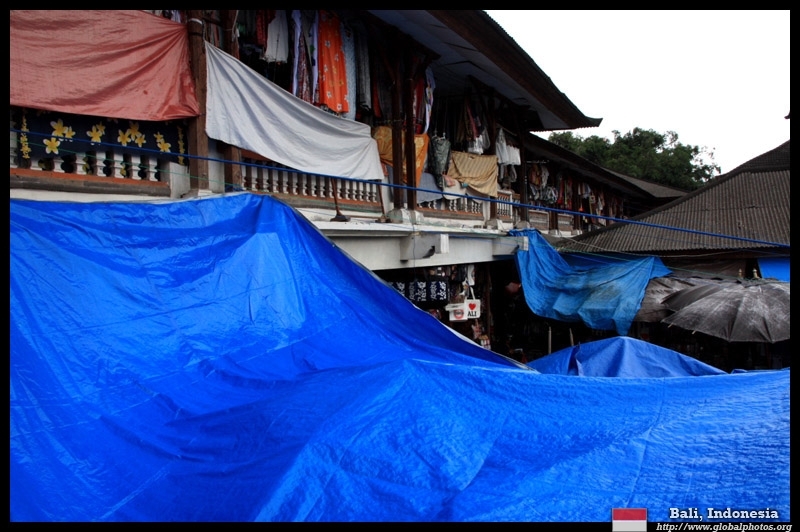 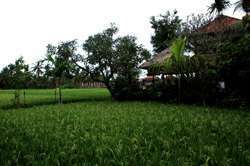 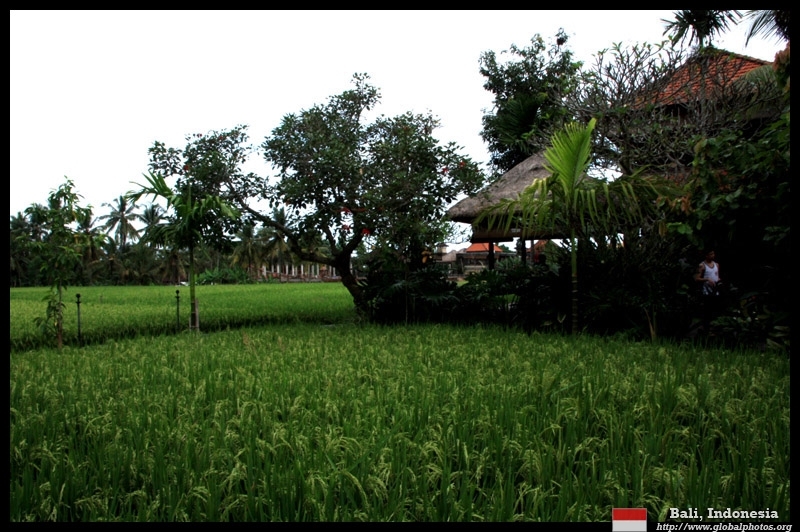 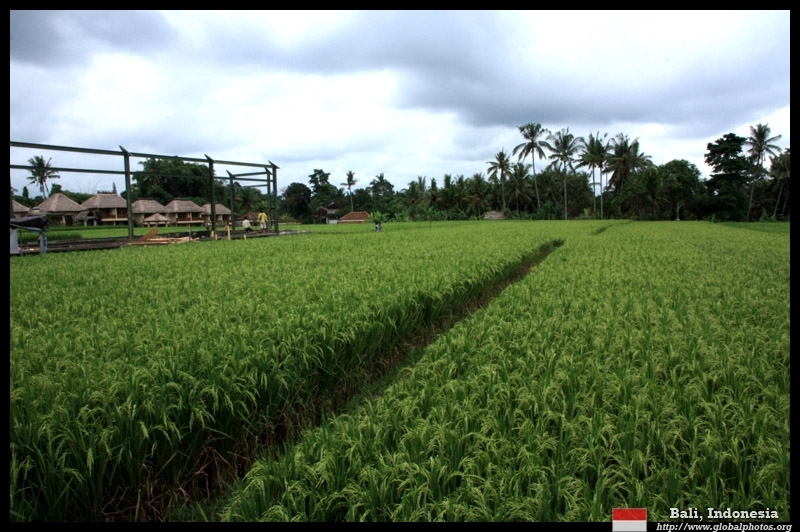 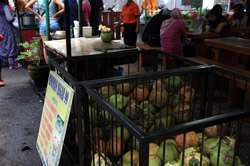 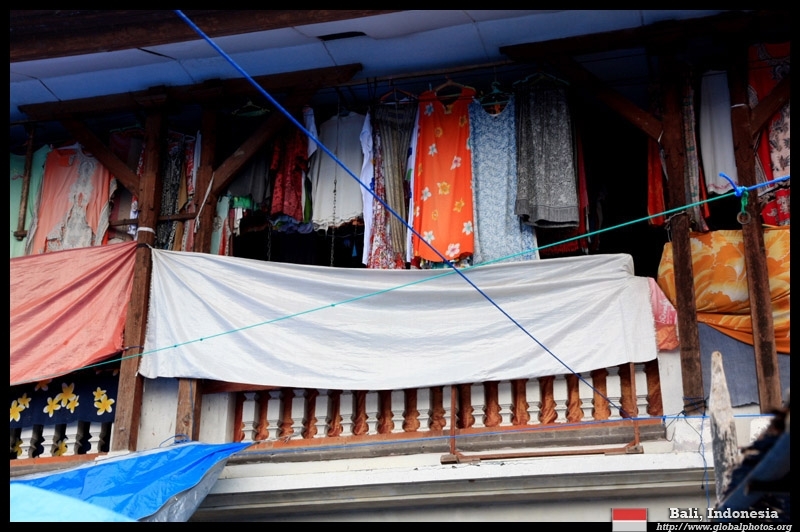 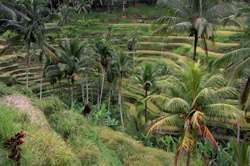 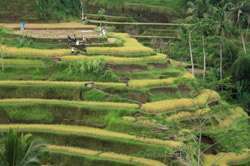 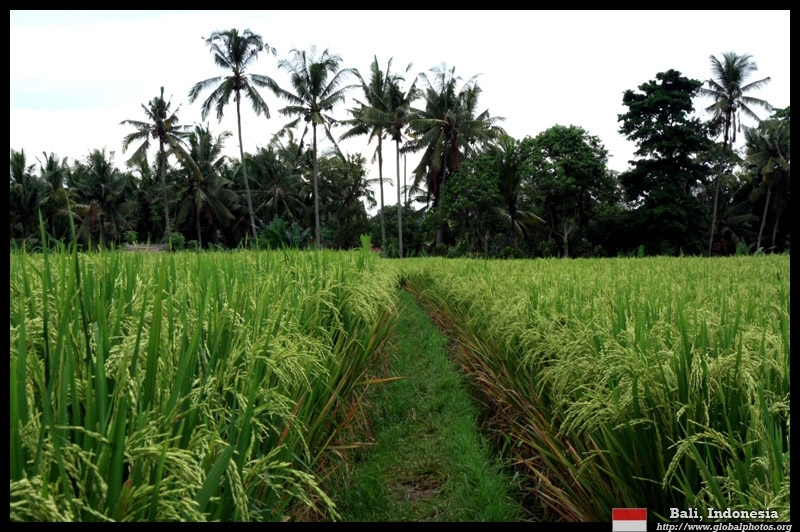 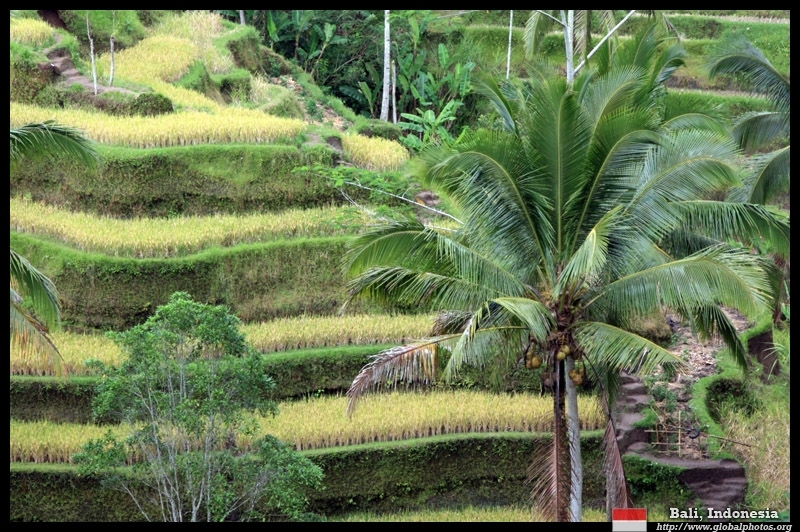 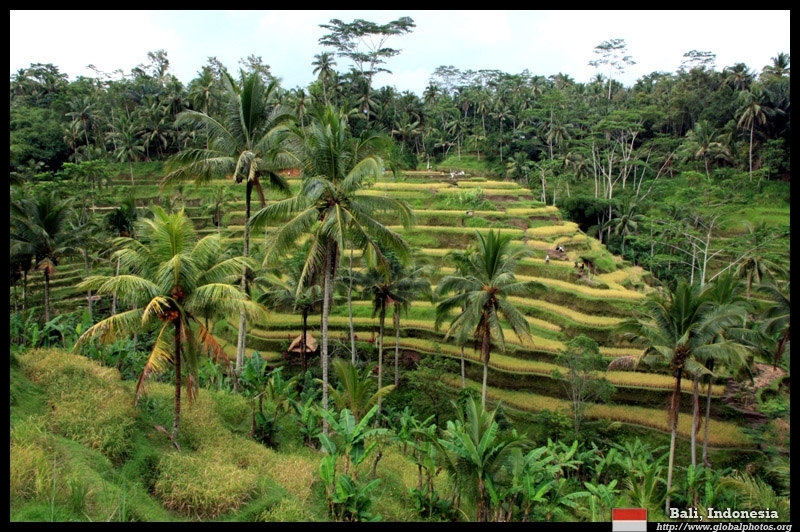 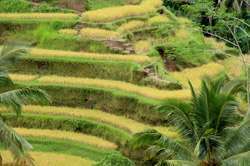 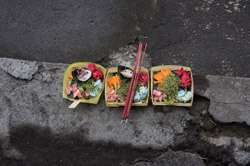 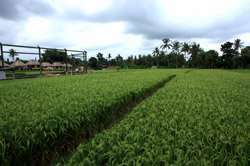 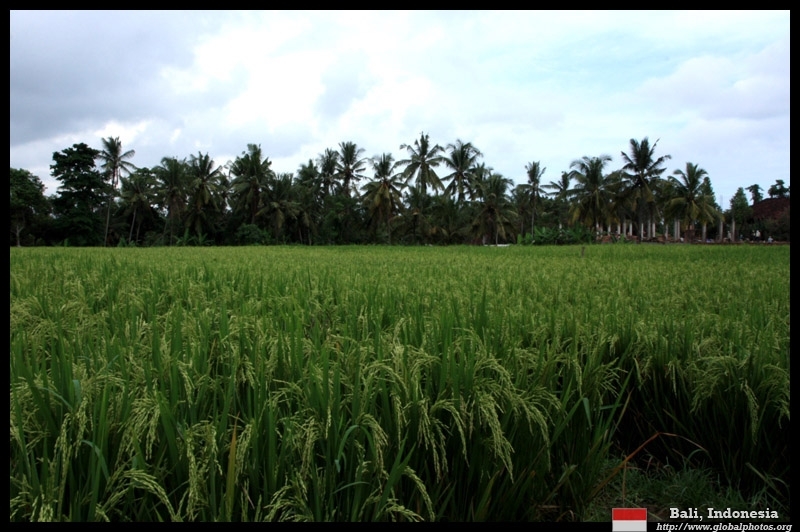 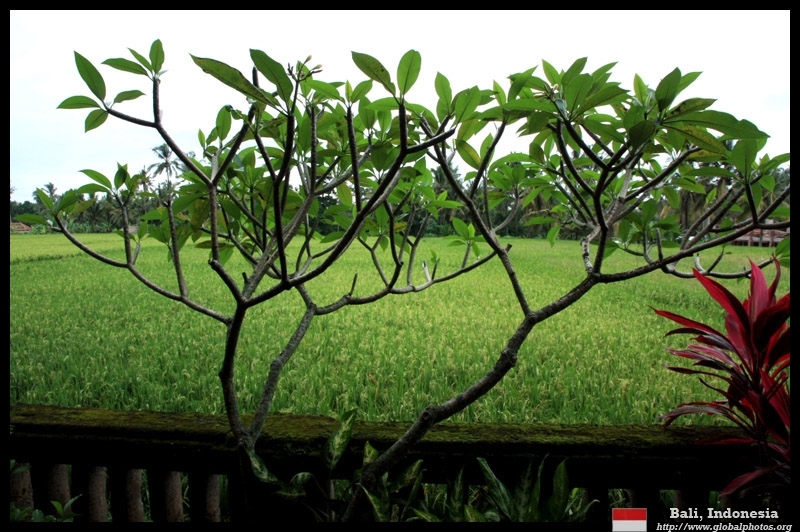 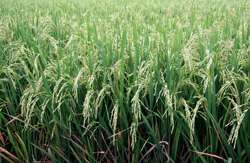 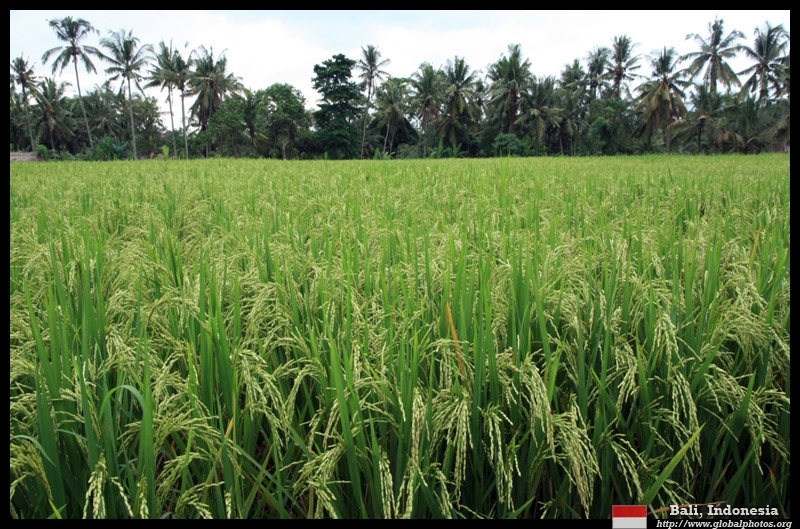 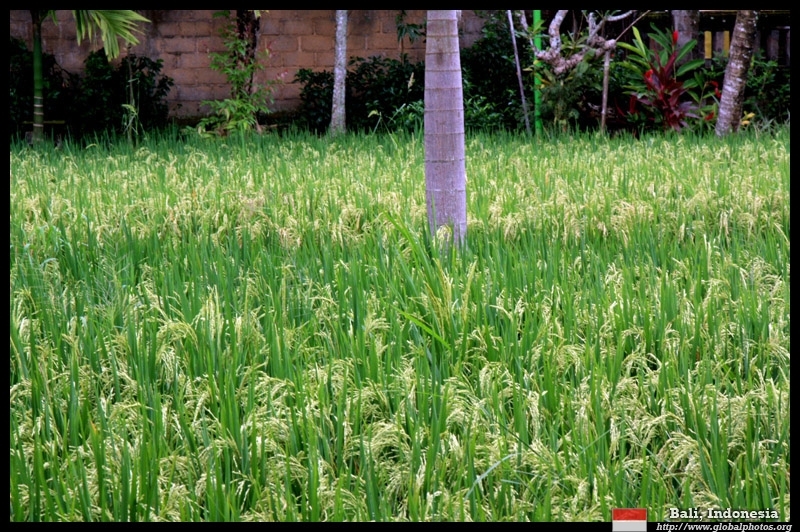 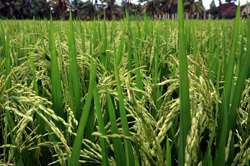 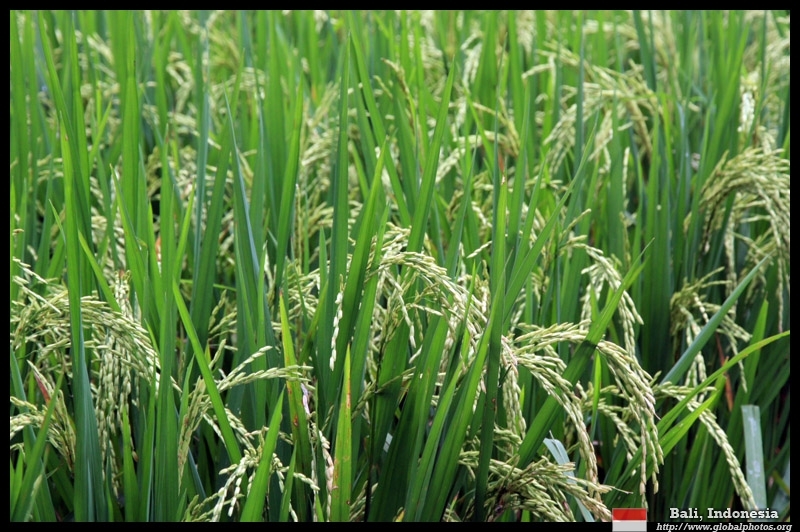 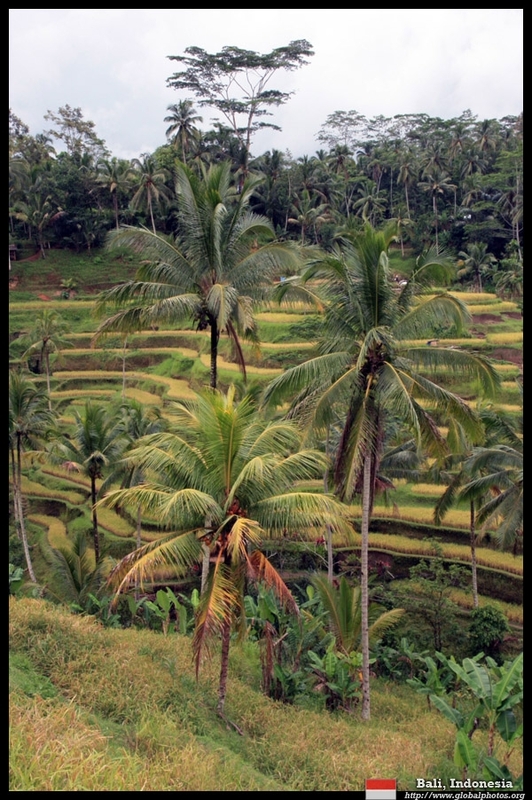 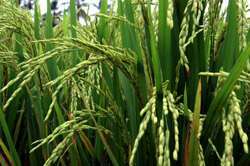 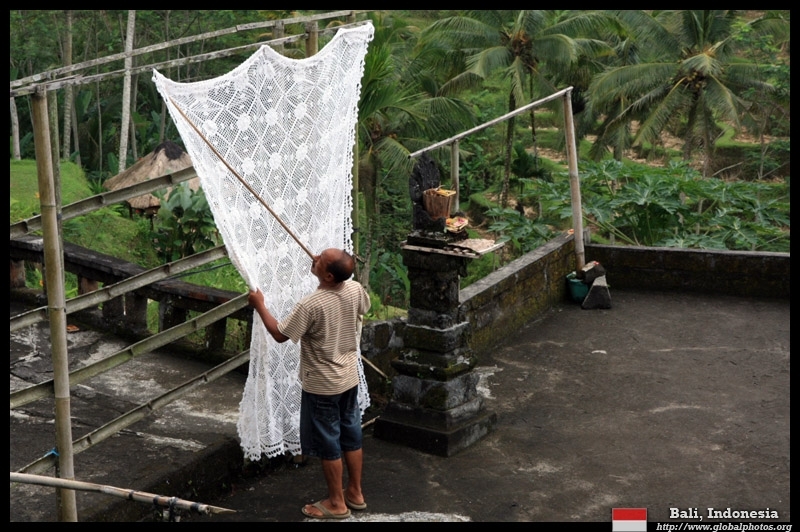 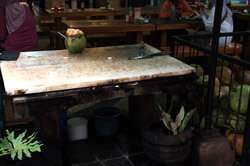 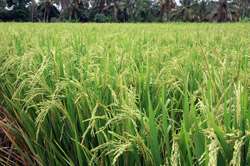 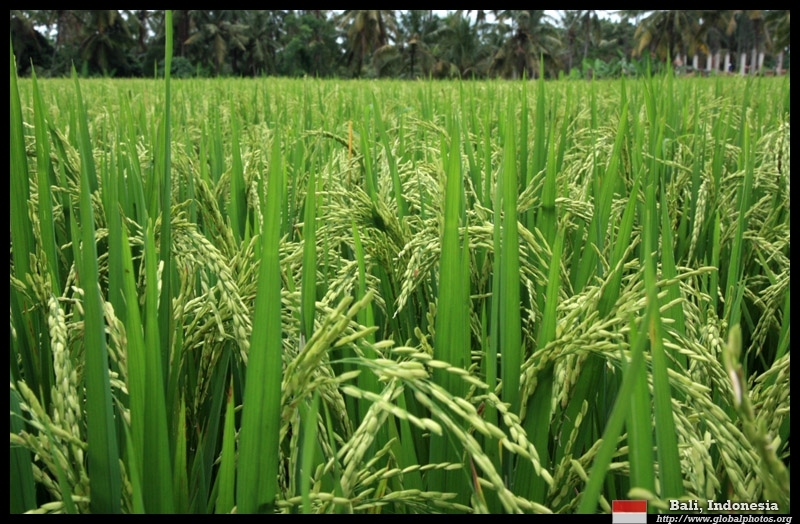 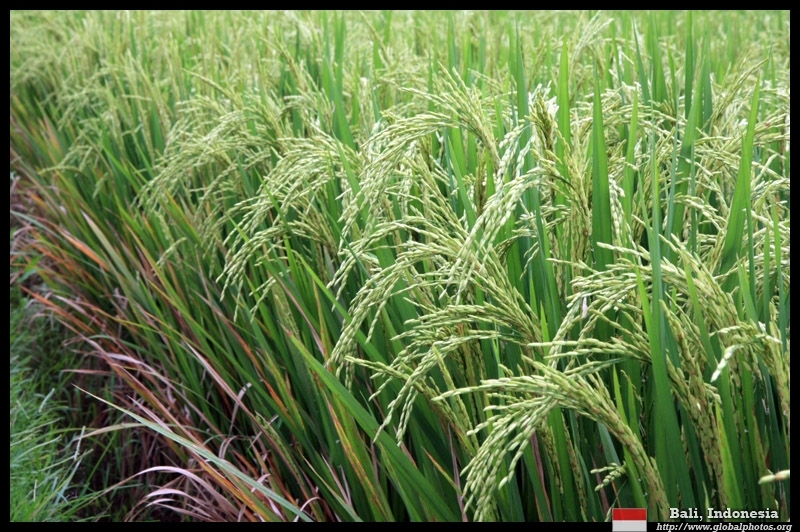 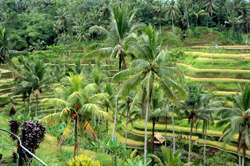 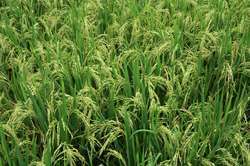 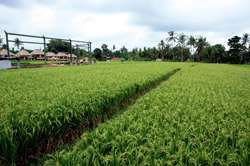 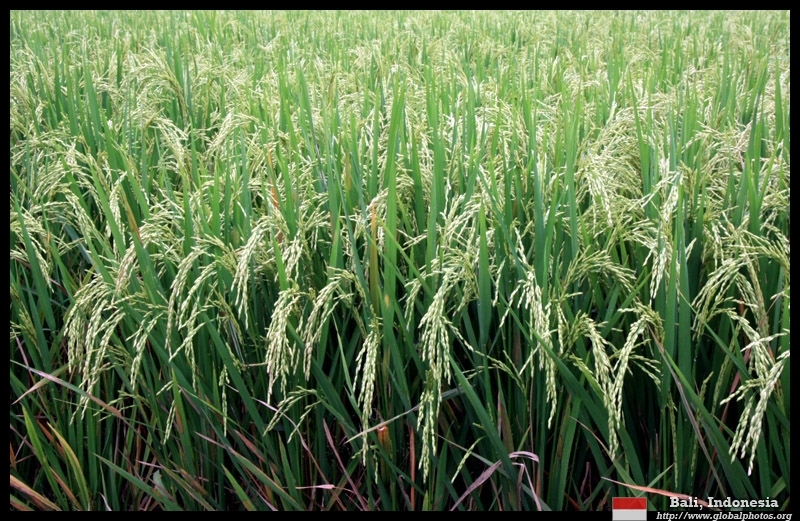 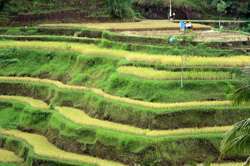 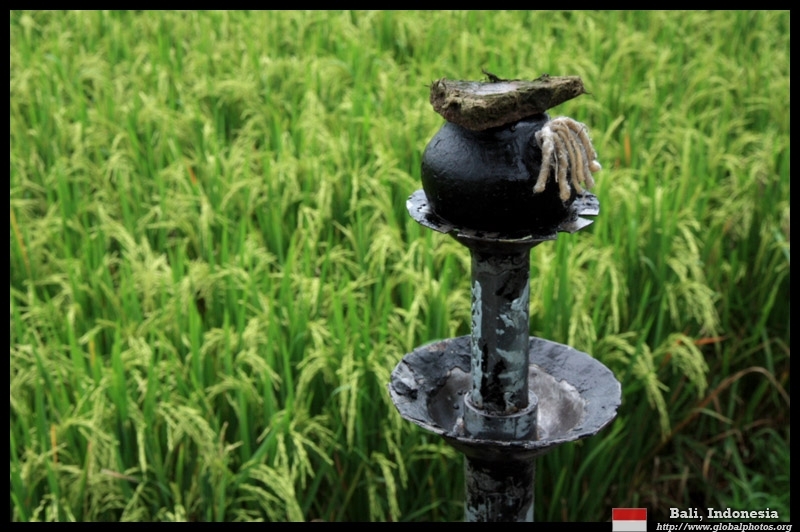 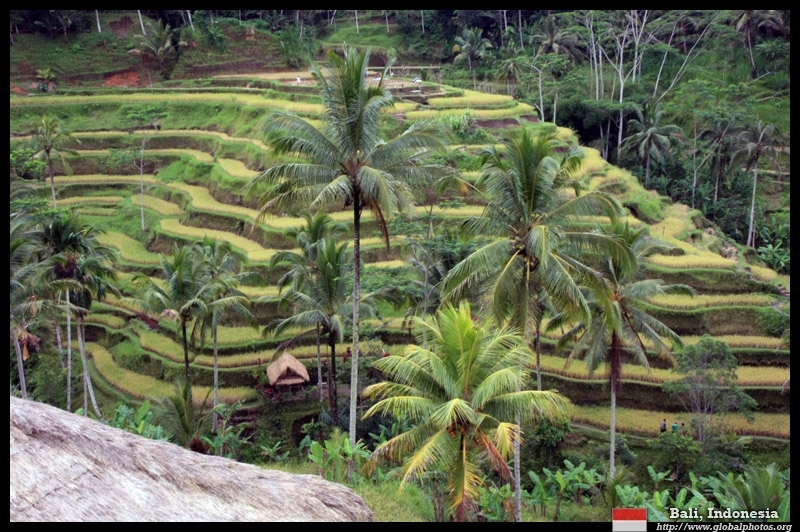 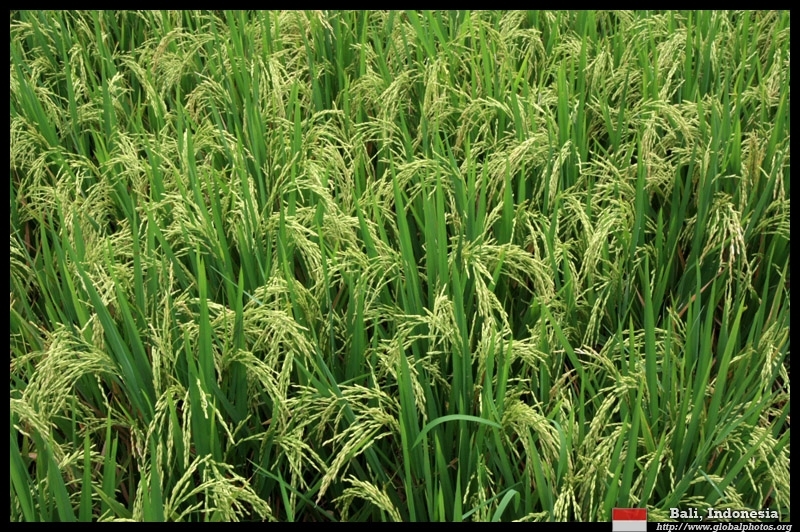 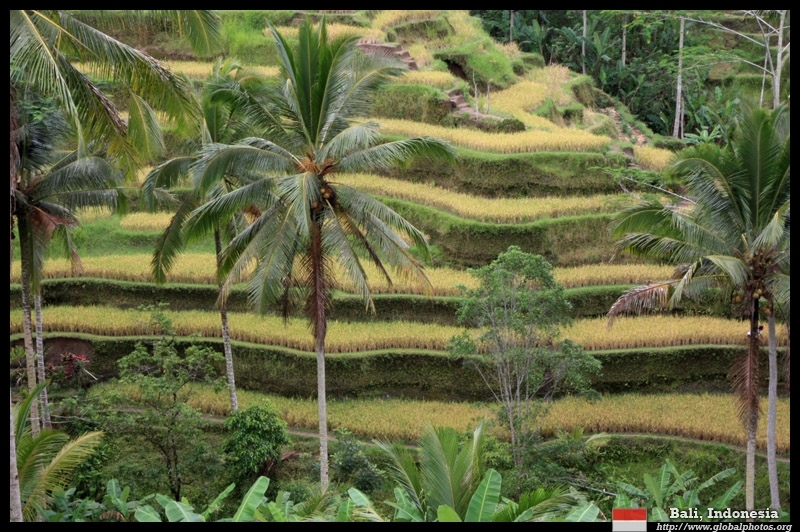 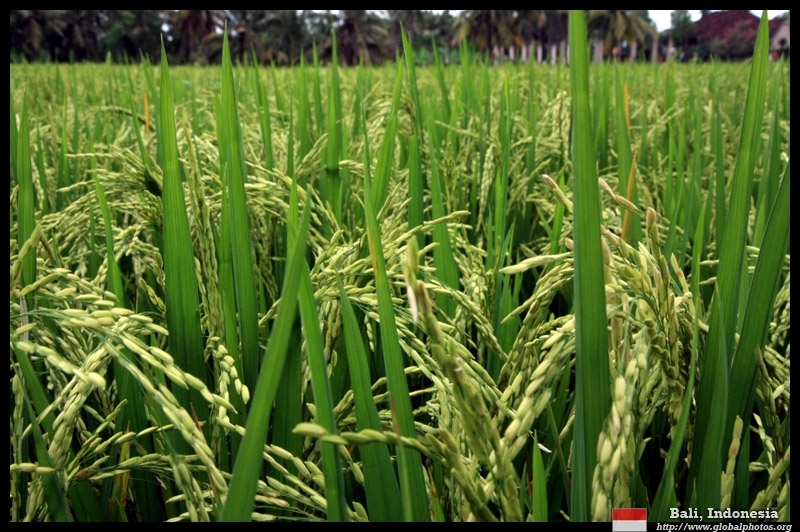 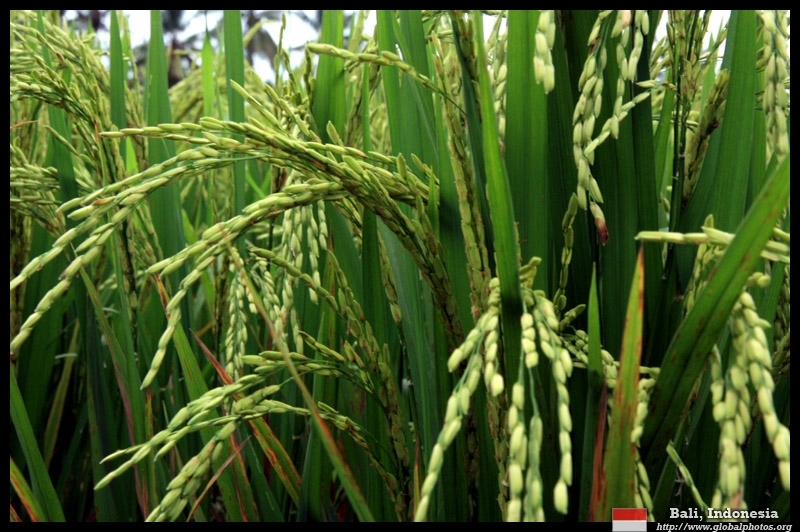 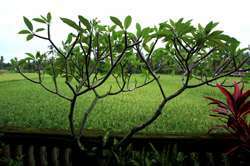 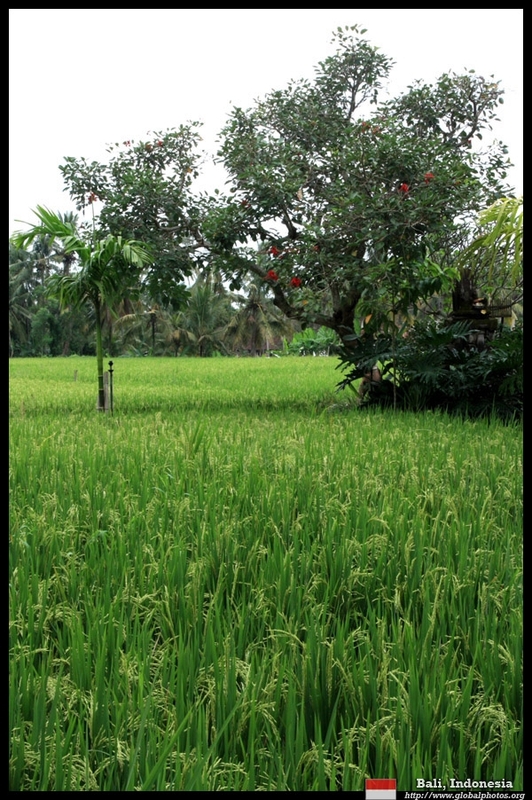 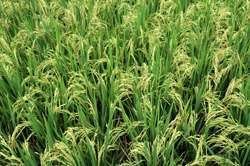 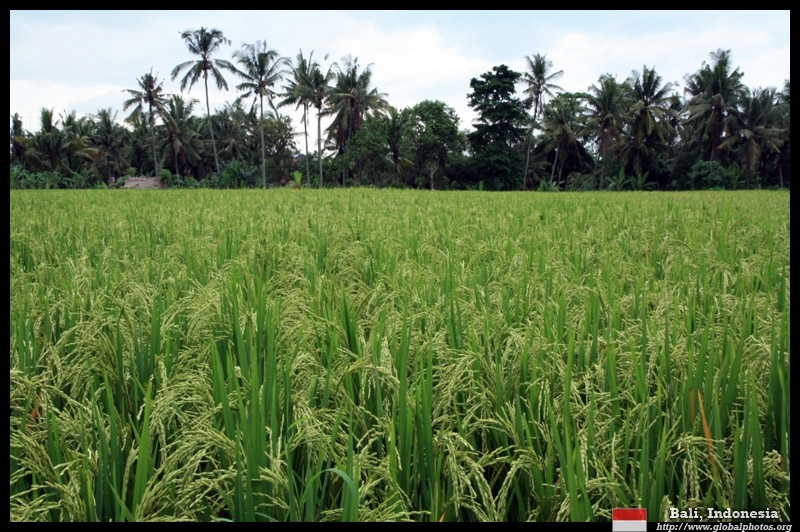 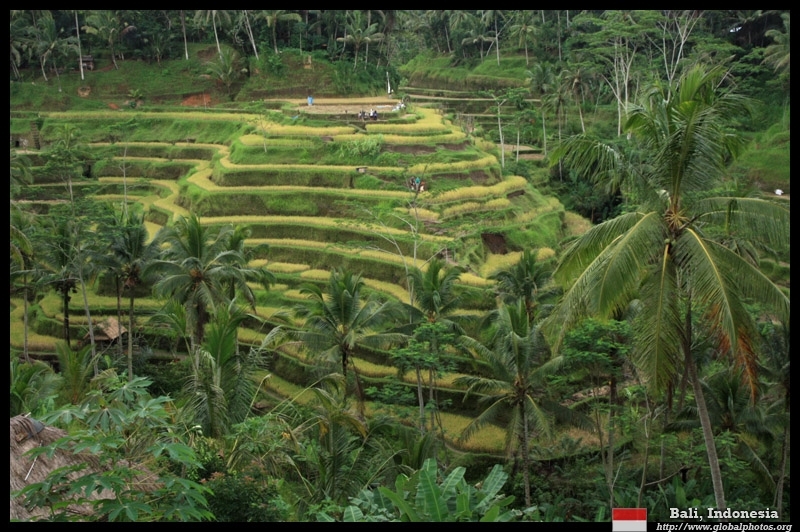 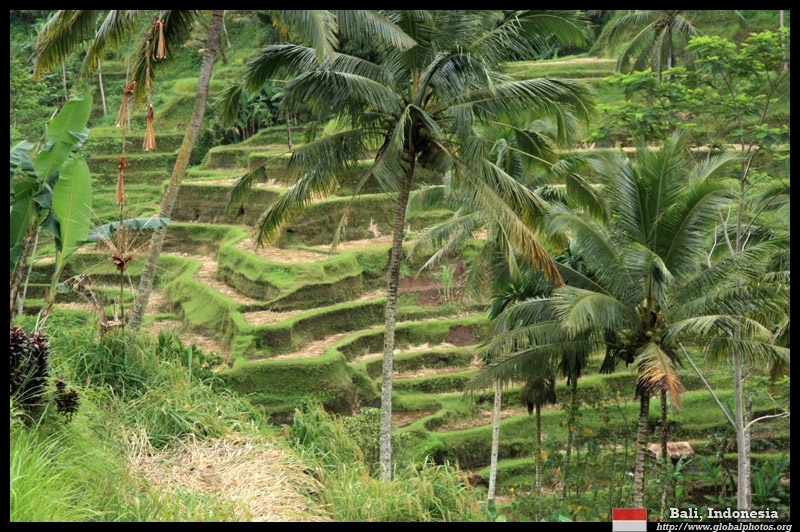 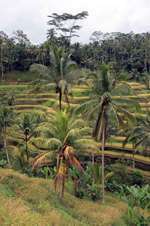 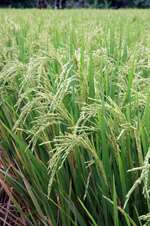 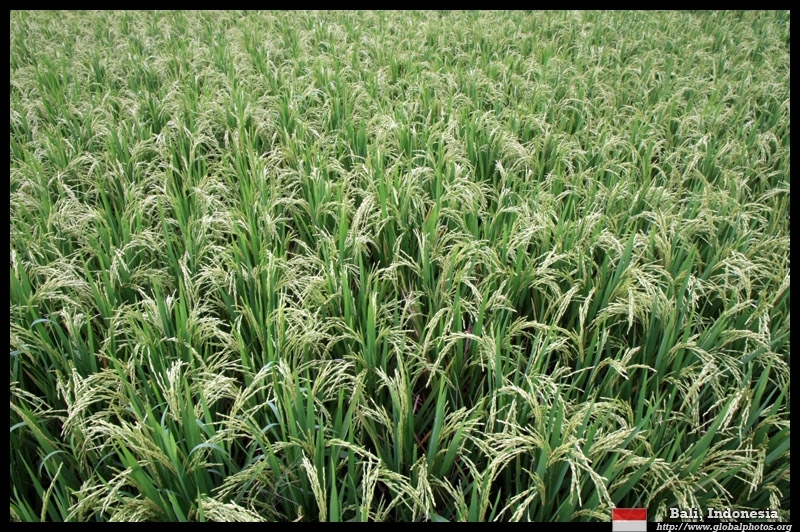 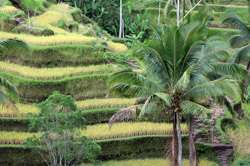 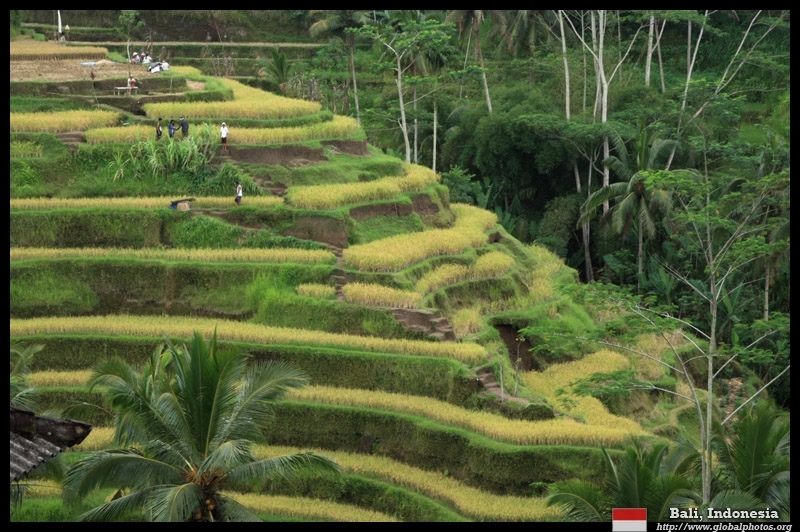 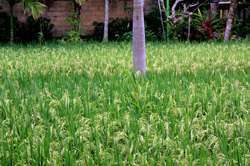 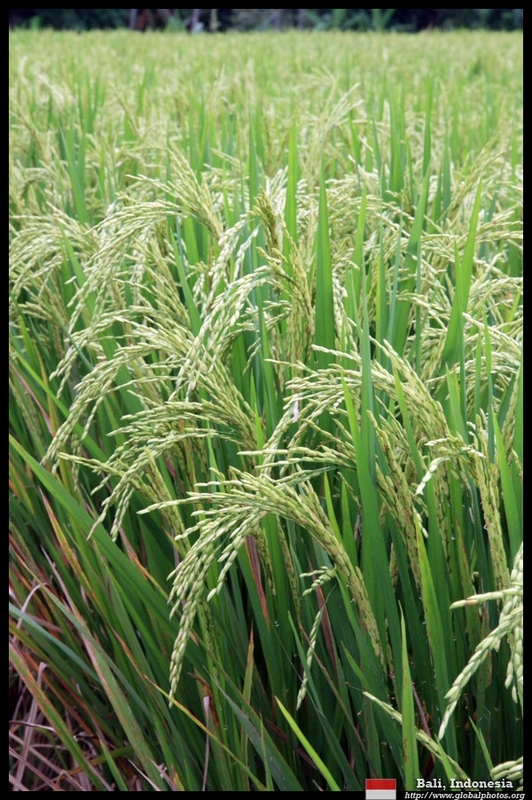 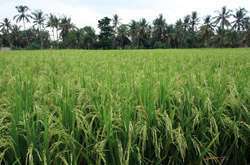 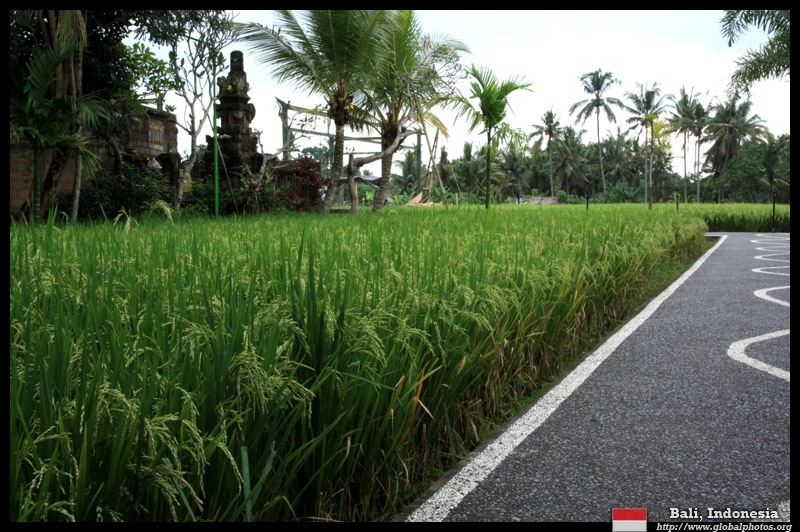 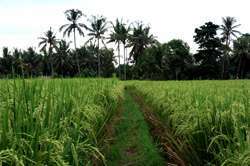 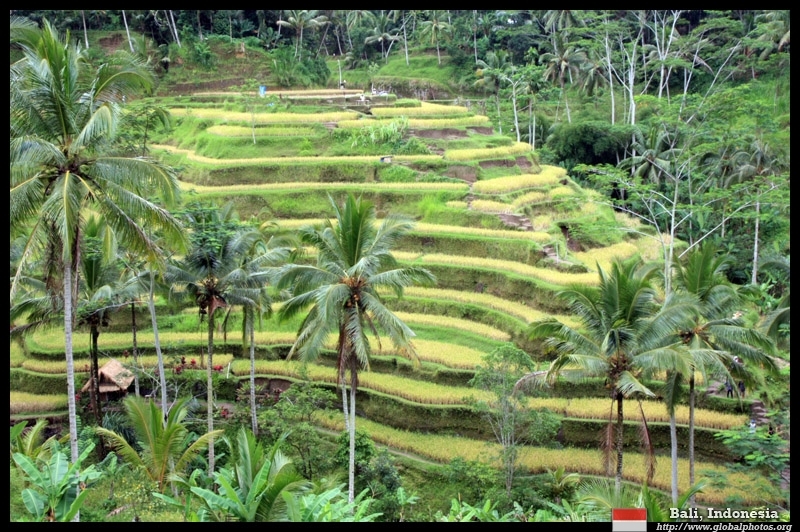 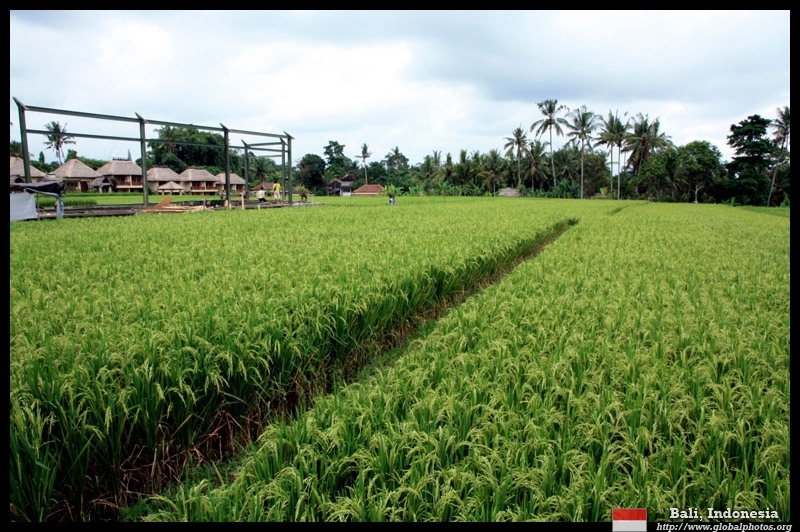 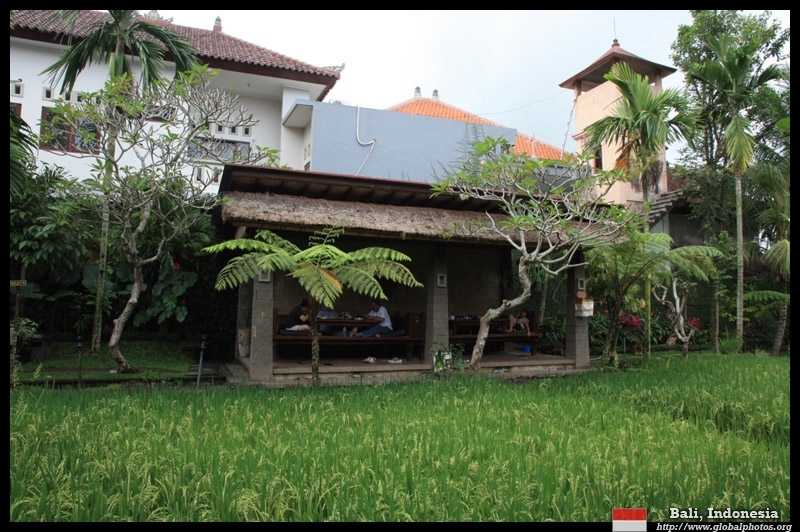 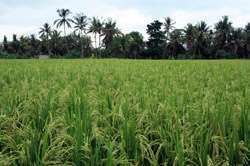 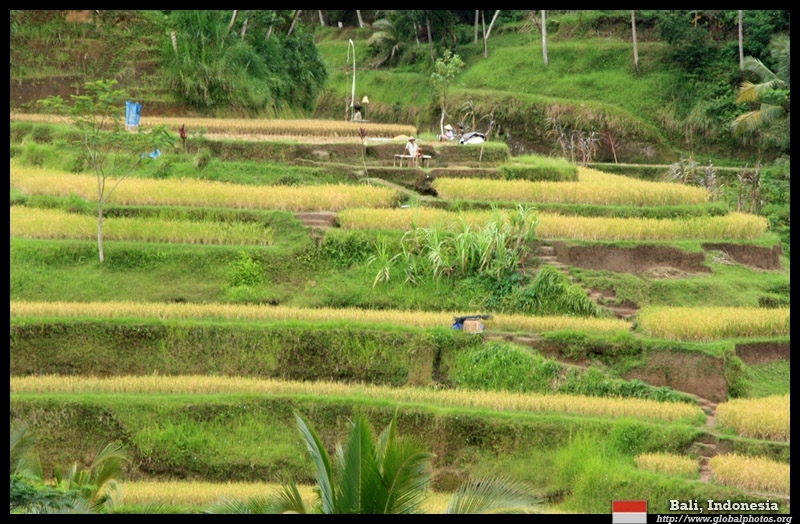 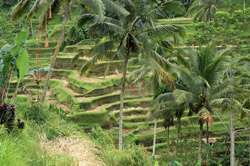 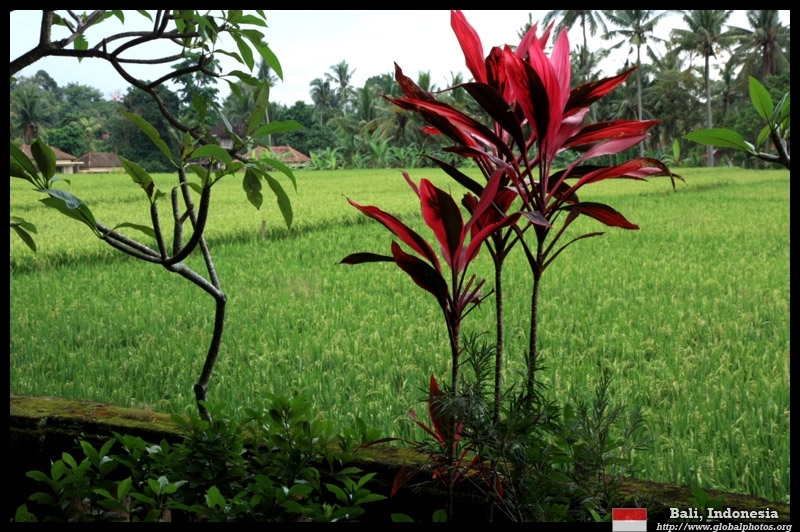 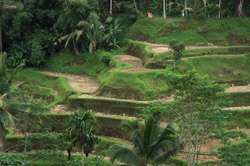 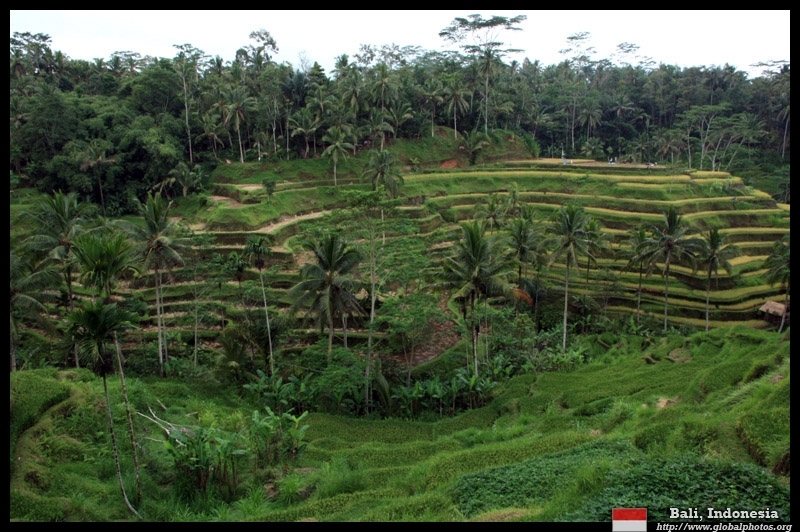 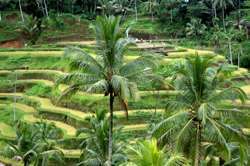 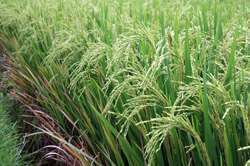 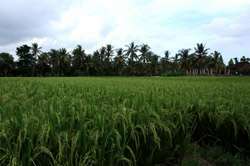 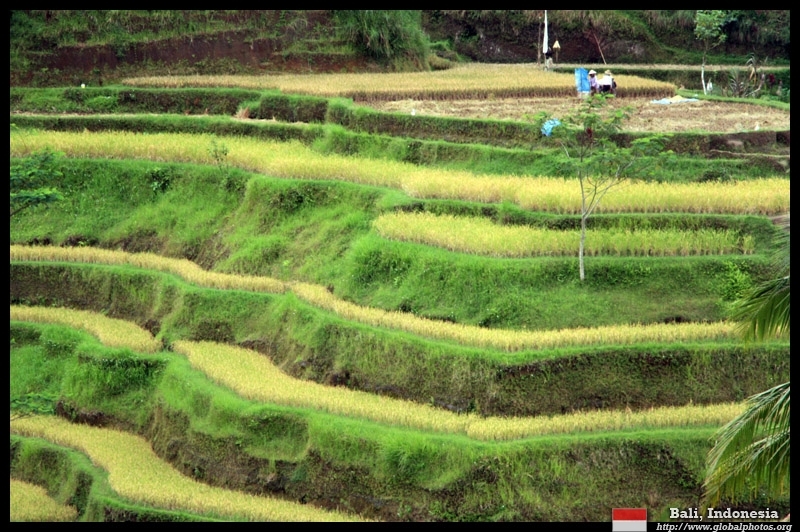 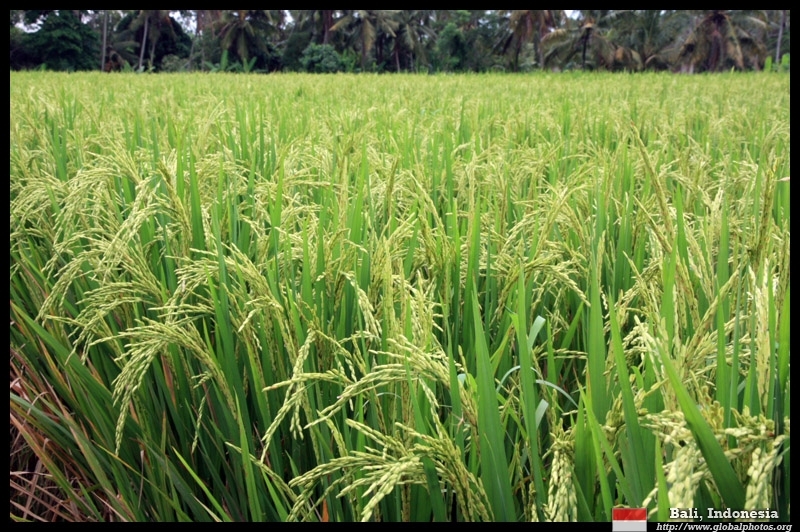 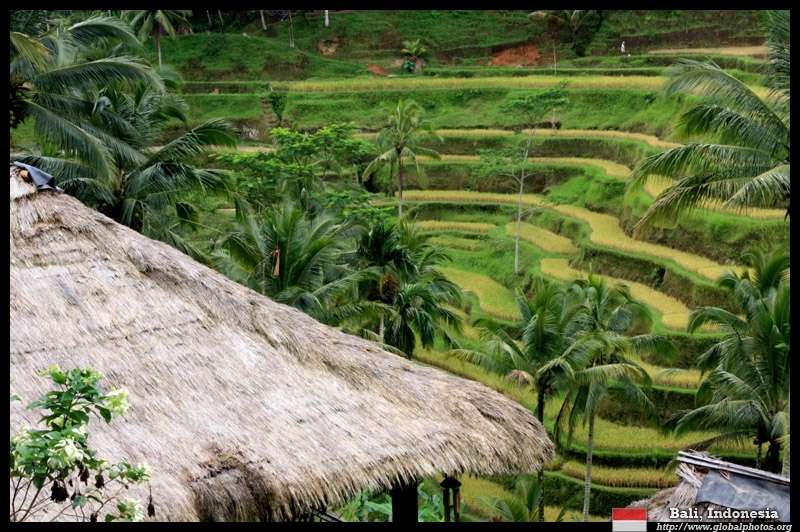 With ample tropical moisture, Bali farmers can squeeze 2 rice crops a year. 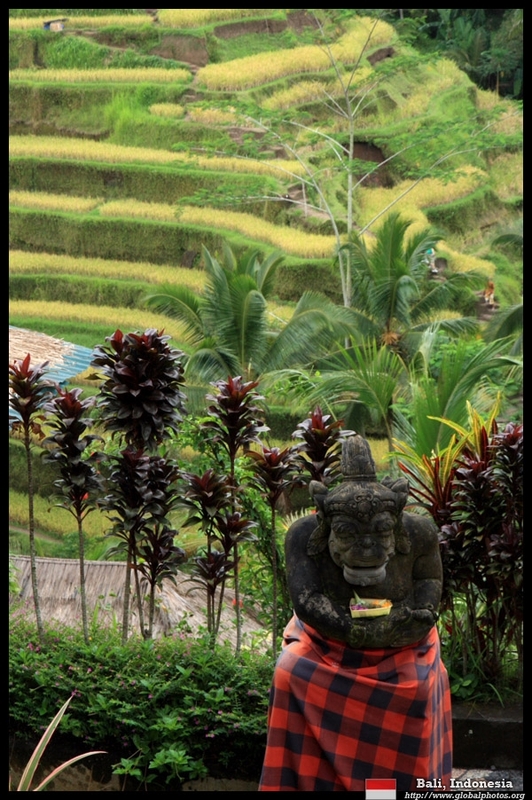 A little money earns a photo-op. 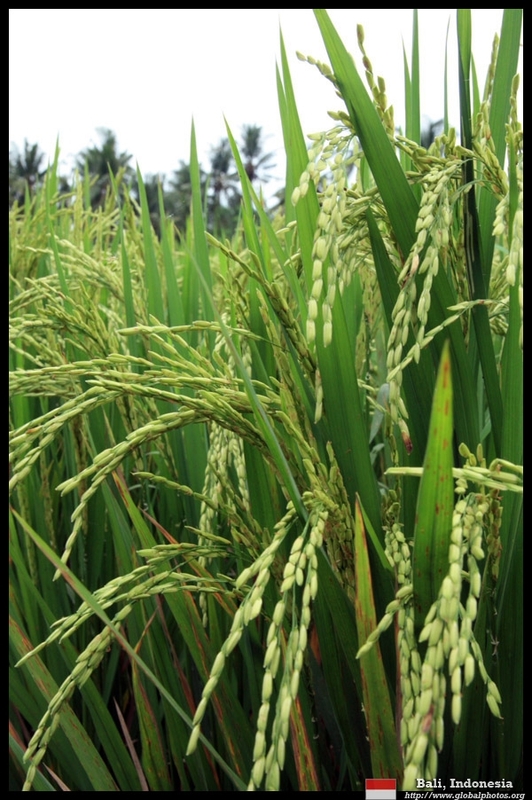 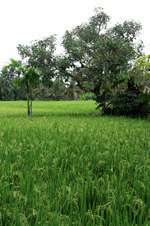 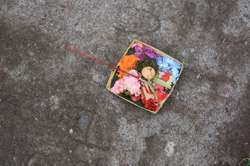 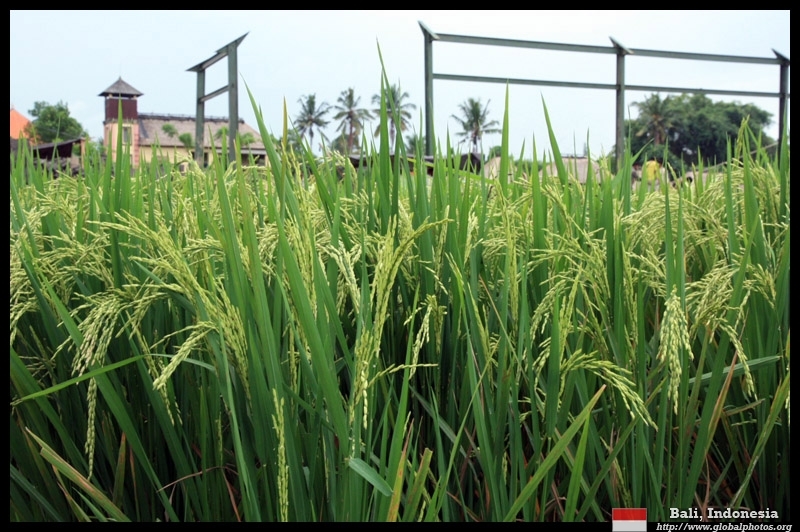 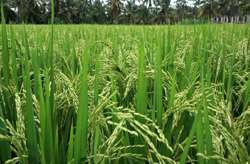 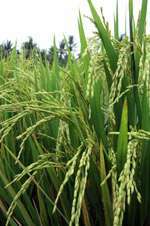 Back on level land, rice grows in flooded soil. 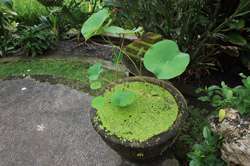 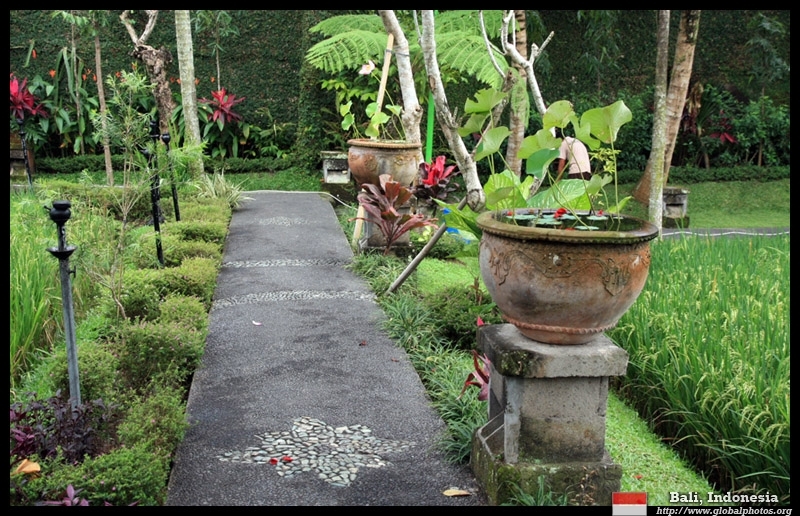 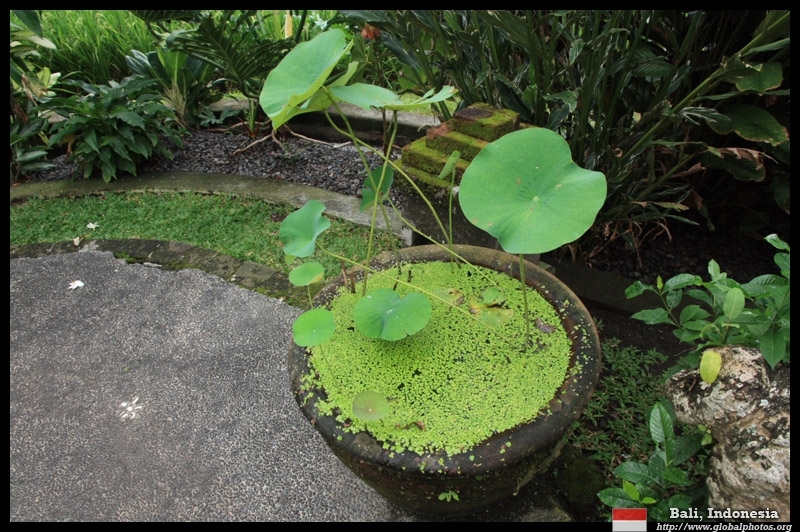 The plants in aggregate hide the fact that the soil beneath is wet and treacherous. 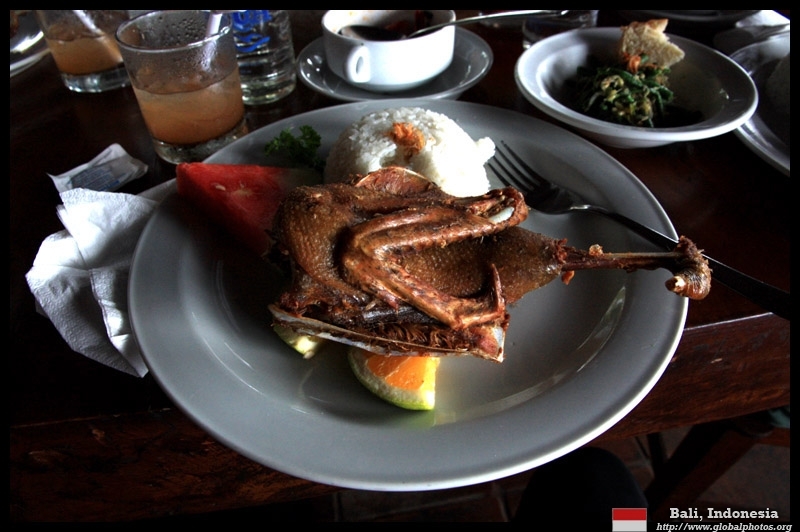 Enjoying this "dirty" duck at a fancy restaurant while watching the rice field next door. 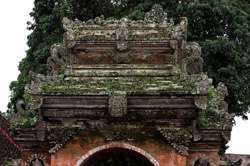 The palace is apparently still inhabited by the local royal clan, although I don't think I came across them during my visit. 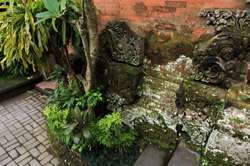 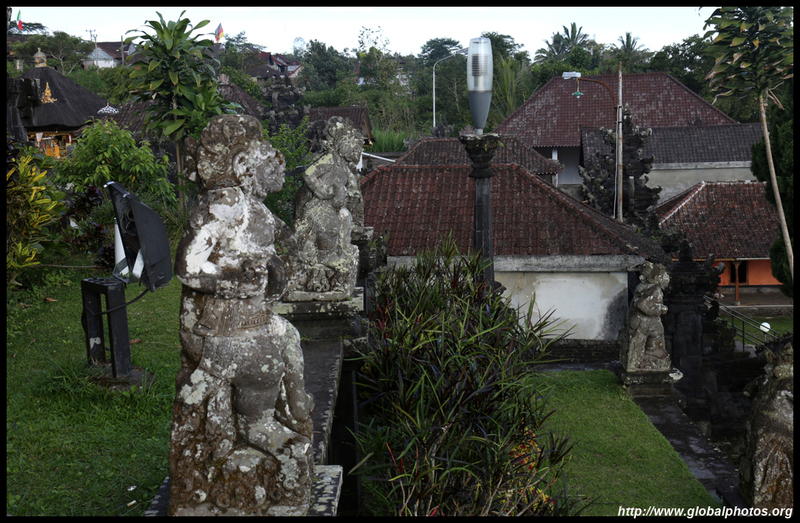 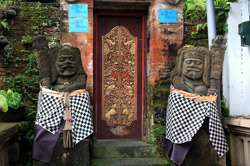 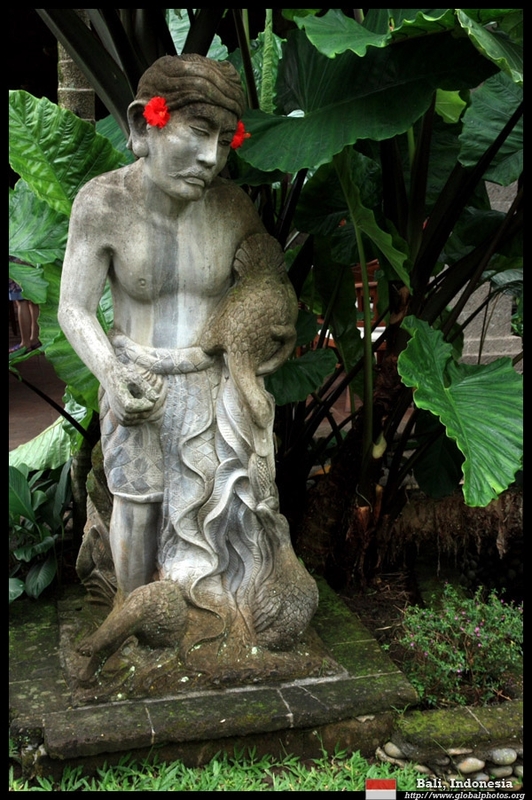 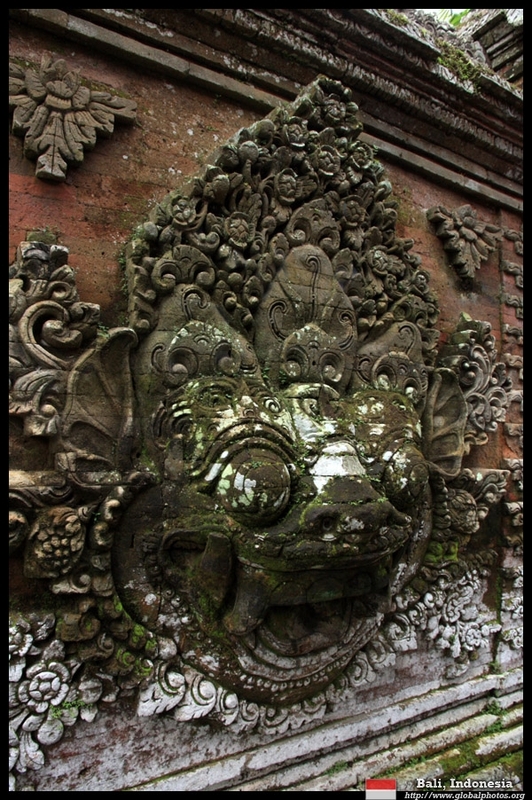 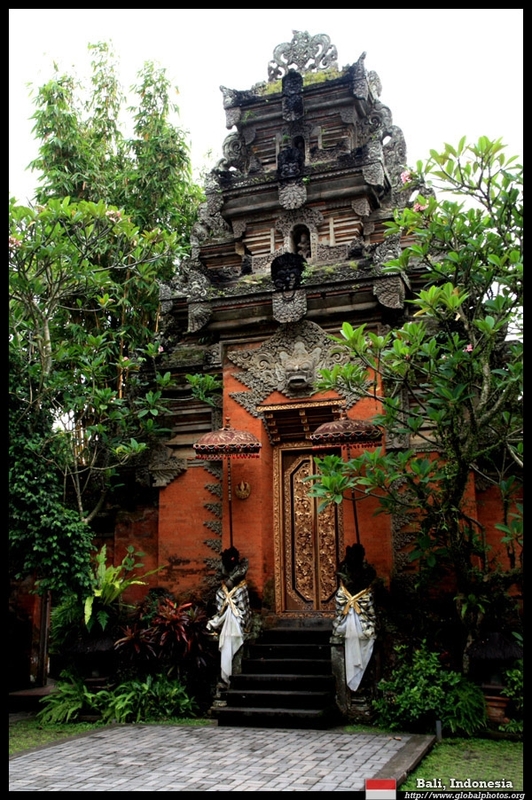 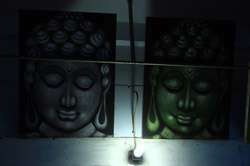 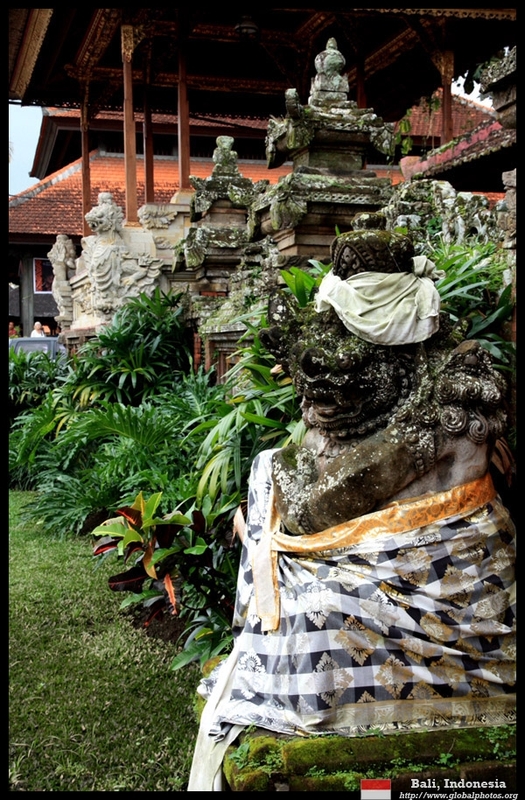 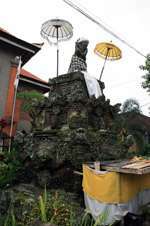 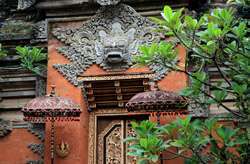 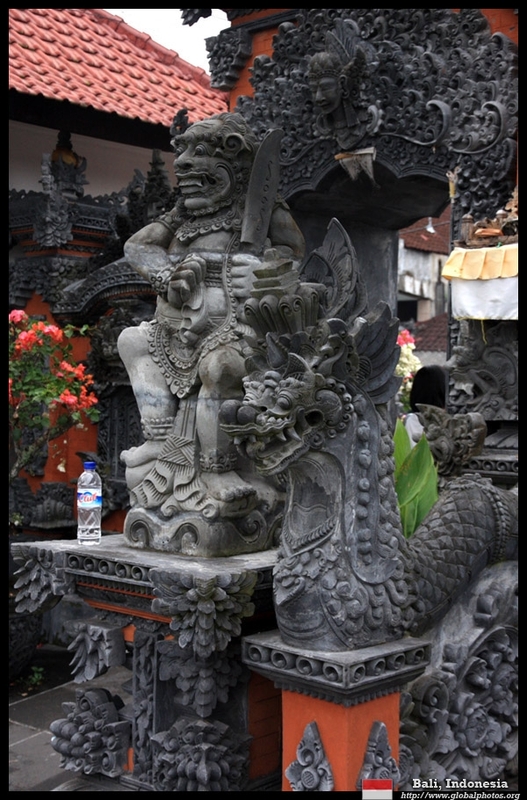 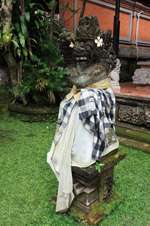 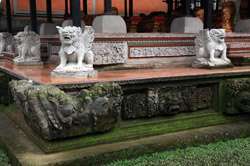 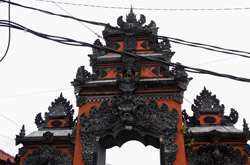 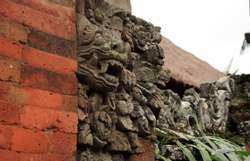 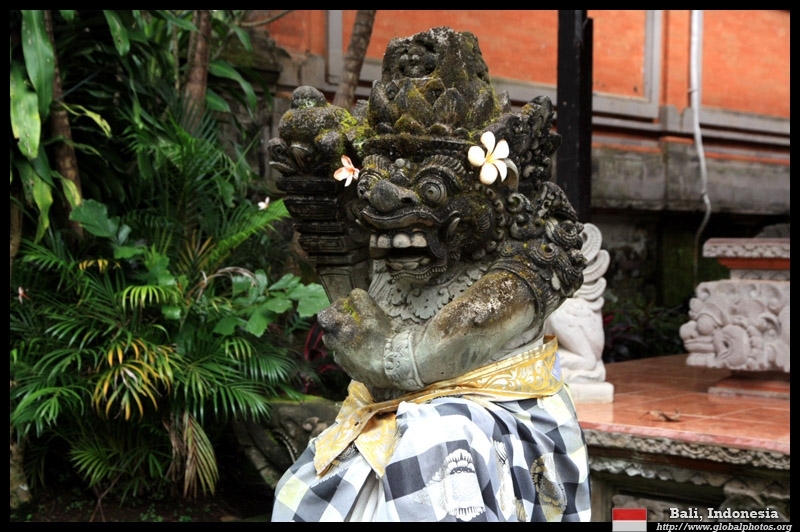 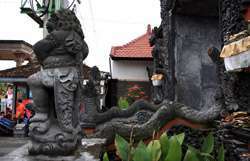 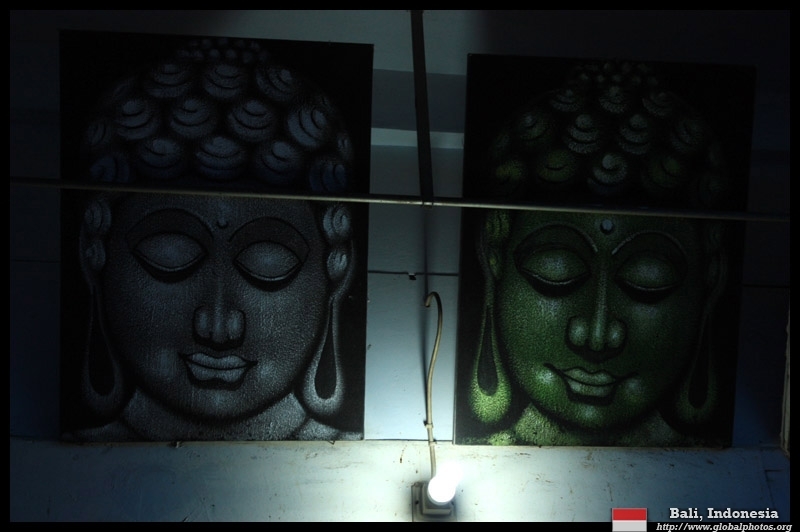 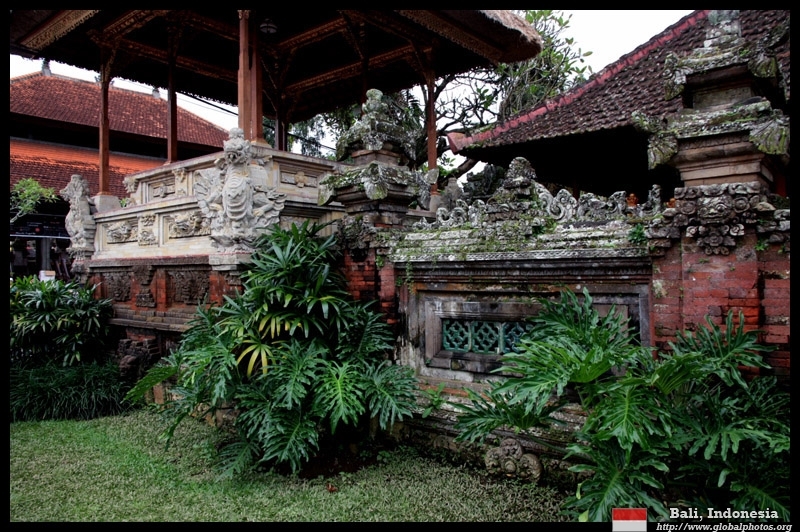 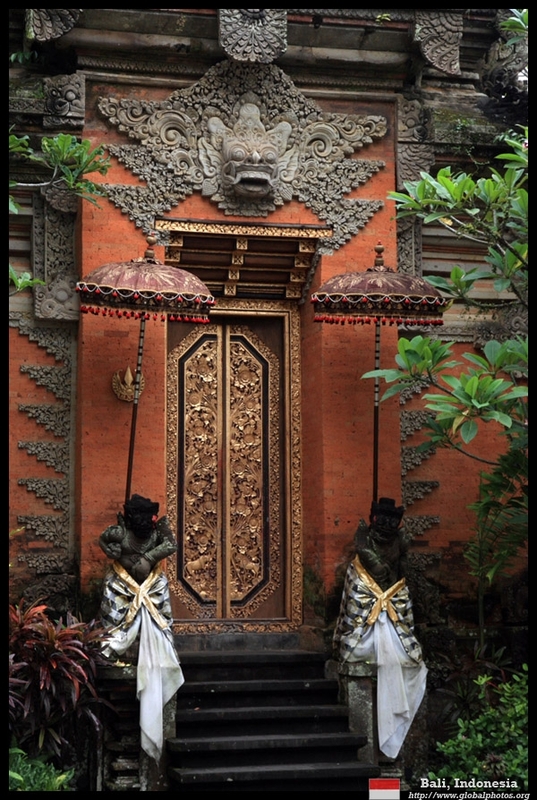 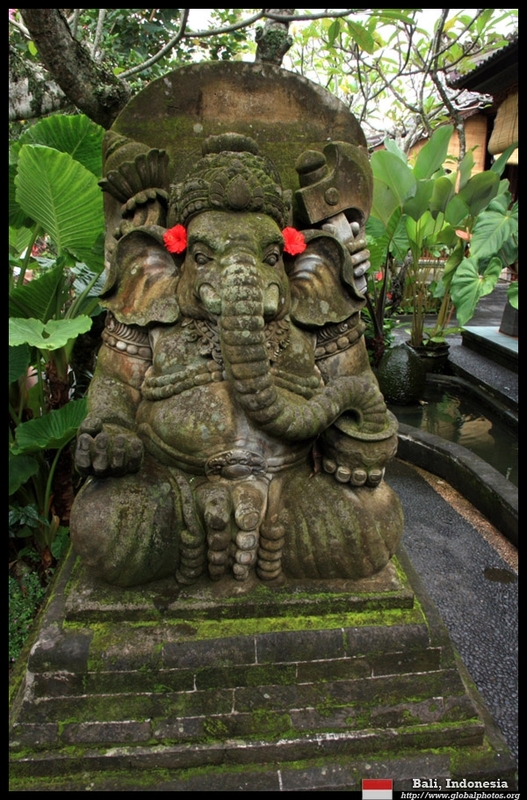 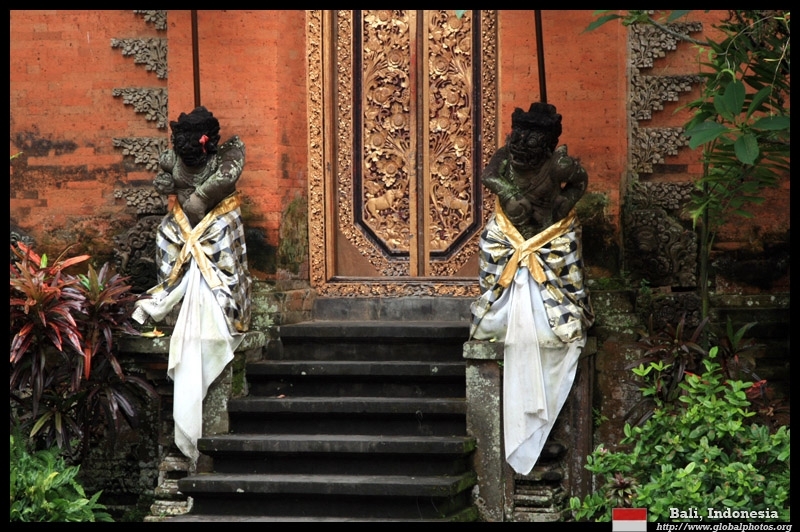 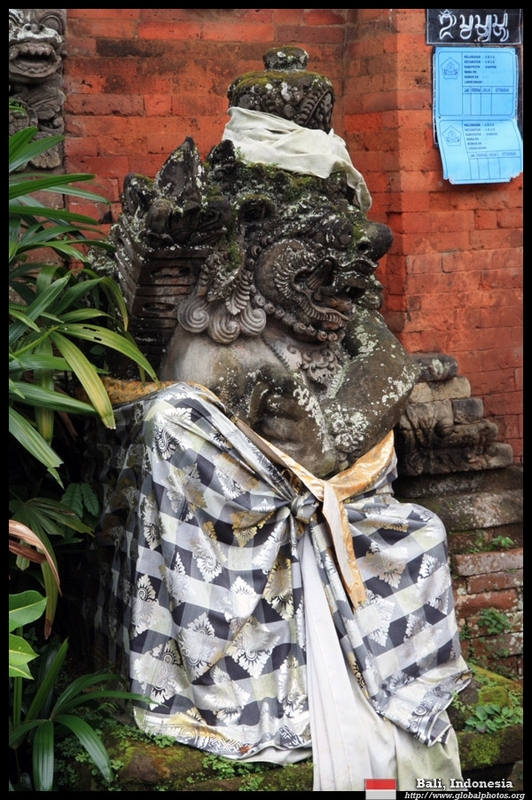 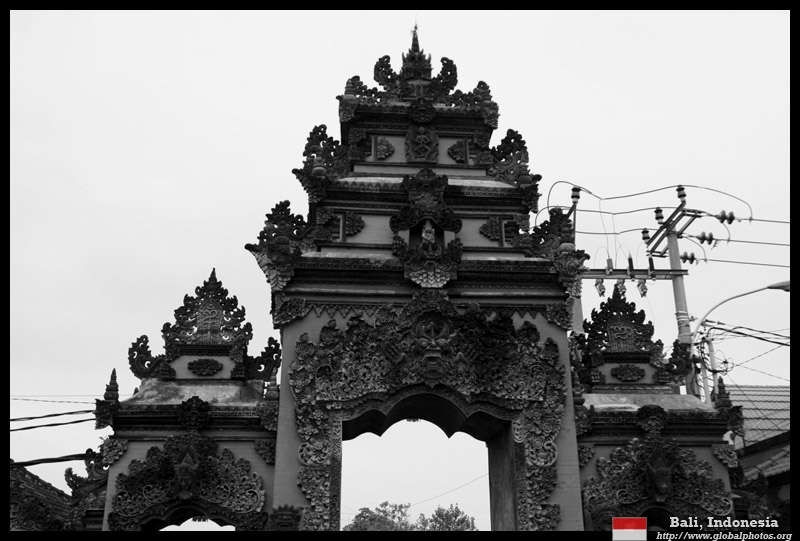 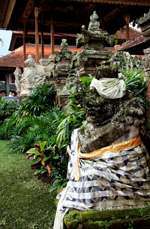 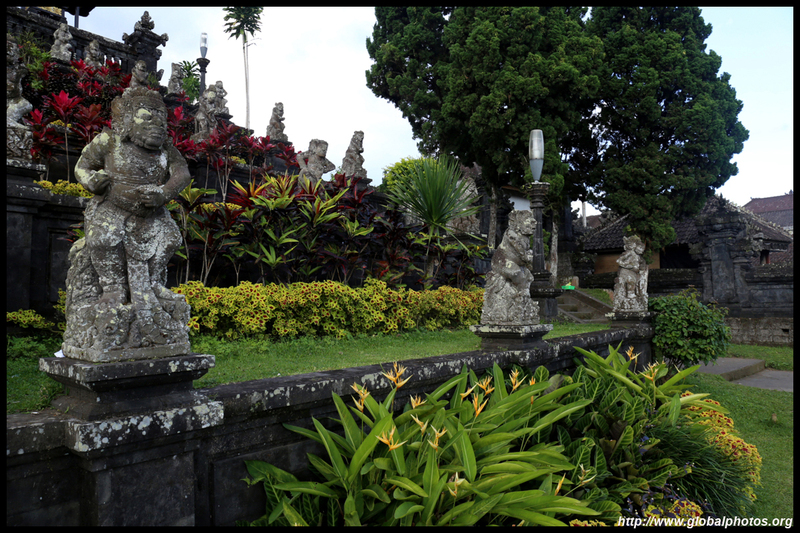 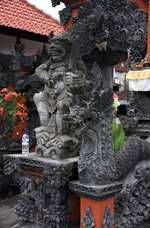 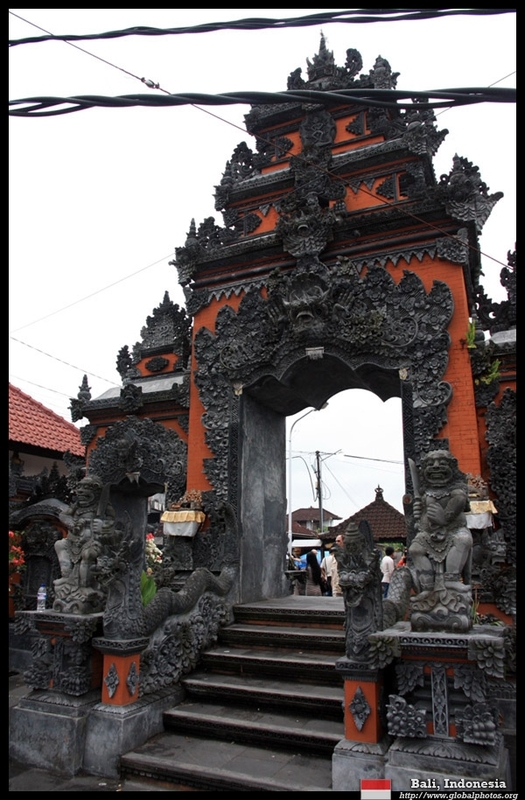 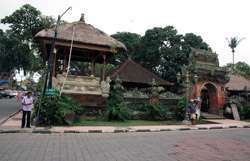 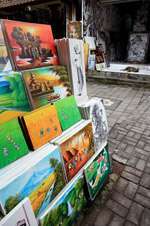 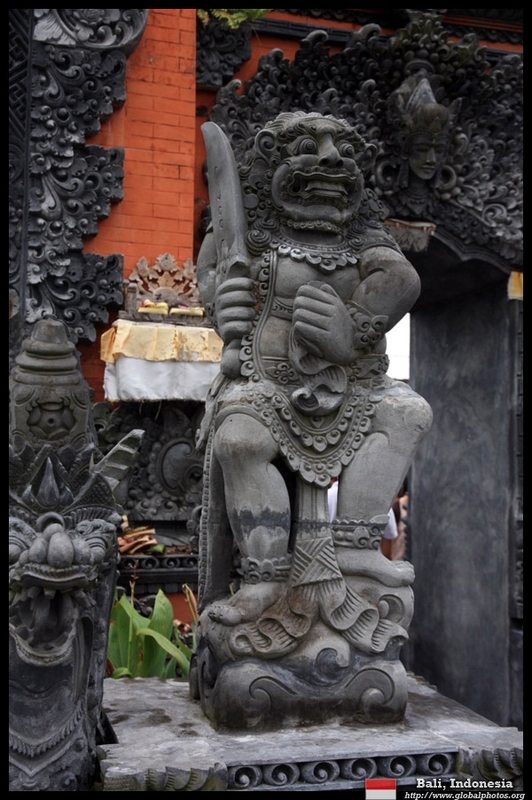 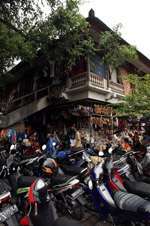 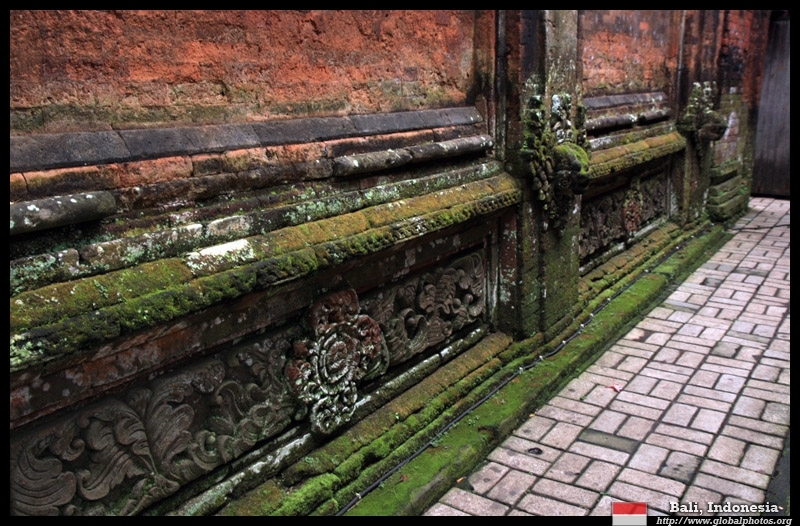 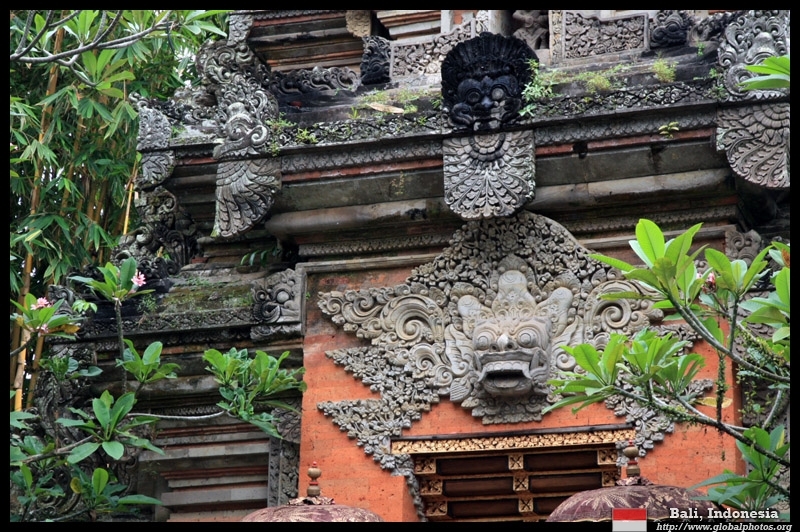 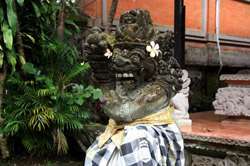 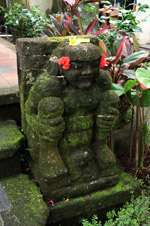 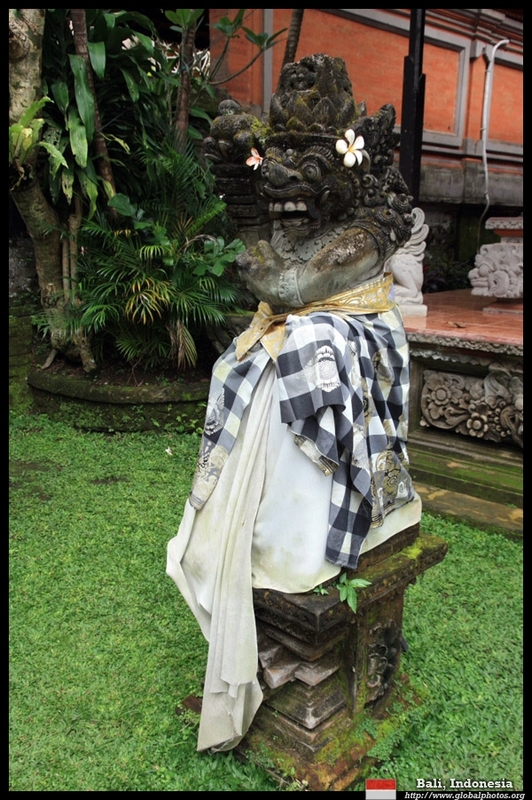 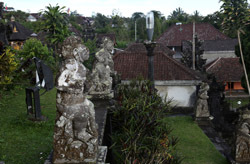 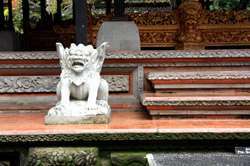 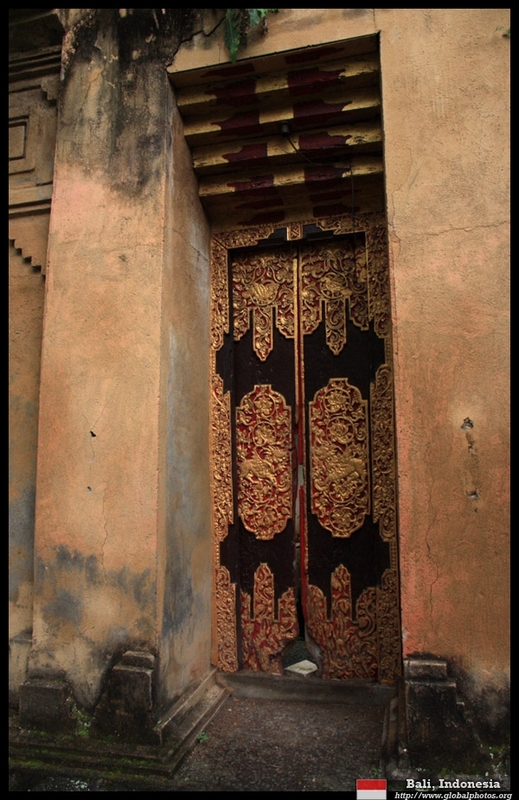 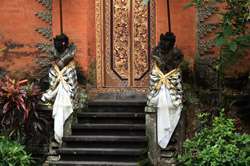 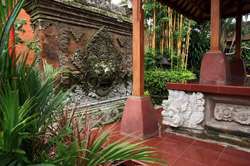 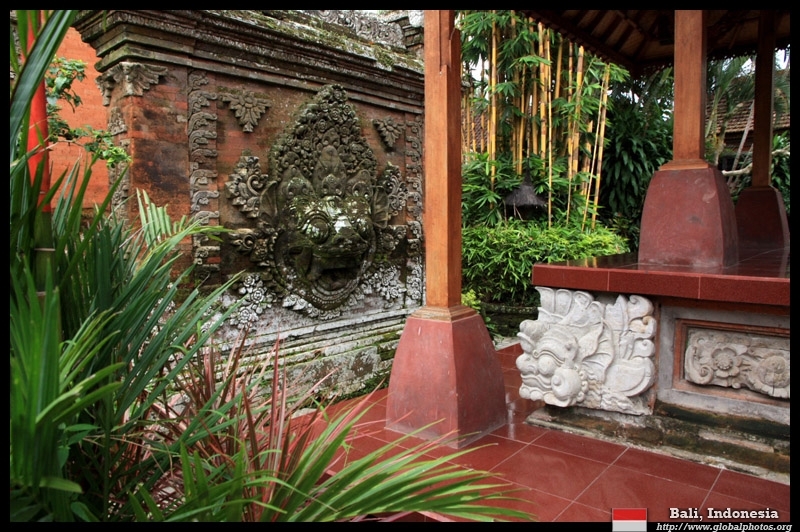 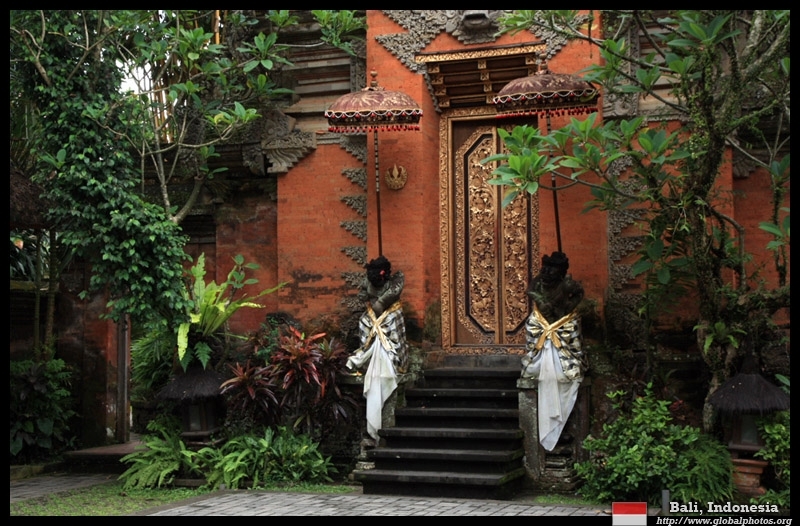 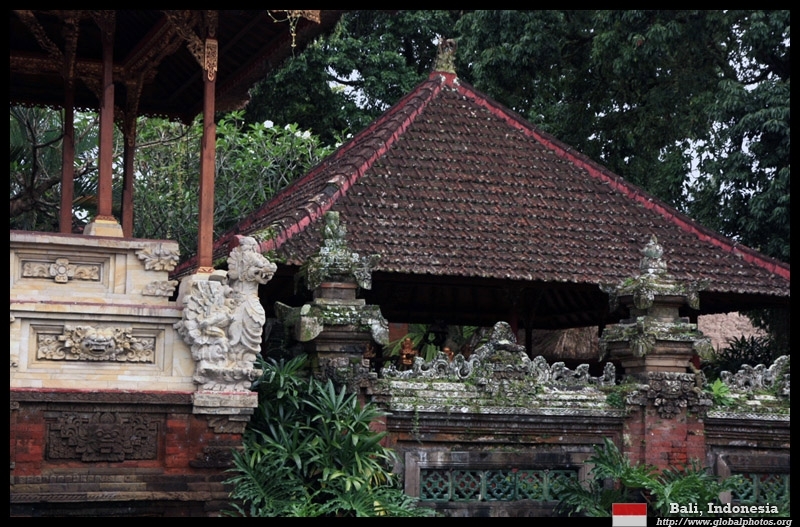 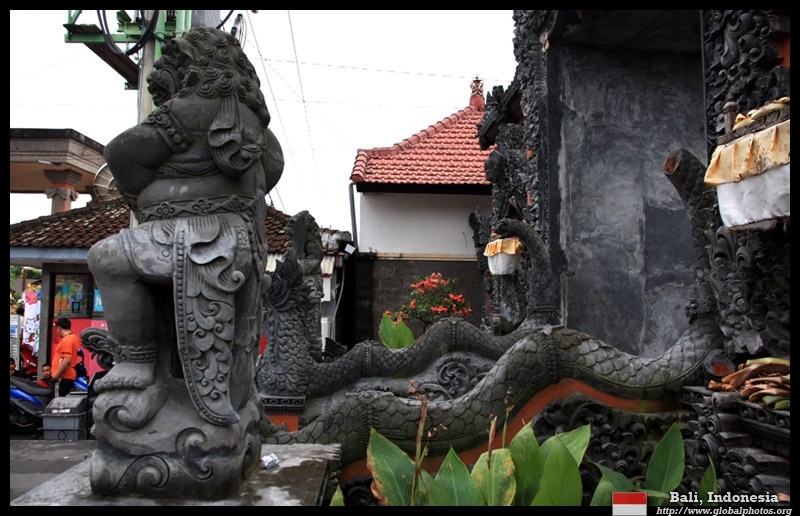 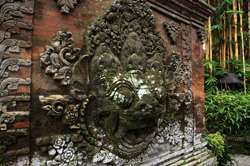 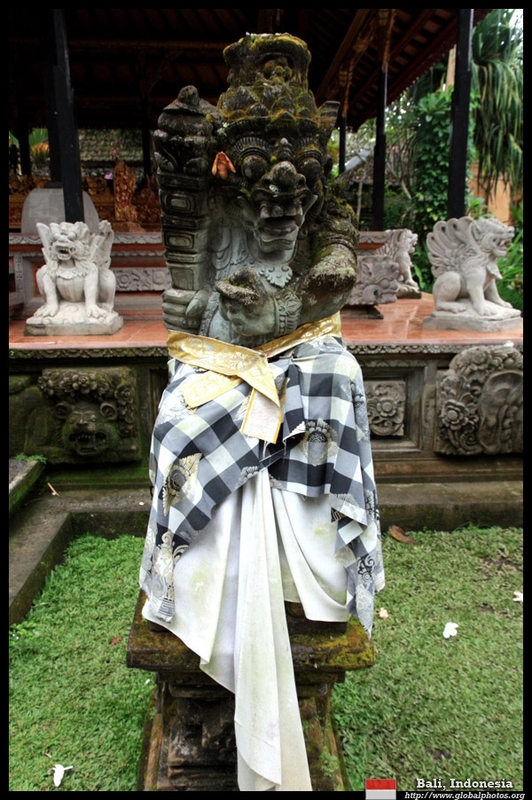 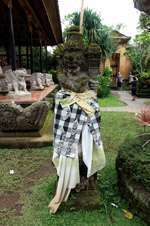 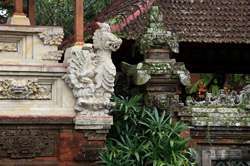 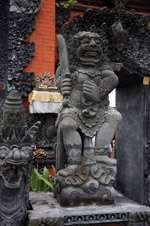 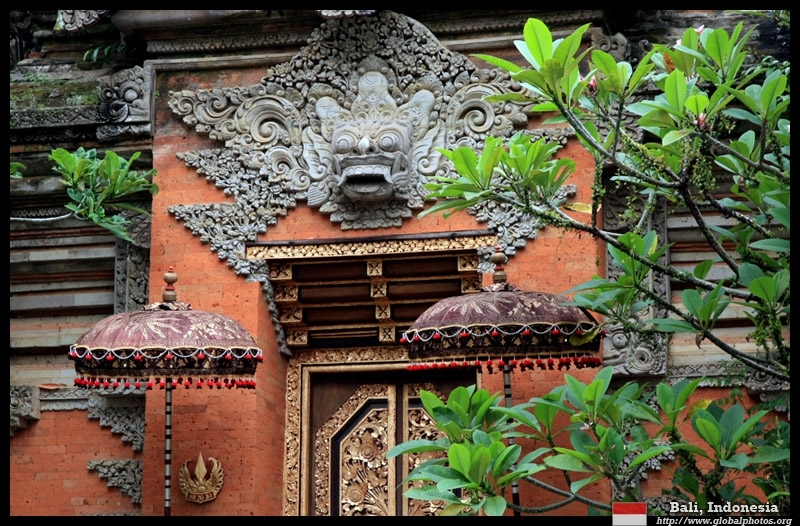 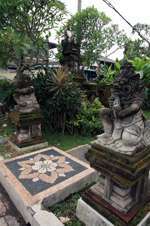 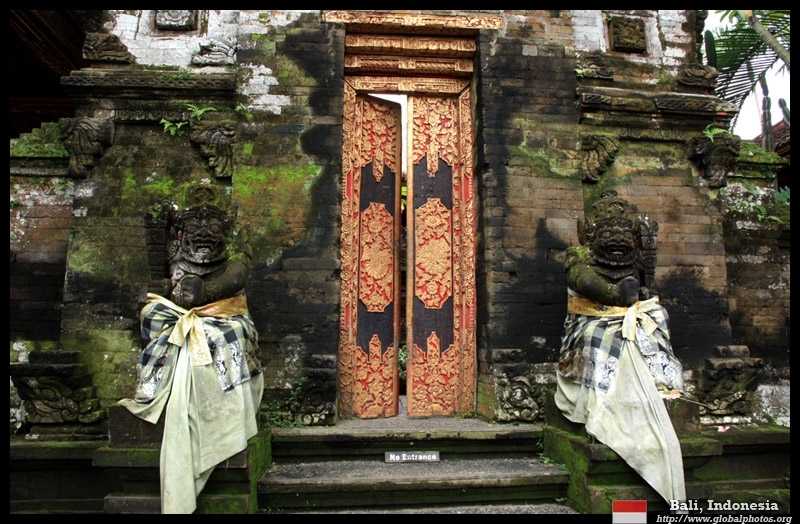 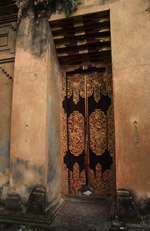 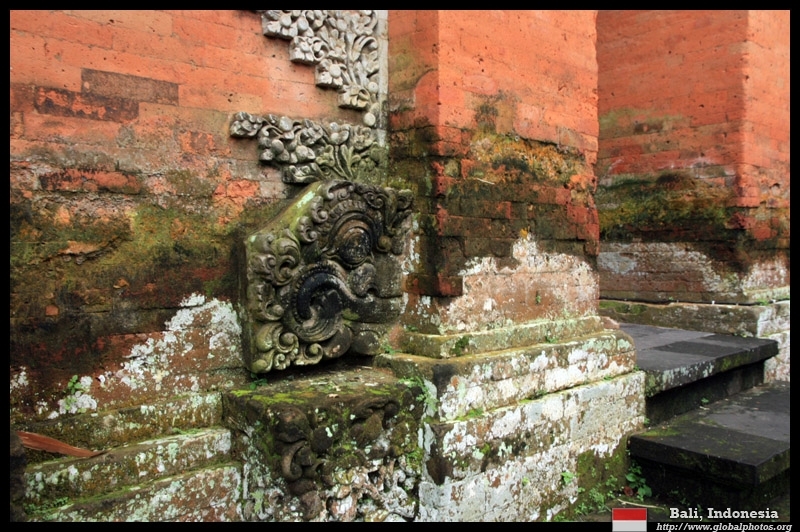 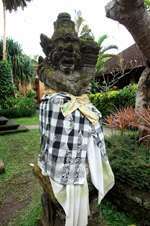 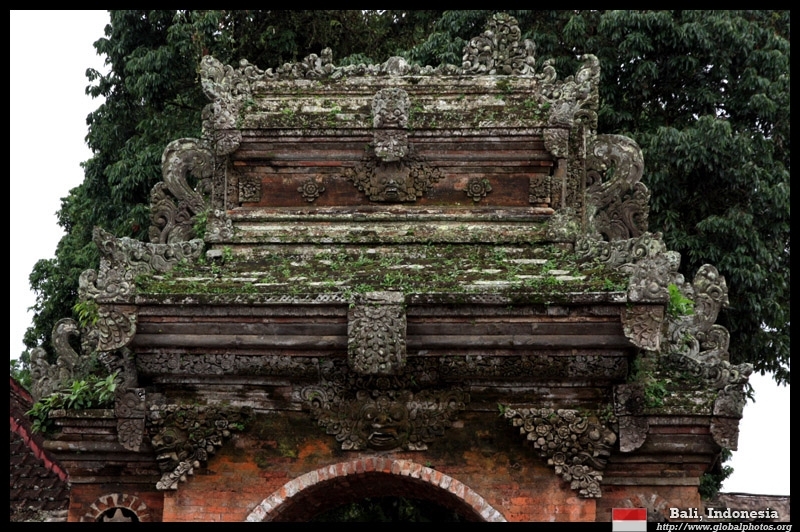 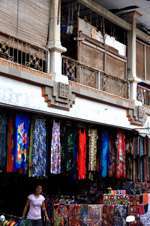 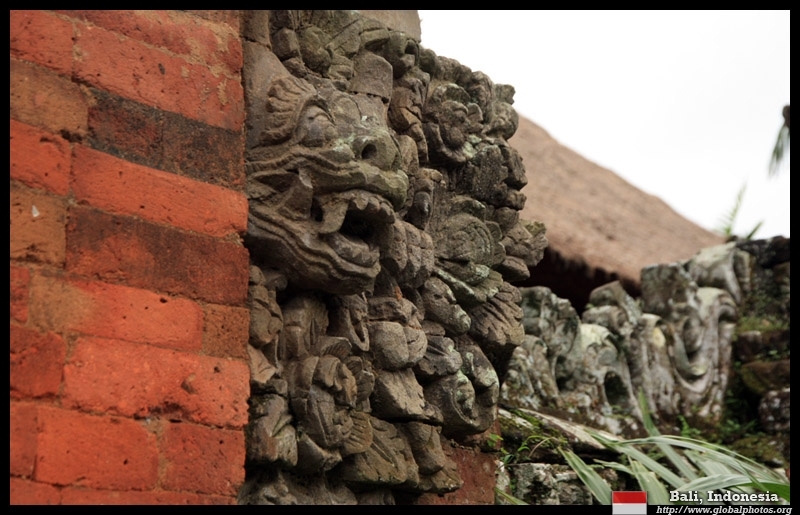 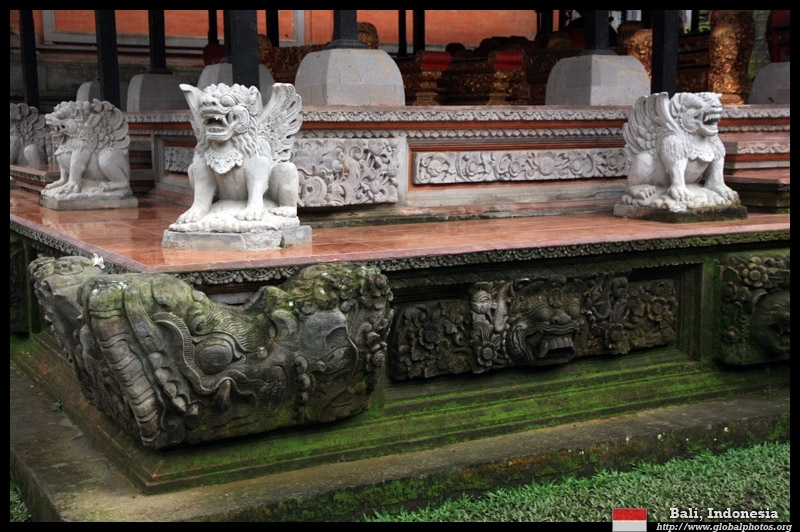 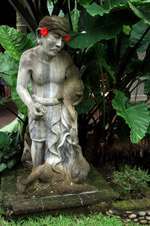 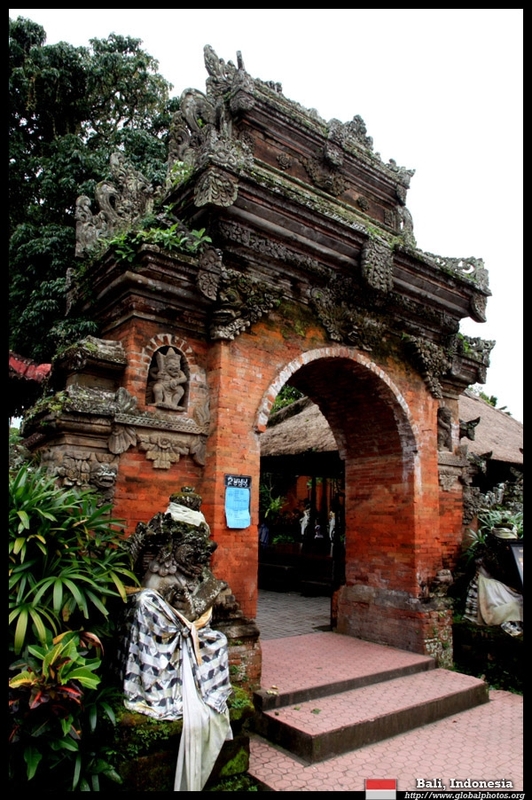 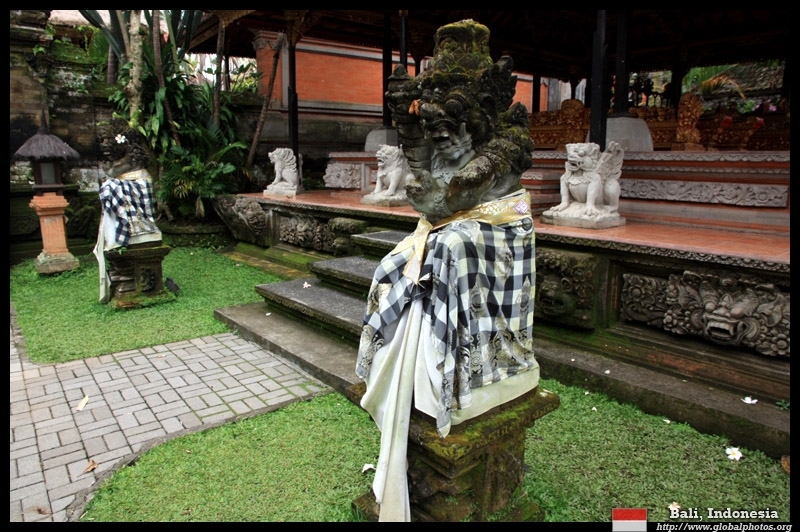 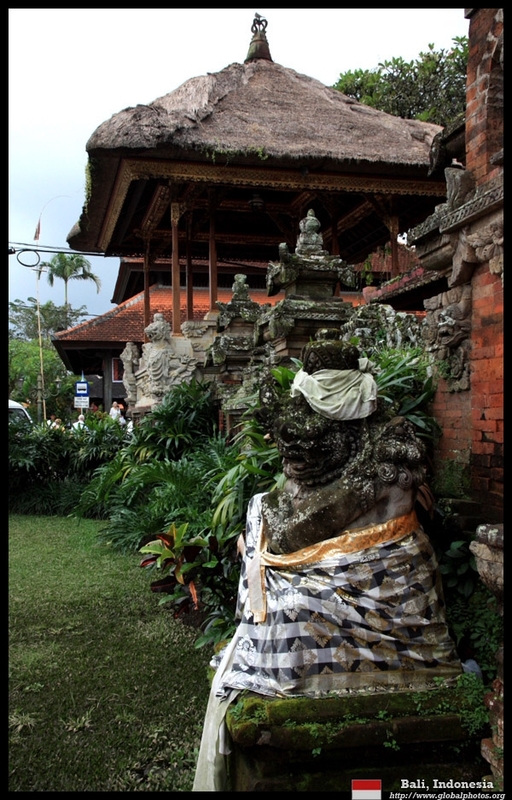 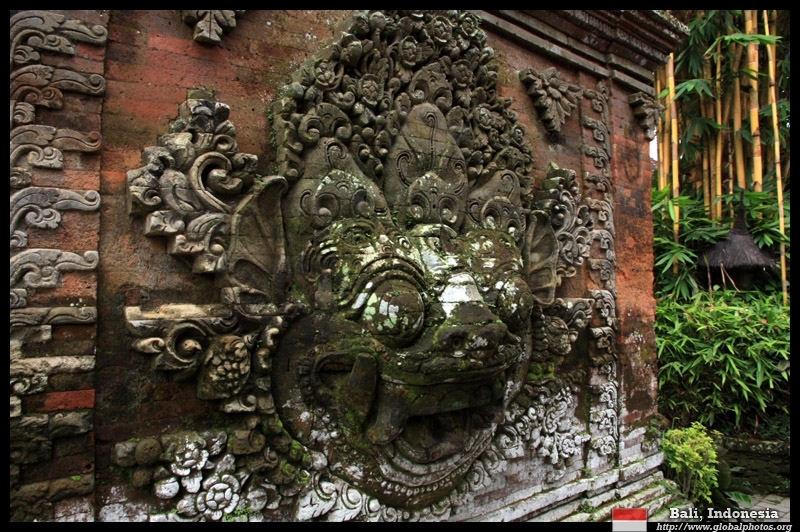 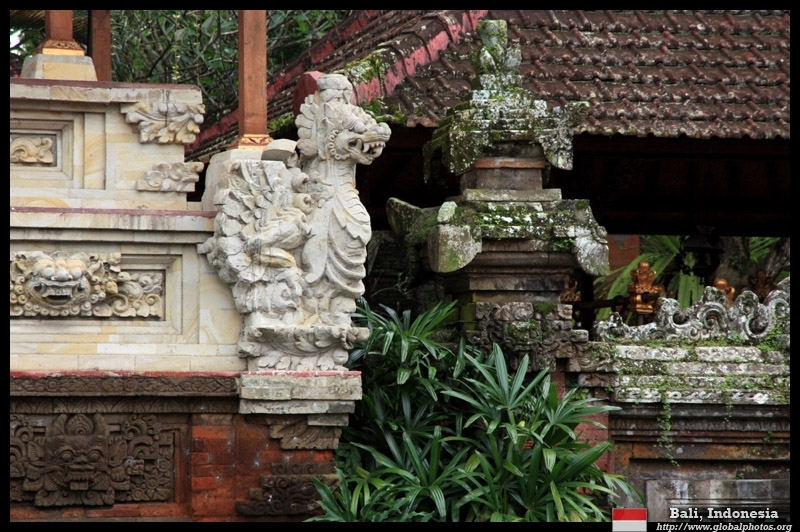 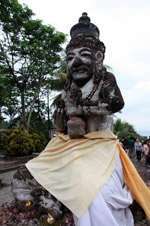 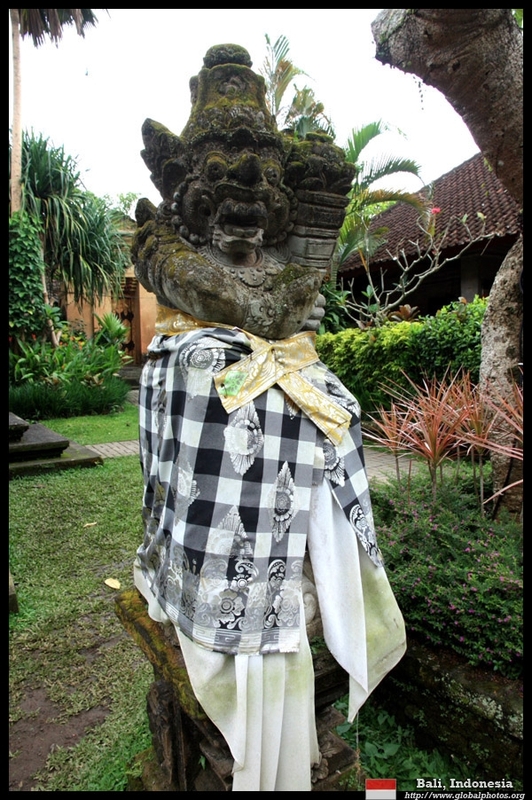 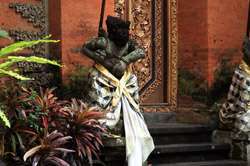 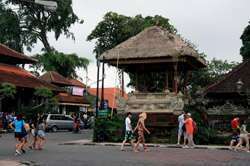 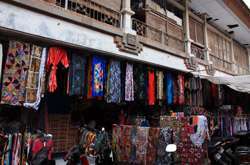 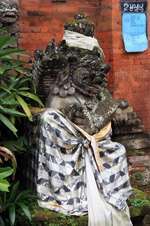 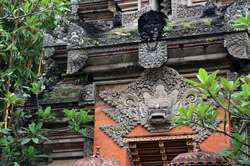 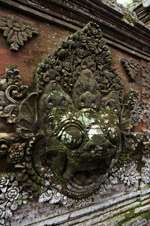 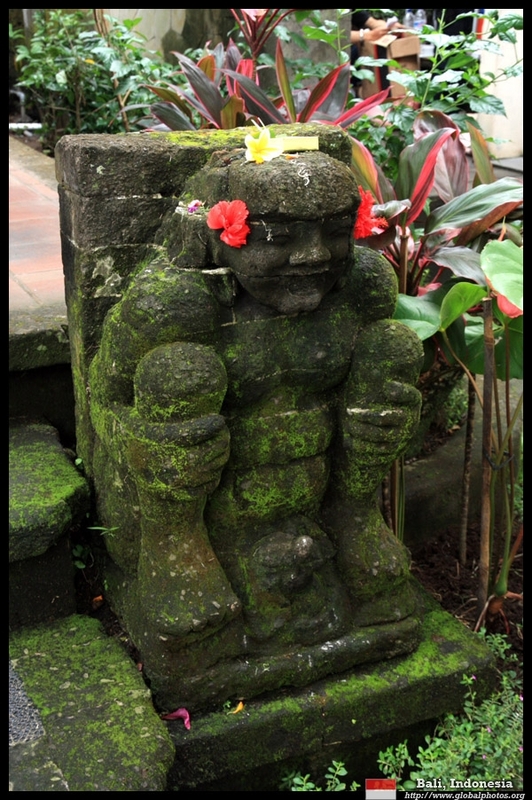 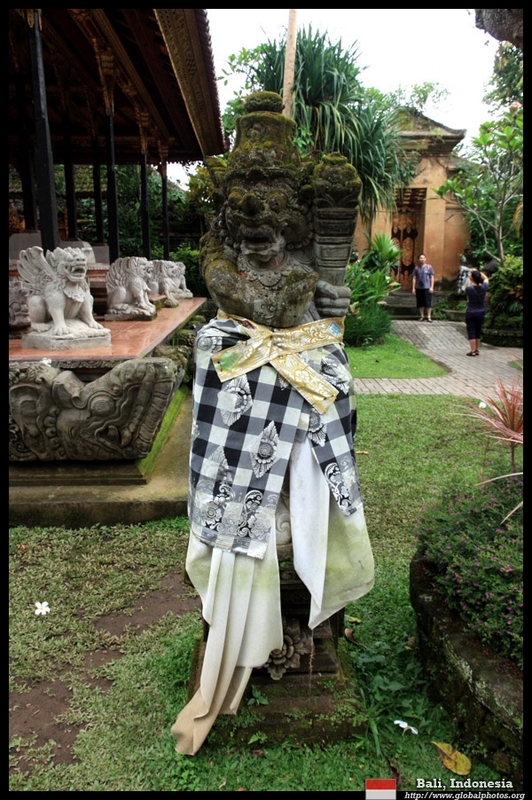 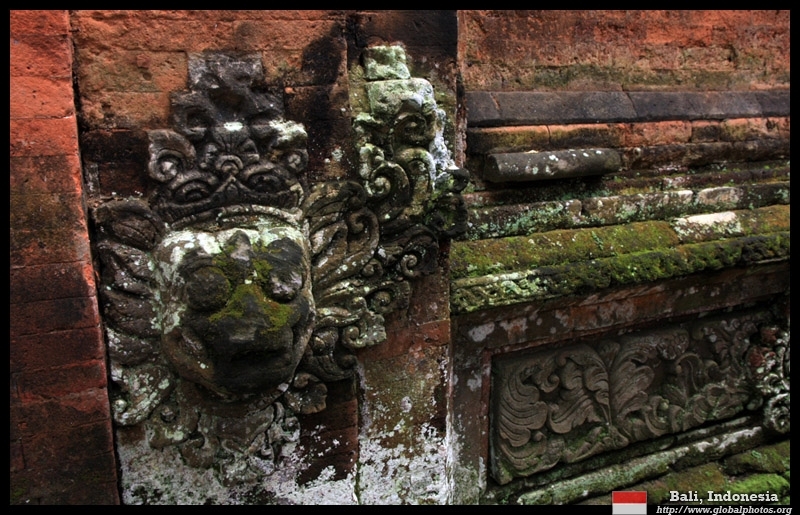 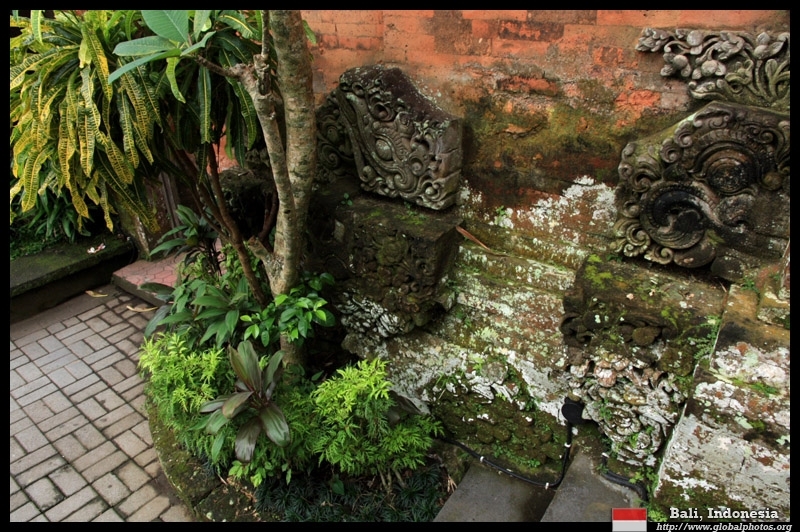 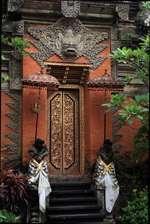 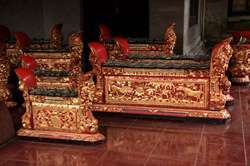 The buildings are intricately decorated with all sorts of statues and faces. 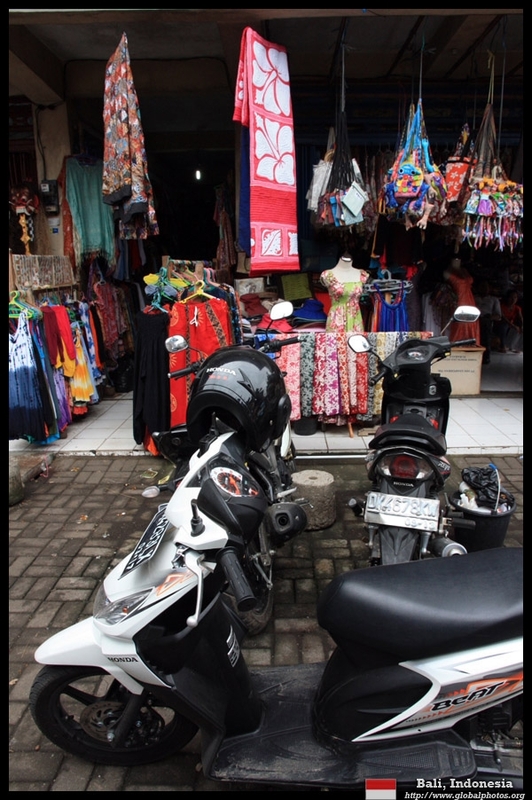 Shopping time! 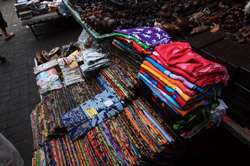 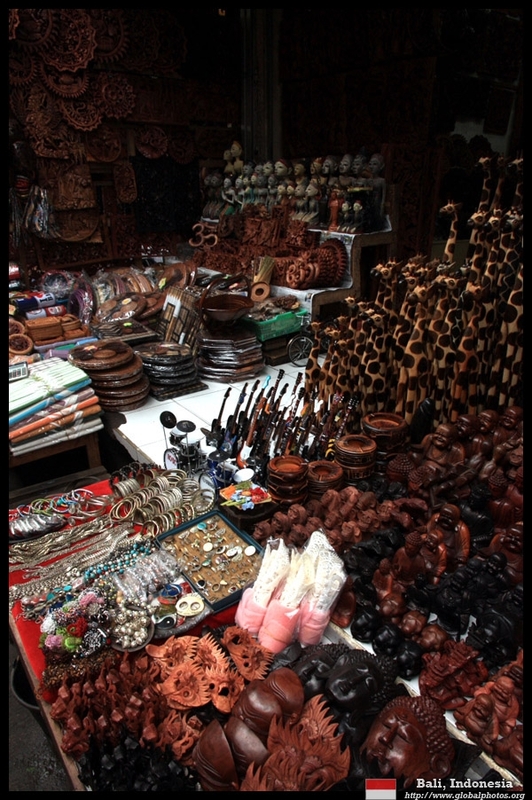 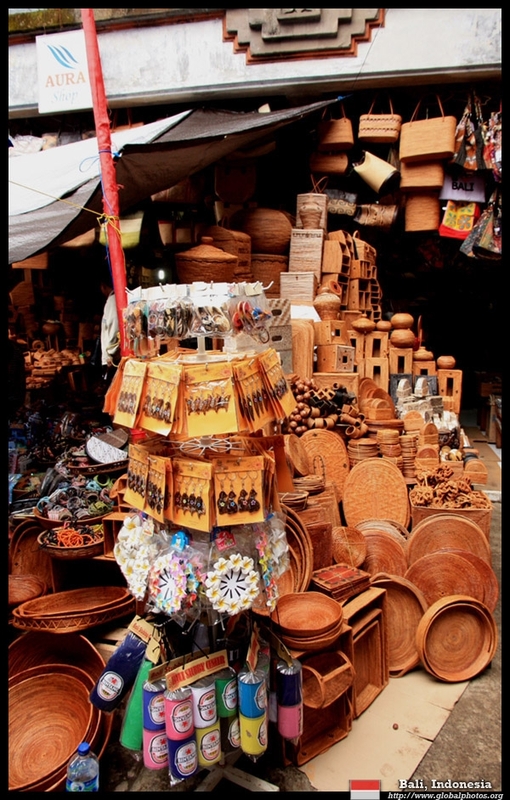 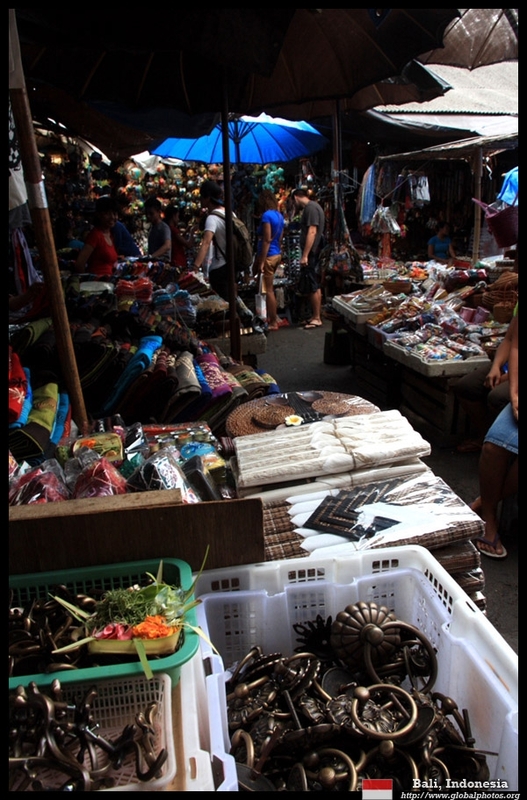 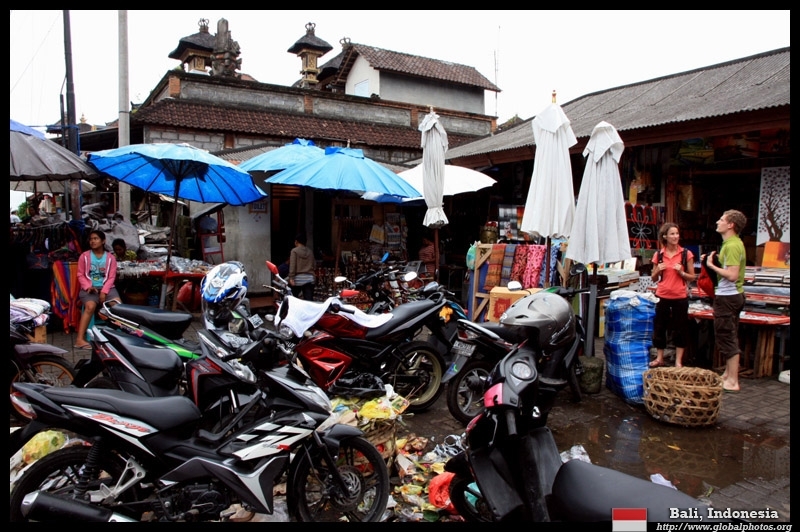 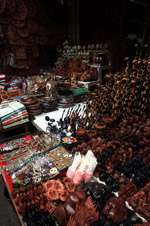 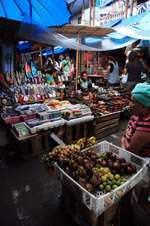 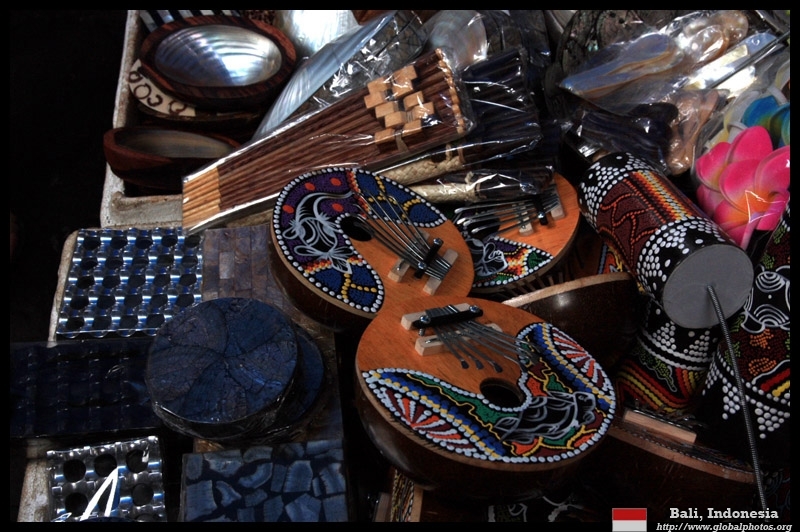 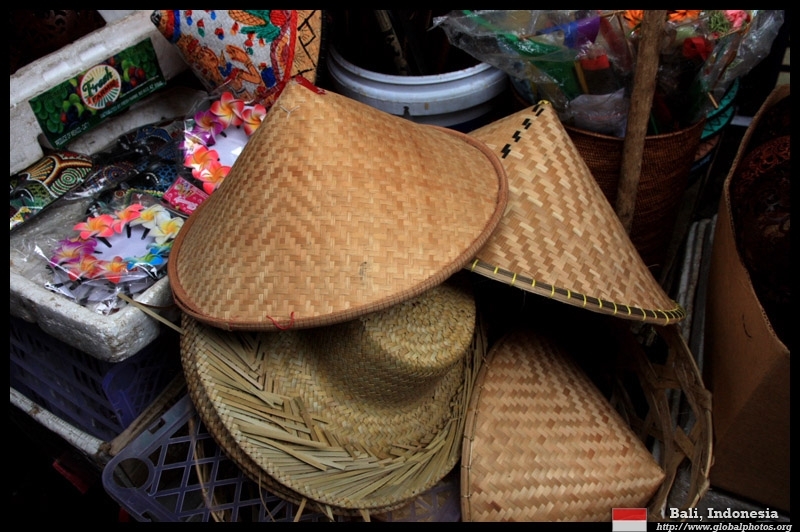 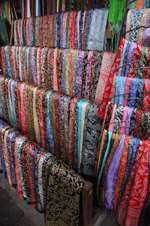 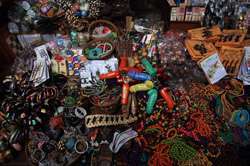 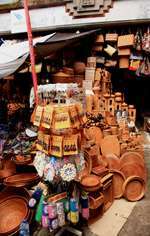 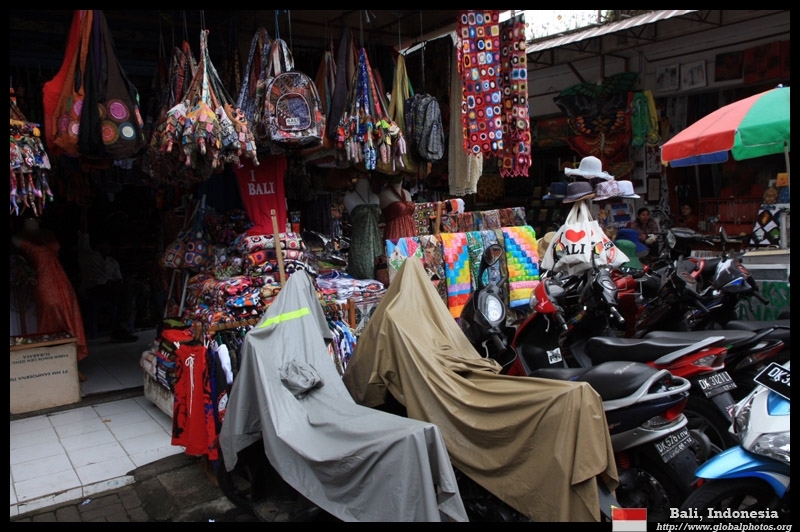 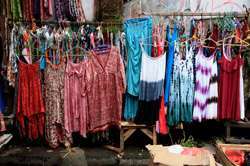 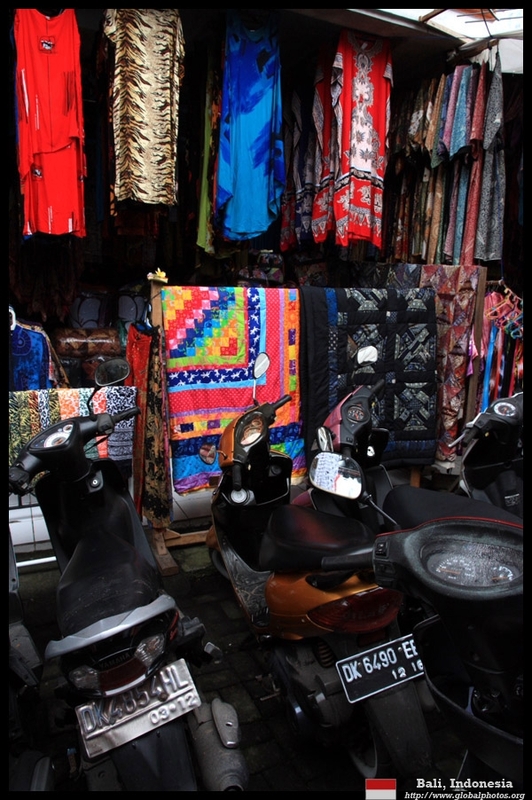 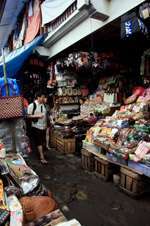 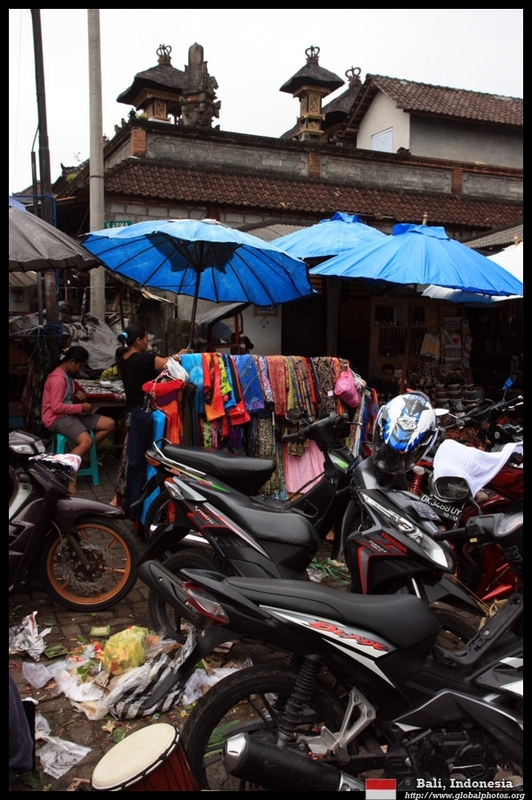 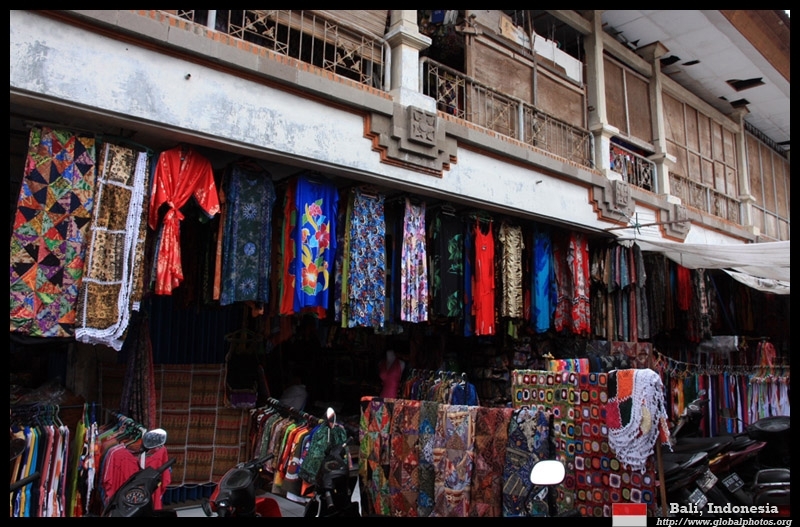 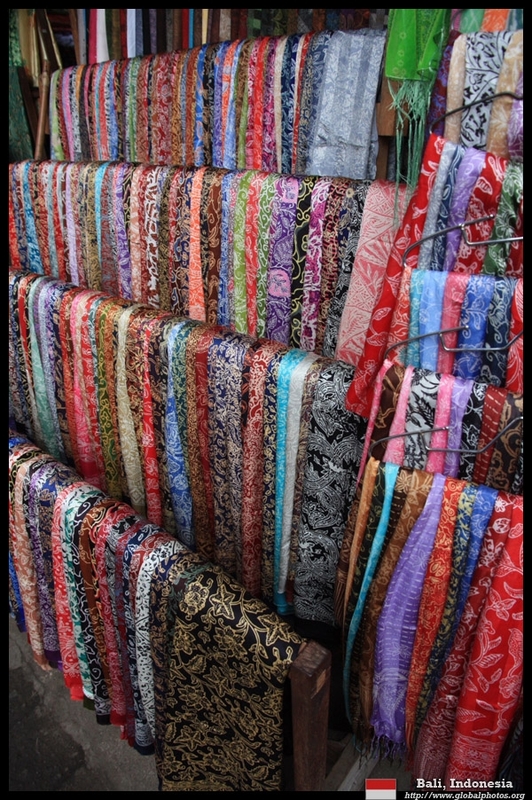 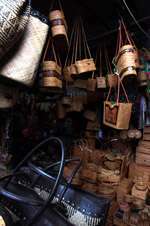 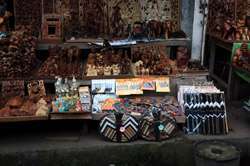 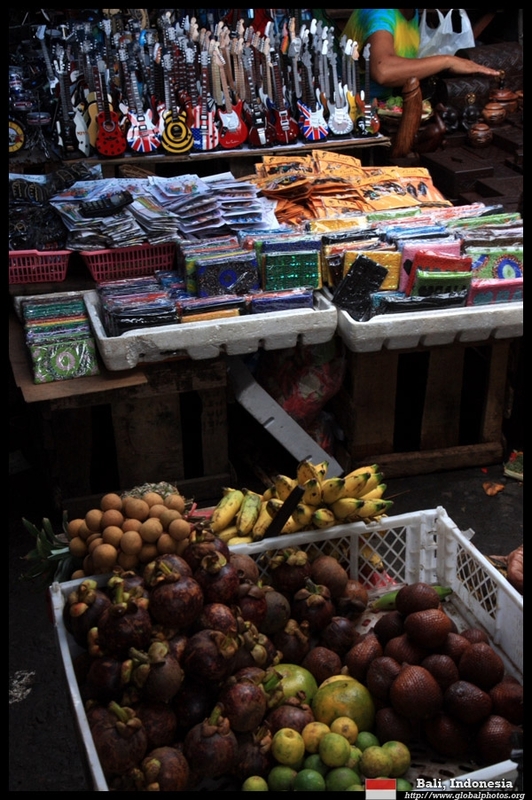 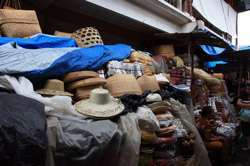 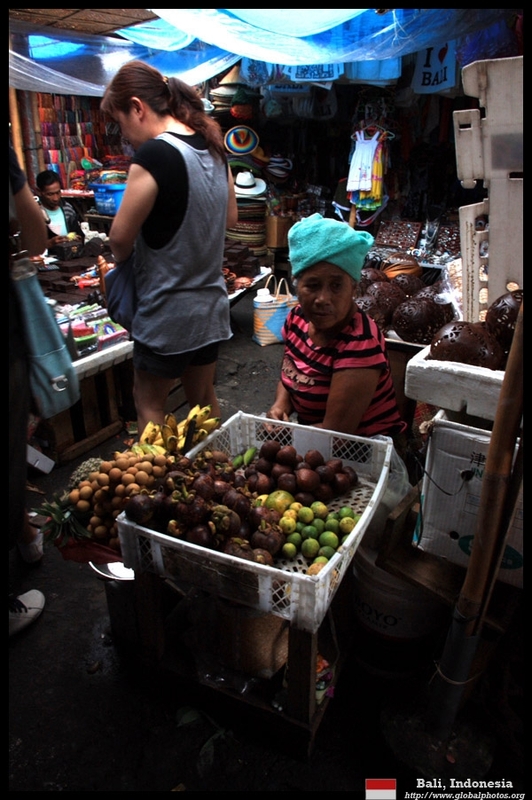 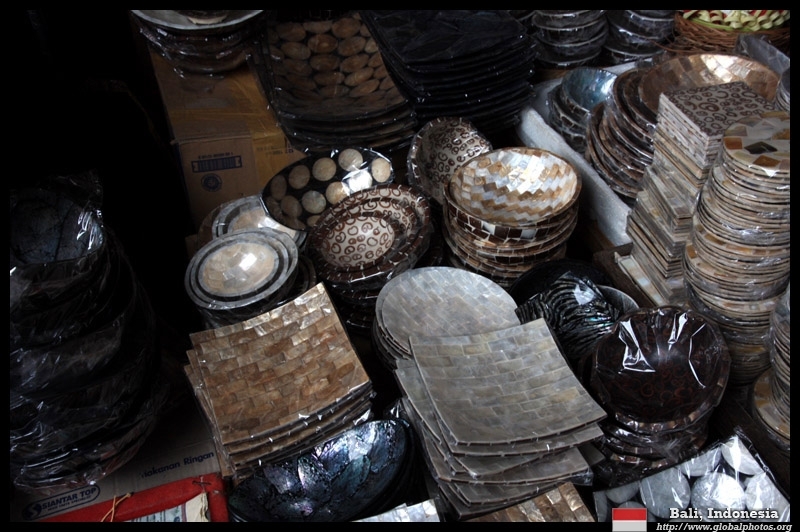 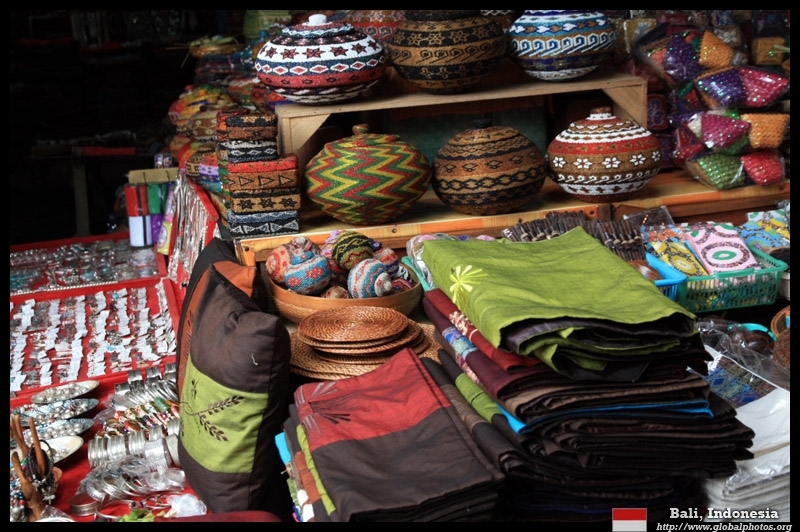 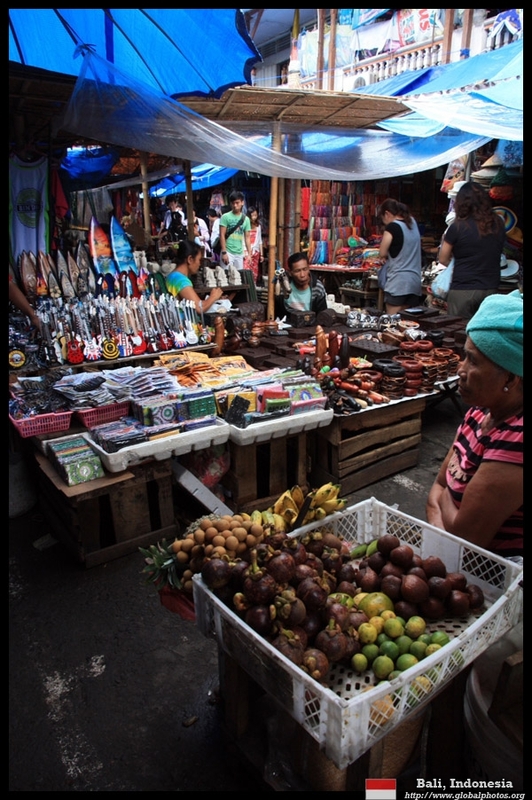 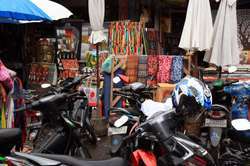 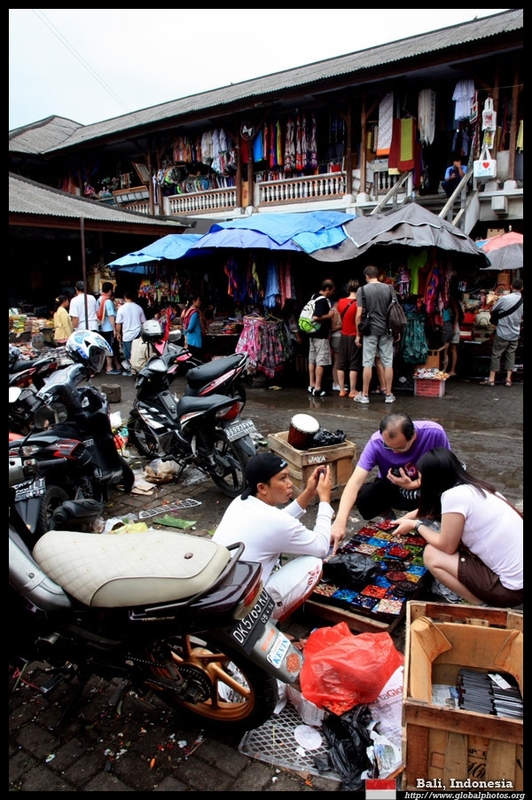 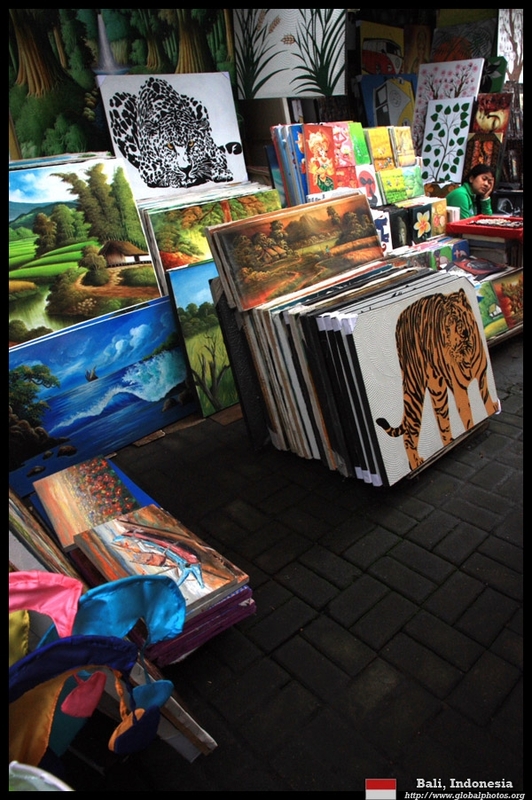 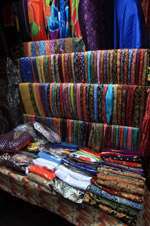 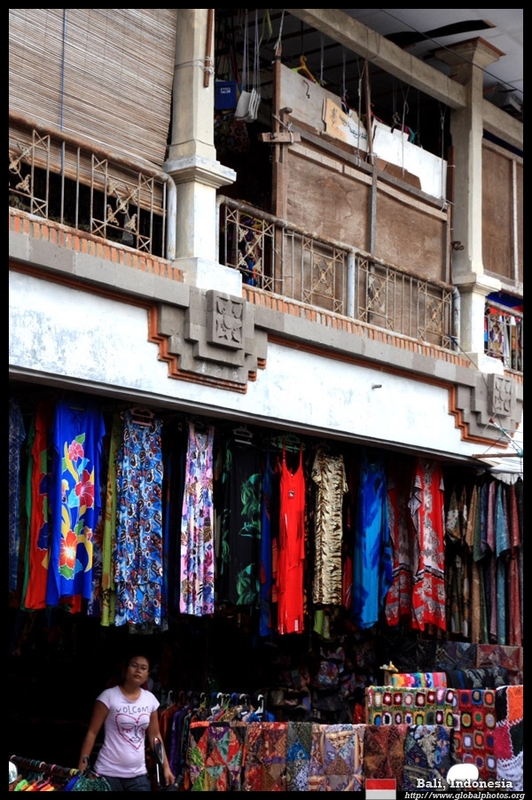 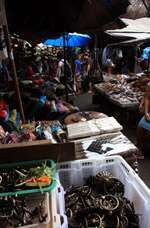 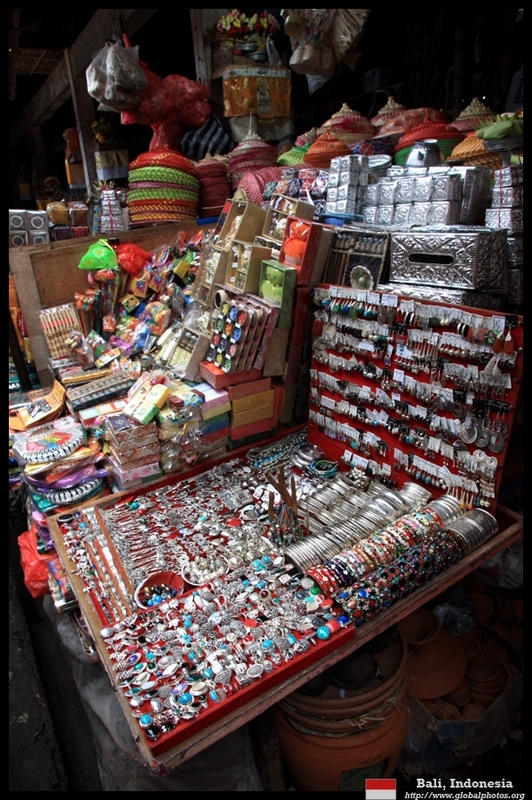 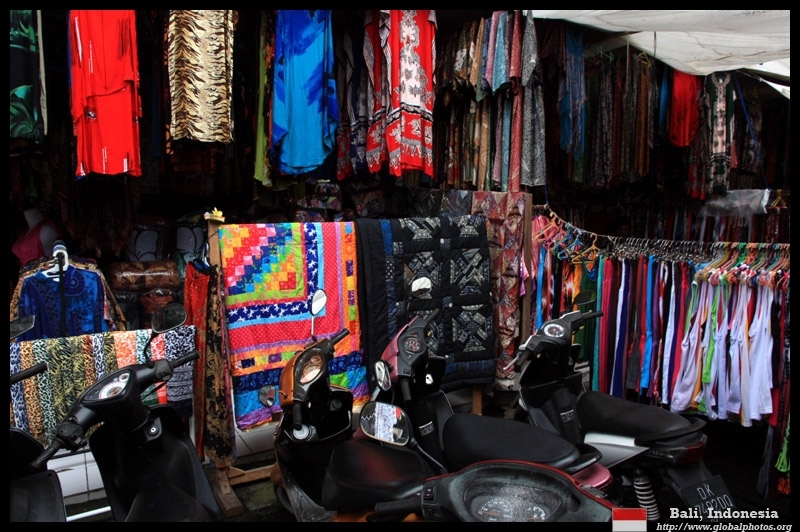 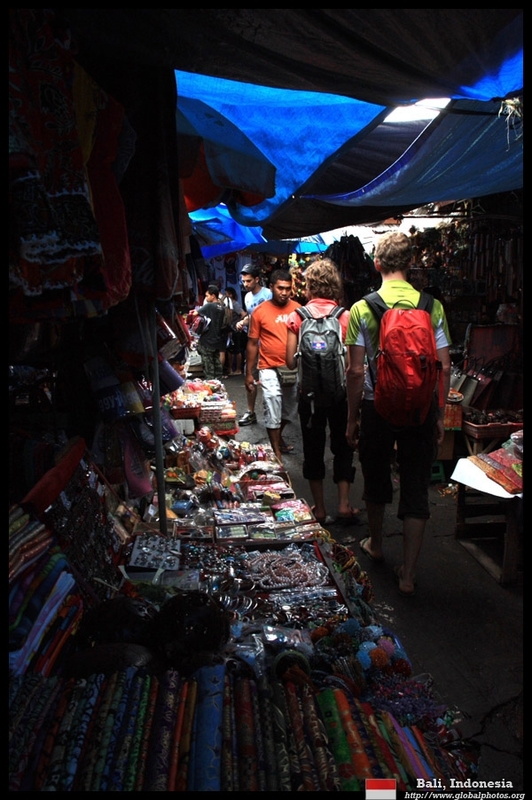 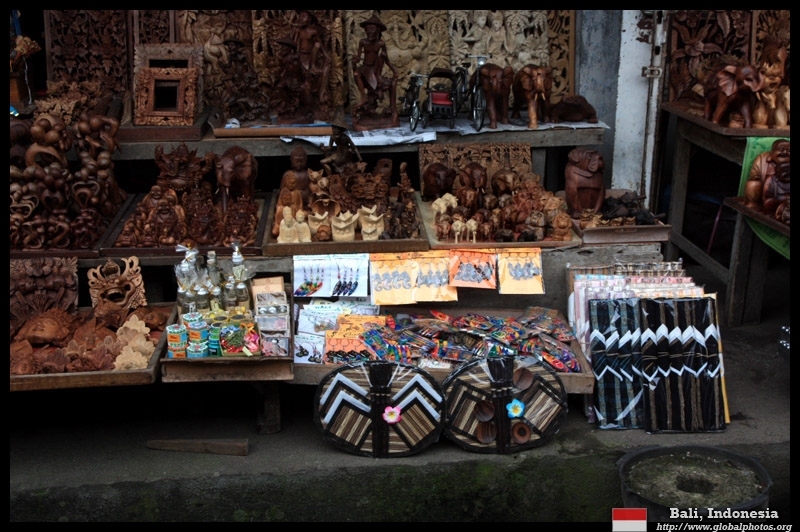 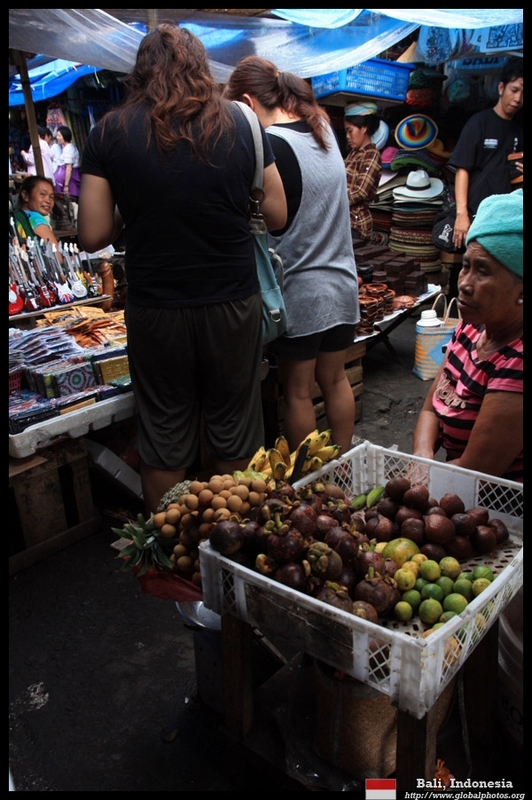 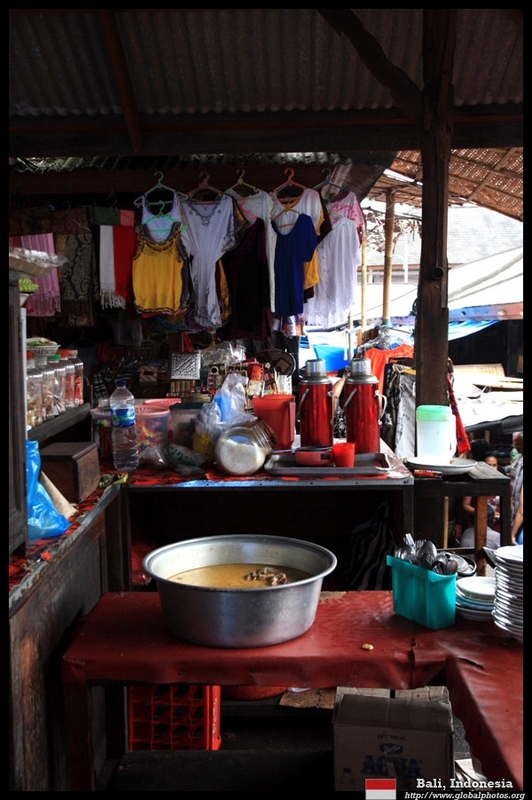 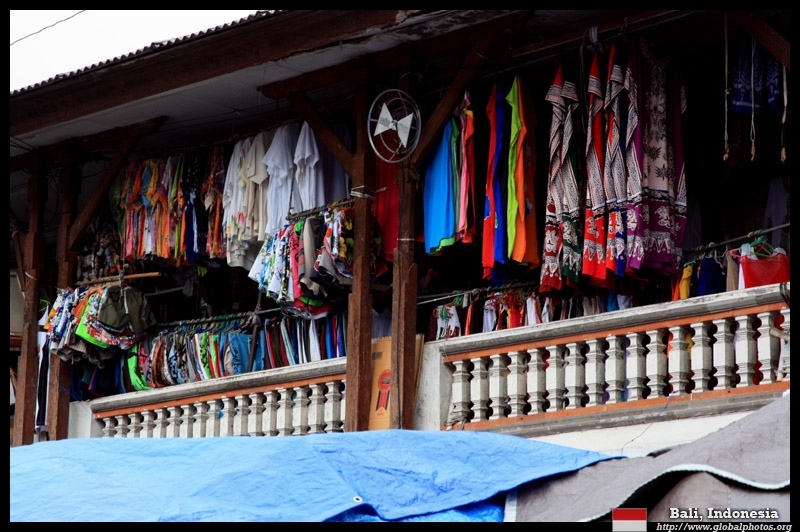 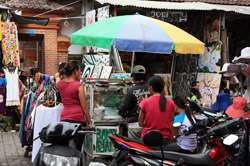 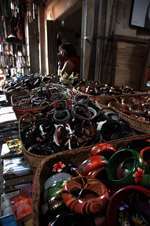 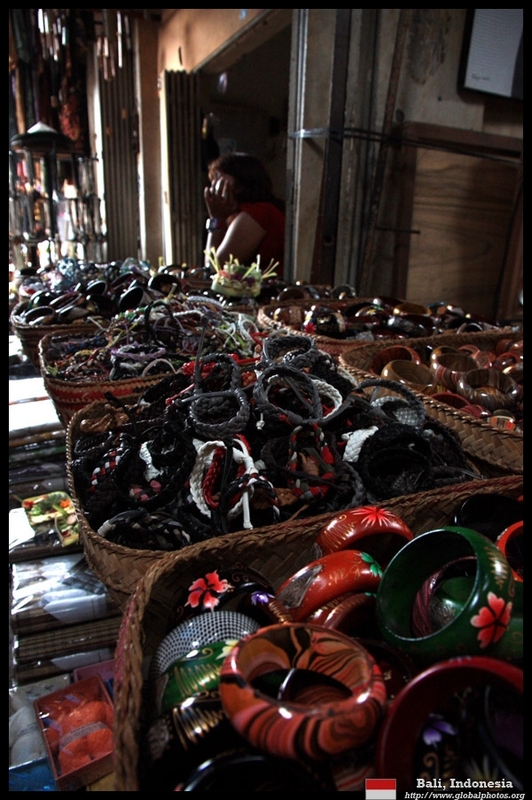 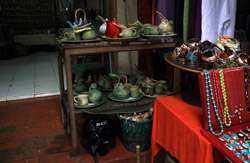 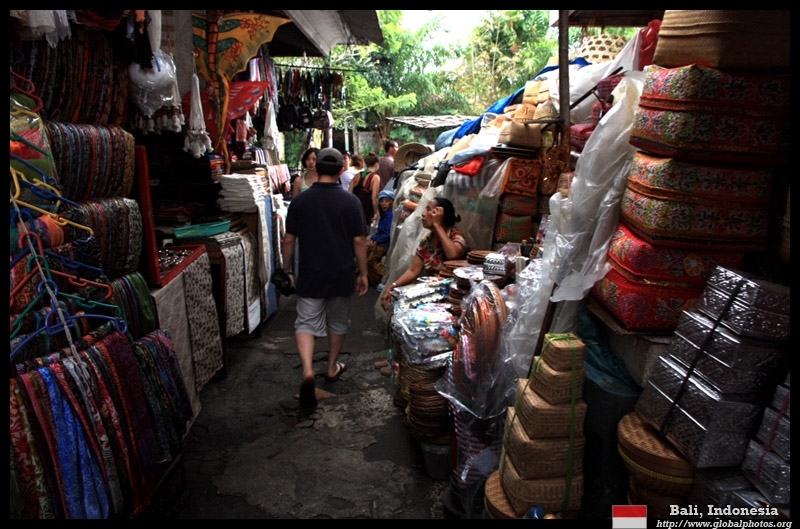 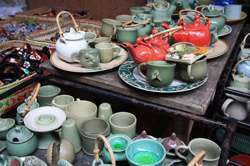 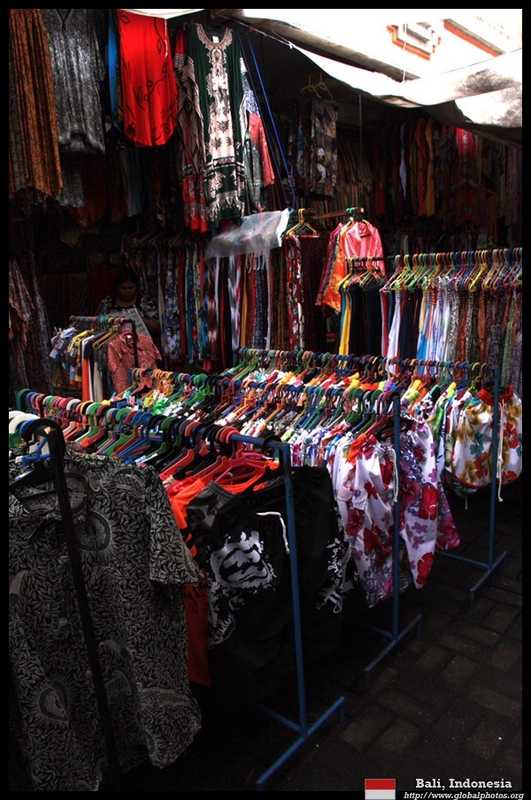 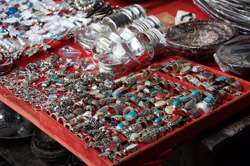 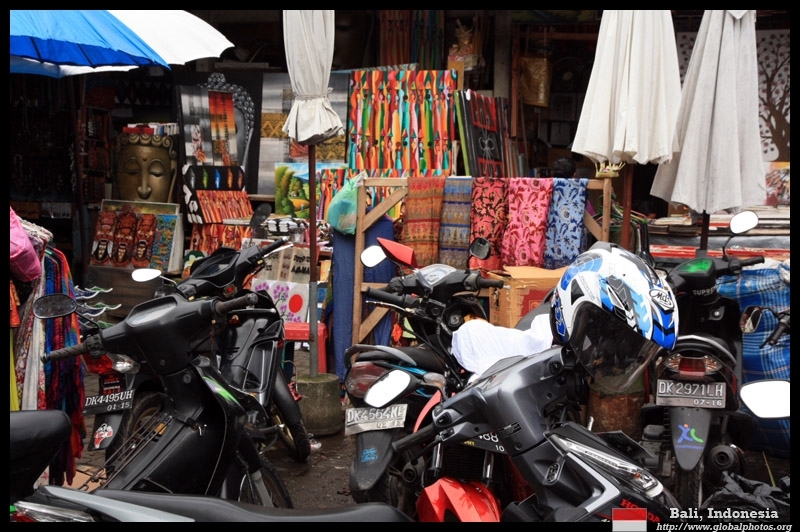 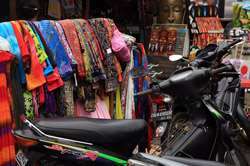 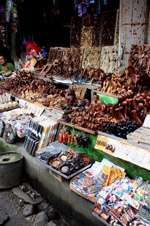 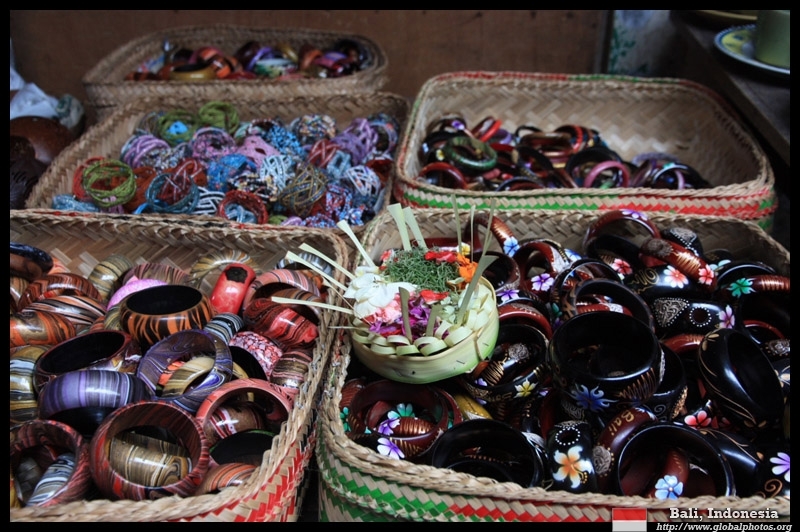 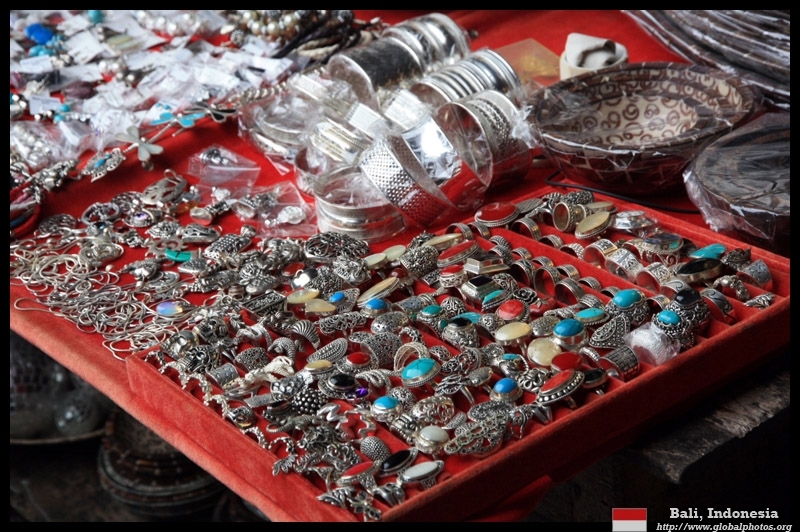 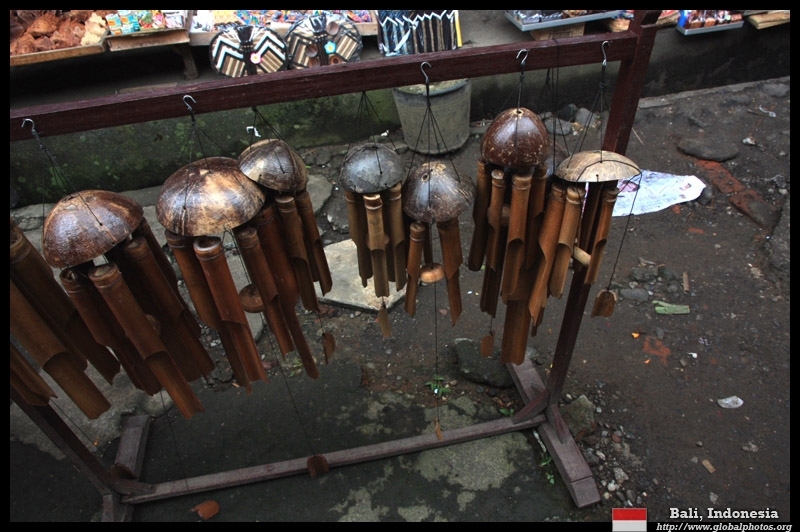 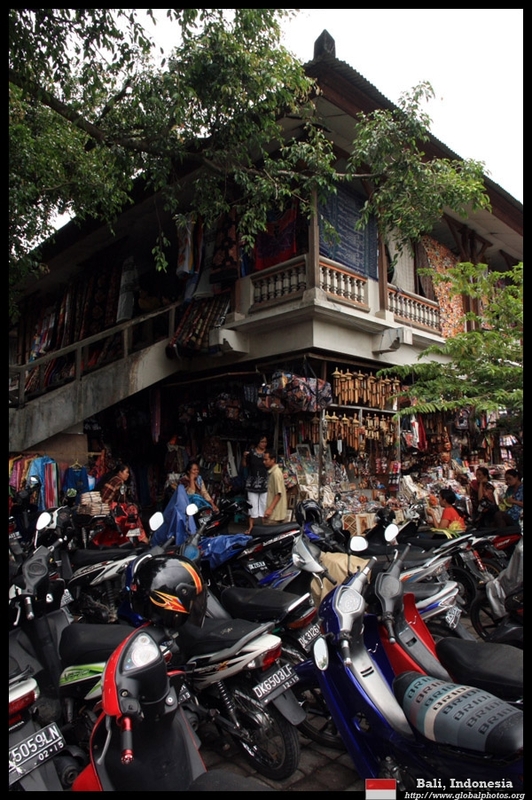 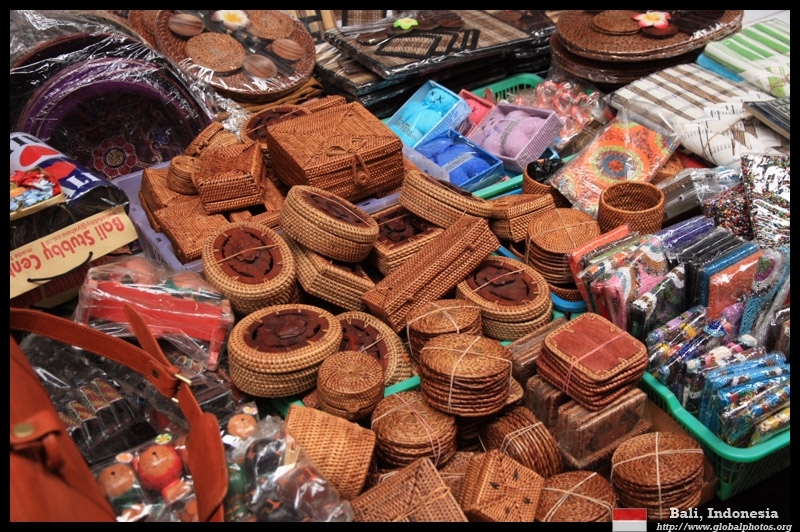 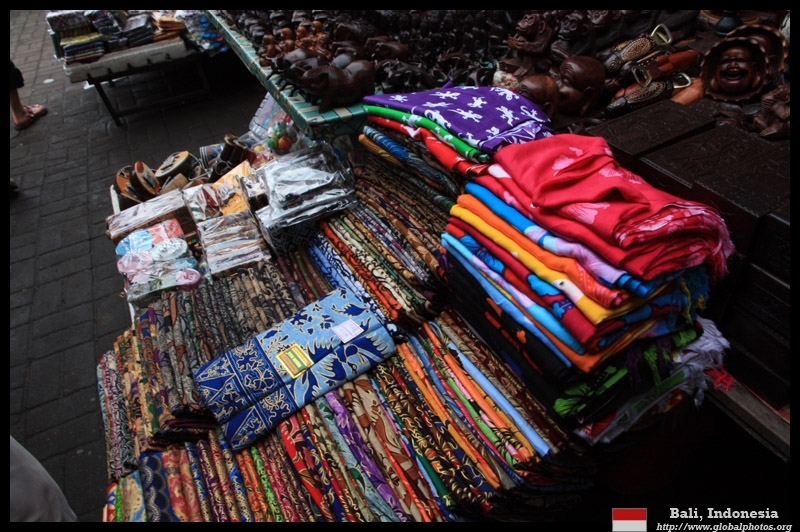 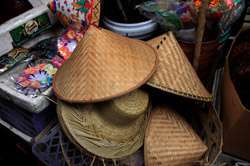 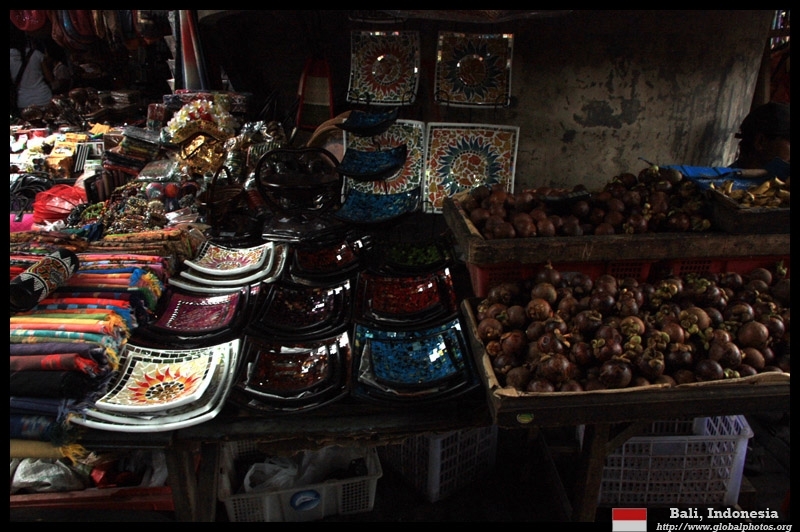 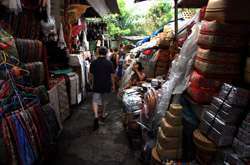 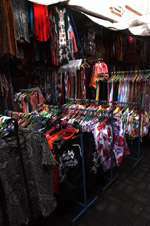 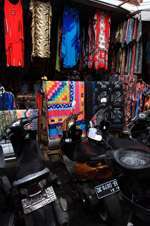 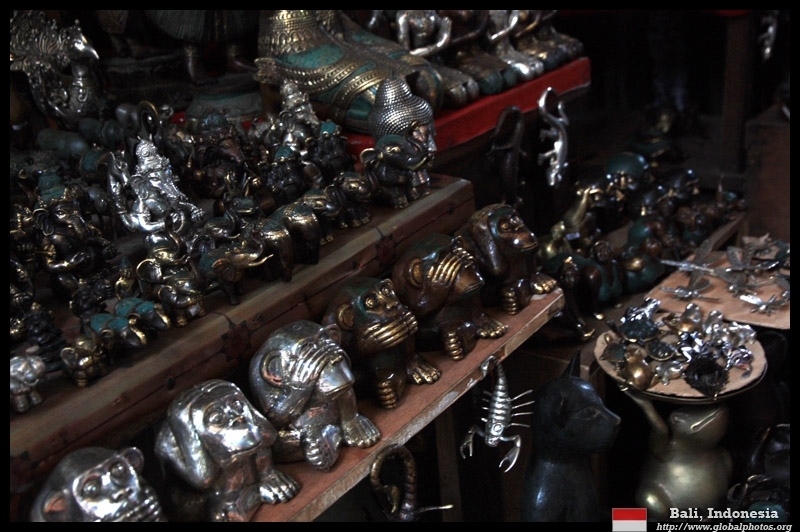 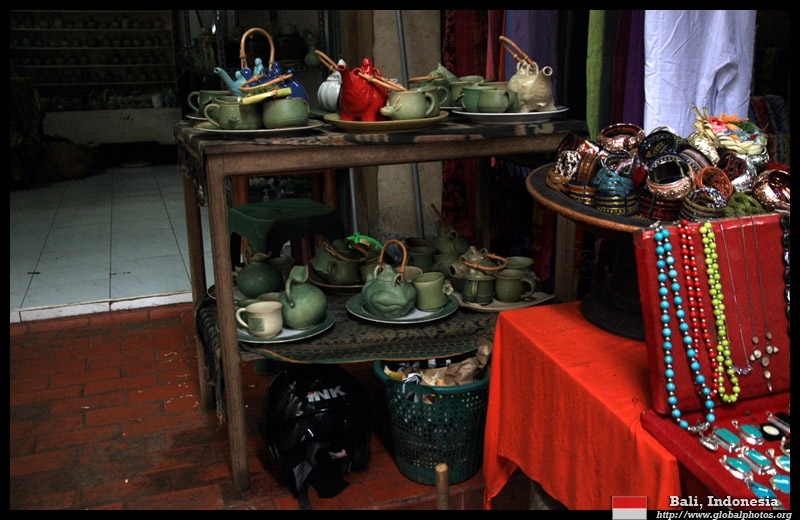 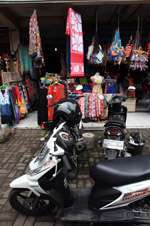 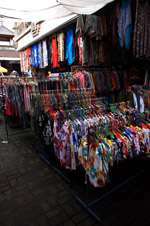 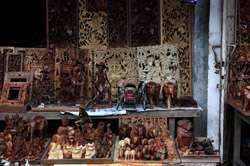 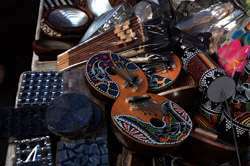 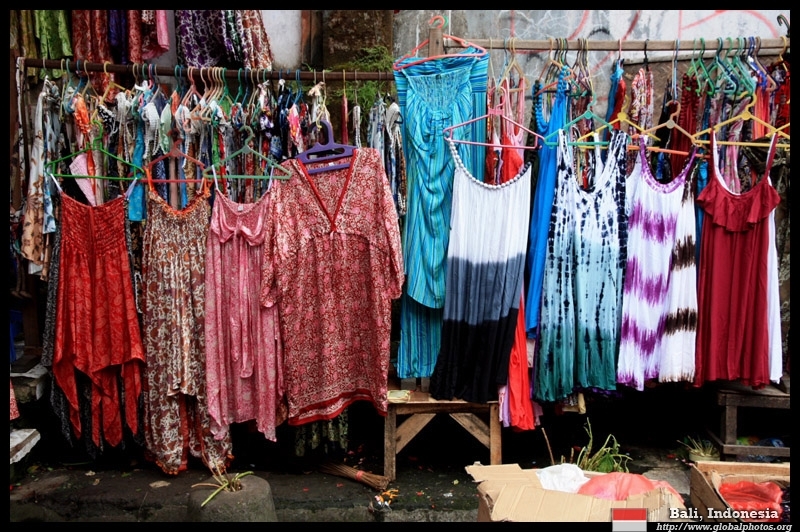 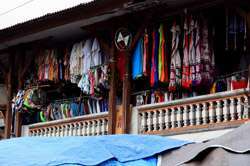 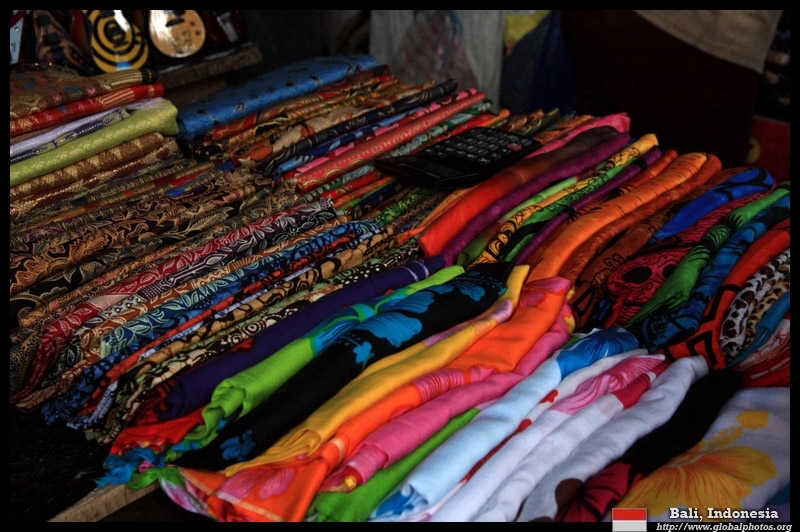 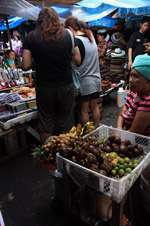 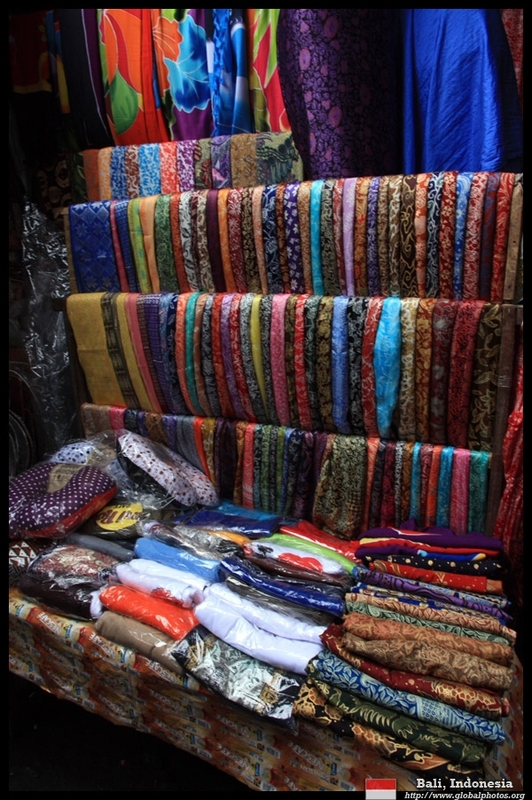 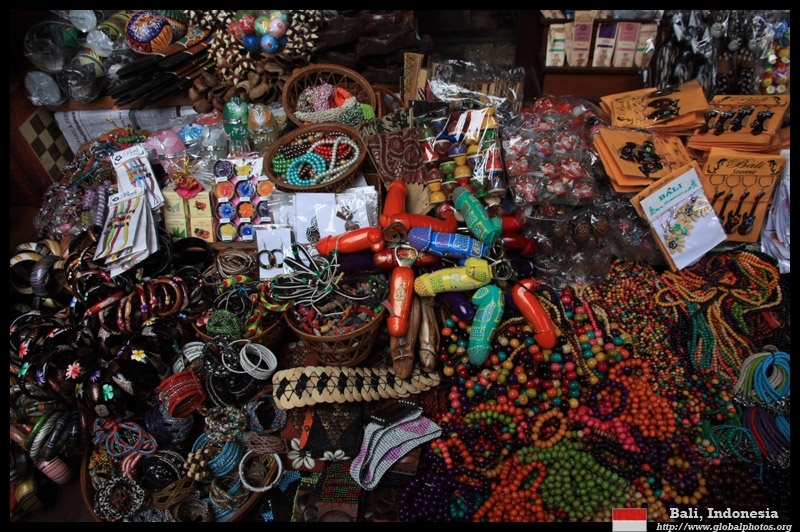 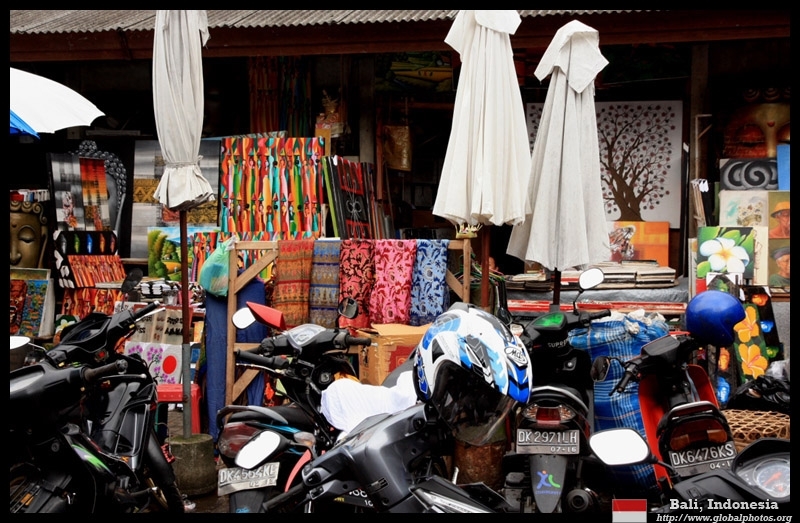 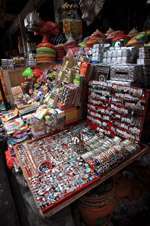 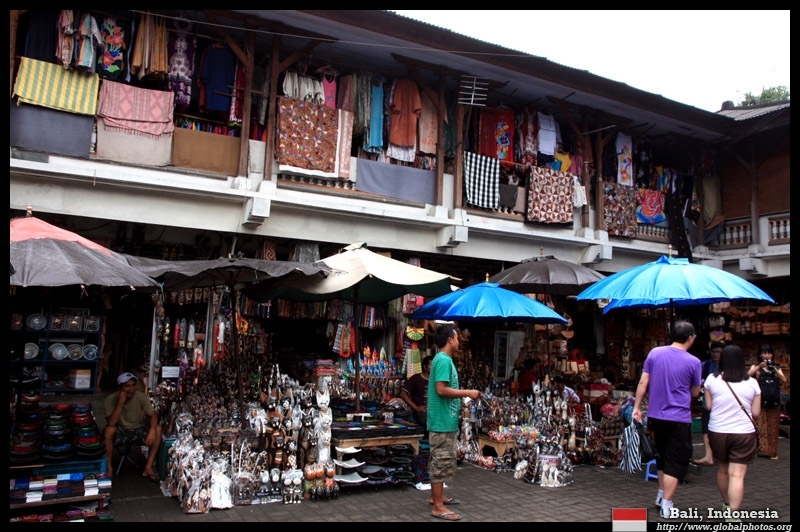 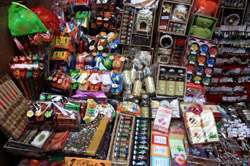 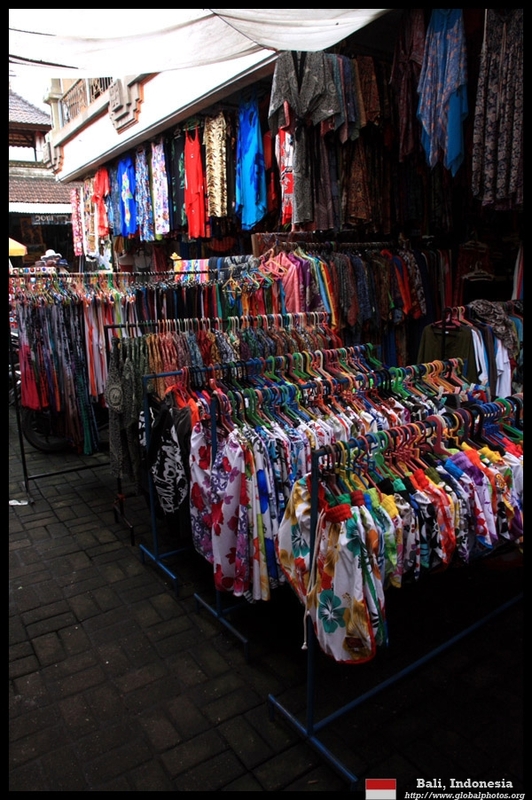 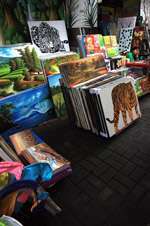 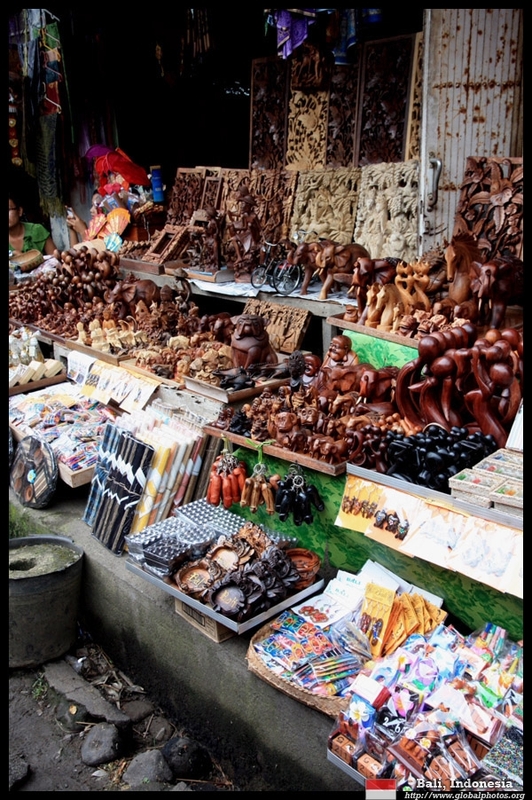 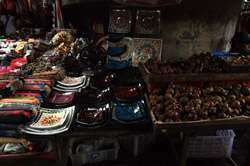 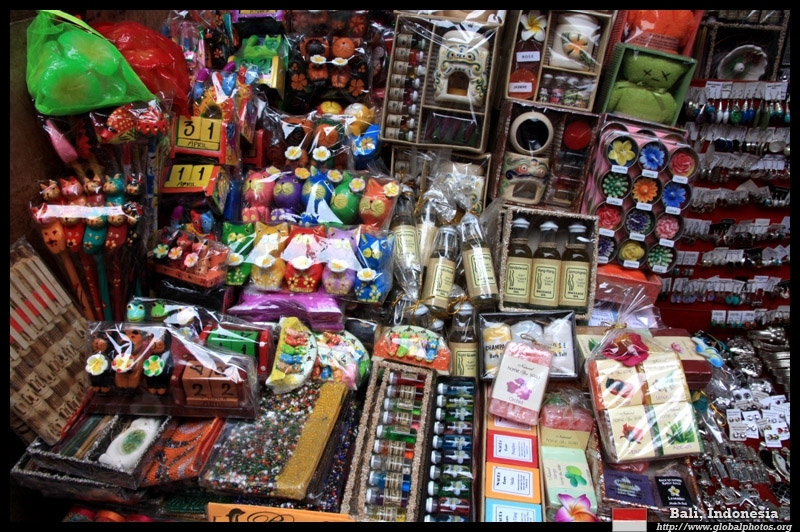 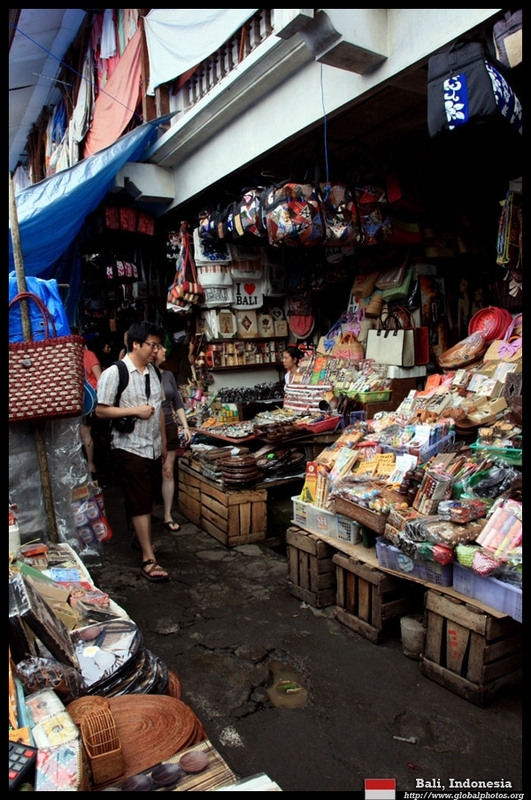 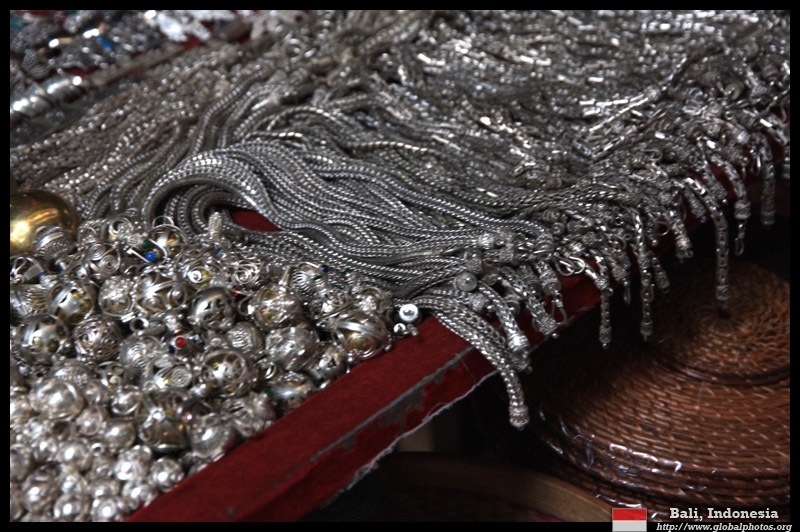 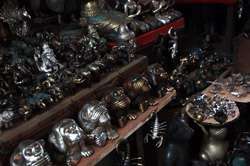 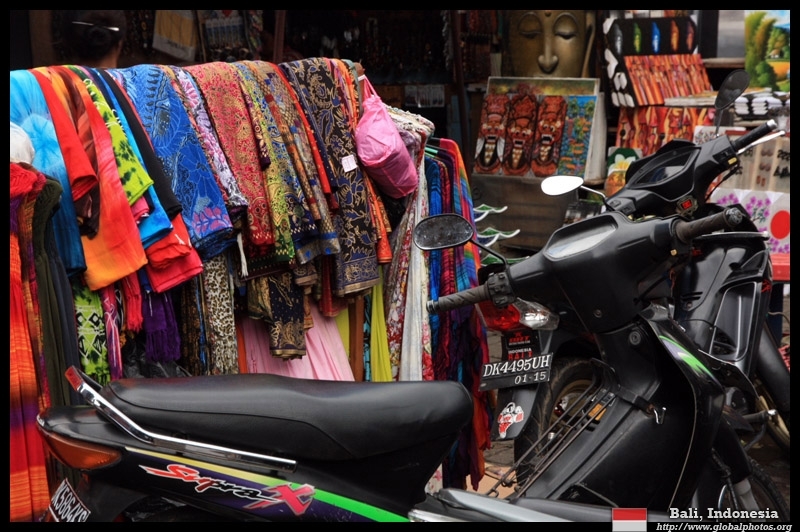 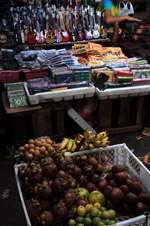 Plenty of souvenirs were available in this sprawling market of narrow and dirty alleys. 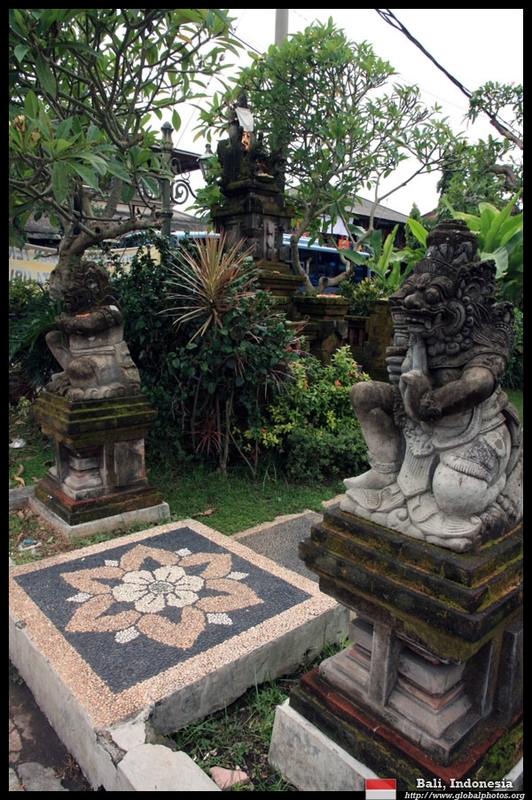 Watch your step! 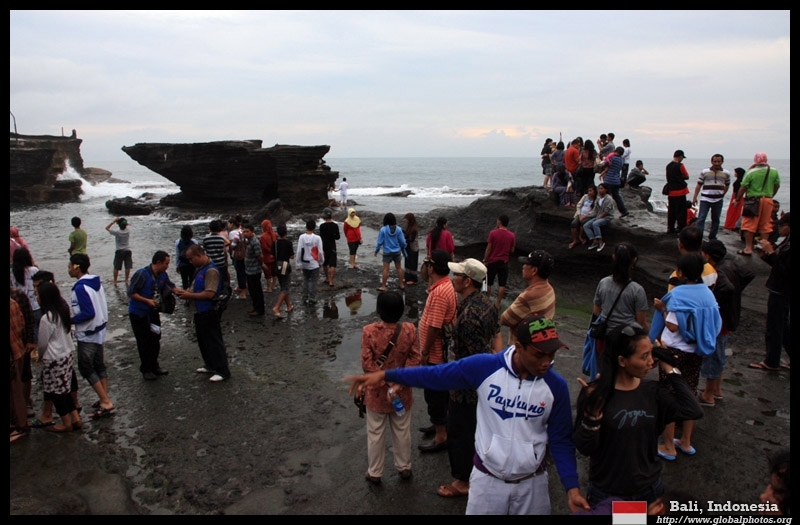 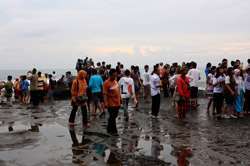 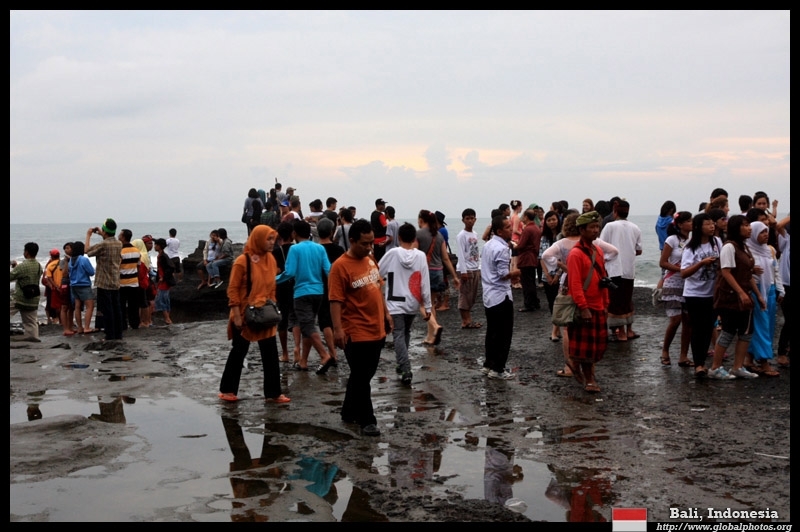 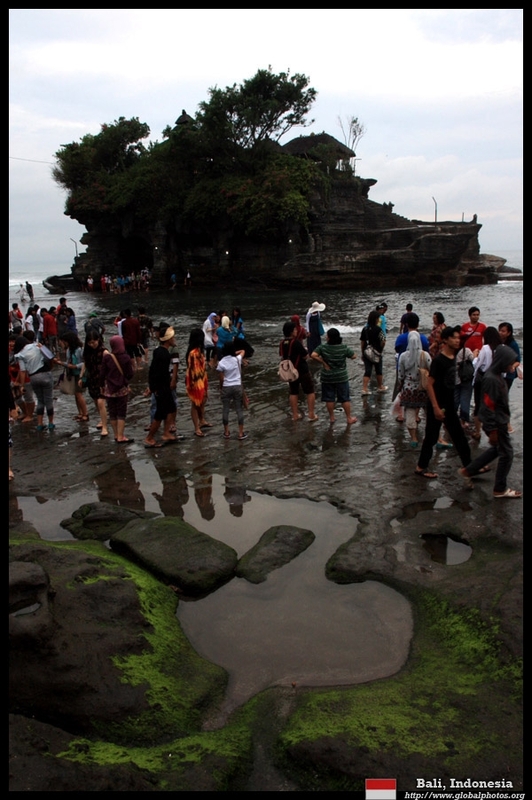 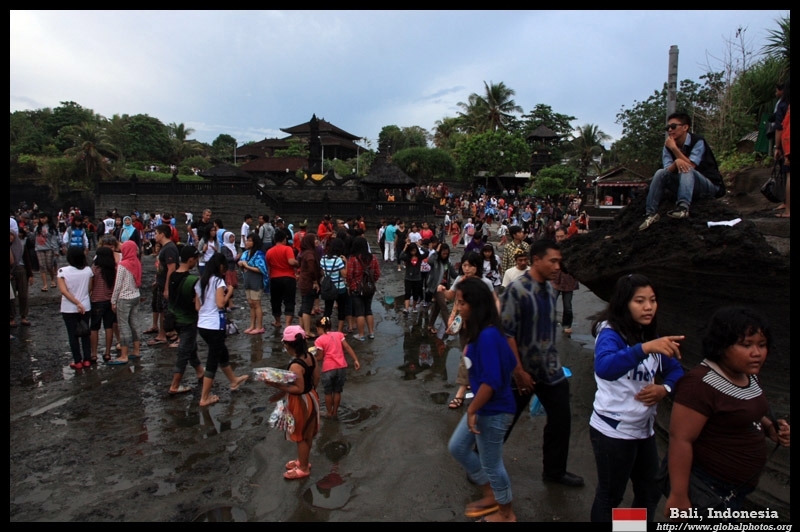 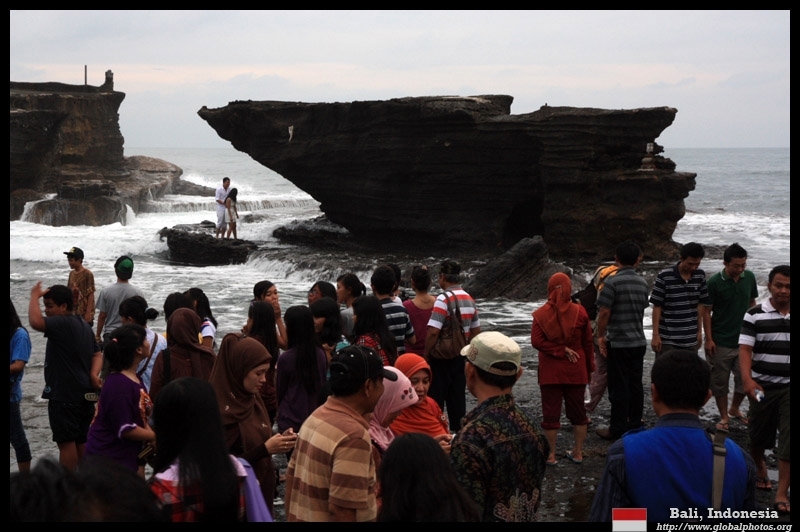 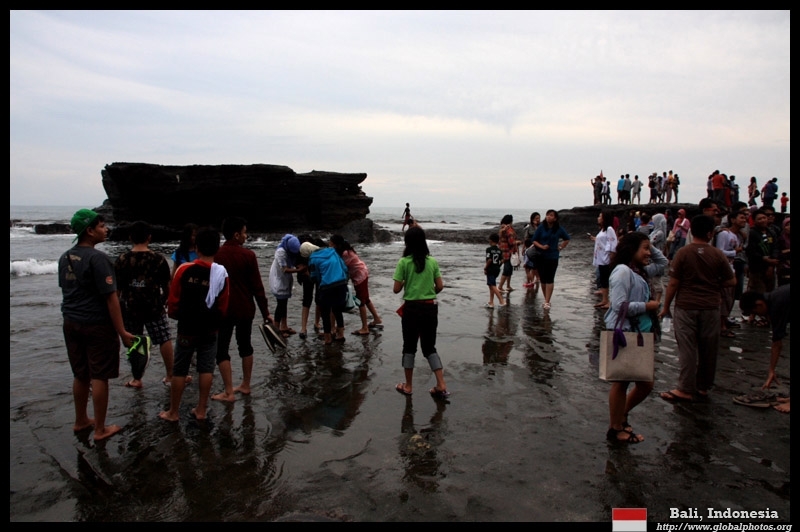 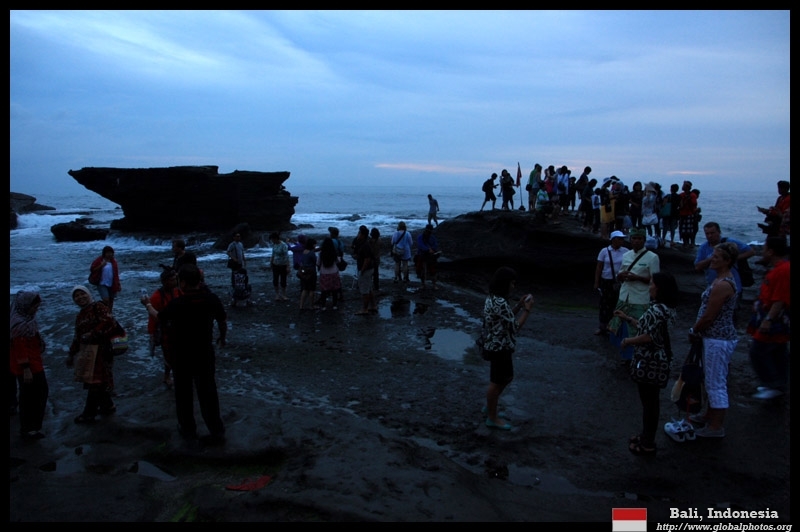 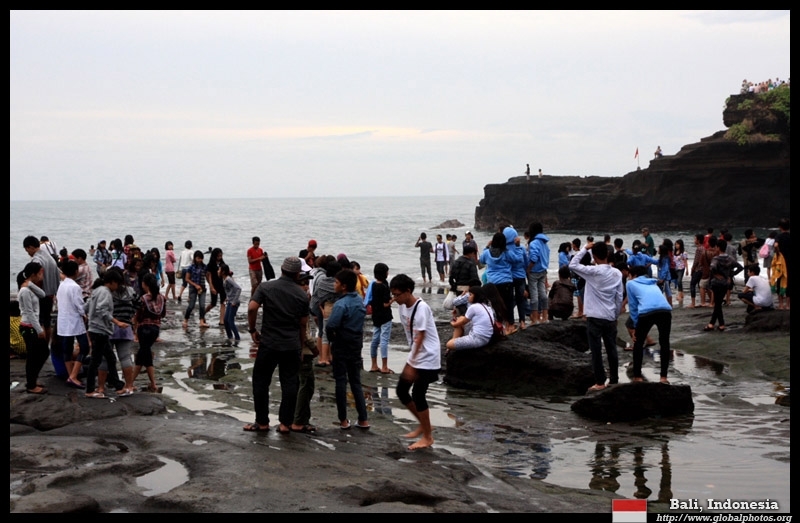 A lot of locals were already here ready to watch the sunset on a cloudy day. 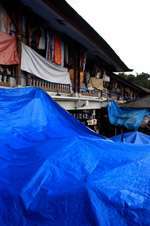 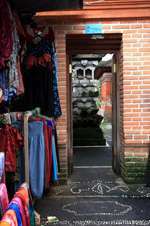 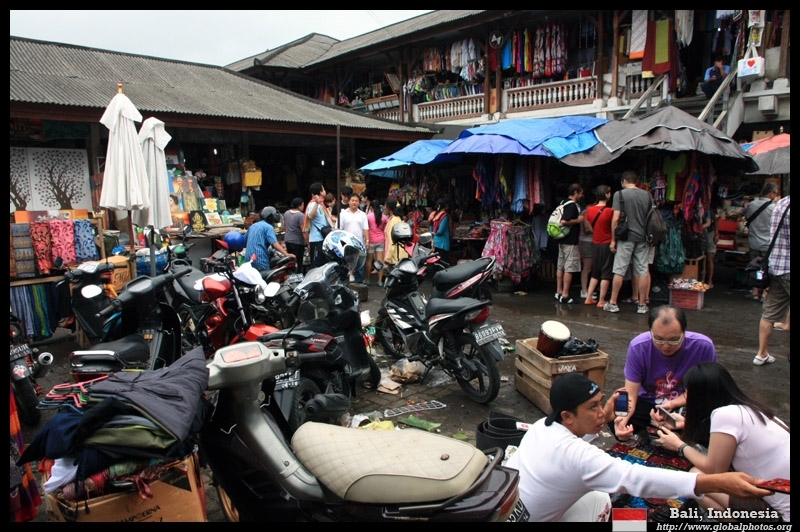 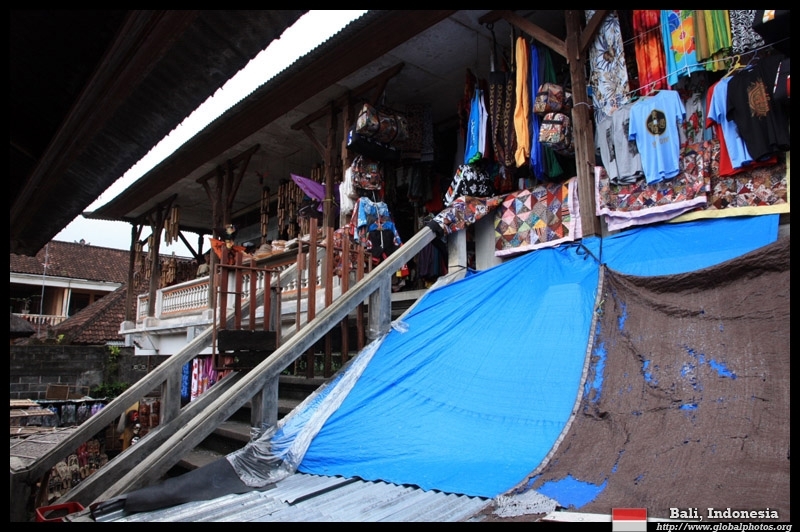 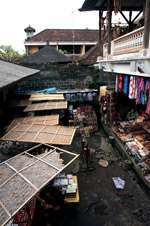 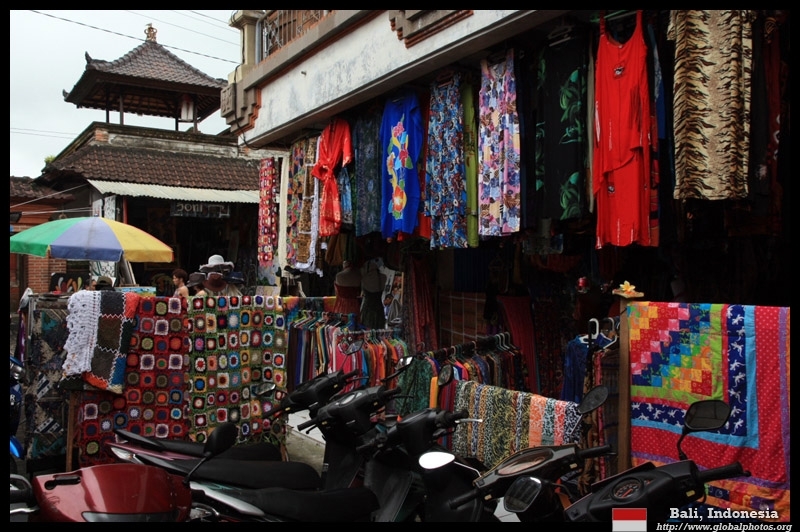 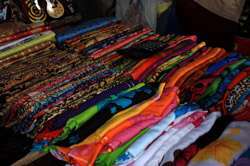 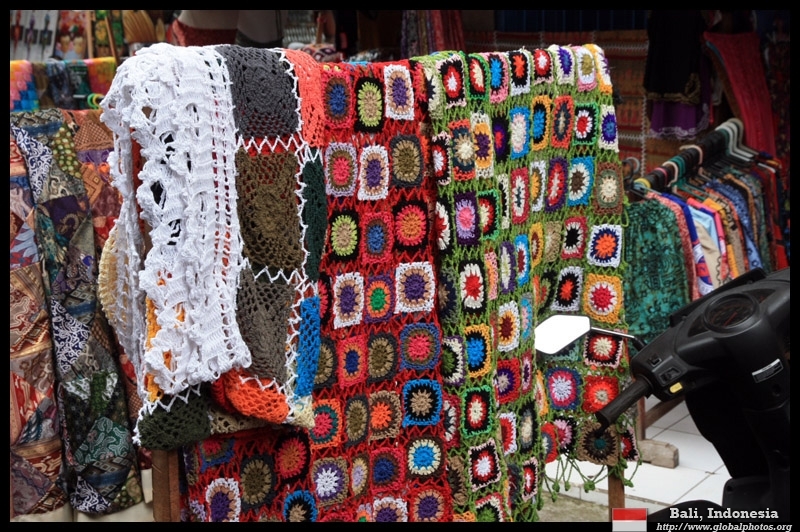 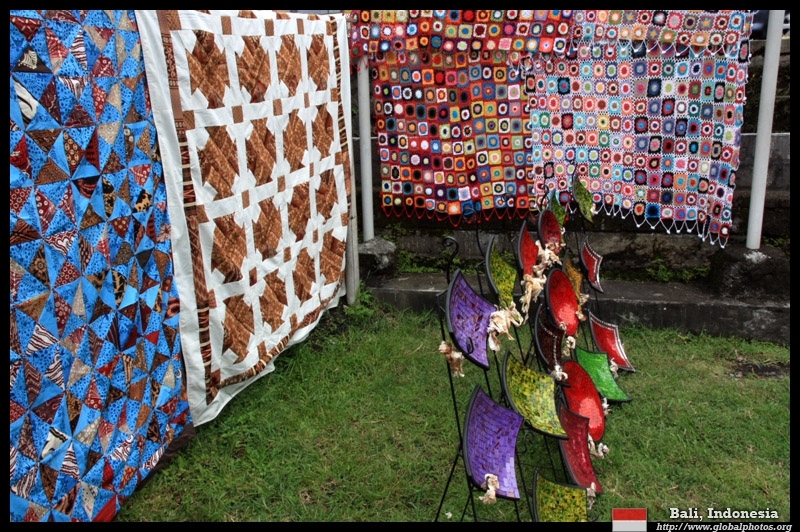 Cars are not allowed to access the beach directly, but drop off at a market where more souvenirs were available for sale. 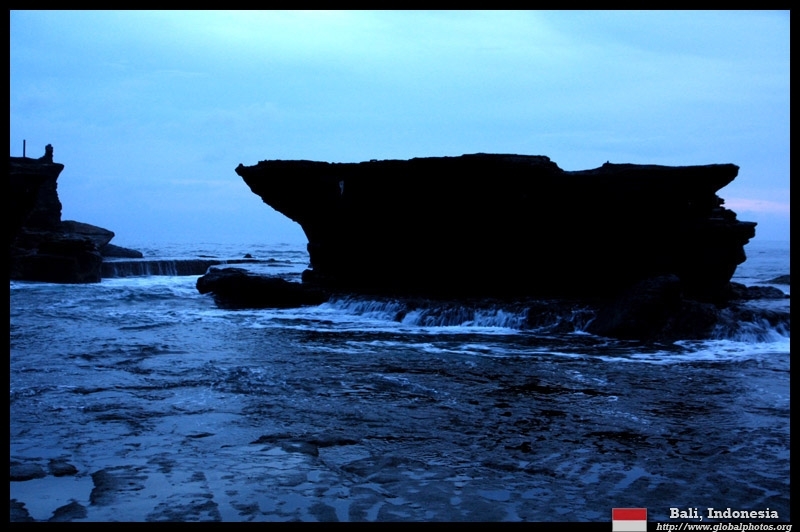 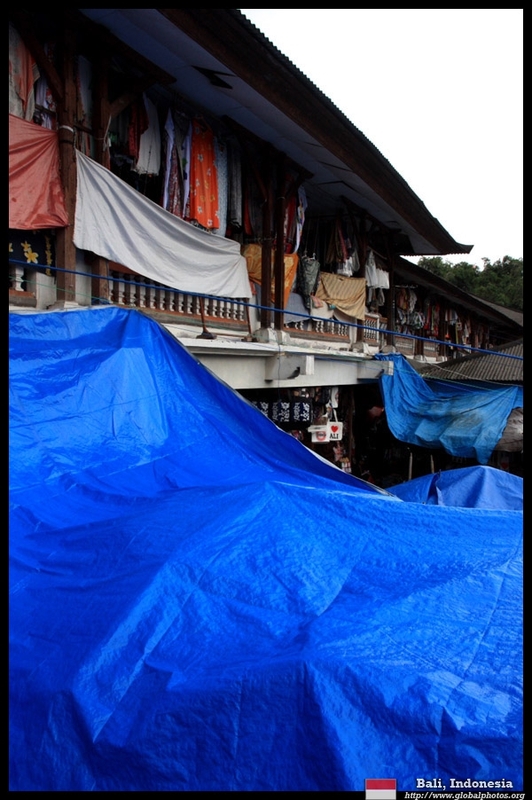 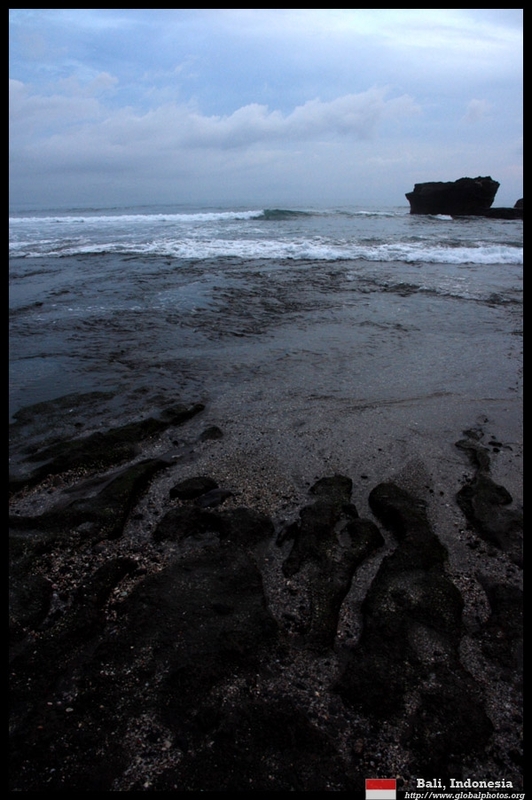 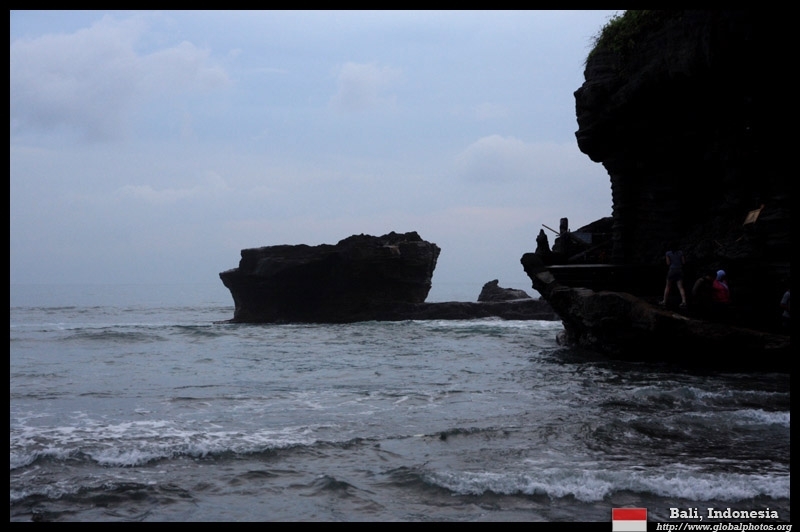 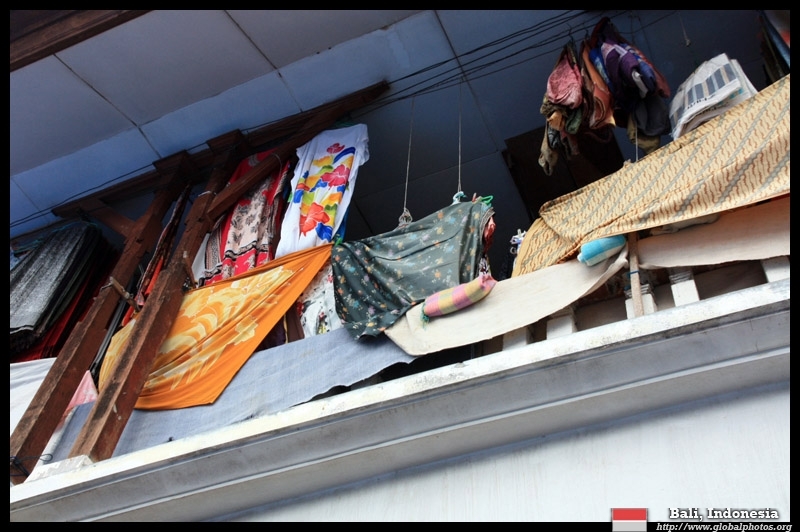 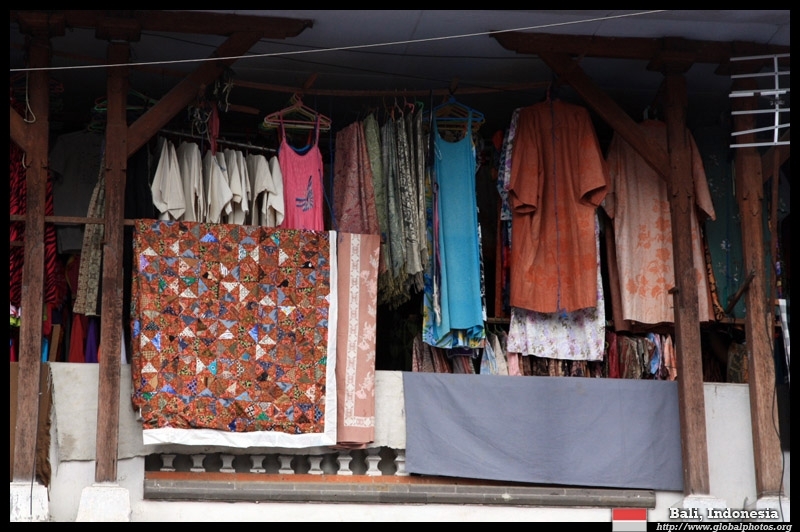 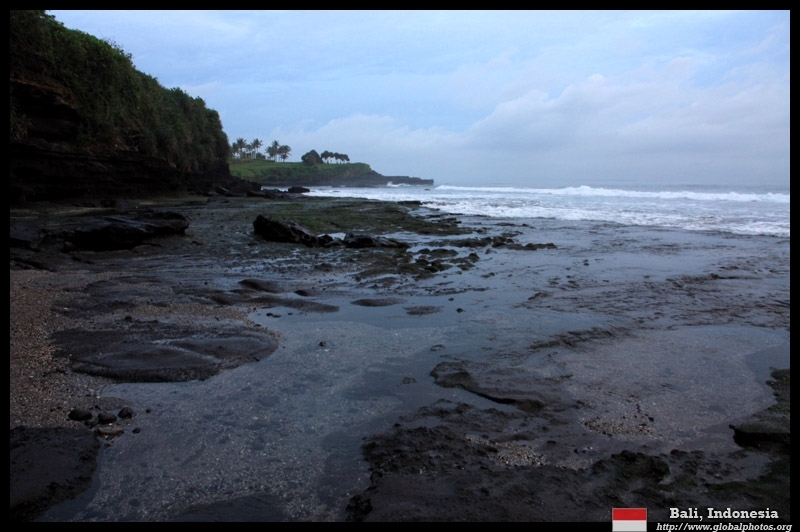 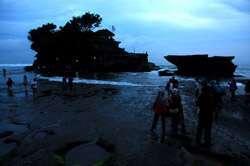 After a 15-minute walk through the market, the sea came into view. 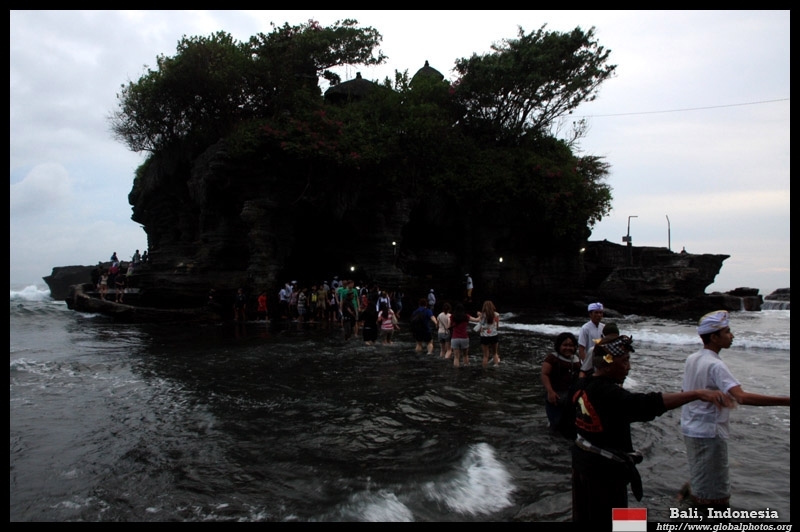 Plenty of people were already there, some in the water frolicking around. 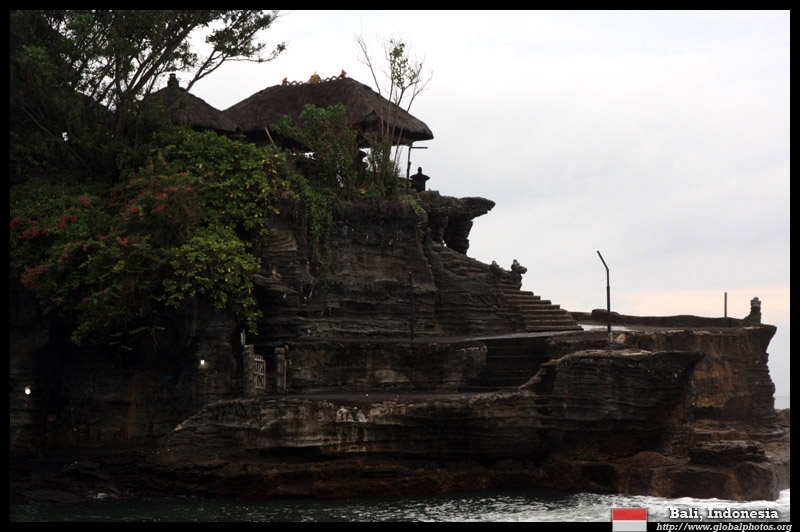 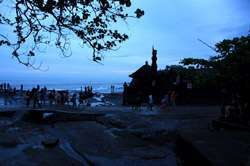 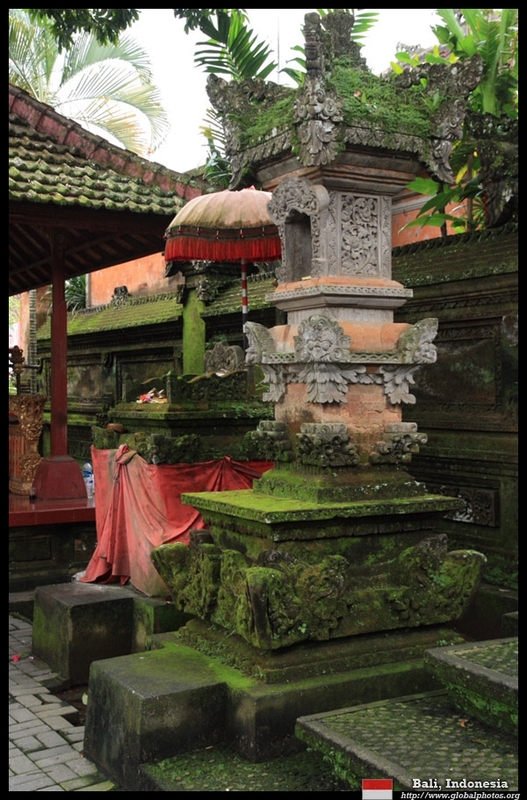 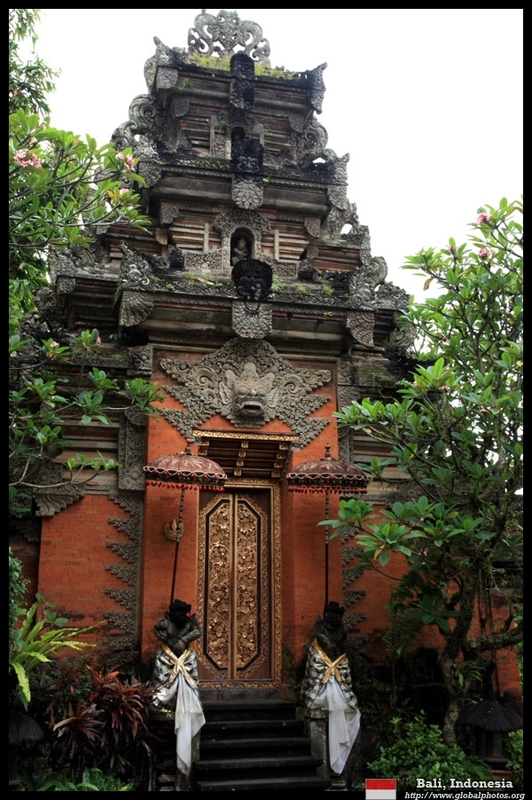 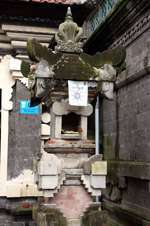 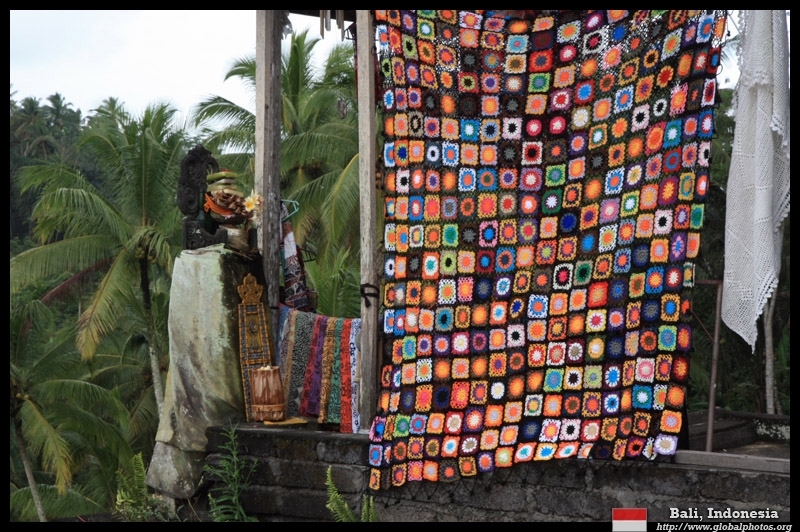 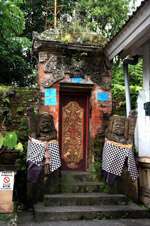 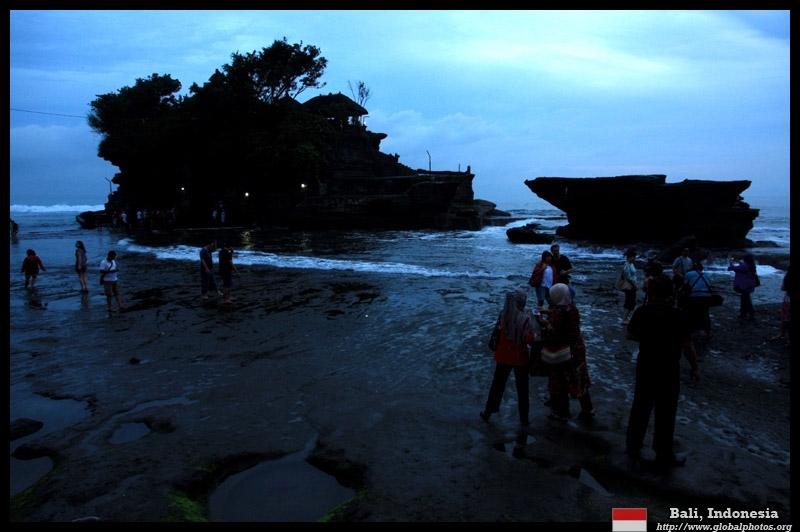 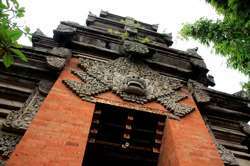 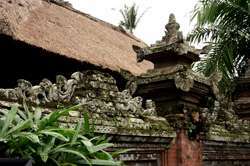 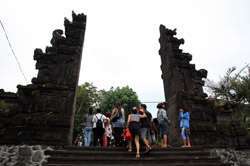 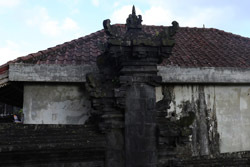 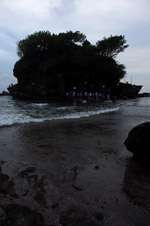 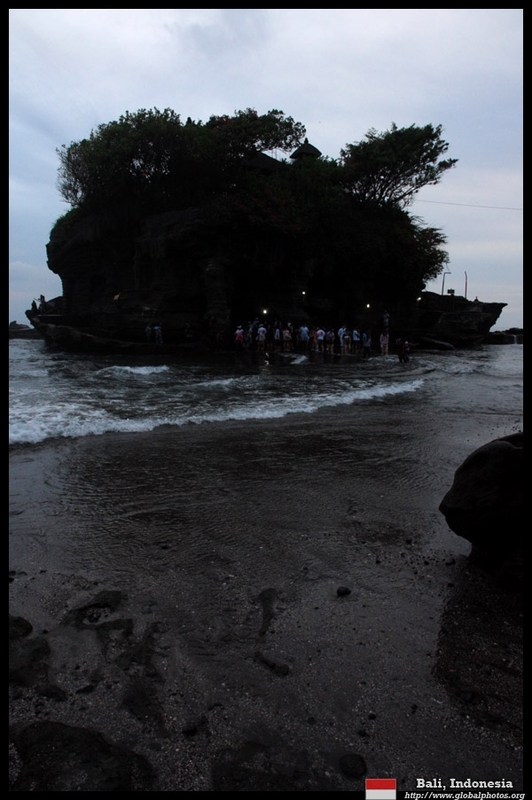 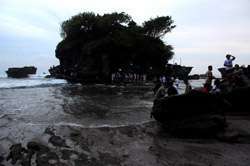 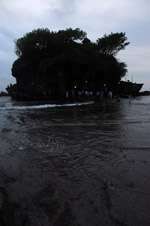 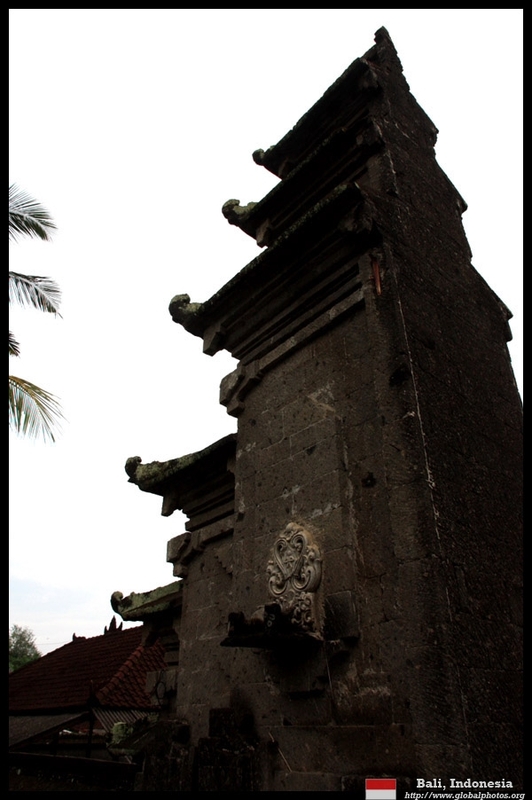 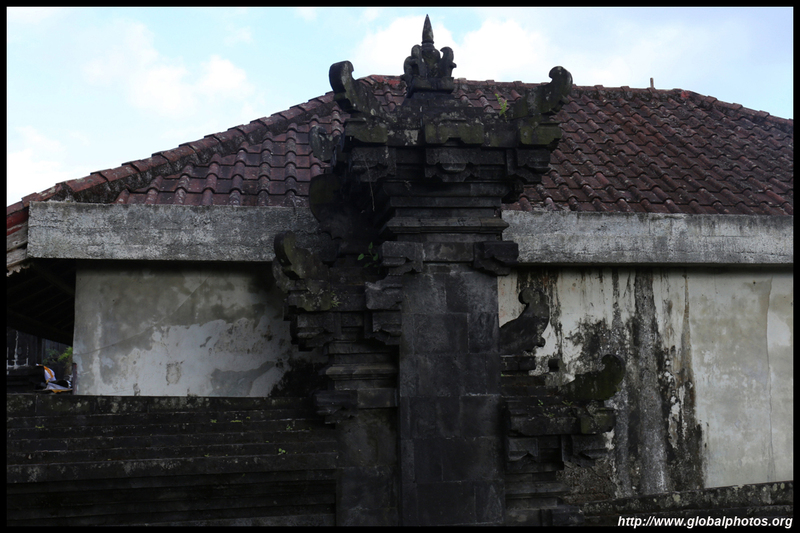 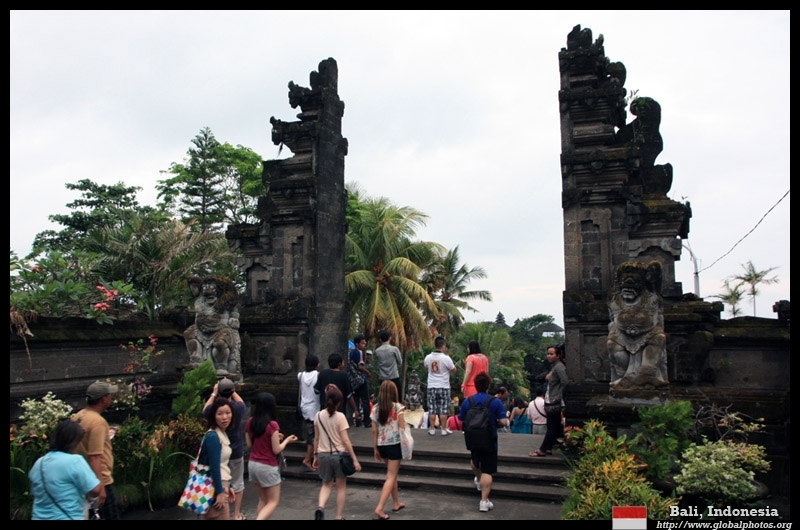 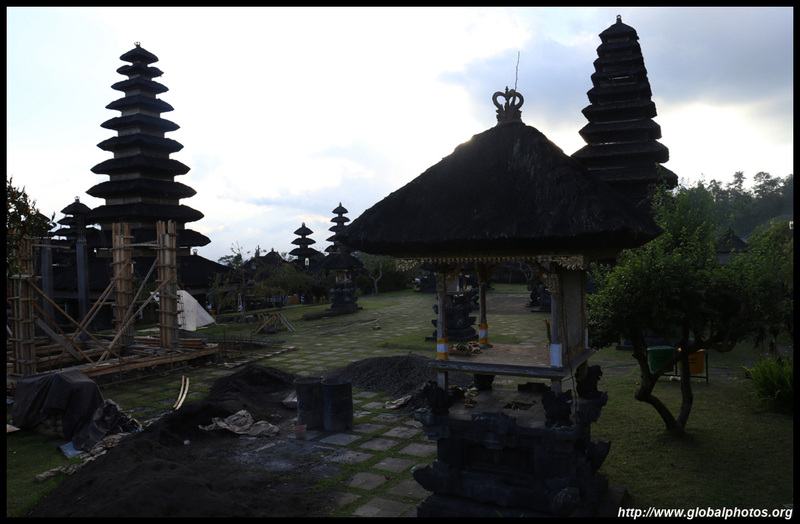 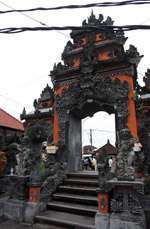 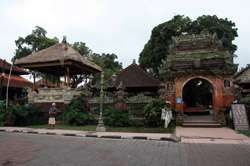 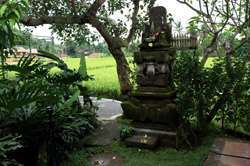 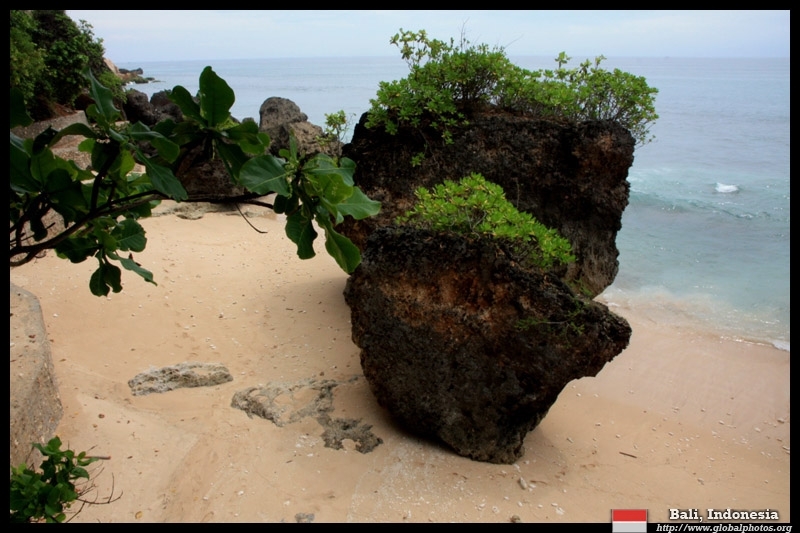 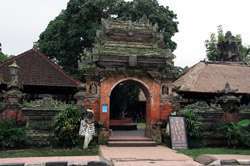 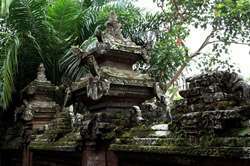 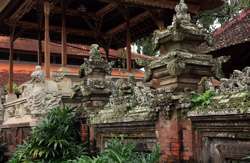 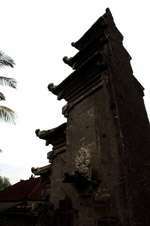 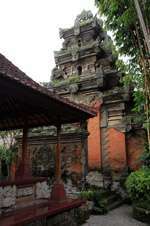 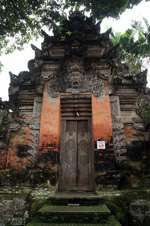 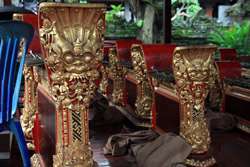 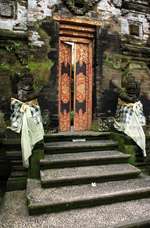 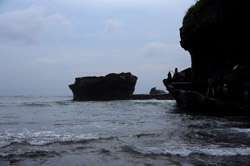 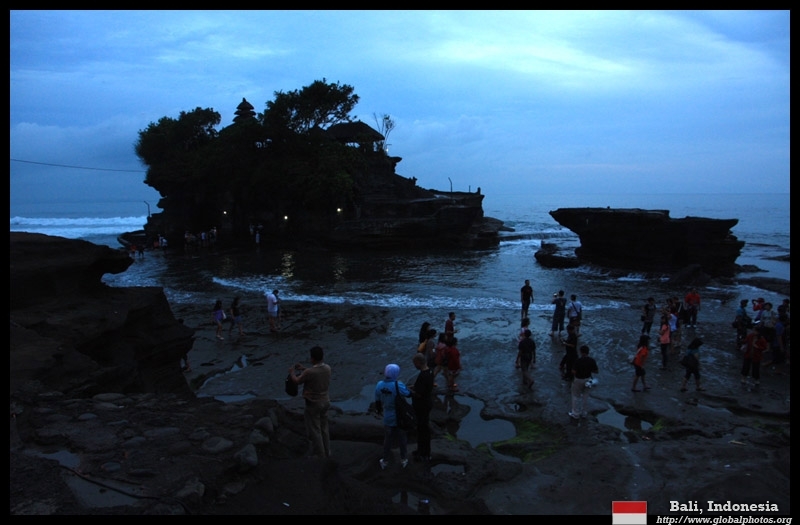 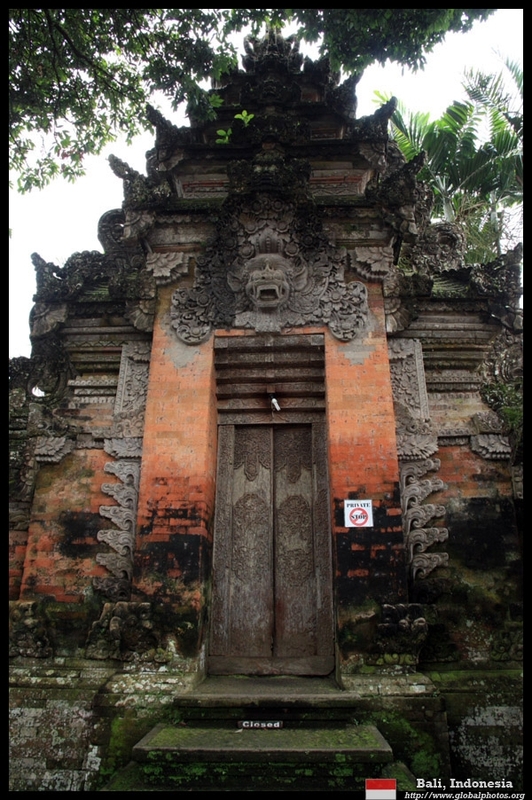 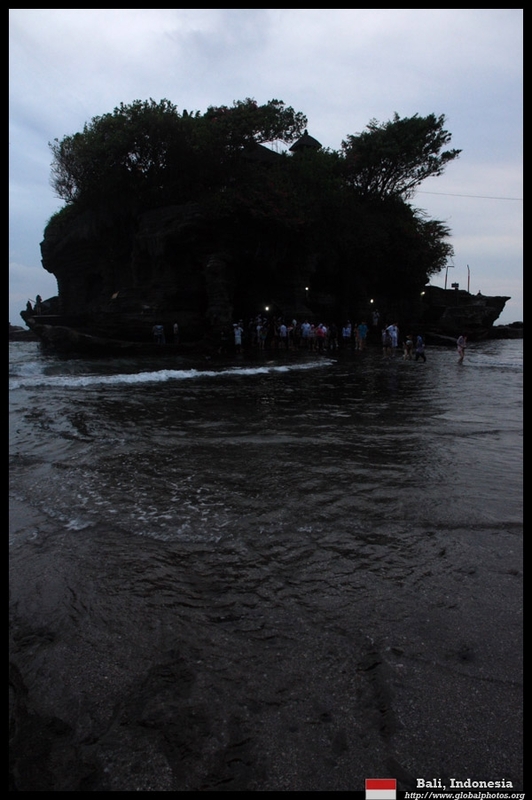 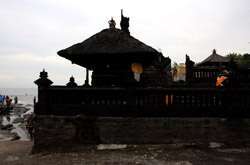 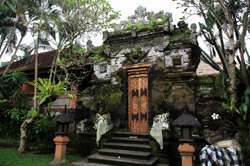 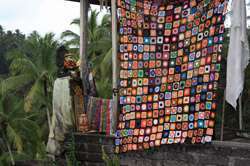 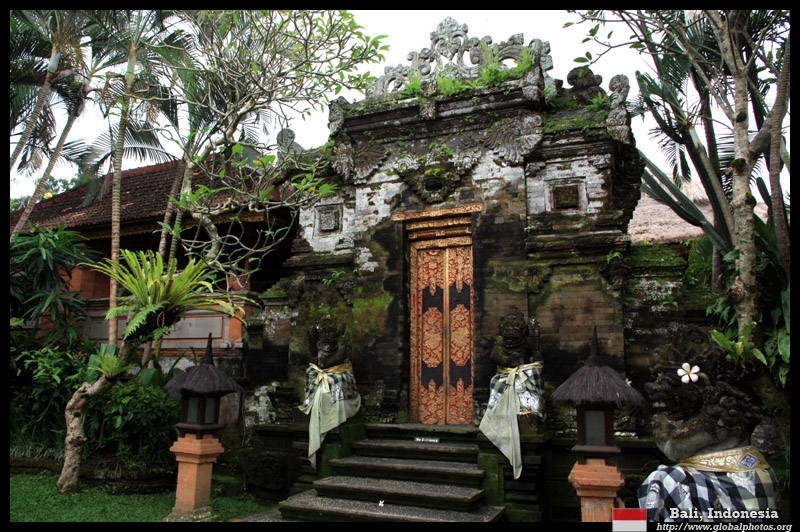 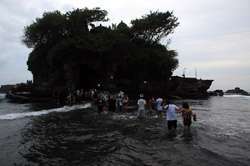 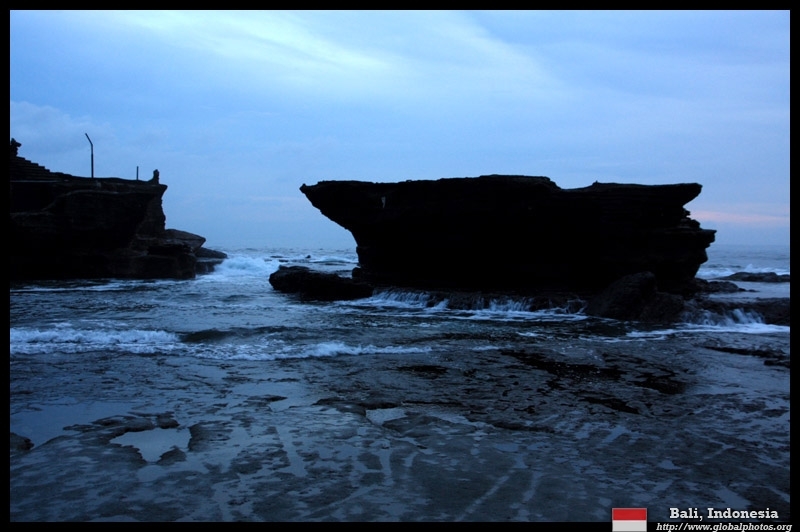 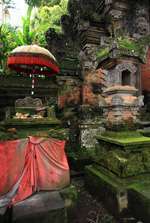 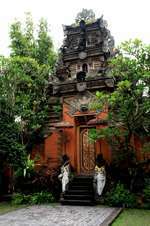 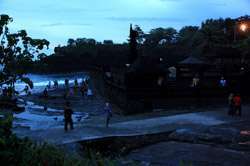 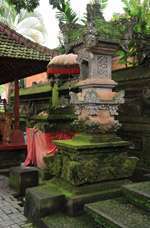 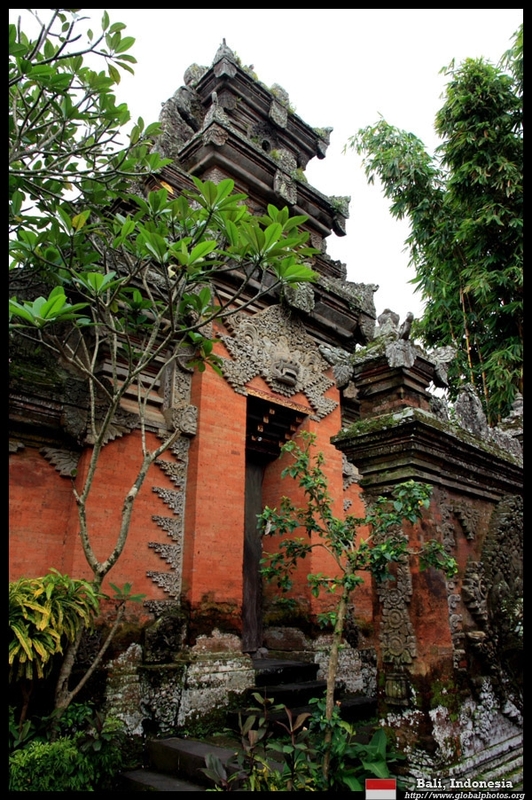 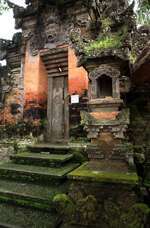 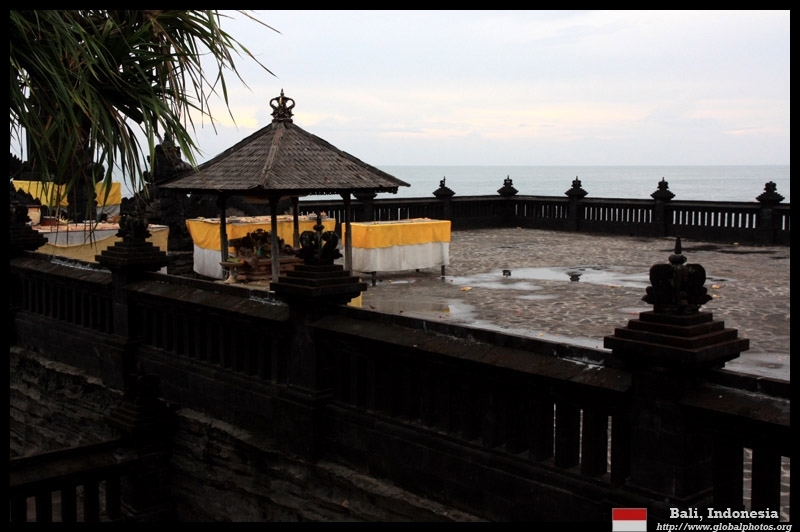 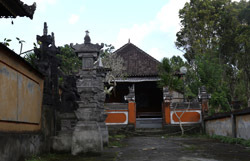 The temple was founded in the 16th century and sits on the island just offshore. 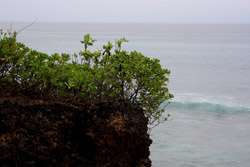 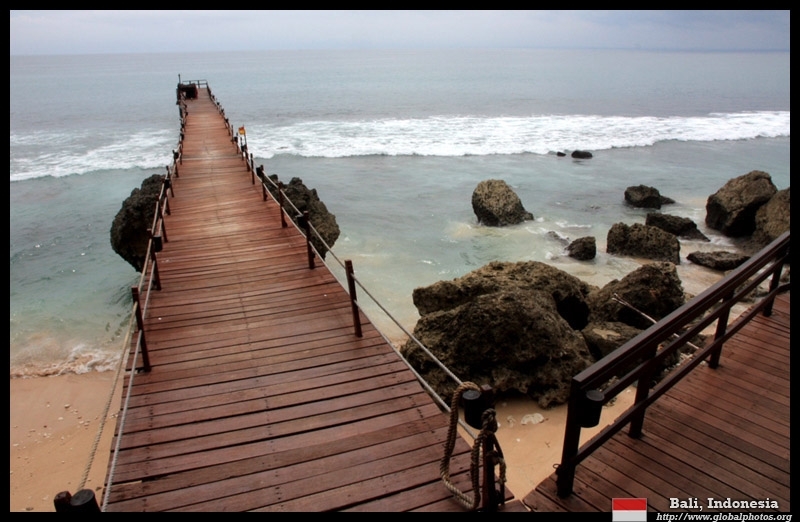 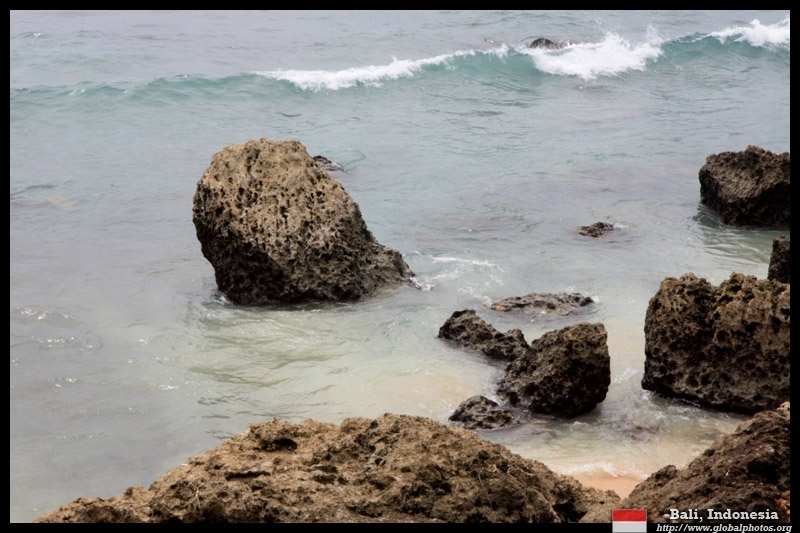 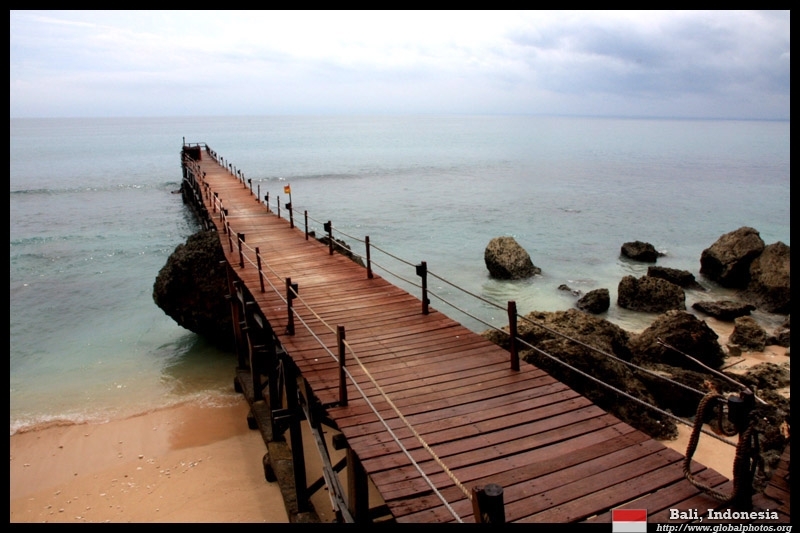 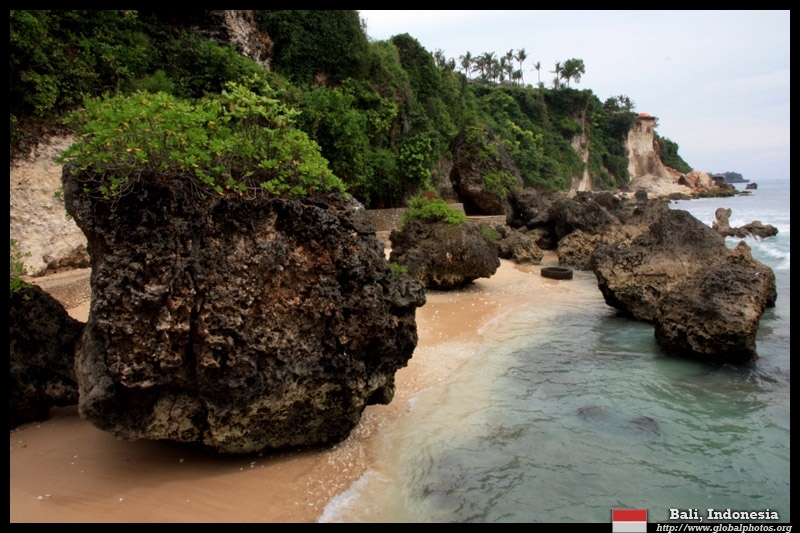 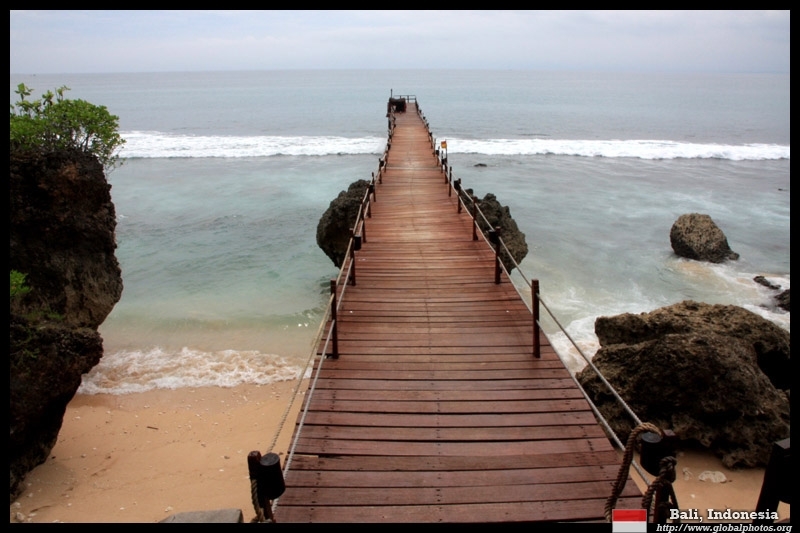 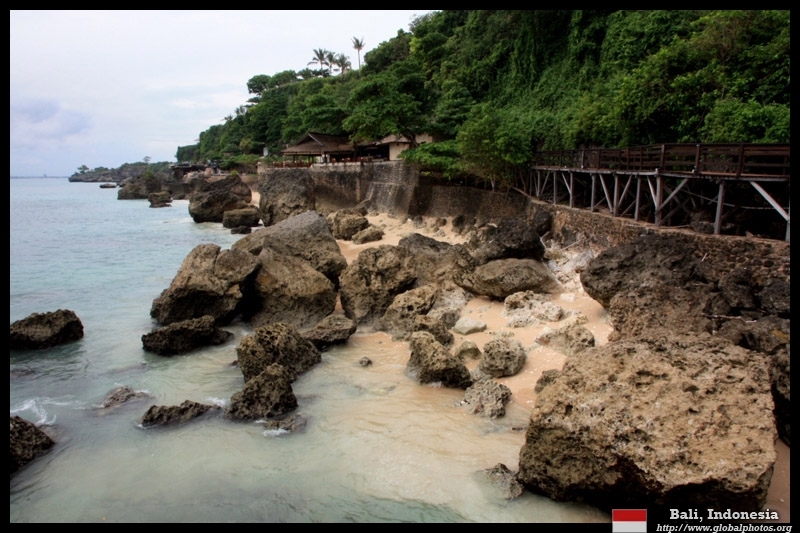 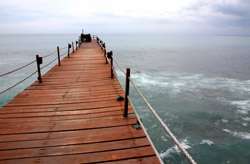 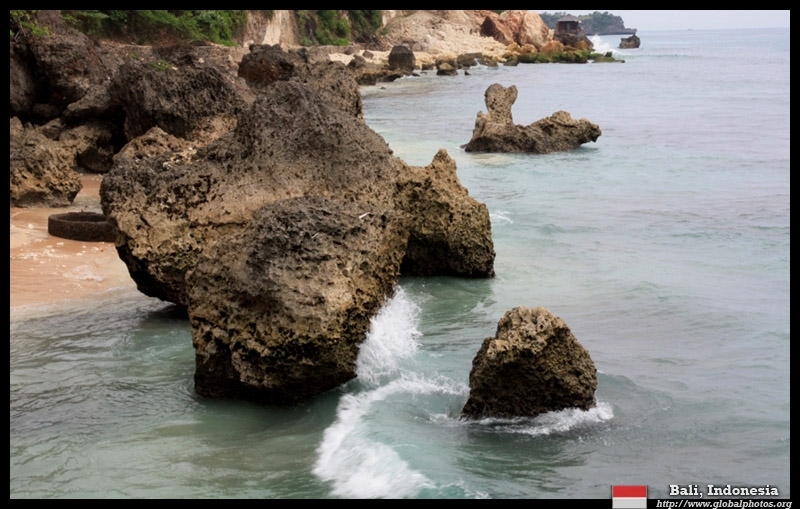 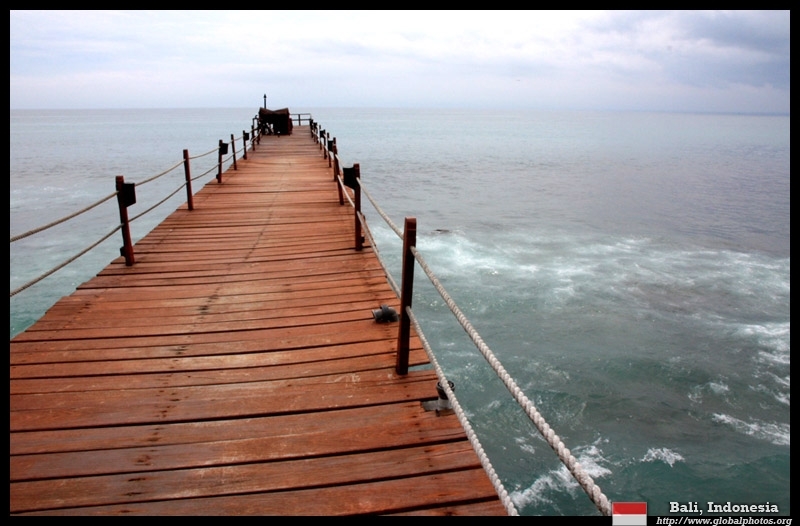 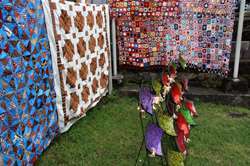 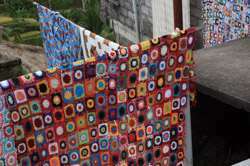 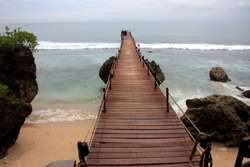 To get there, visitors need to pull up their pants and brave the wavy waters. 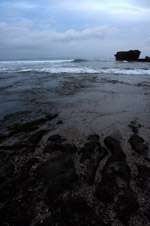 Even ladies in miniskirts could not escape the torrents of water smashing against them. 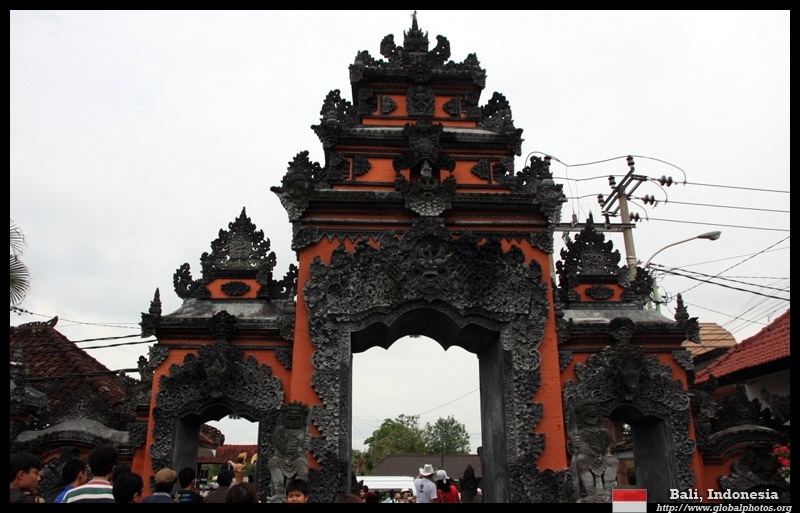 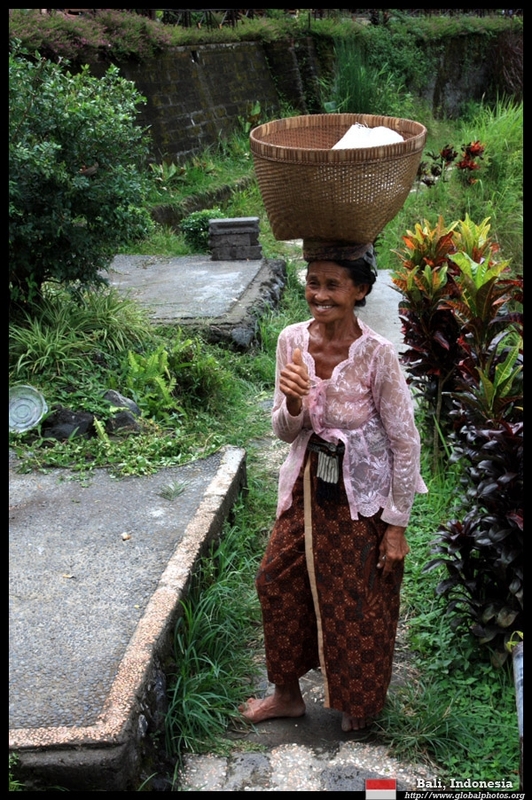 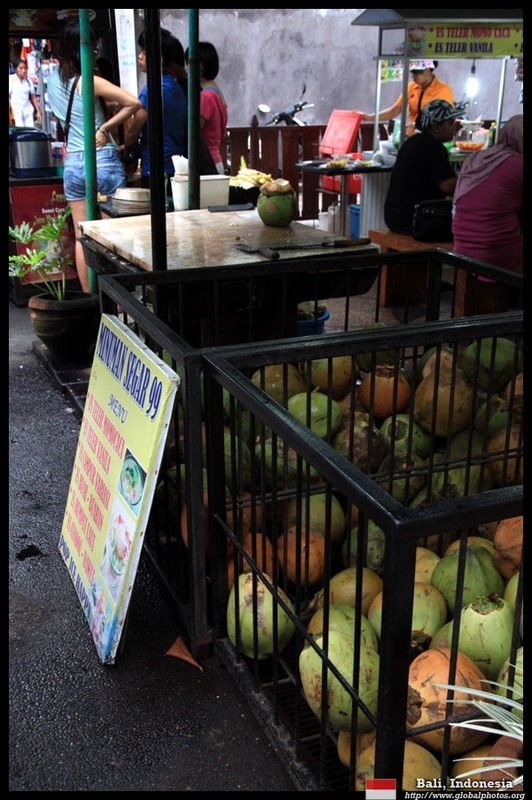 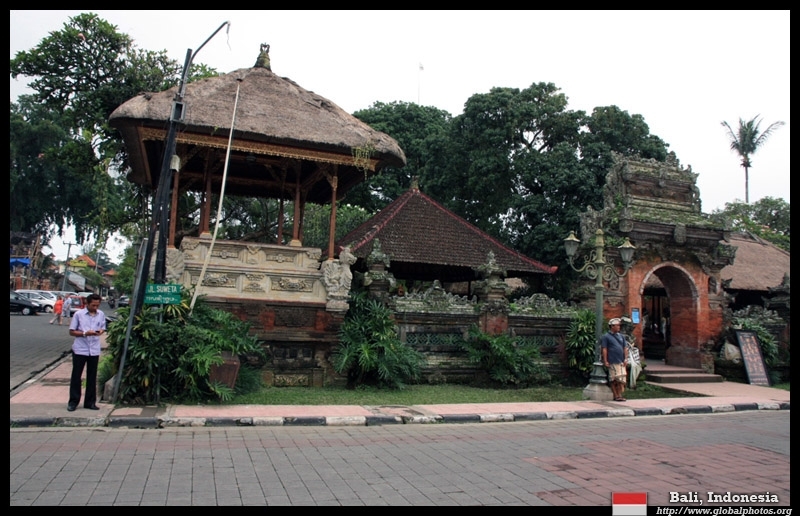 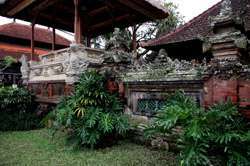 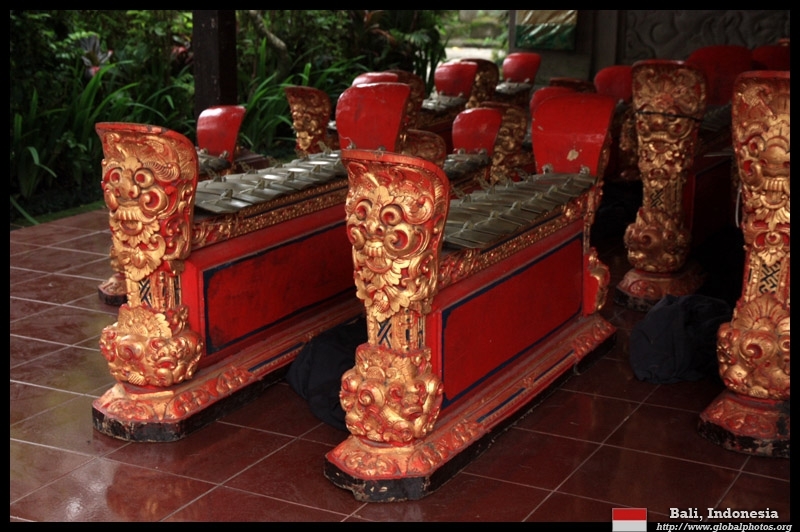 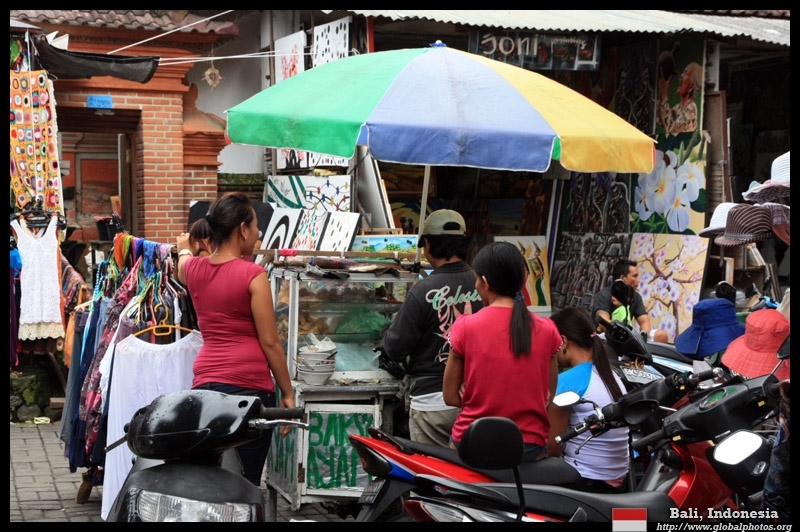 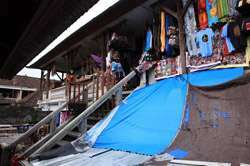 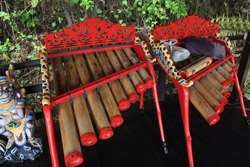 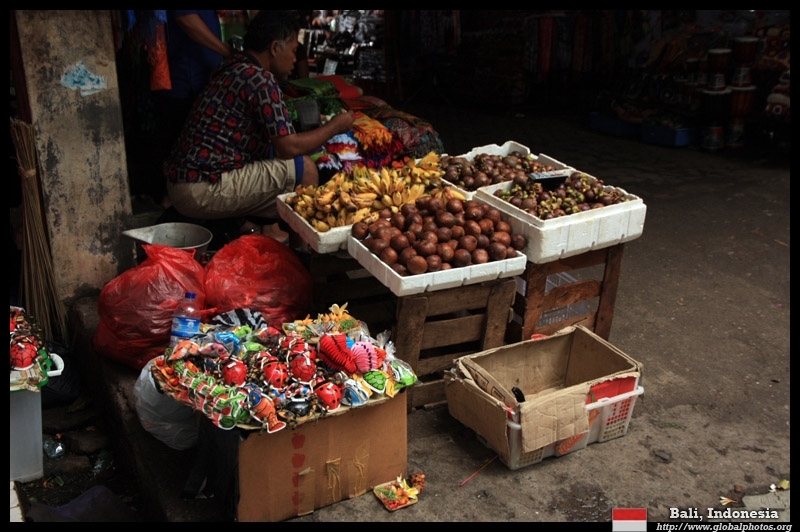 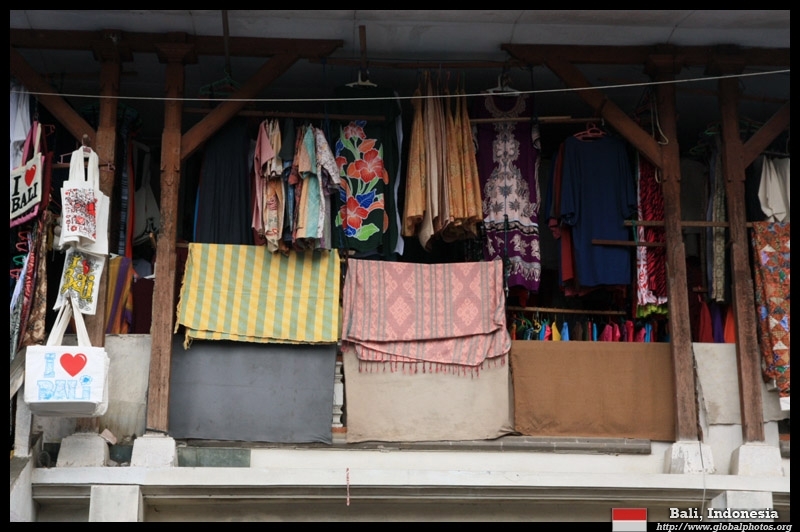 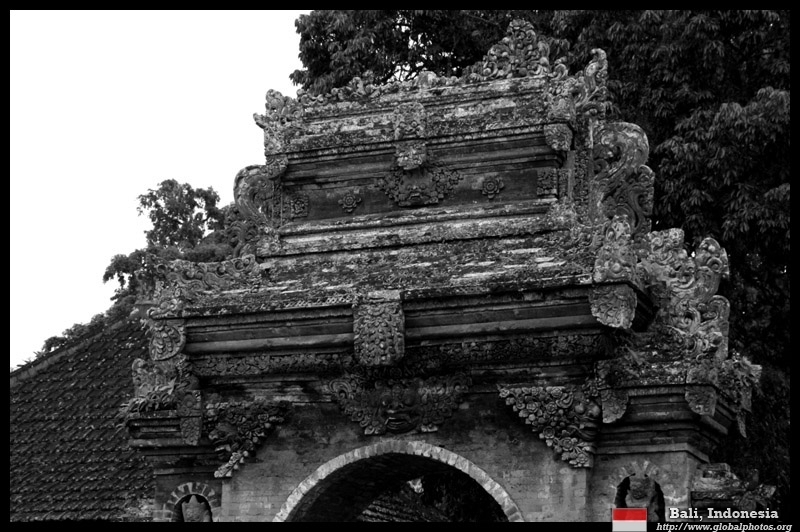 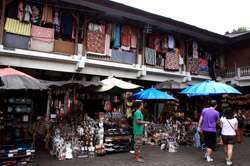 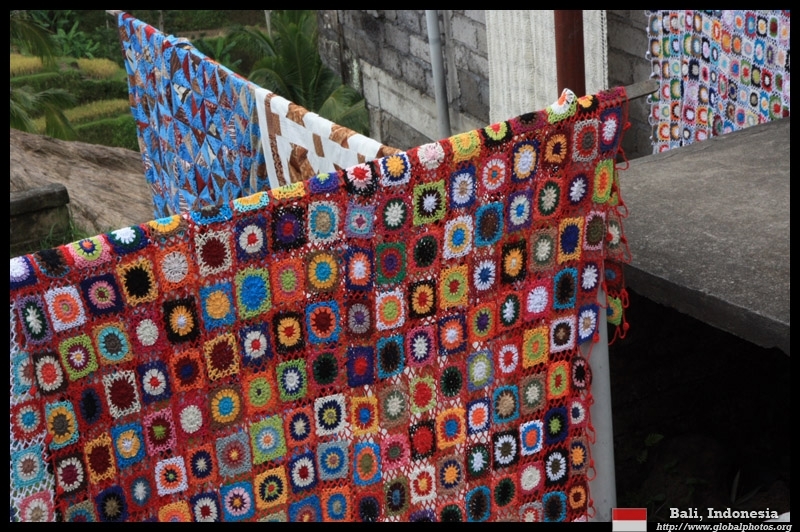 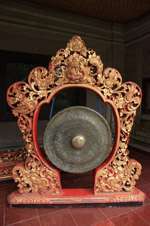 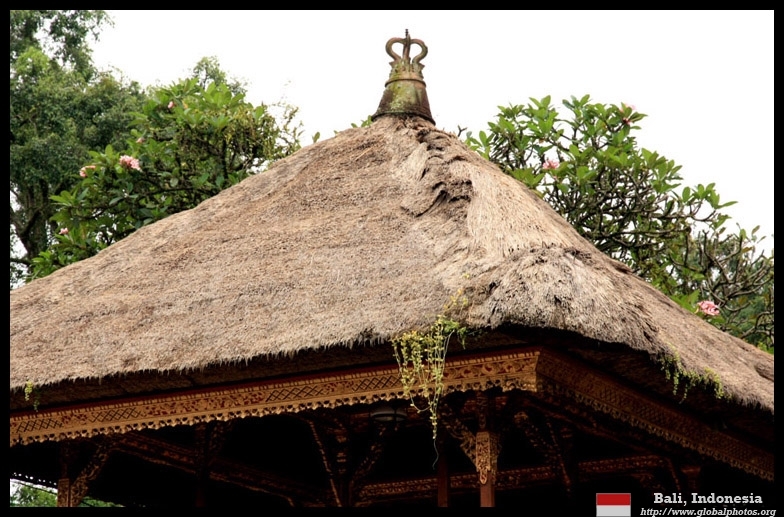 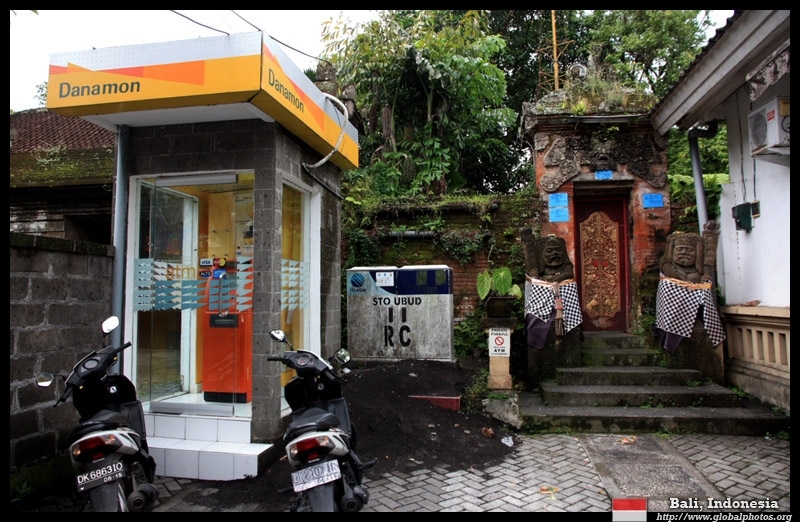 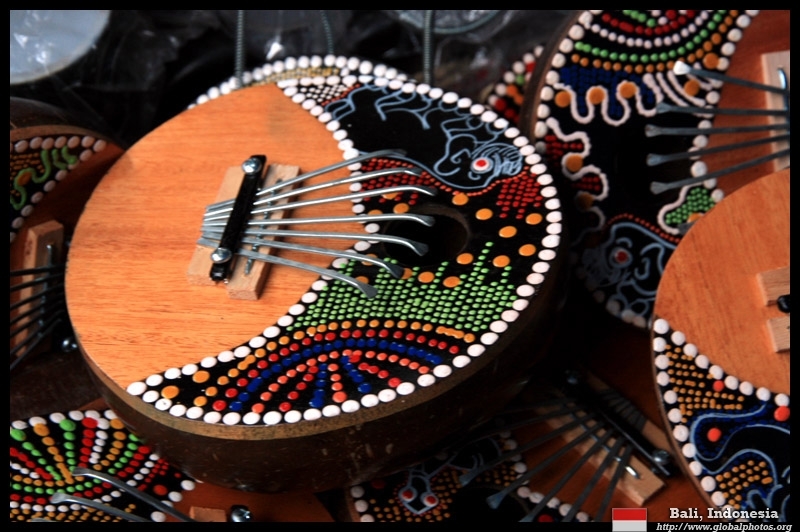 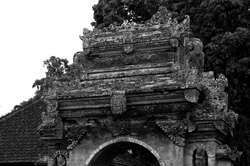 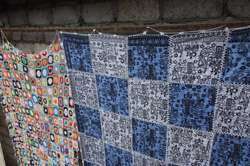 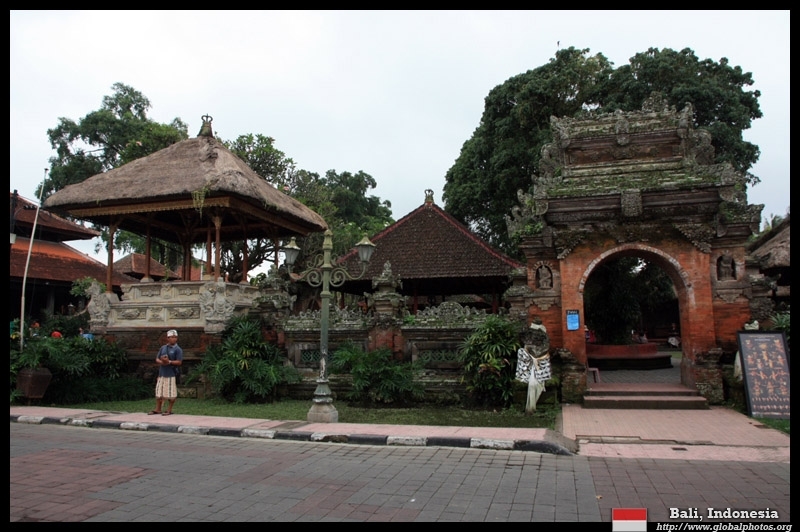 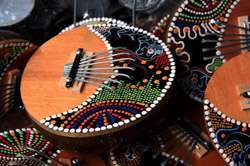 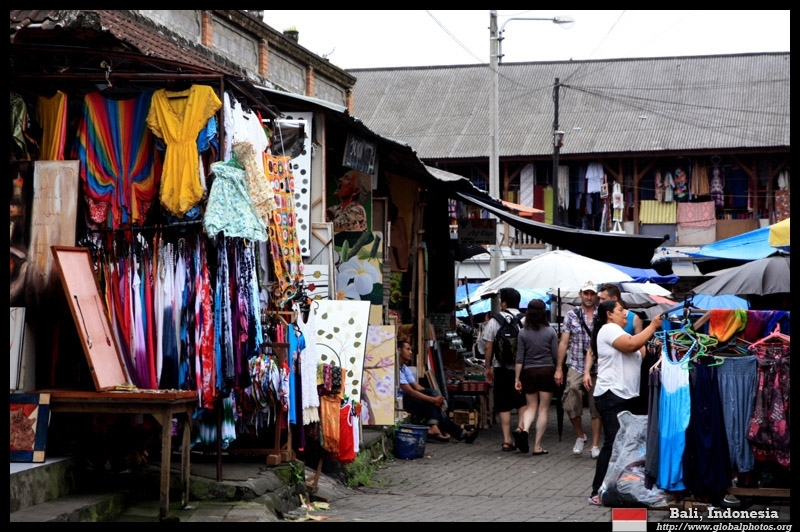 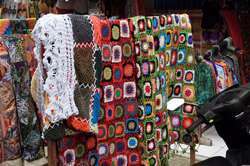 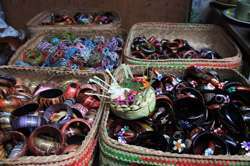 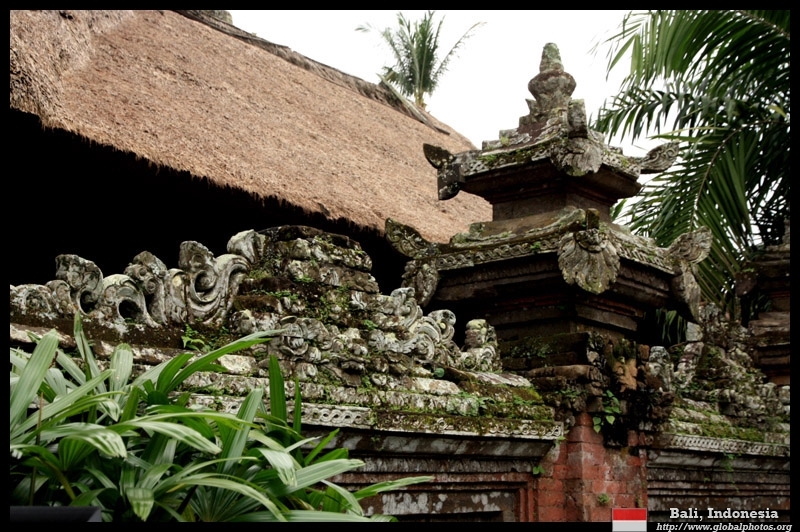 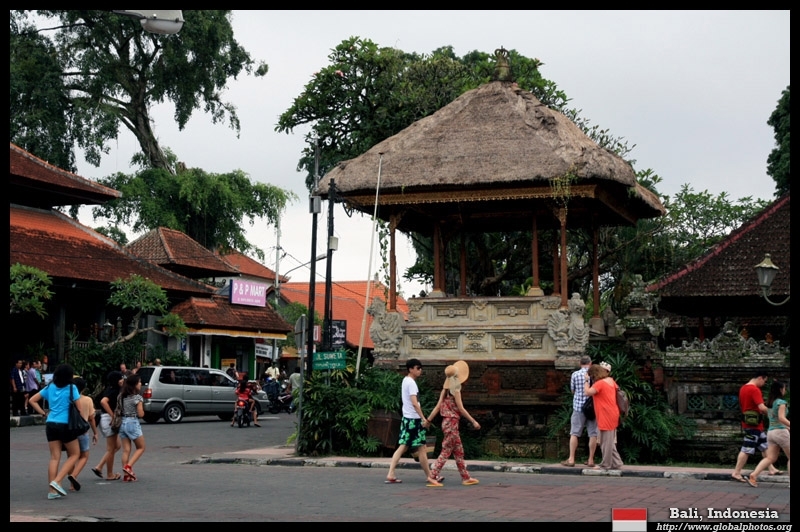 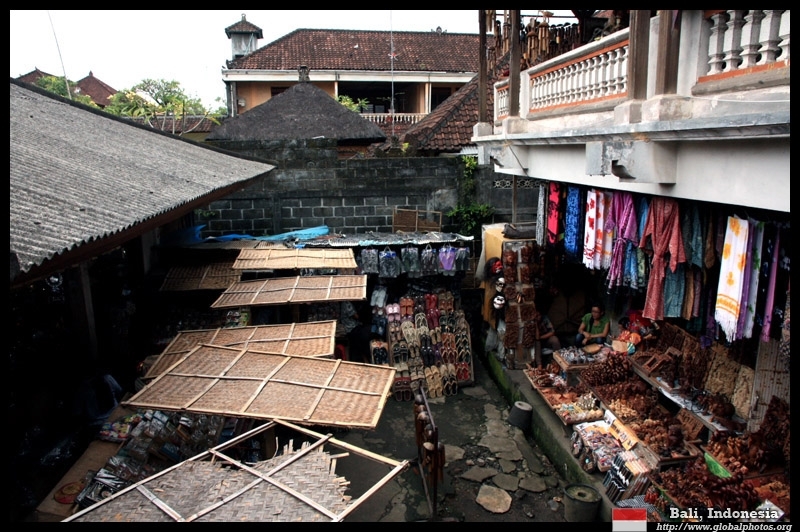 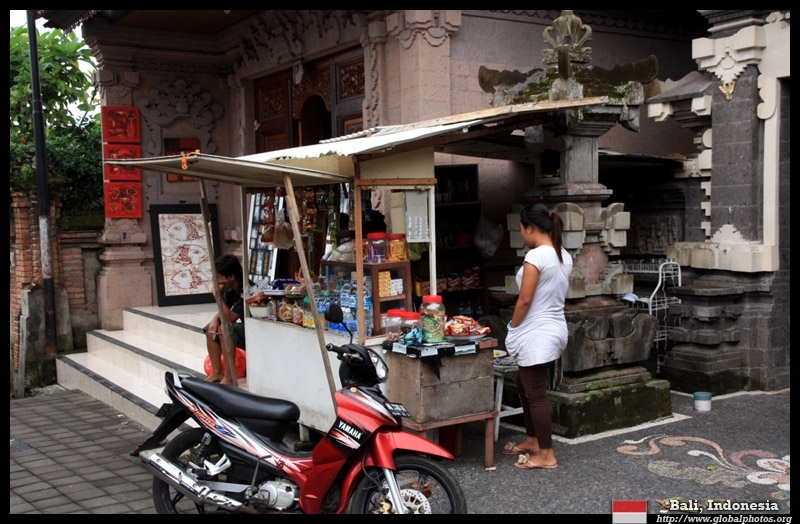 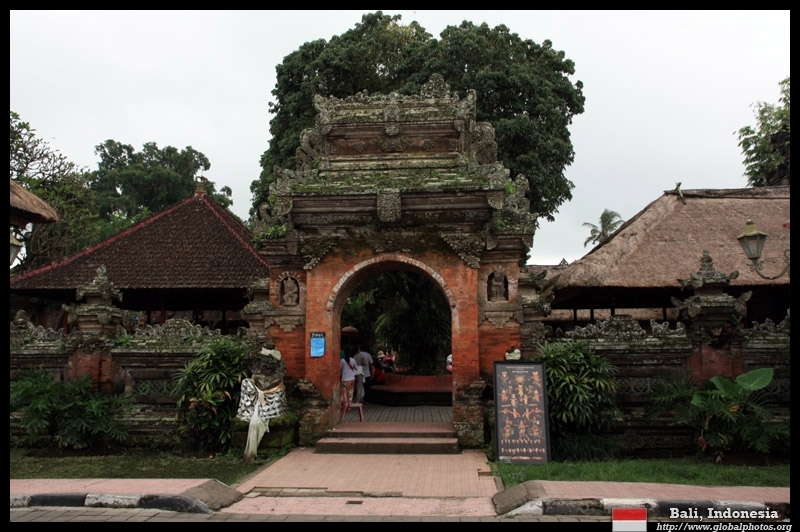 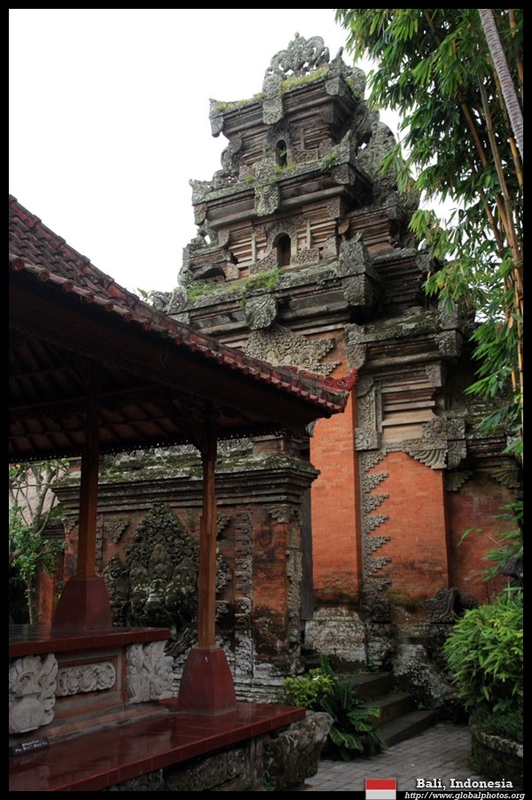 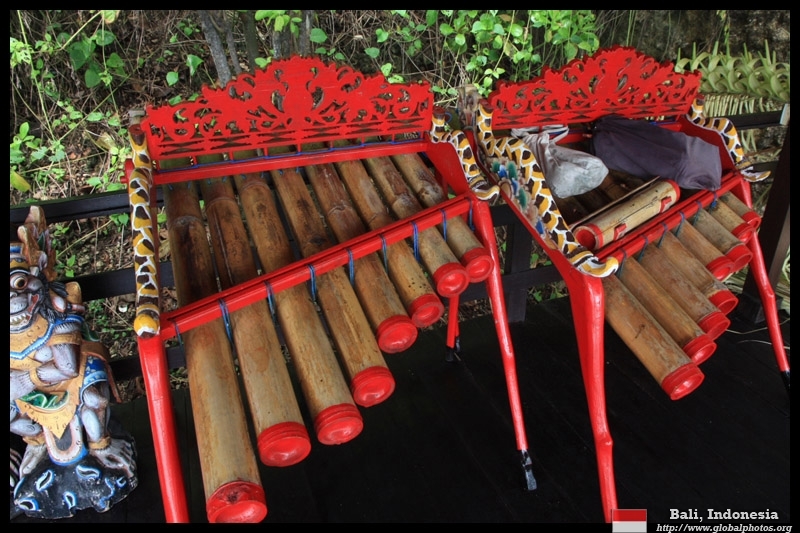 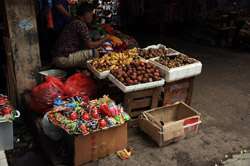 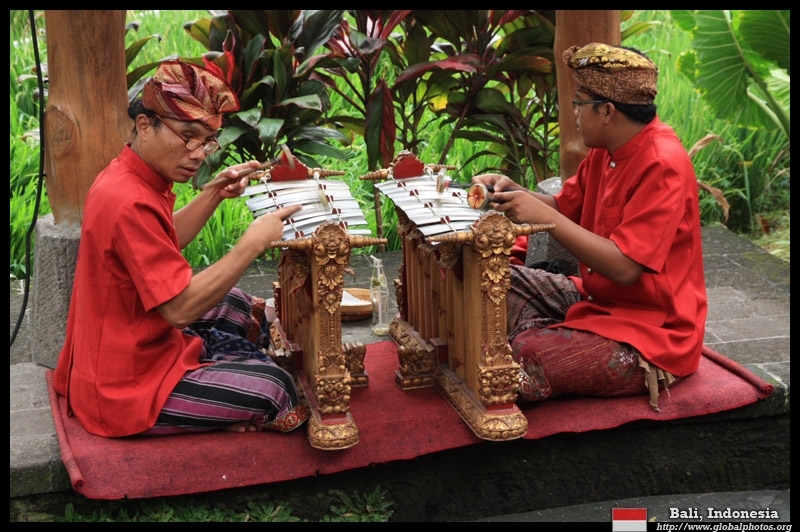 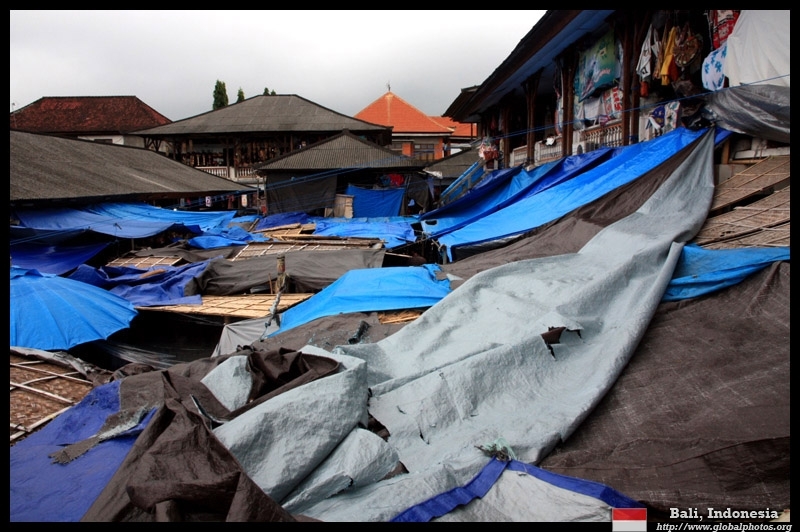 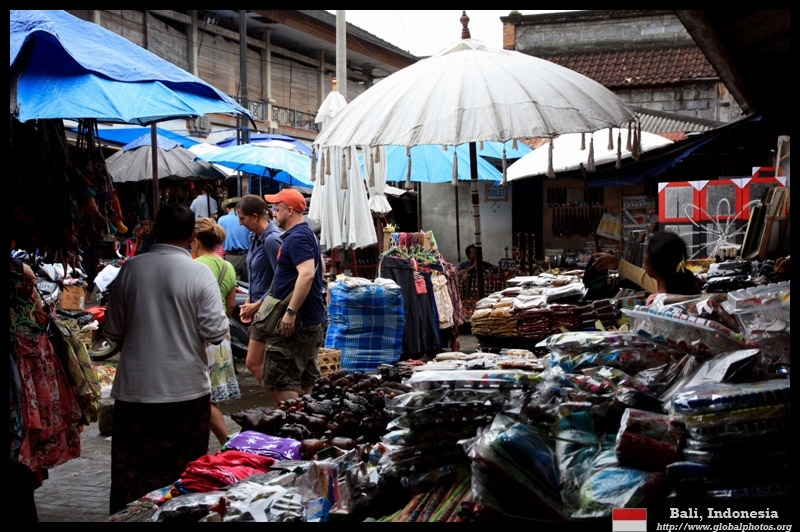 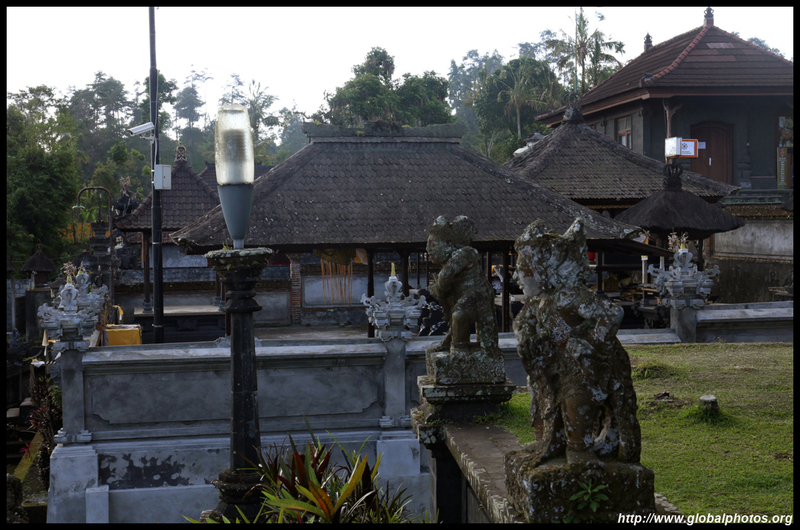 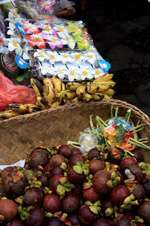 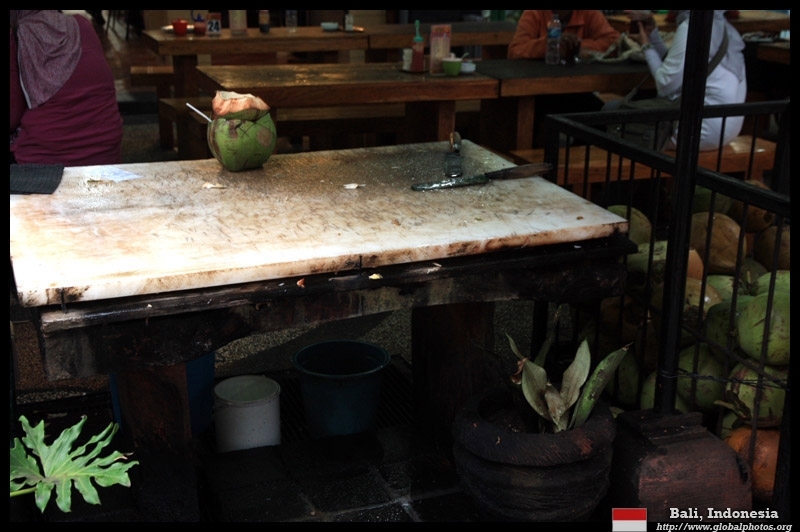 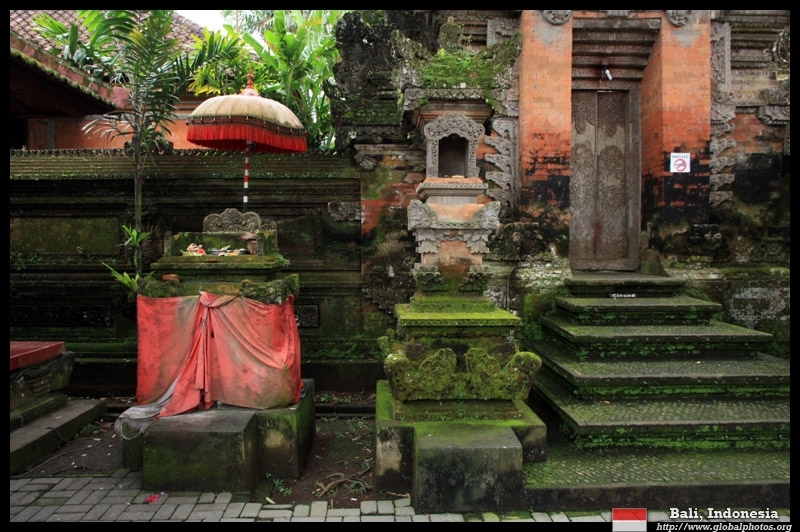 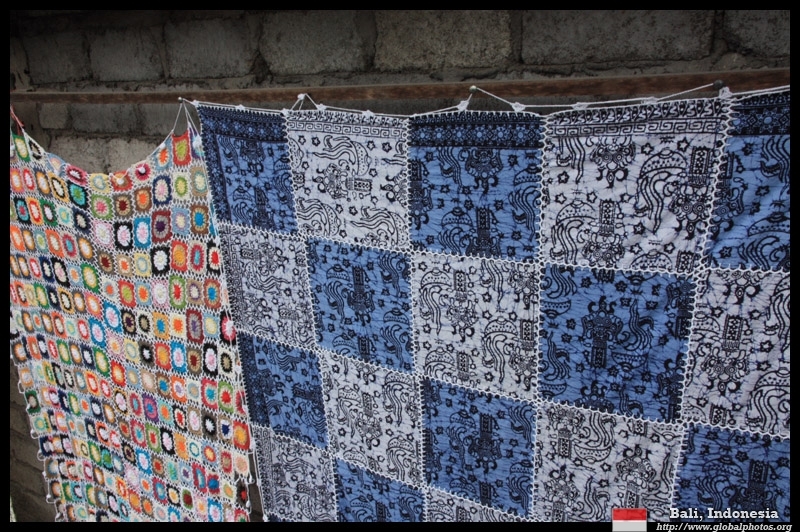 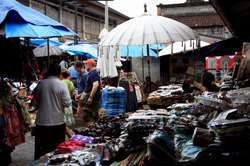 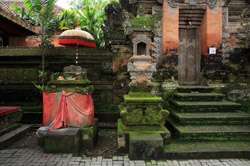 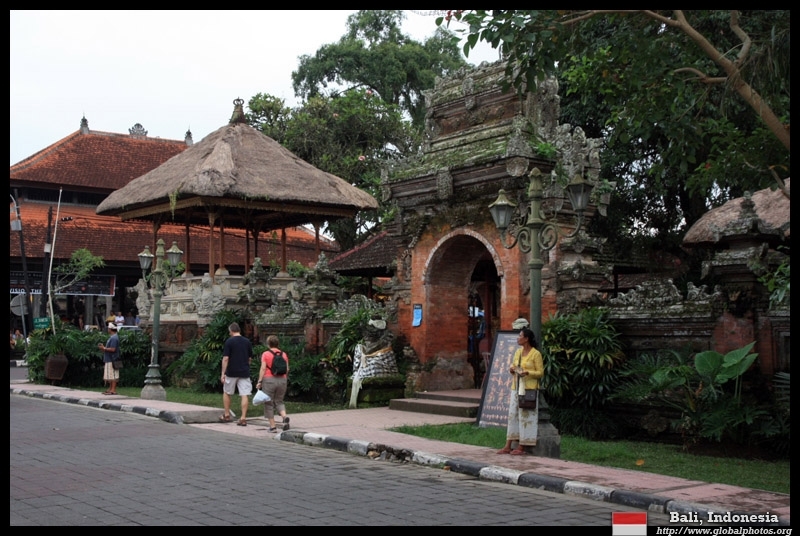 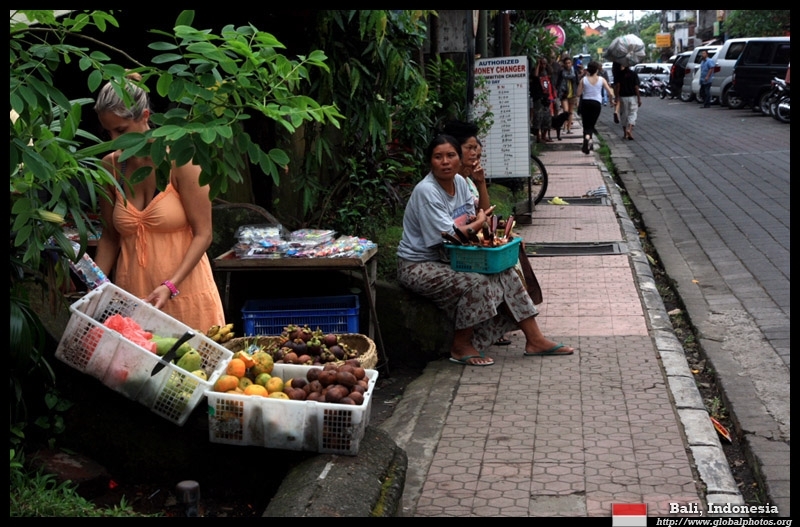 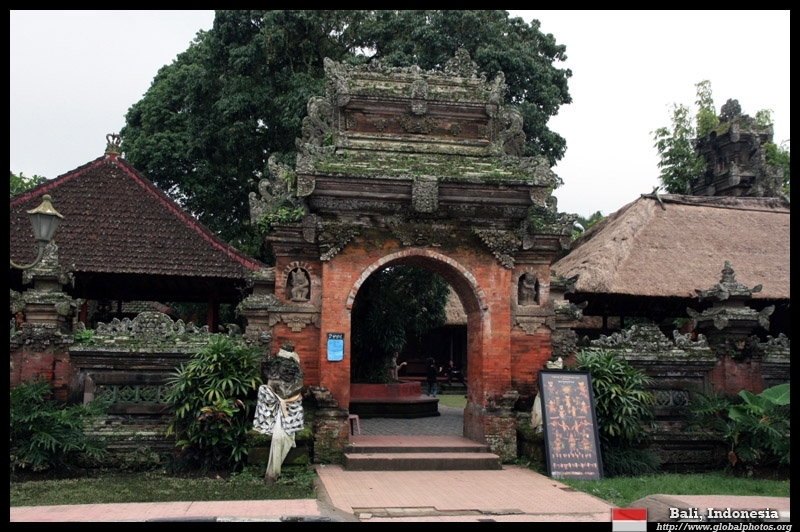 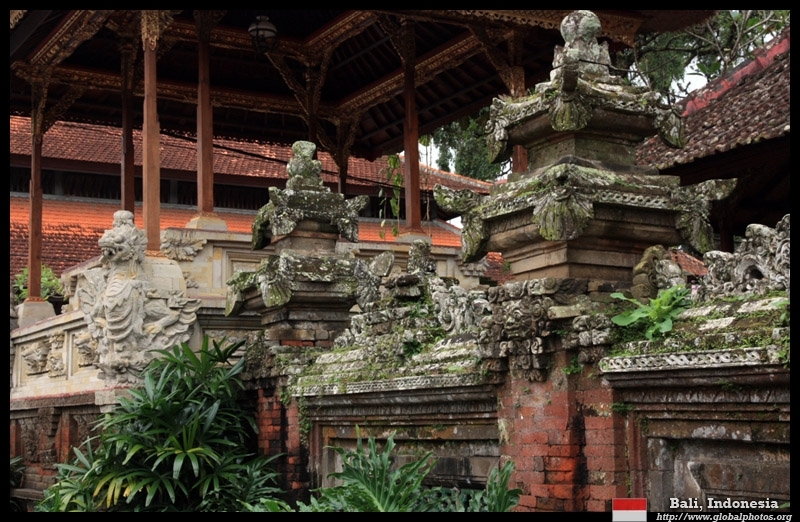 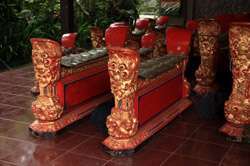 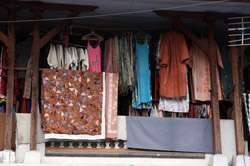 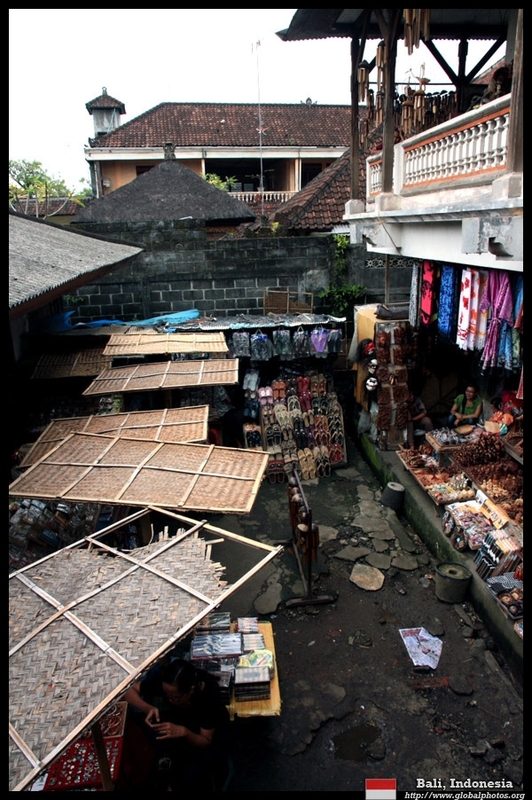 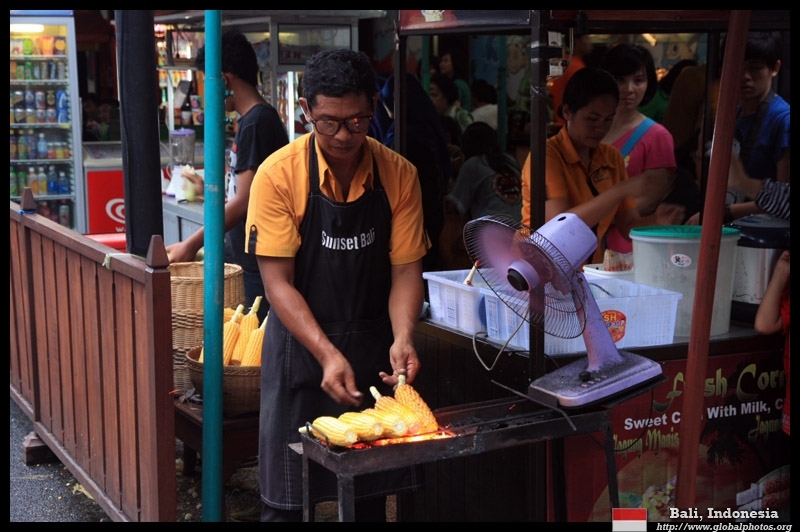 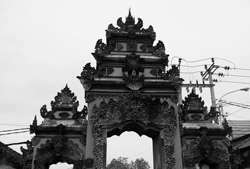 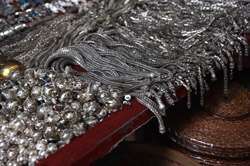 The rupiah's denominations require a bit of adjusting for those coming from the West. 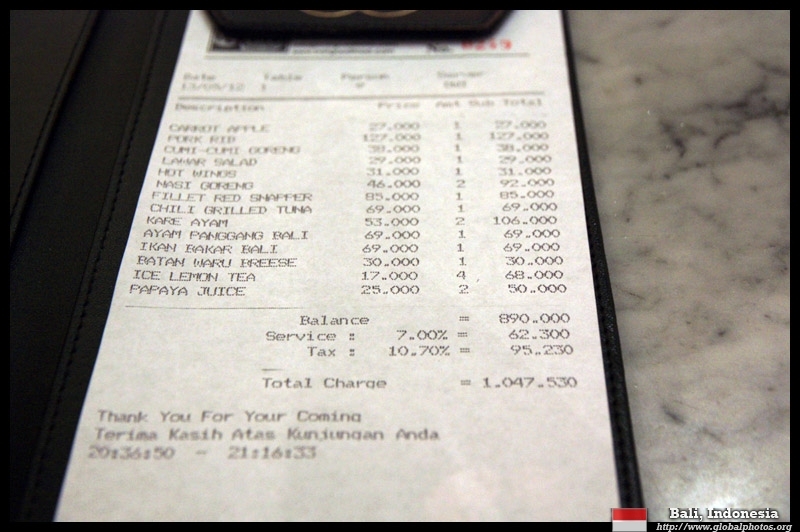 Add a few zeroes and it's still a good deal. 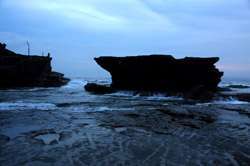 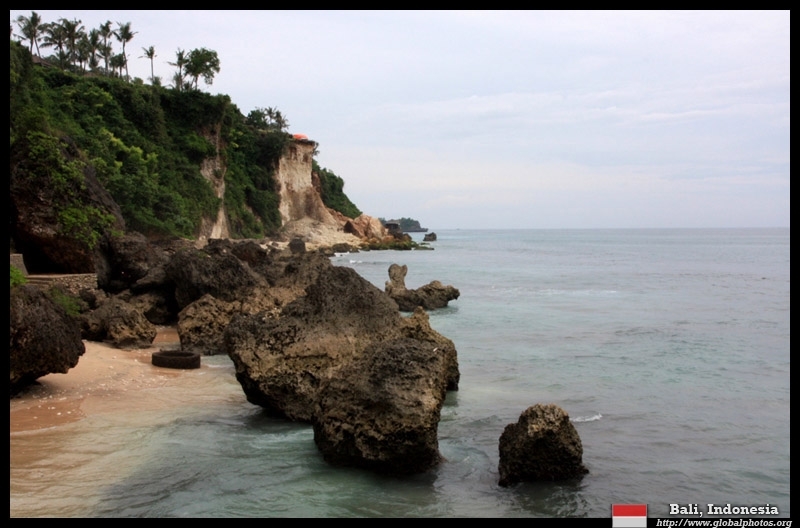 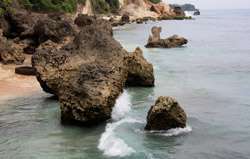 This rocky stretch of coast is not fit for swimming, but is still scenic with plenty of rocks and ocean views to compensate.